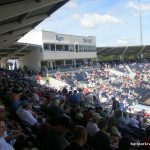 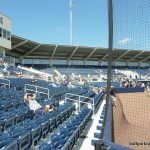 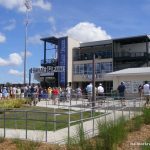 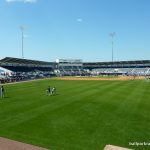 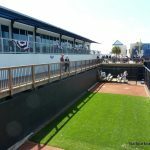 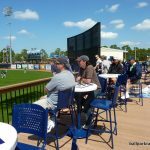 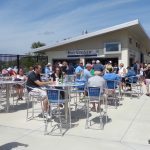 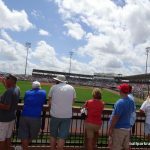 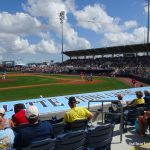 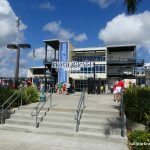 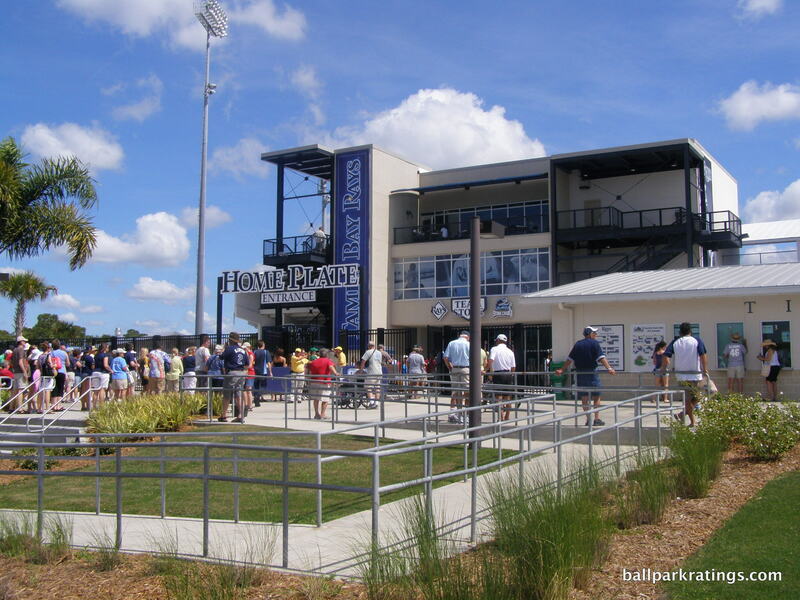 As the first of six Grapefruit League ballparks to undergo massive renovation projects in the last 10 years, the remaking of Charlotte Sports Park was the least ambitious, but perhaps took the most effort and certainly resulted in the greatest improvement. 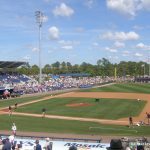 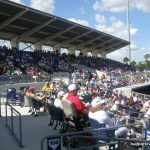 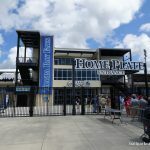 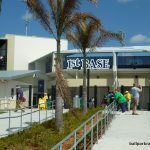 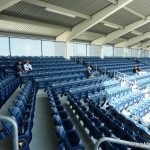 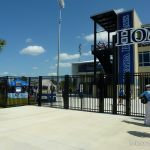 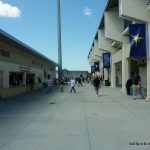 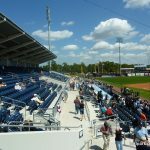 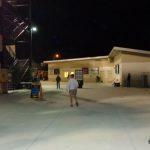 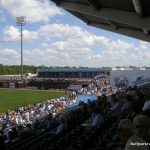 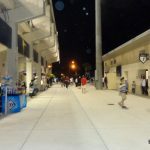 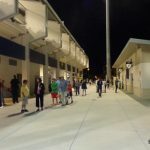 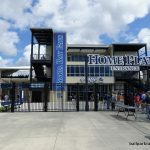 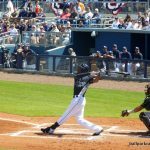 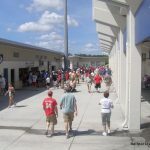 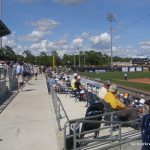 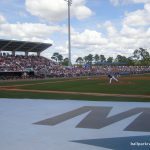 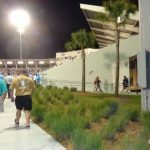 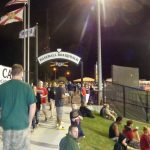 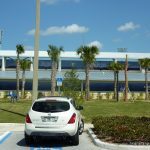 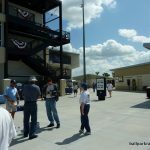 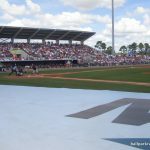 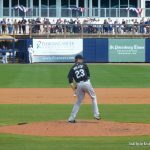 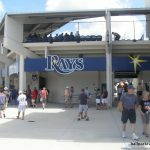 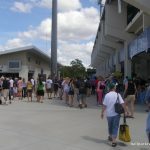 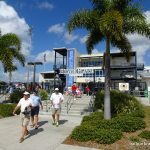 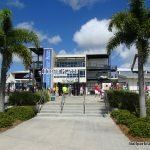 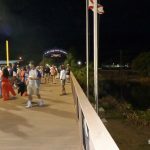 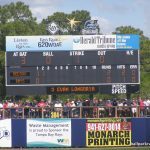 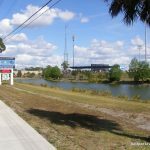 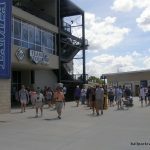 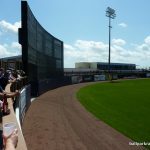 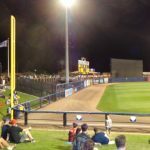 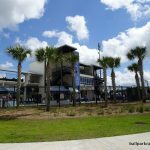 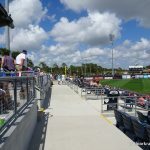 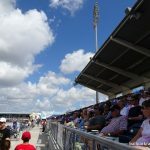 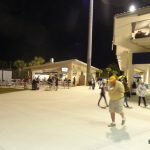 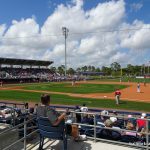 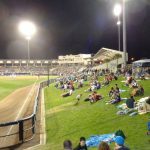 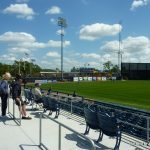 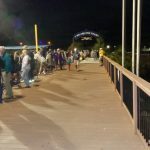 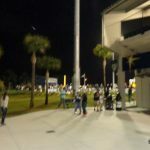 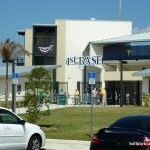 Whereas McKechnie Field (Pirates) and Joker Marchant Stadium (Tigers) were already classics, Steinbrenner Field (Yankees) and Hammond Stadium (Twins) were already respectable, and Ed Smith Stadium (Orioles) was such a basic structure that it could be remade into a new ballpark, Charlotte County Stadium was a true dump and an unmistakable blight on the Floridian baseball landscape. 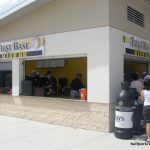 Infamous for hosting Alex Rodriguez’s Rangers debut press conference on the dugout roof due to inadequate facilities, this icebox had no redeeming qualities, with poor sightlines due to the quirky angular grandstand design to boot. 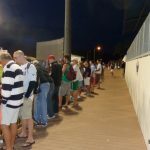 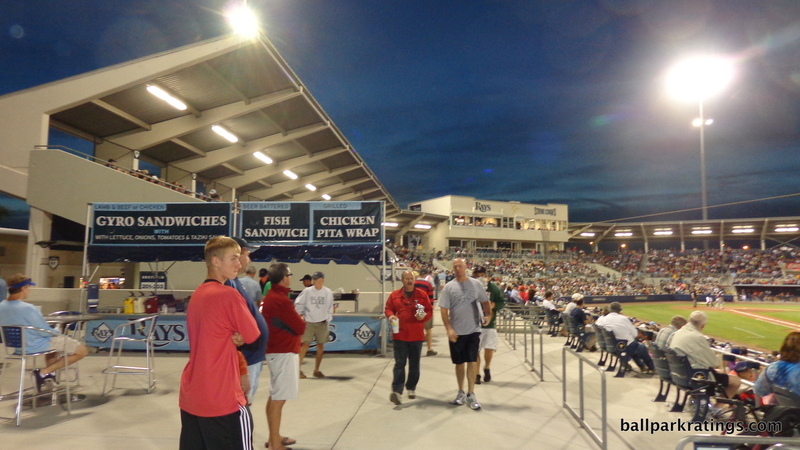 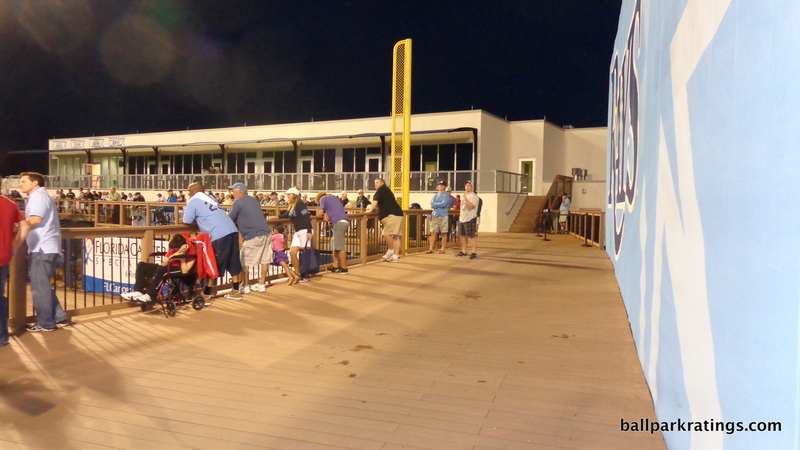 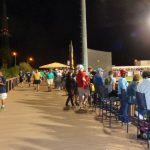 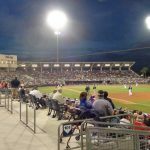 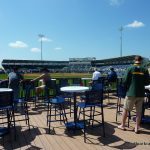 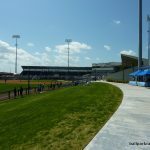 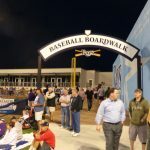 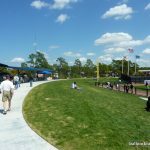 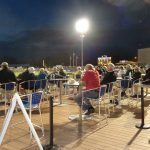 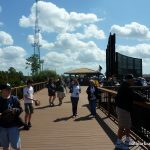 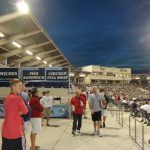 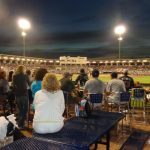 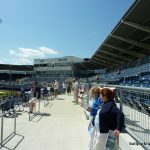 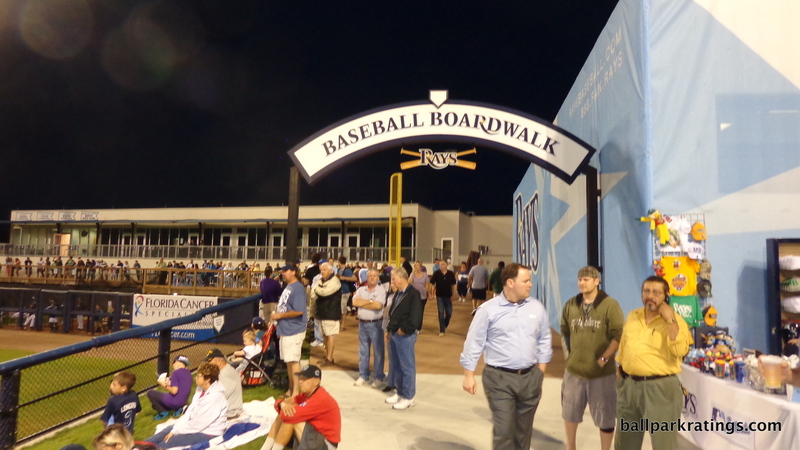 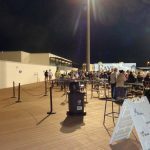 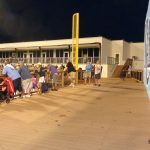 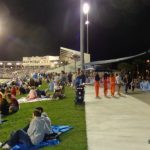 Rebranded as Charlotte Sports Park in 2009, the renovation injected some much-needed flavor into the facility, including fan-friendly amenities like the outfield “boardwalk” concept that would catch on in other parks throughout the 2010s. 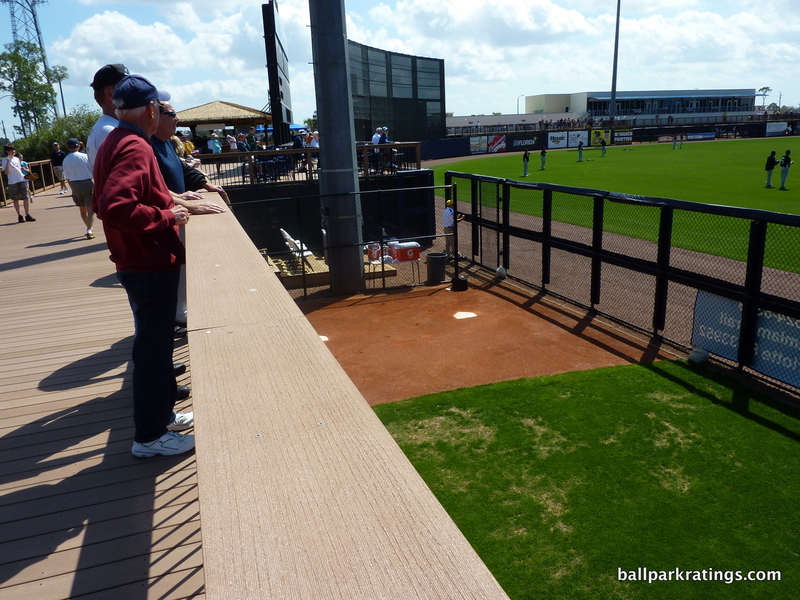 The park was unable to support an expansive outfield berm, so the architects had to get creative. 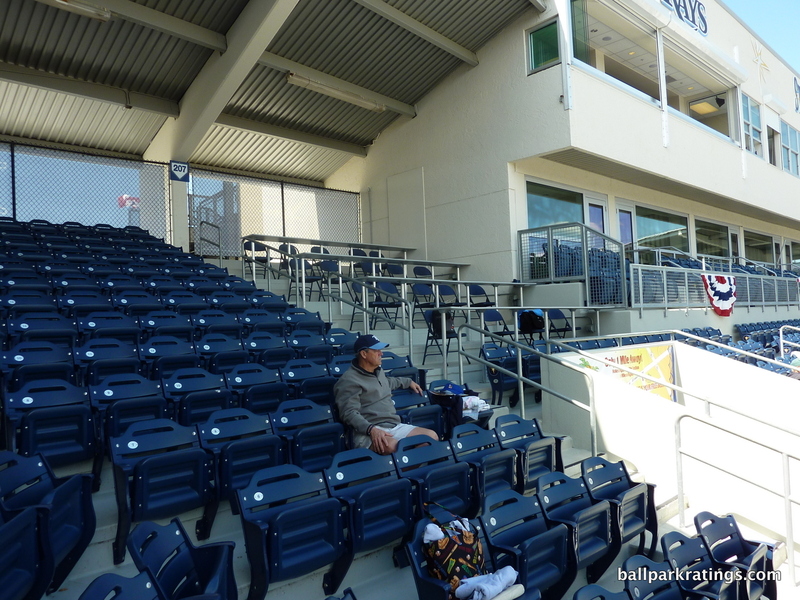 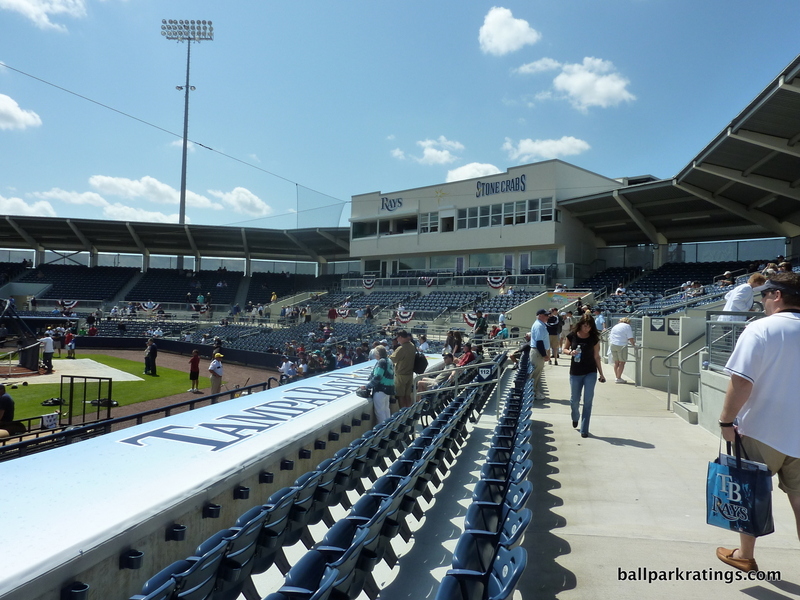 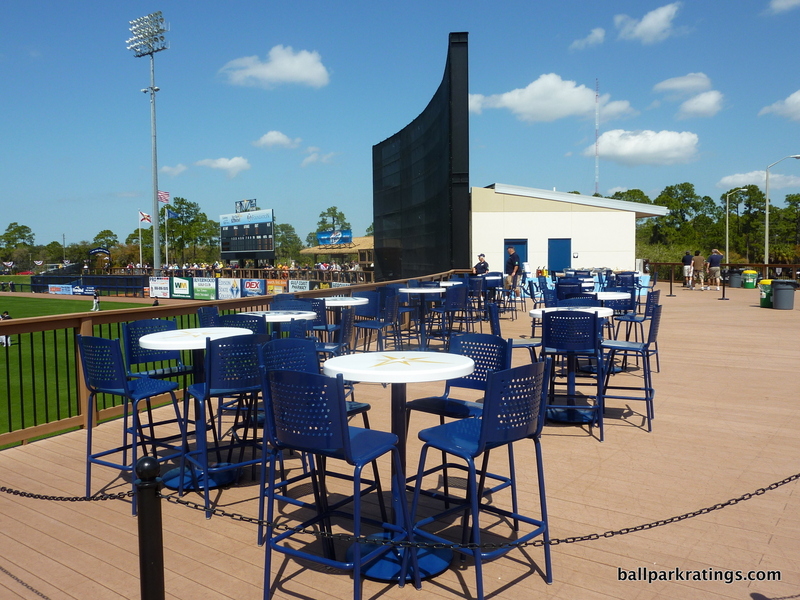 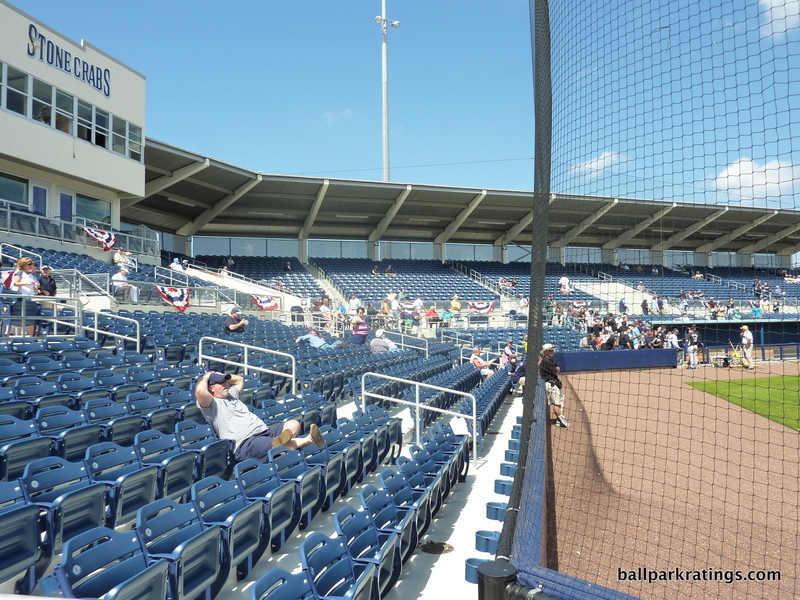 The primary differentiating factor from the “better” renovated Grapefruit League ballparks is that Charlotte Sports Park still doesn’t possess many aesthetic intentions, despite now being far from ugly. 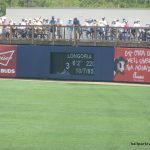 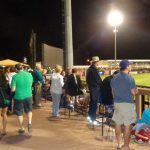 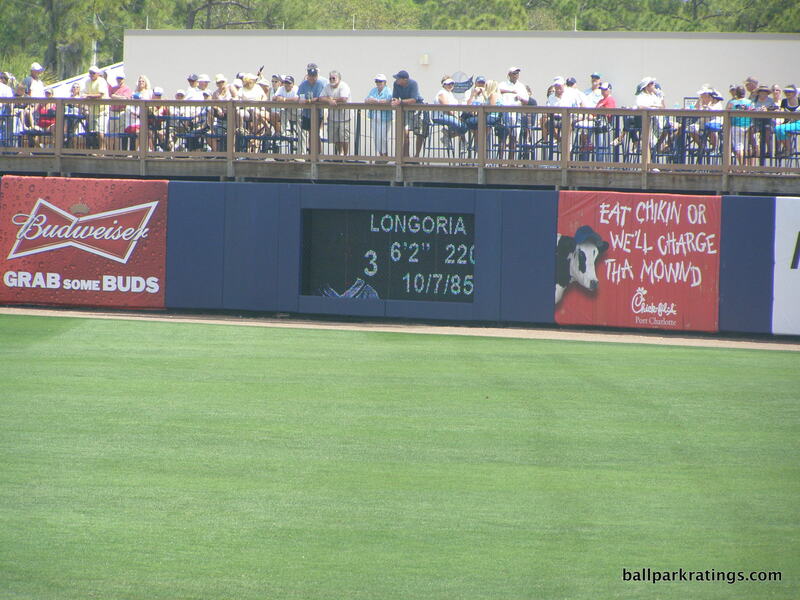 In reality, the comparatively low score illustrates how great spring training parks have become in the last decade, as Charlotte Sports Park doesn’t particularly excel in any one aspect. 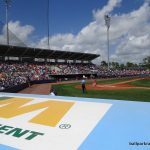 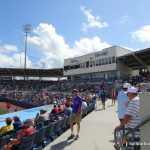 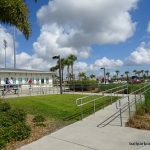 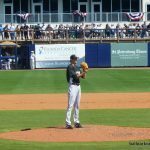 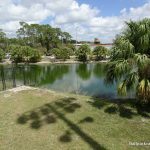 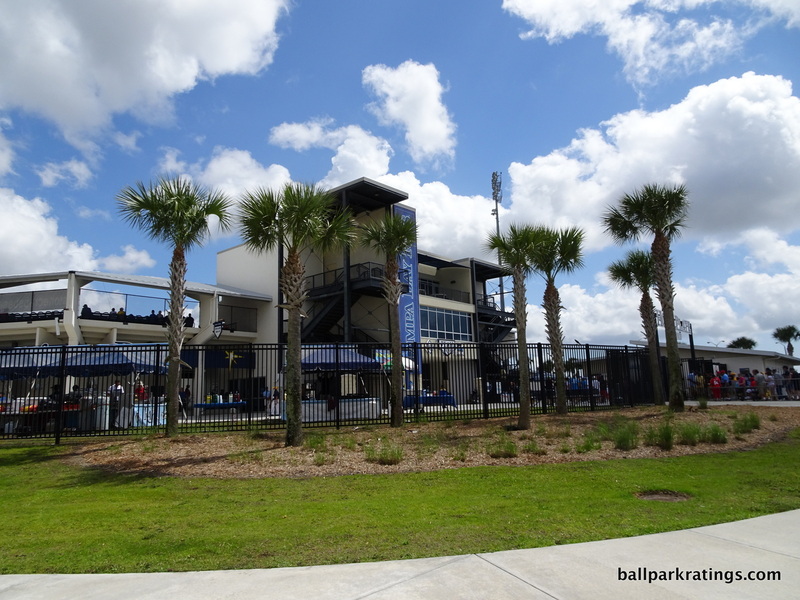 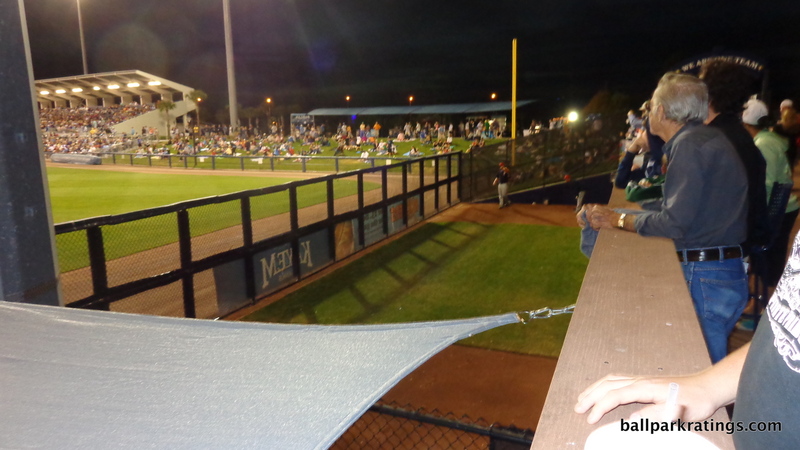 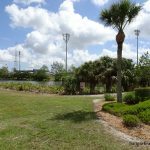 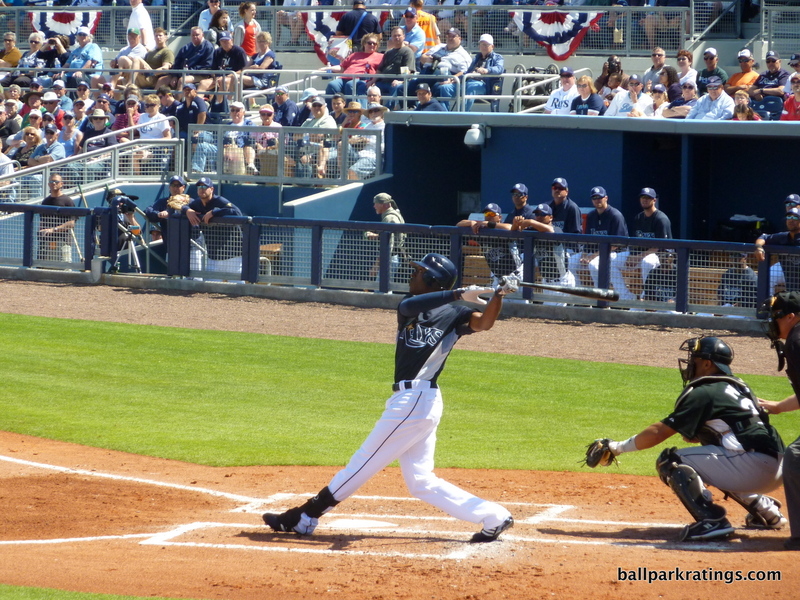 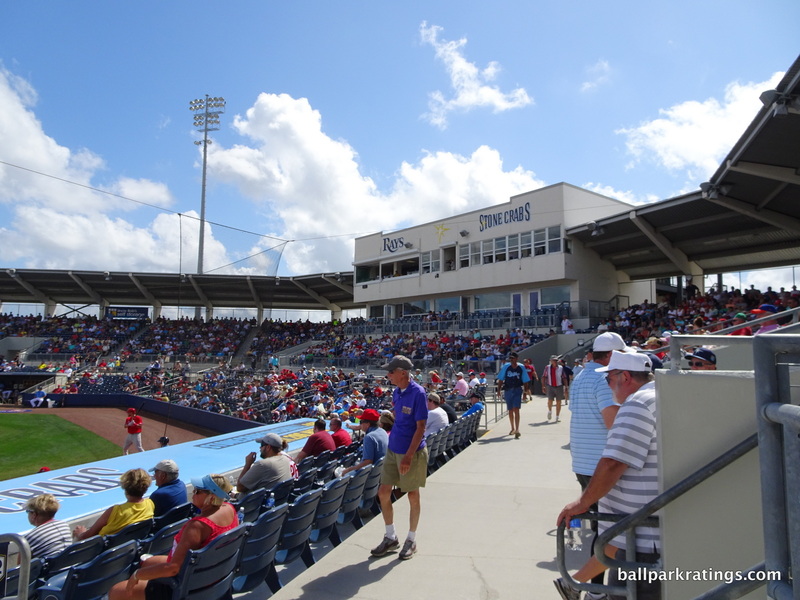 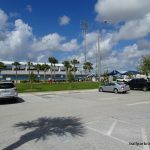 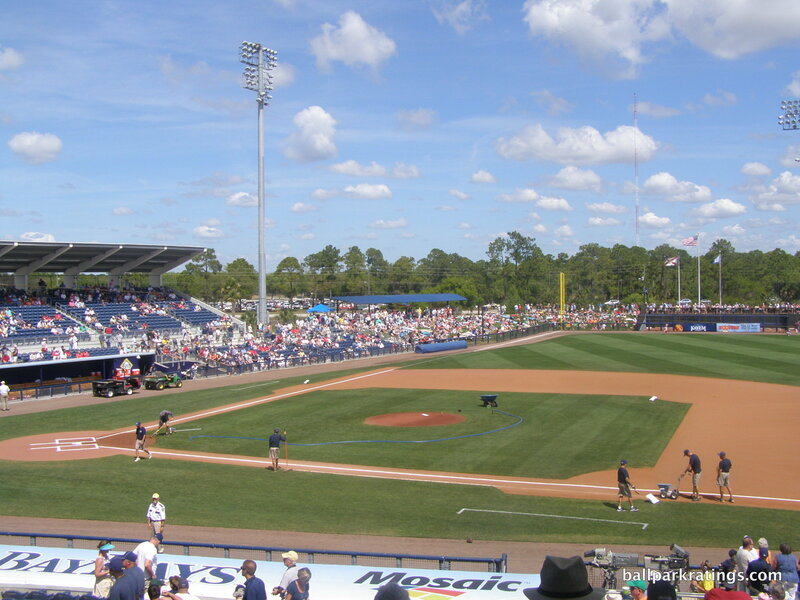 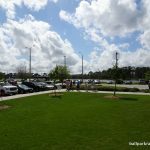 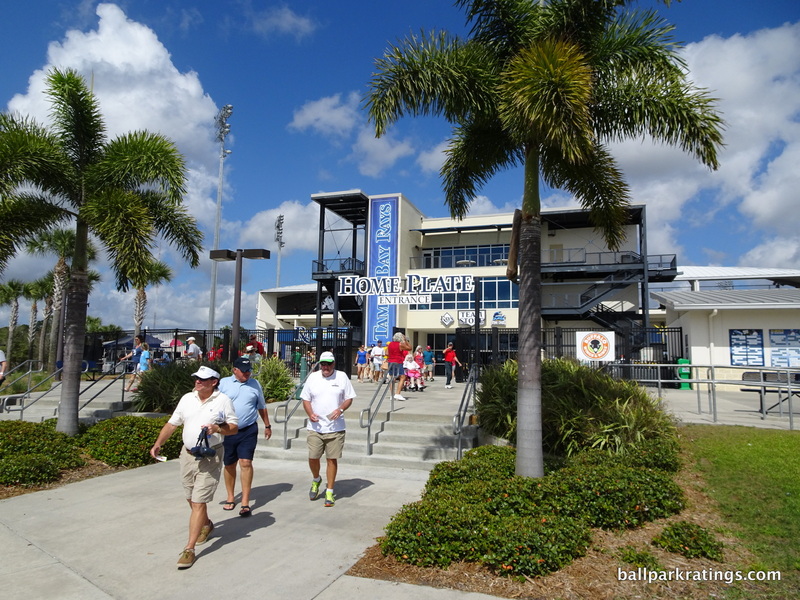 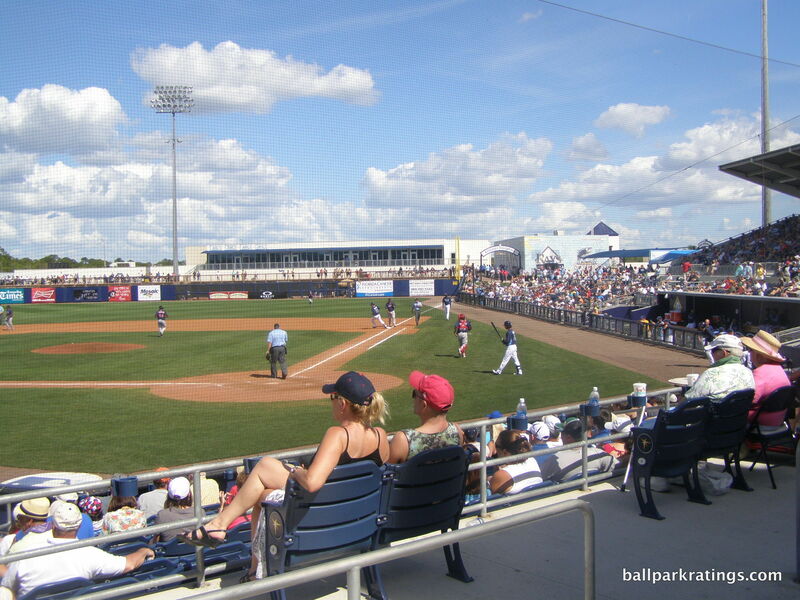 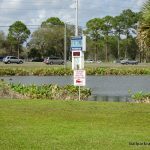 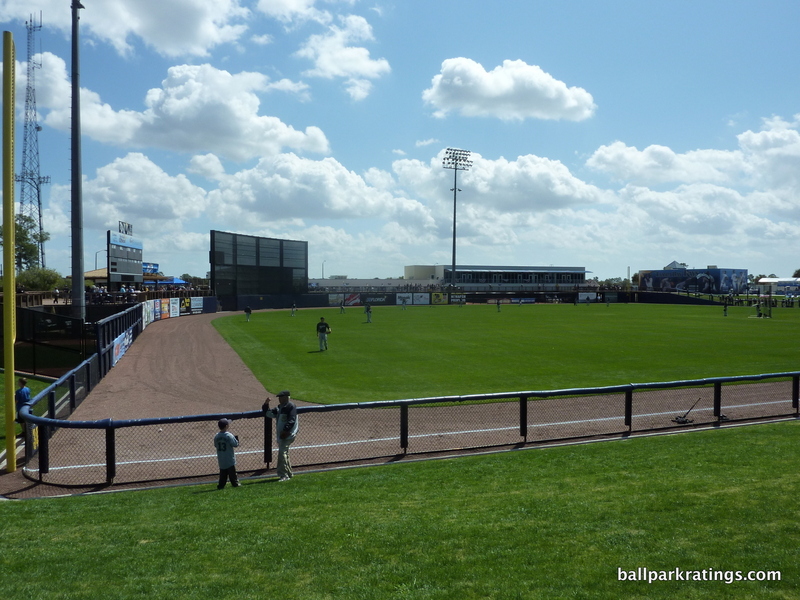 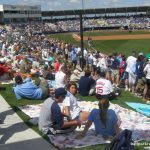 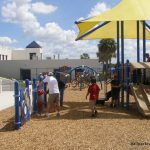 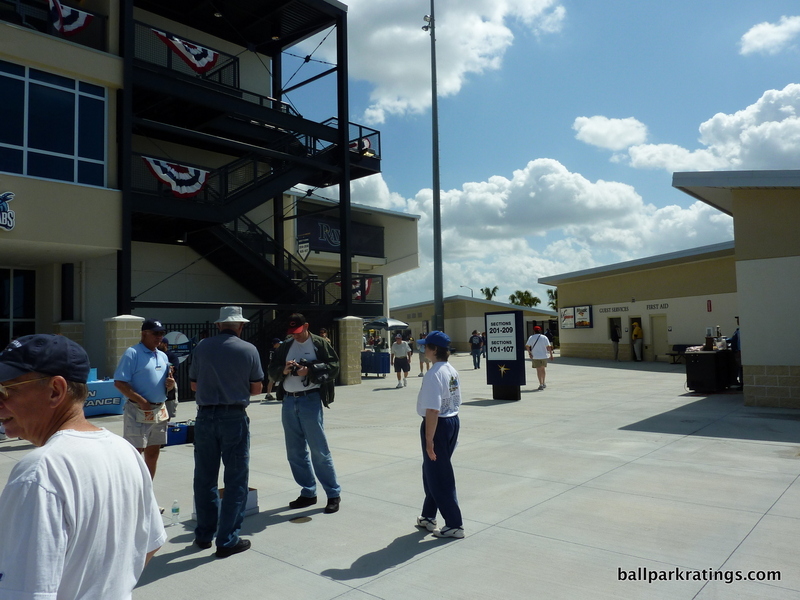 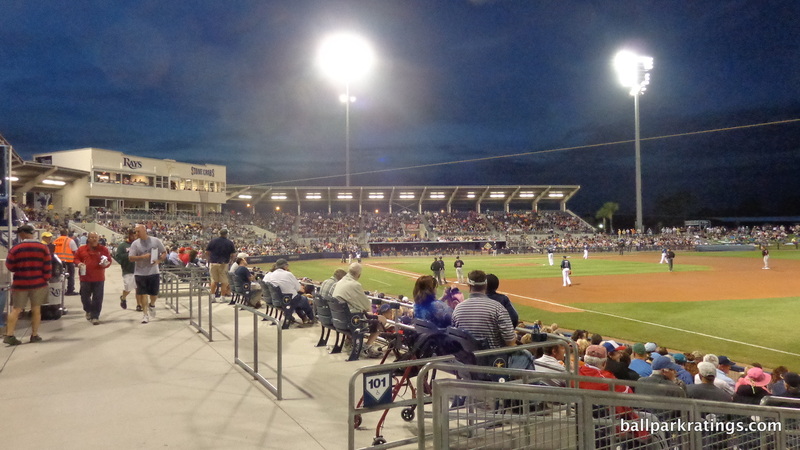 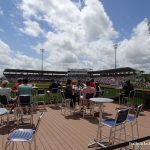 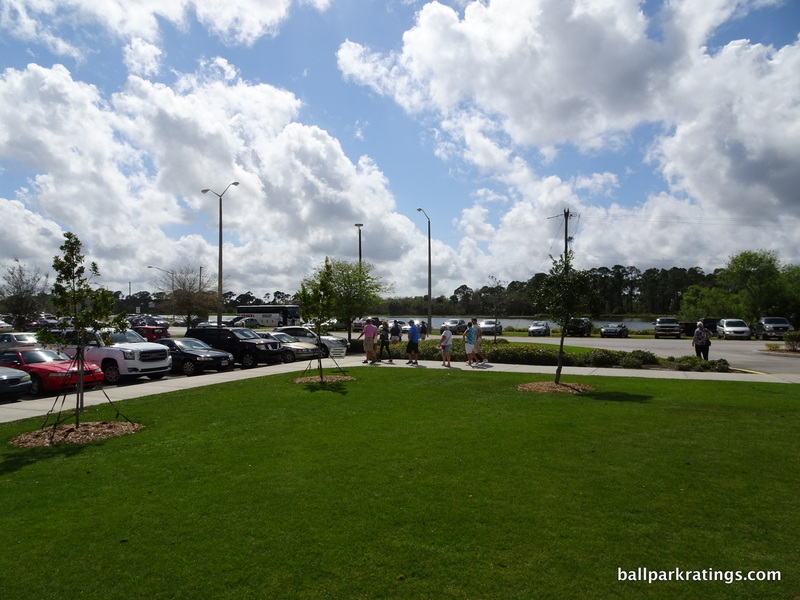 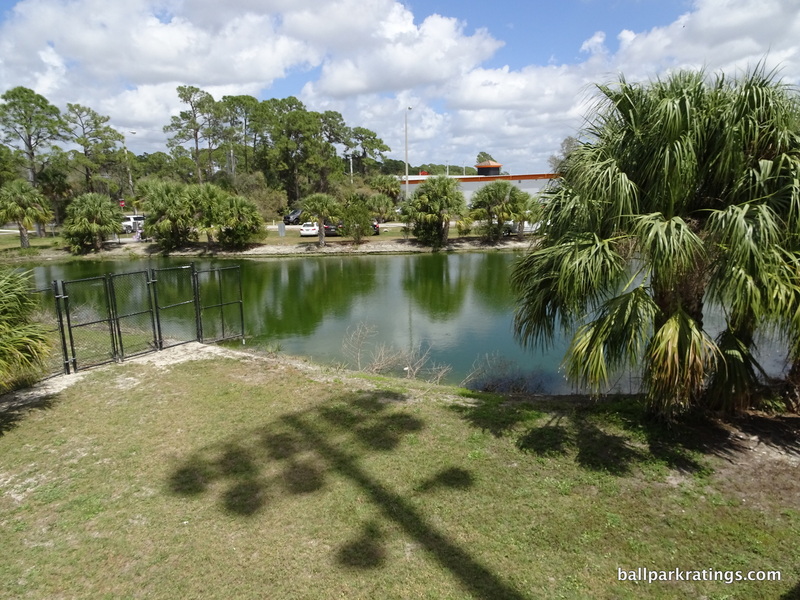 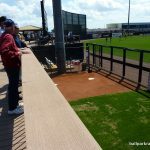 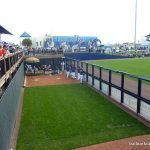 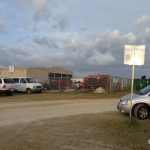 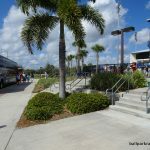 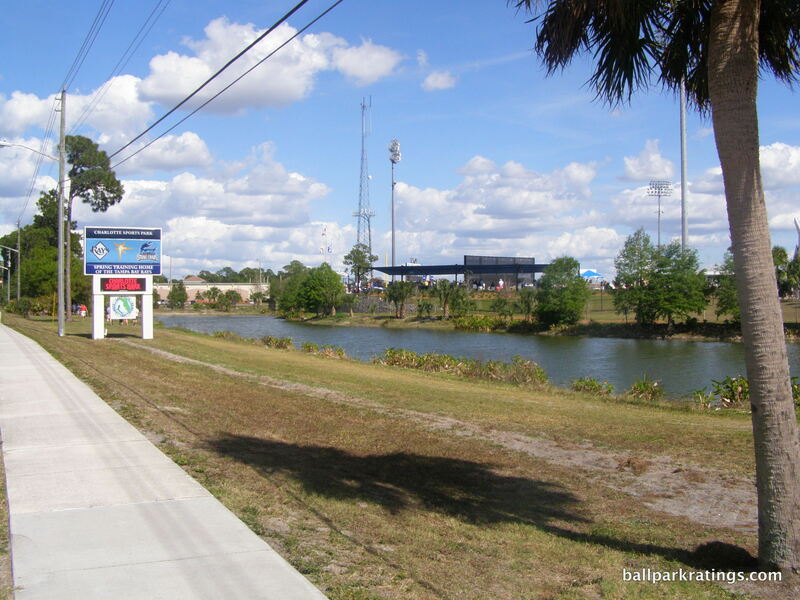 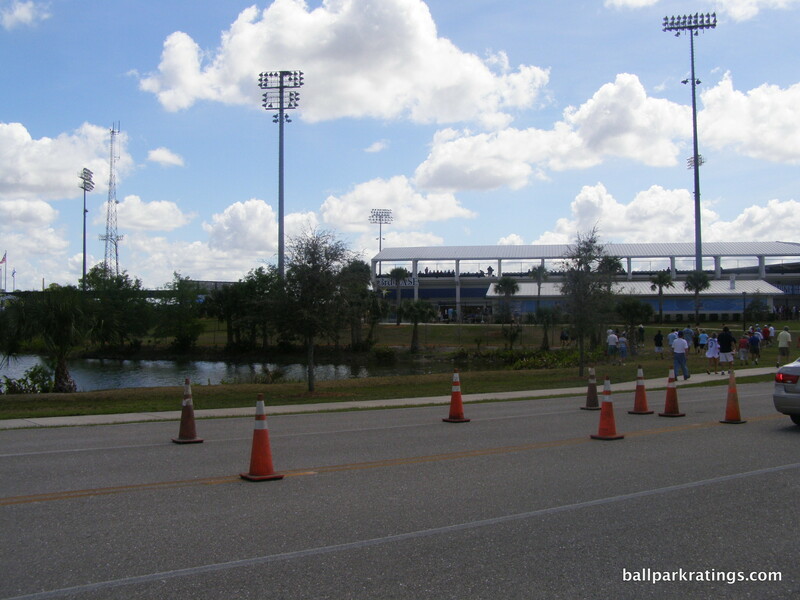 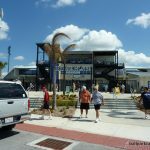 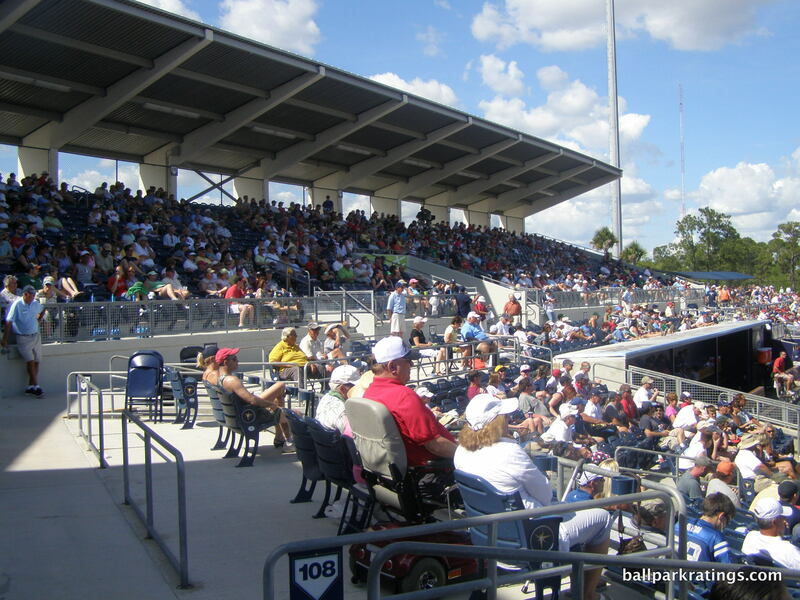 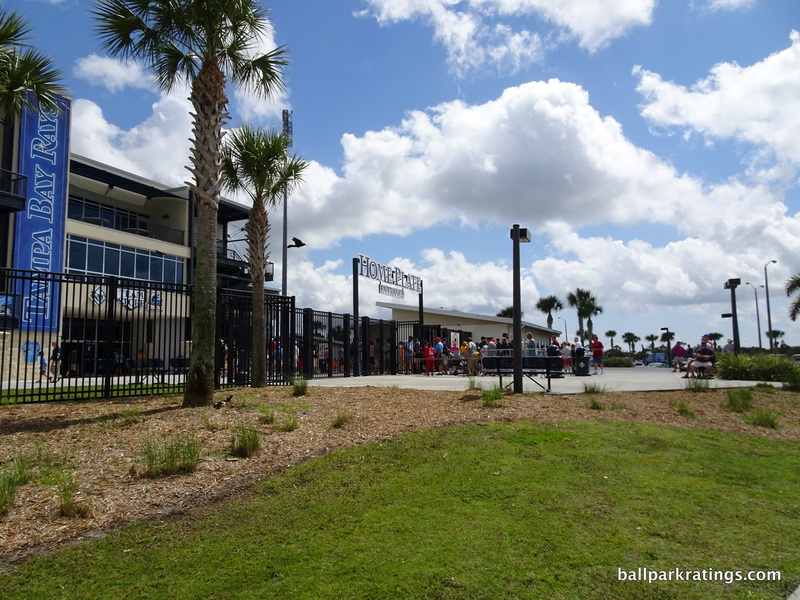 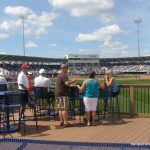 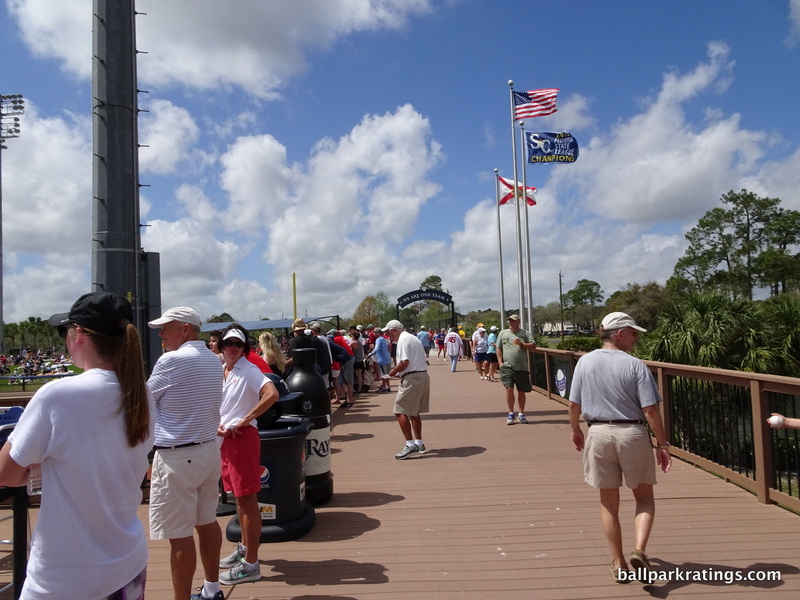 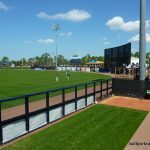 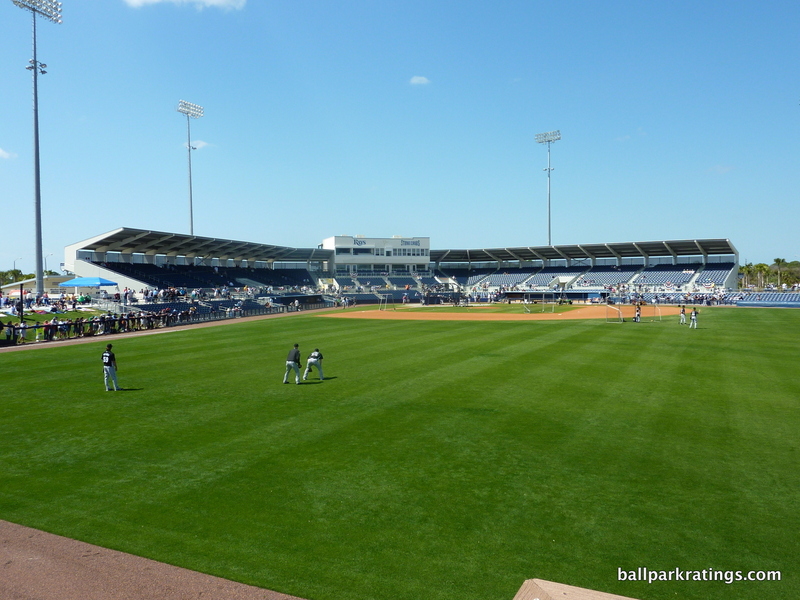 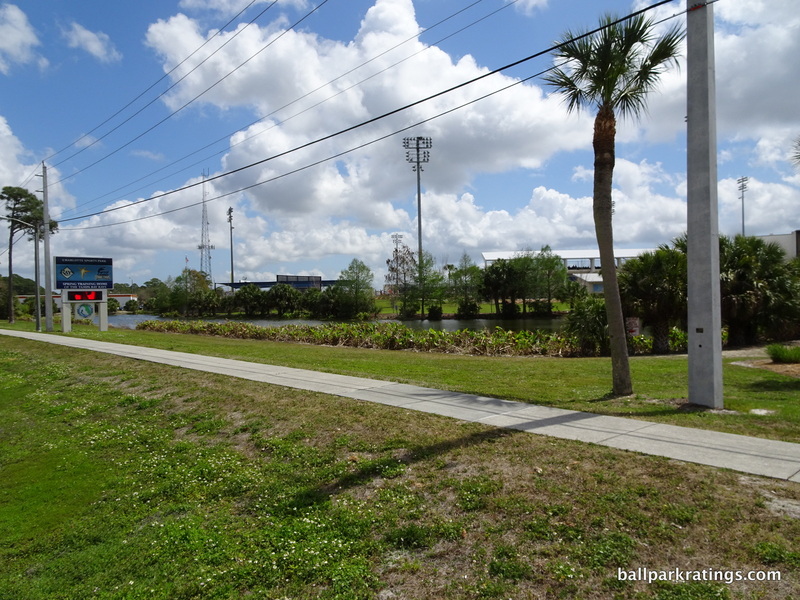 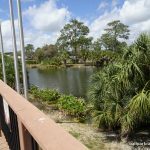 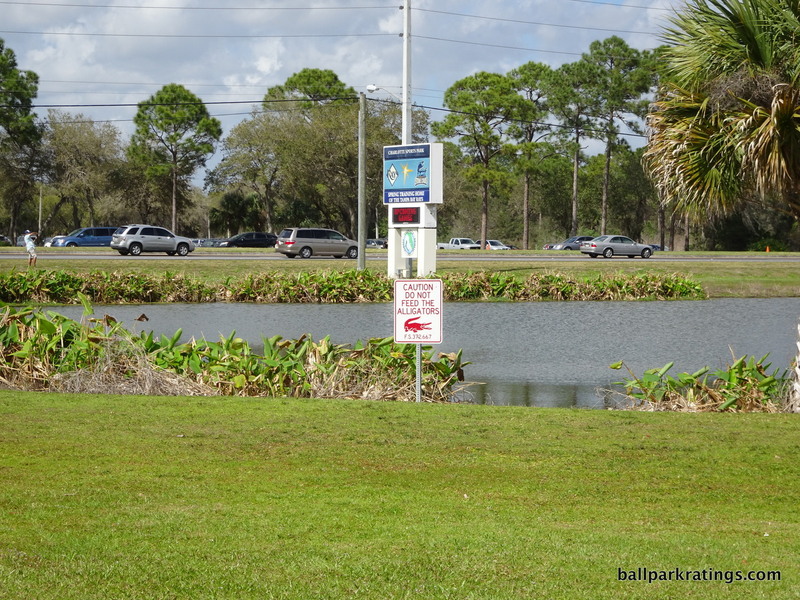 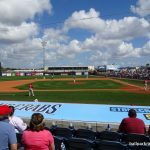 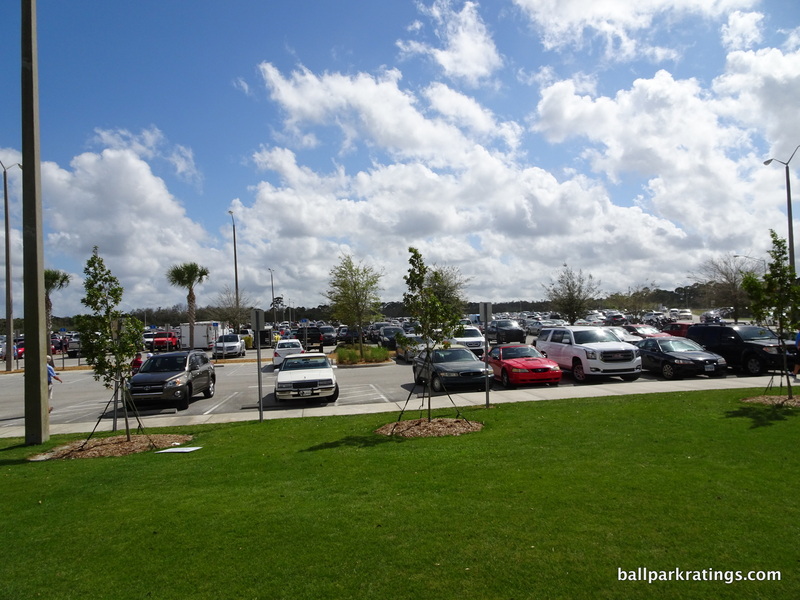 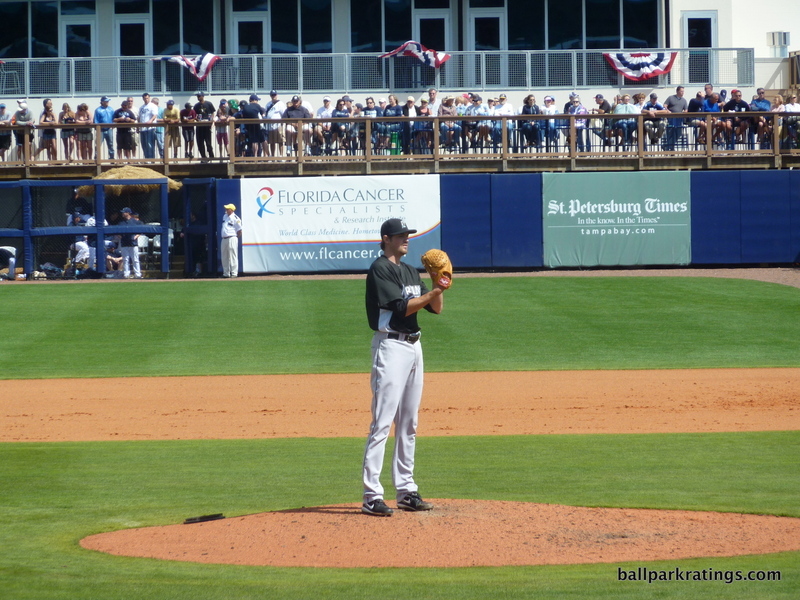 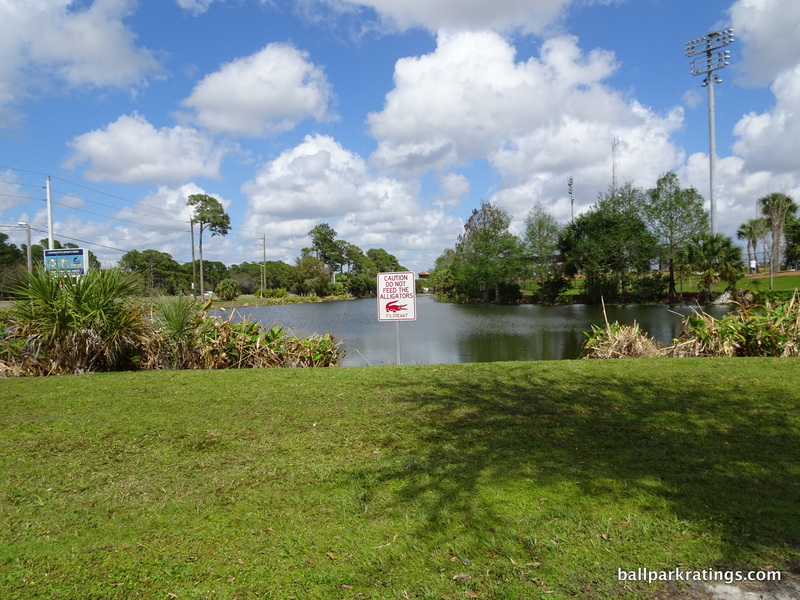 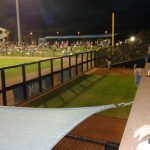 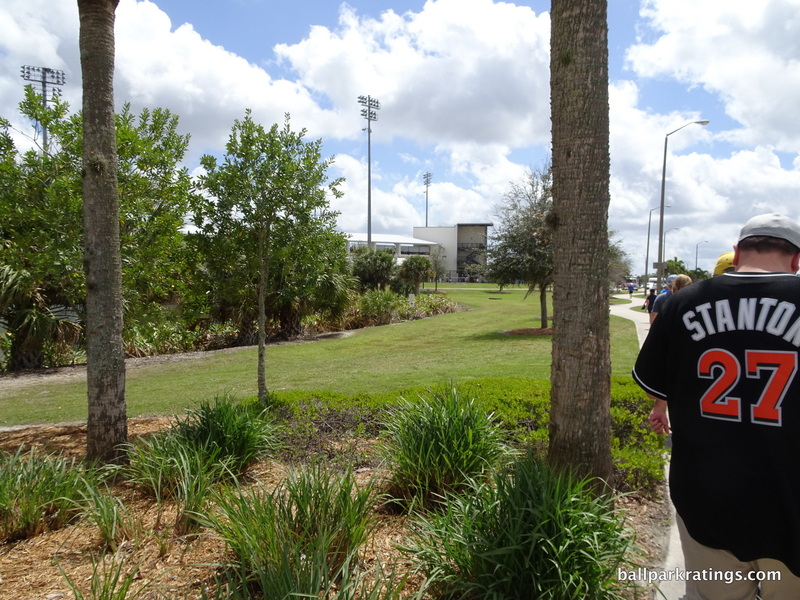 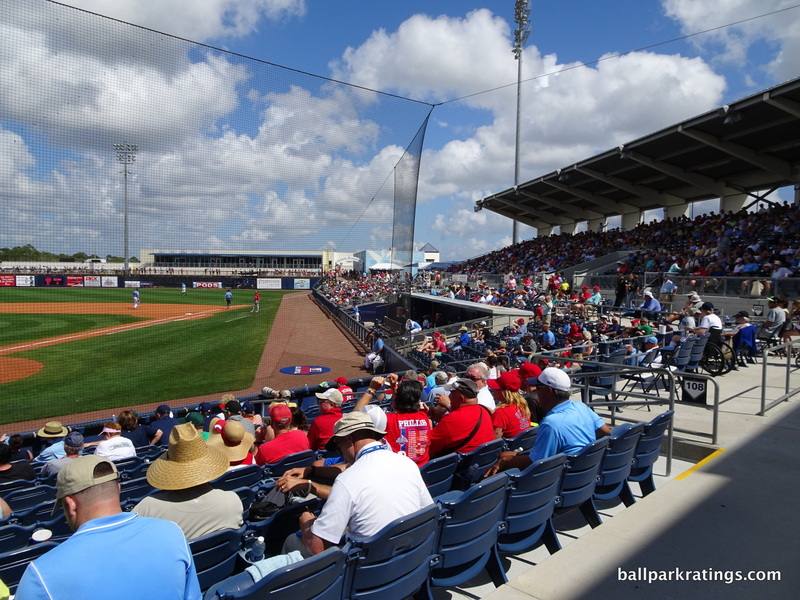 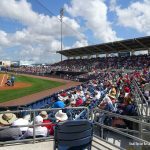 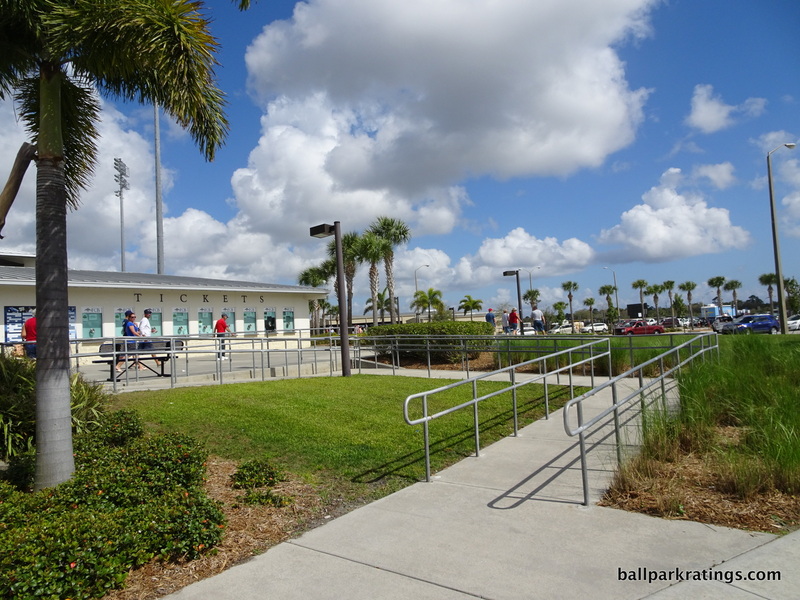 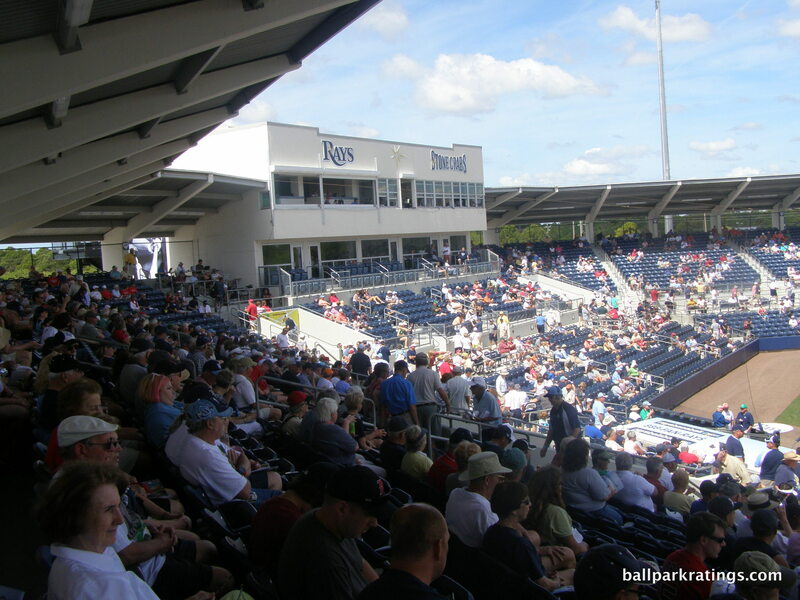 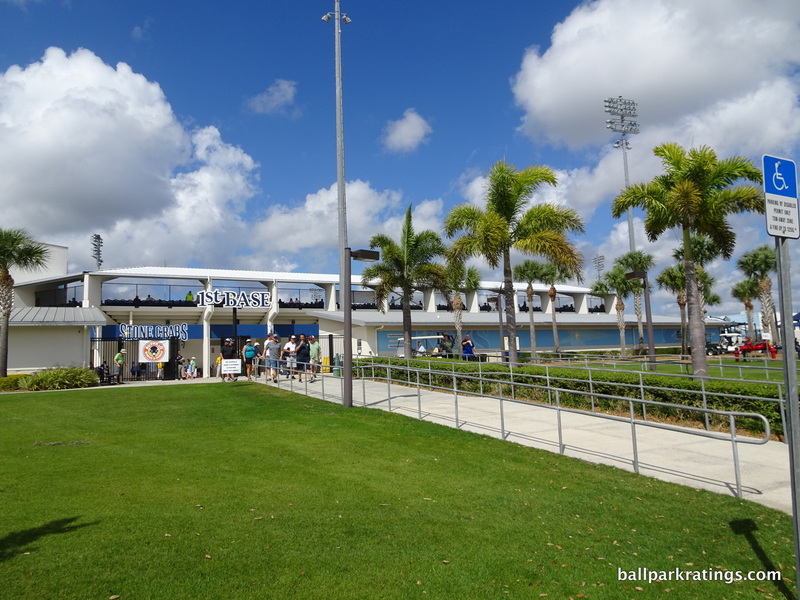 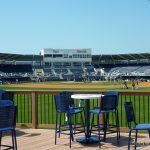 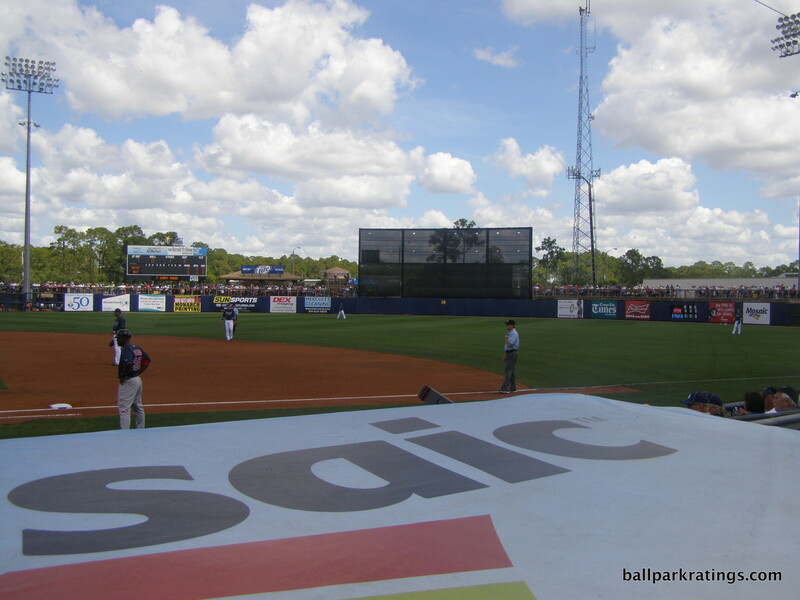 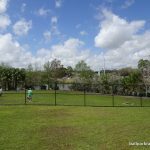 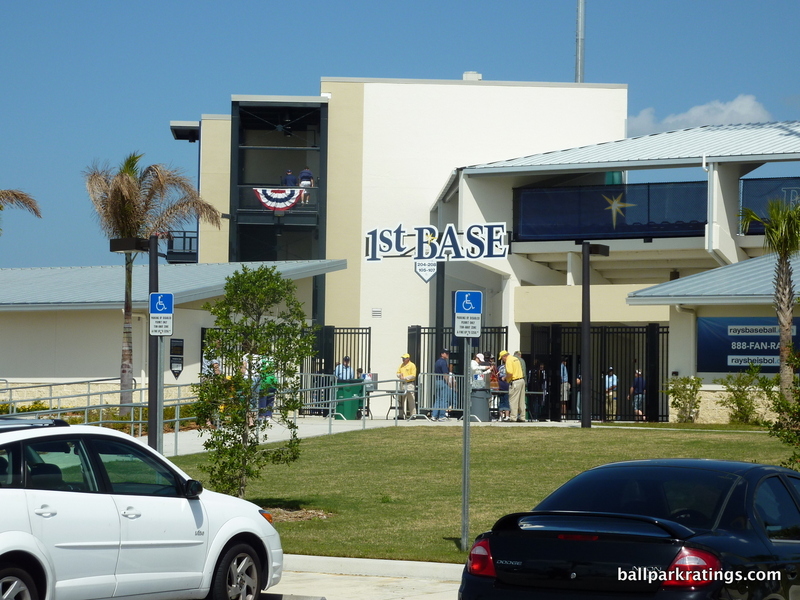 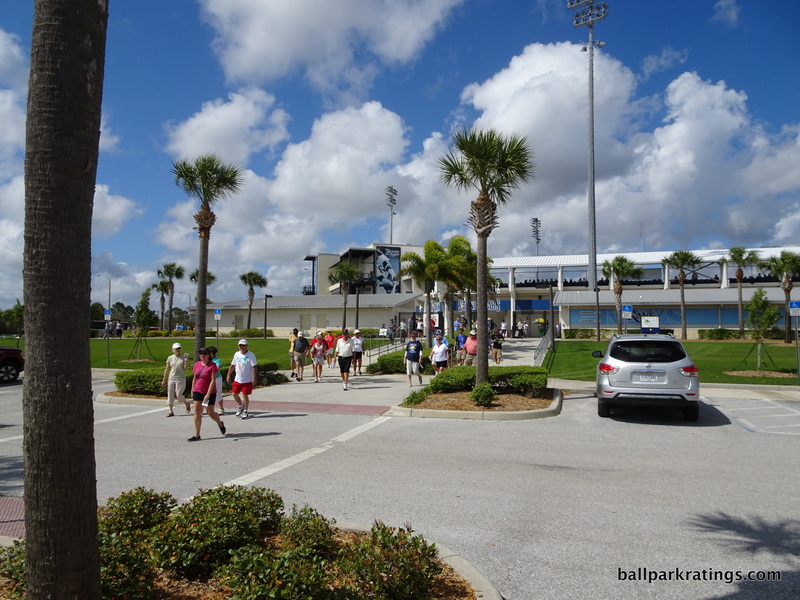 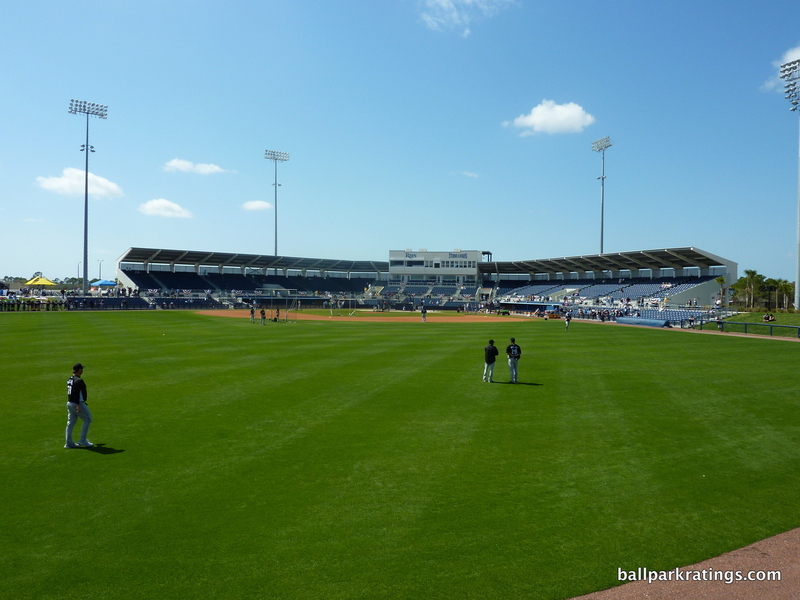 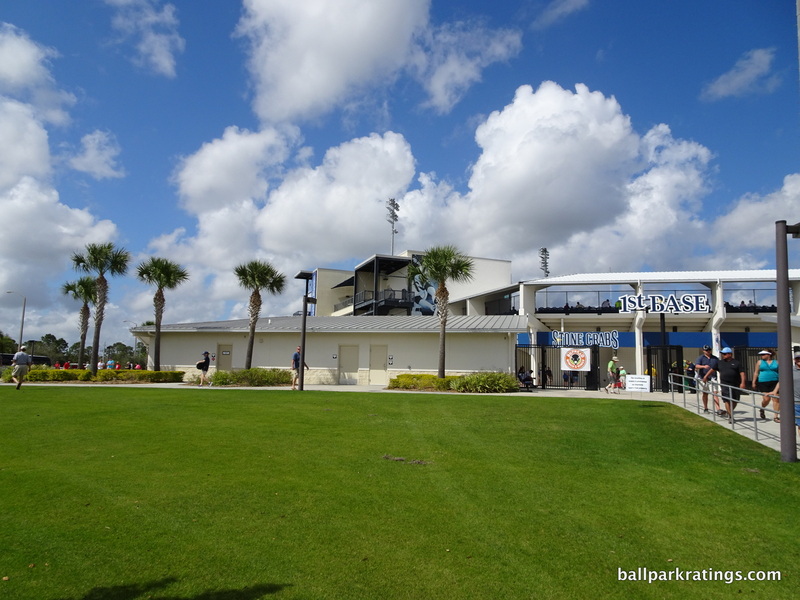 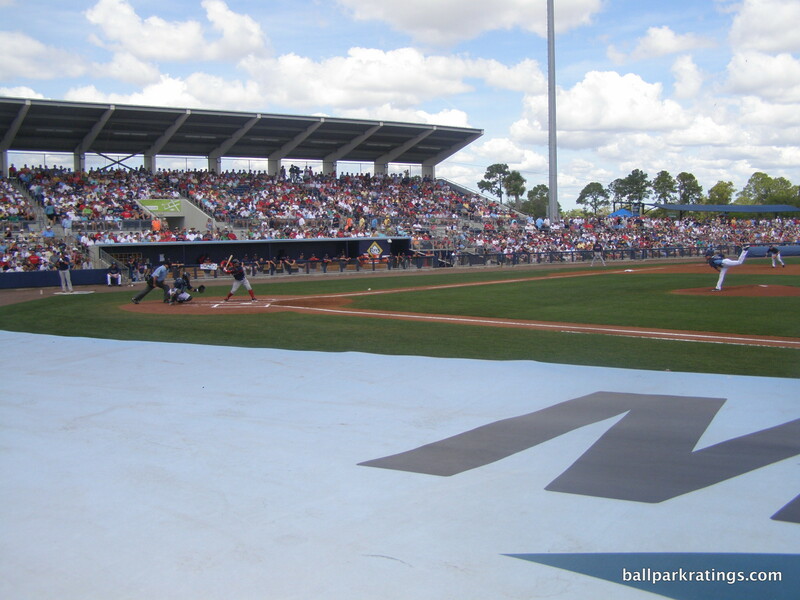 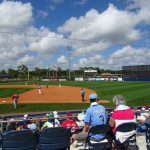 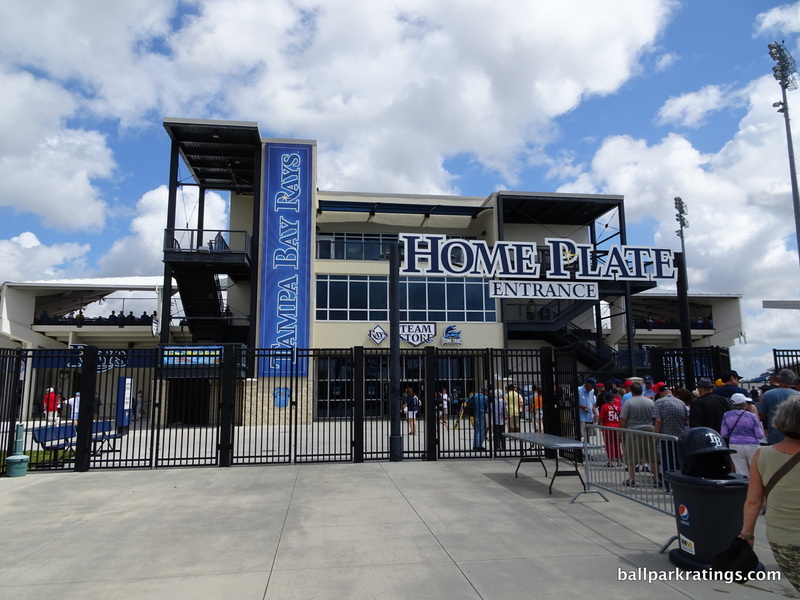 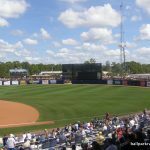 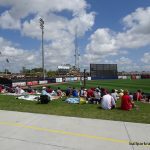 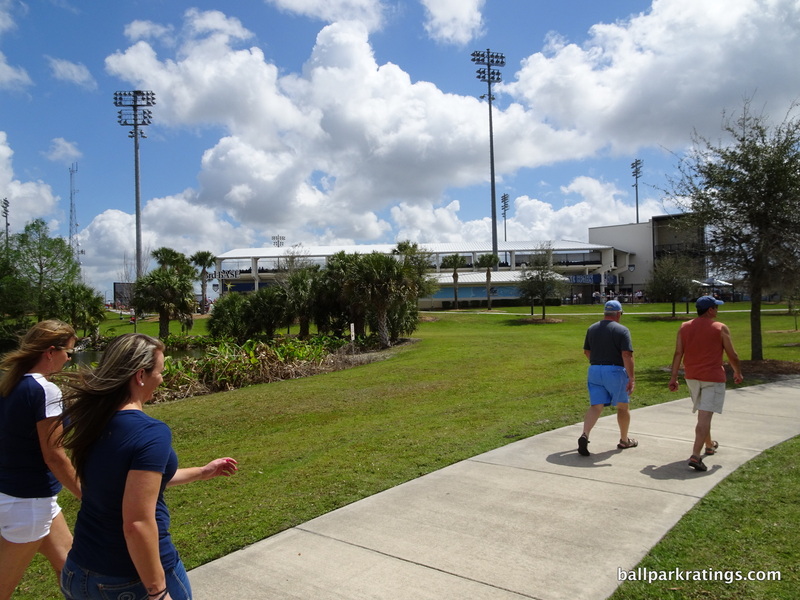 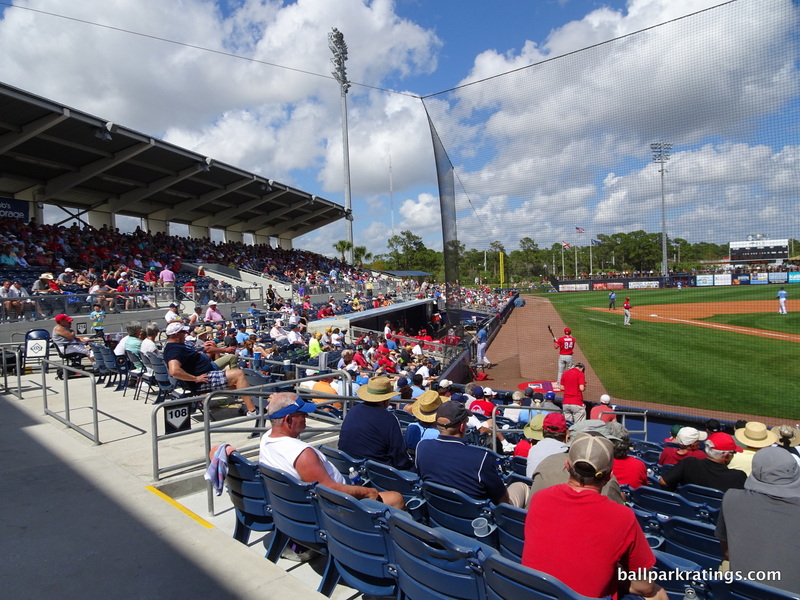 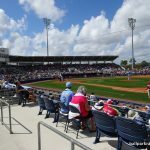 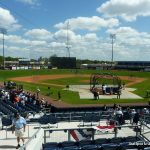 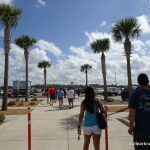 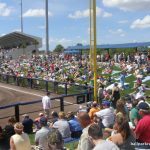 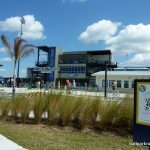 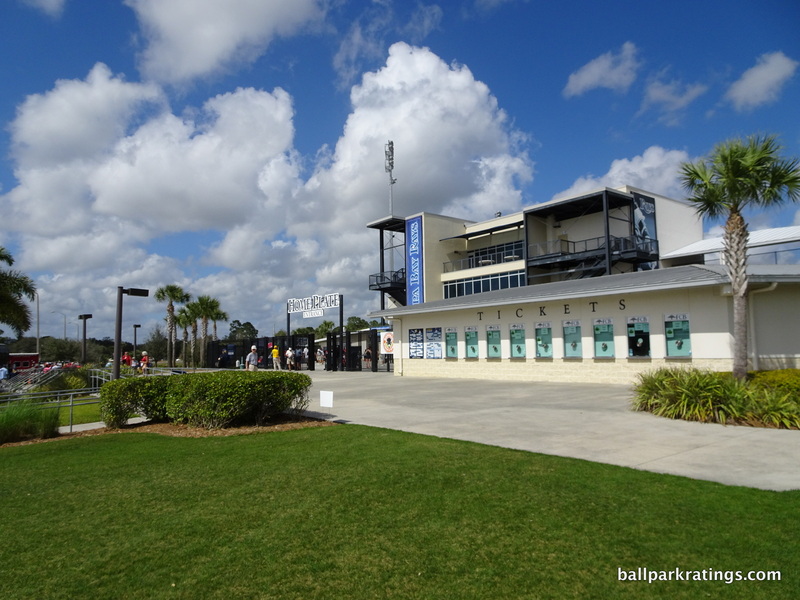 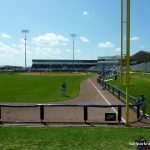 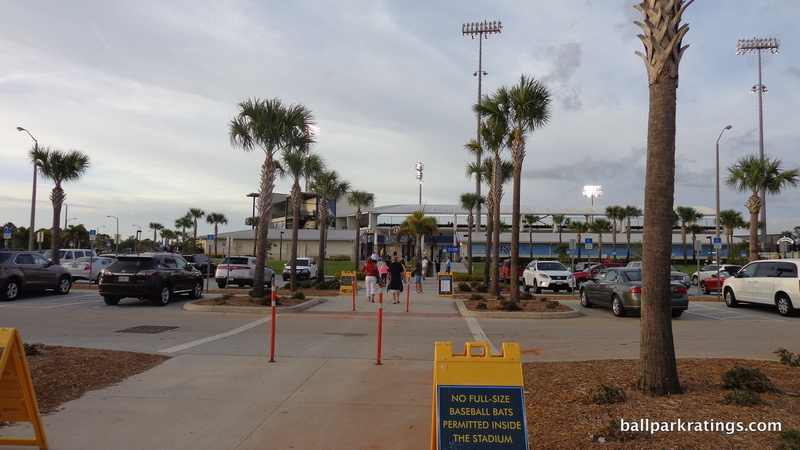 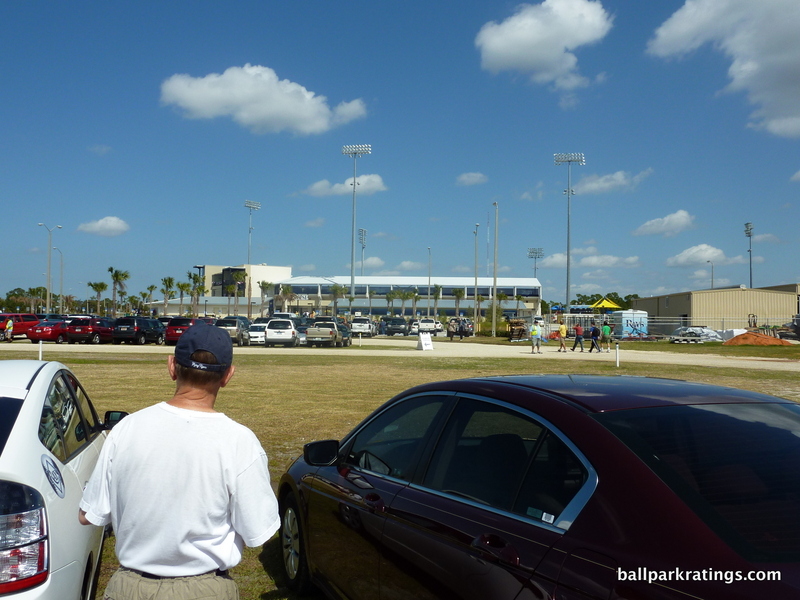 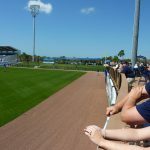 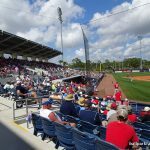 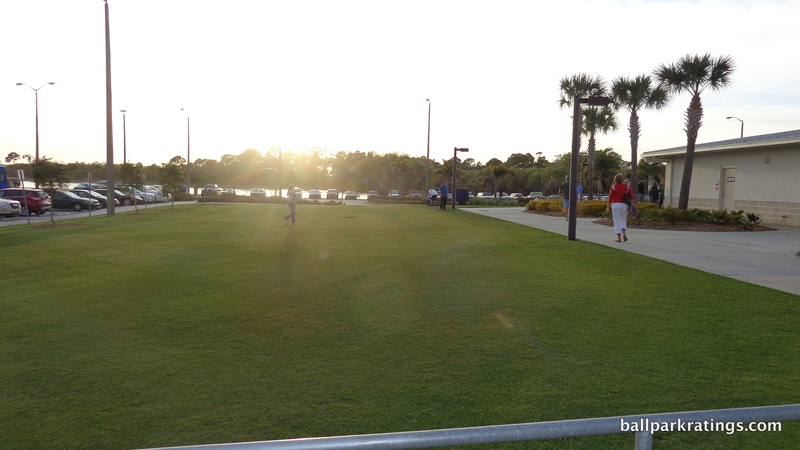 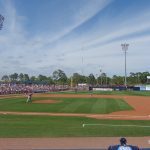 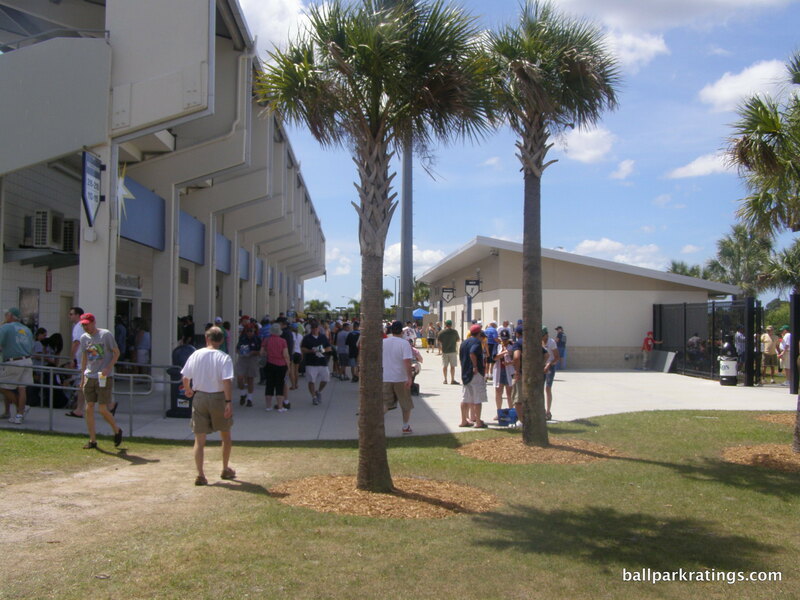 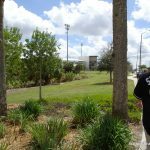 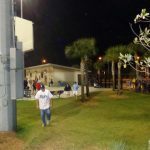 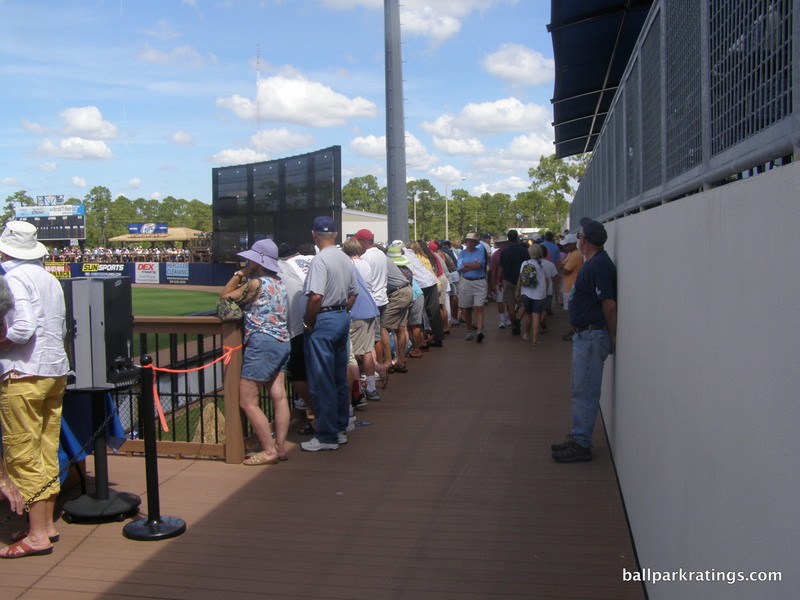 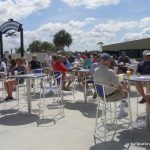 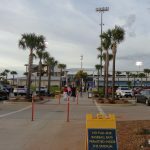 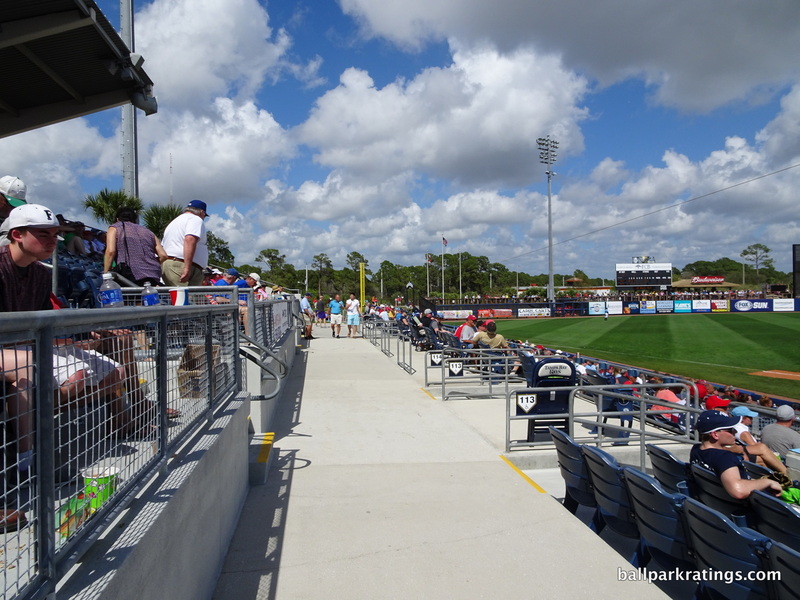 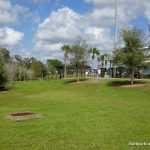 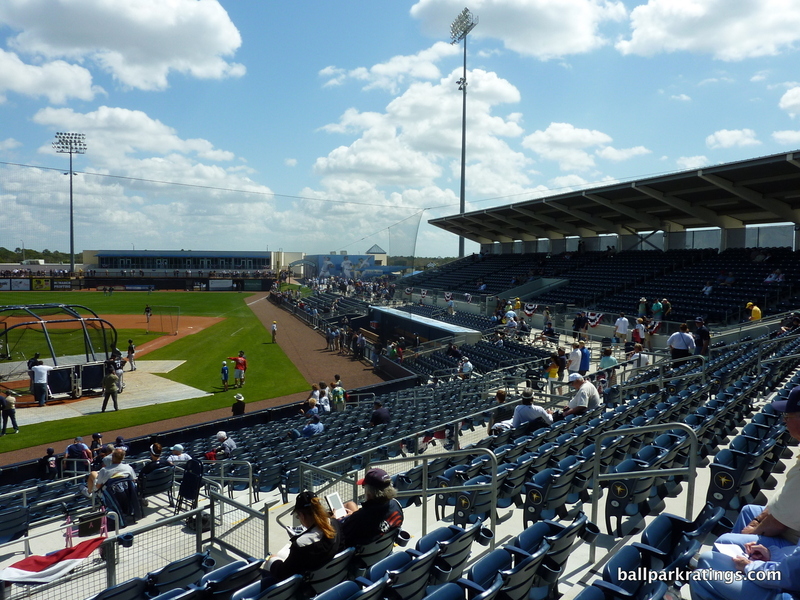 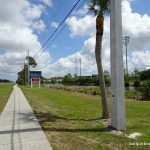 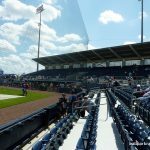 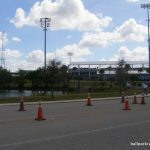 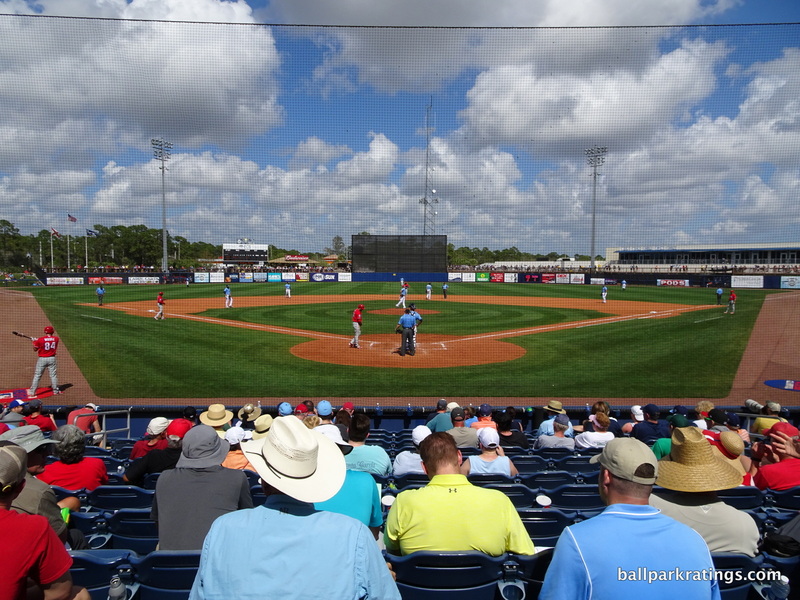 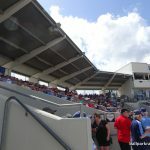 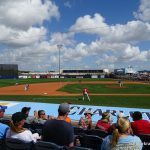 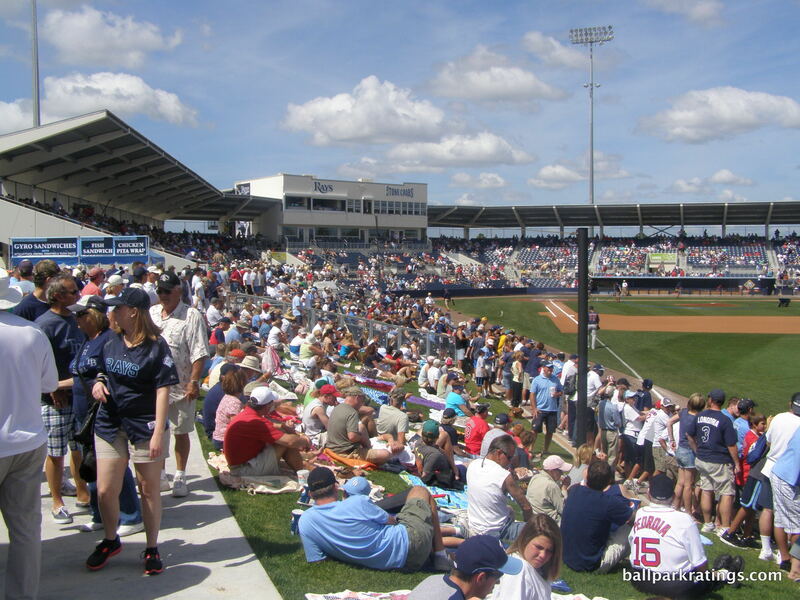 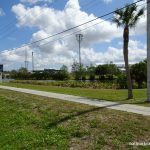 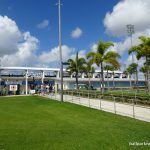 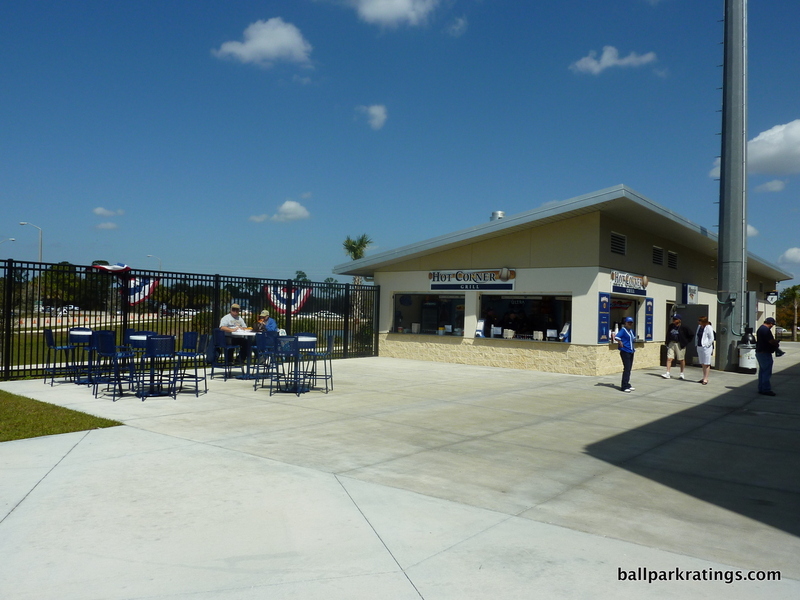 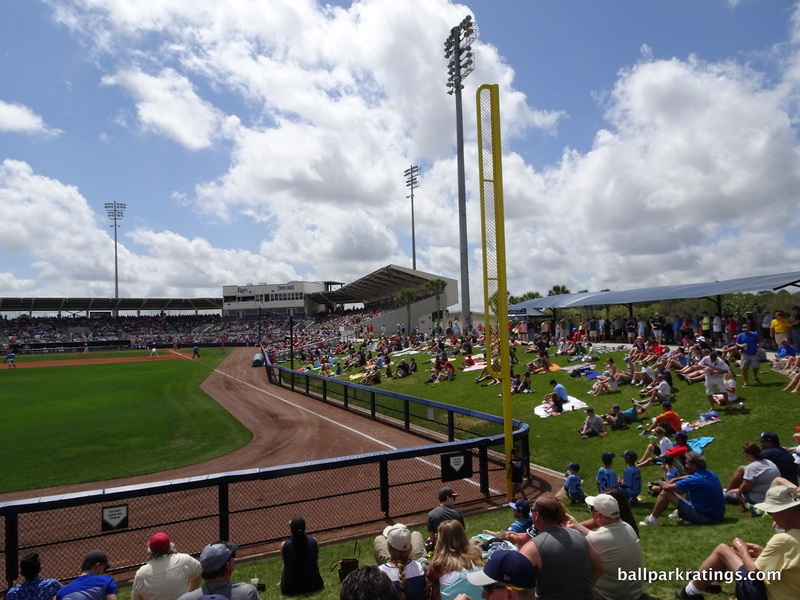 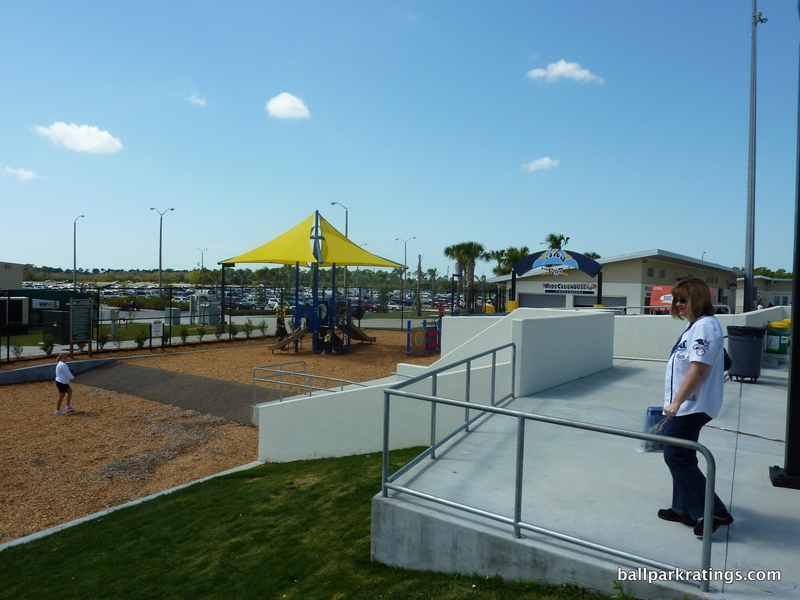 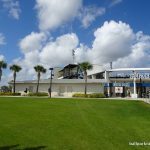 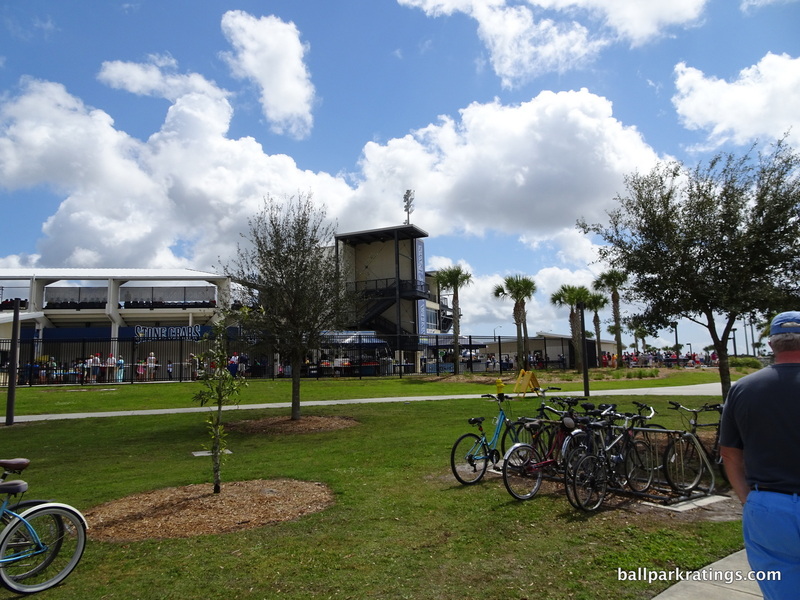 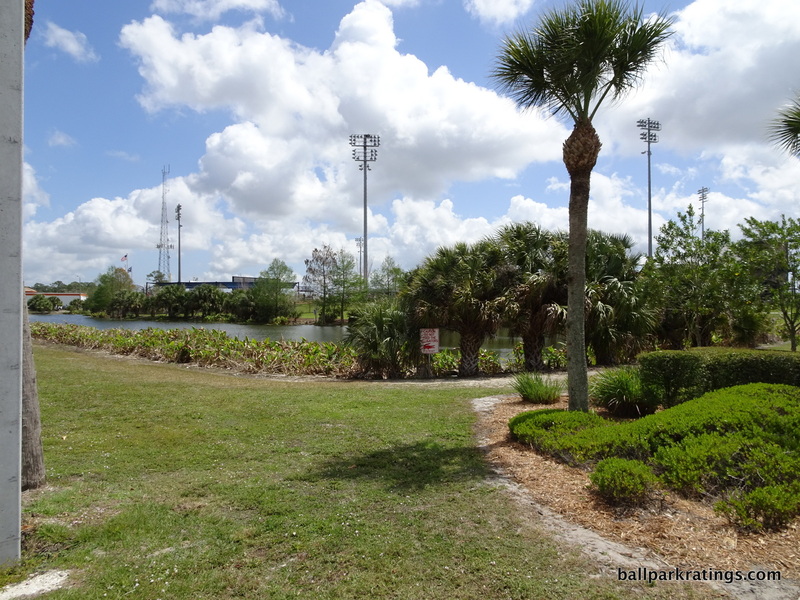 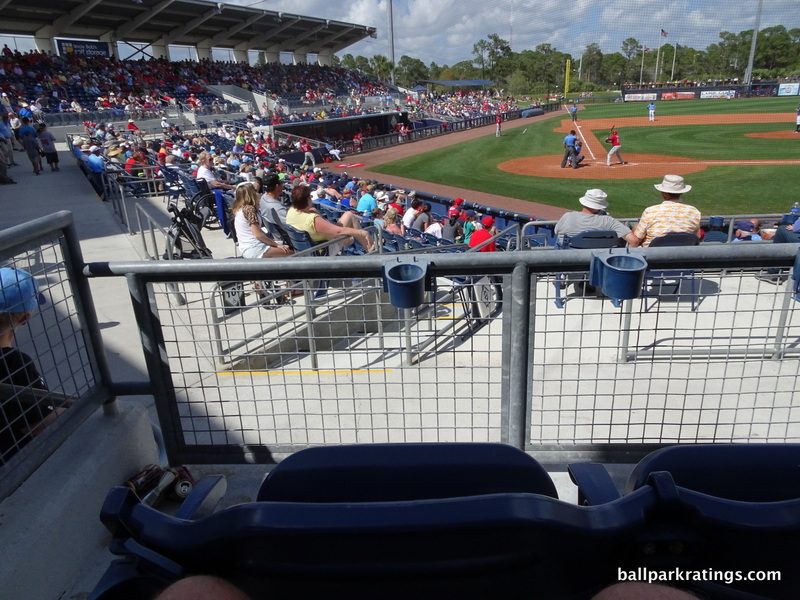 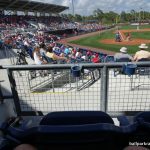 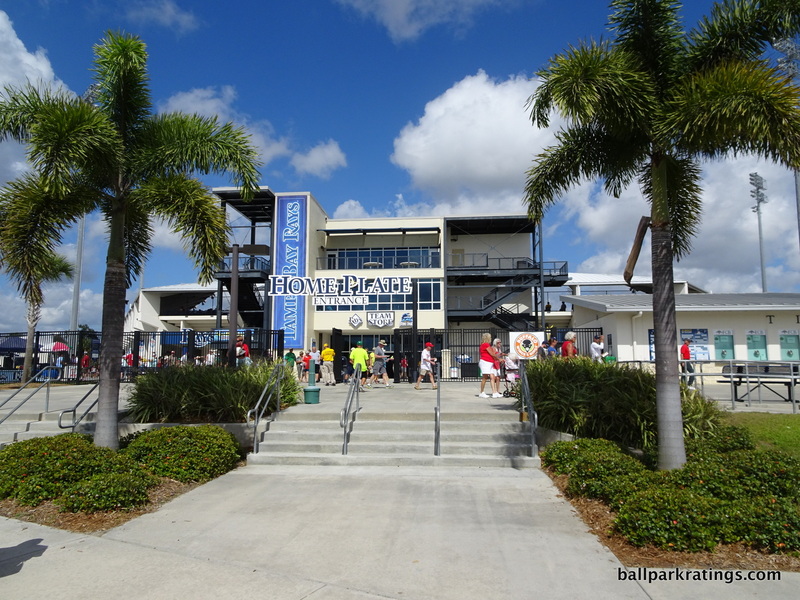 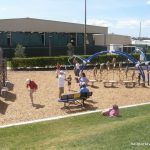 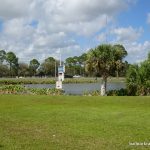 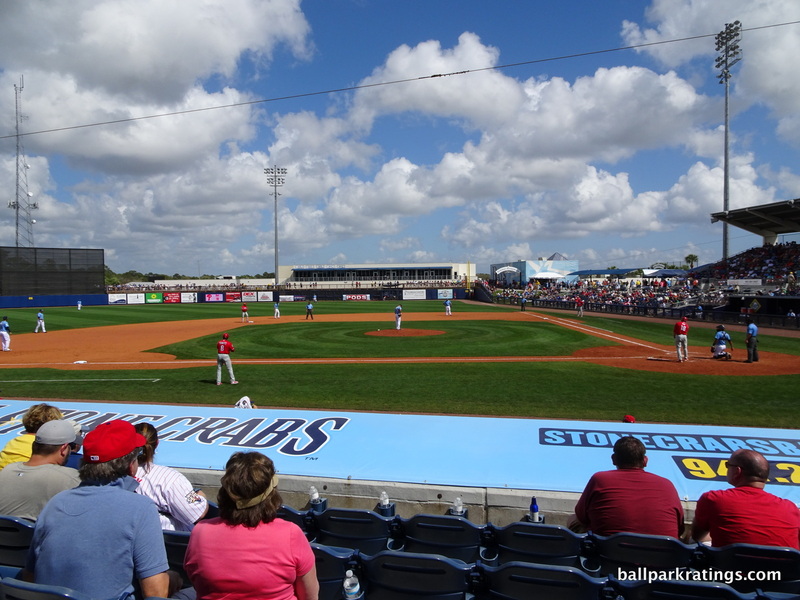 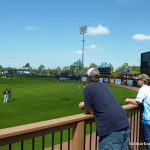 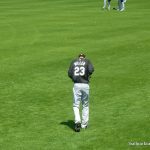 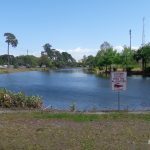 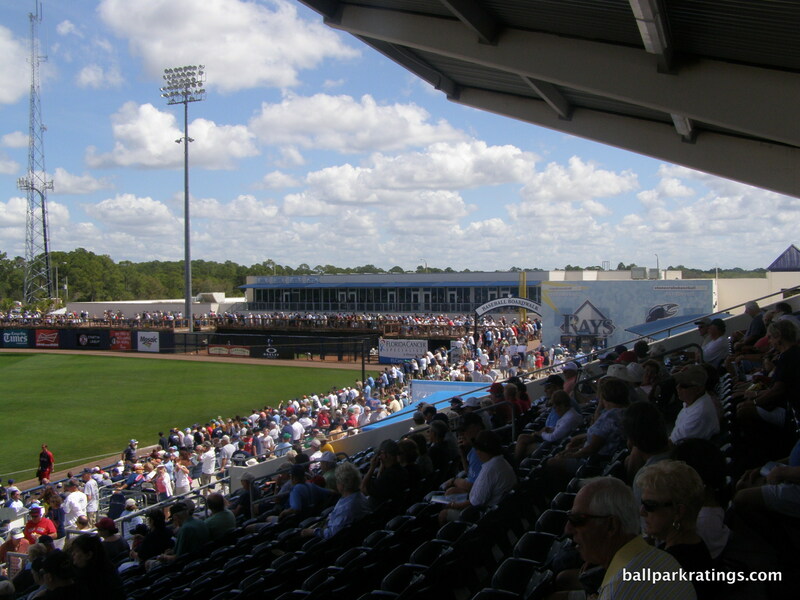 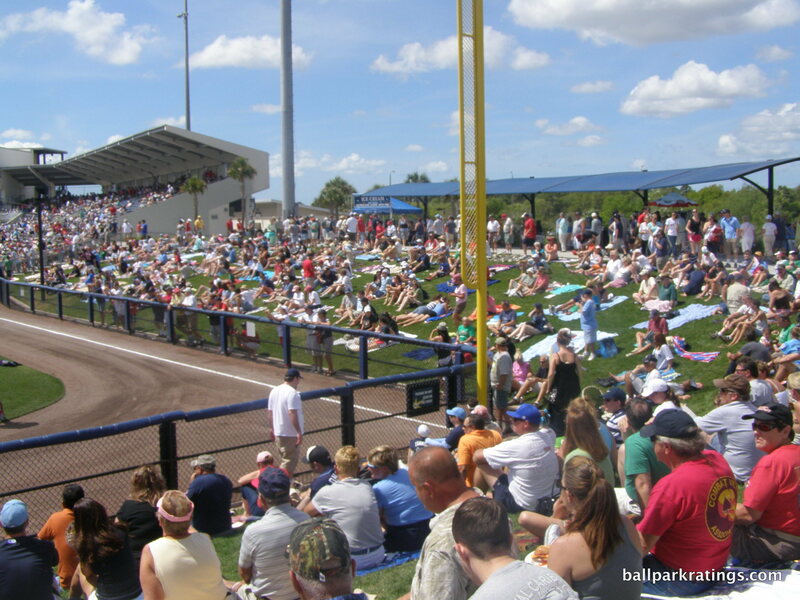 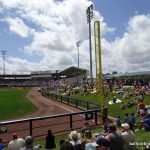 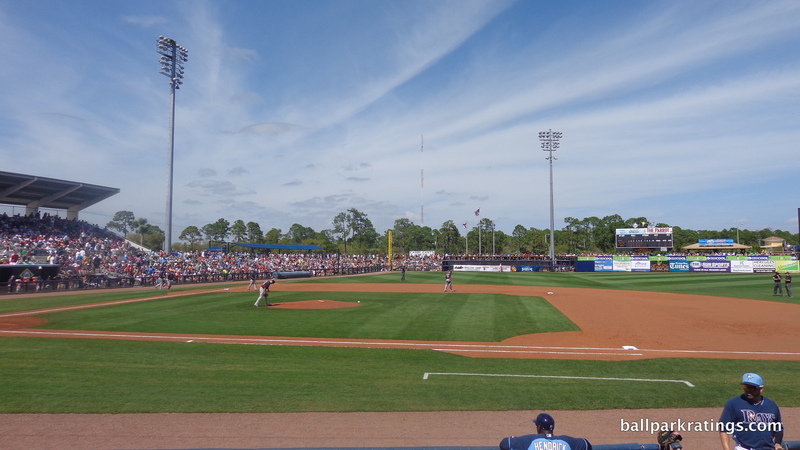 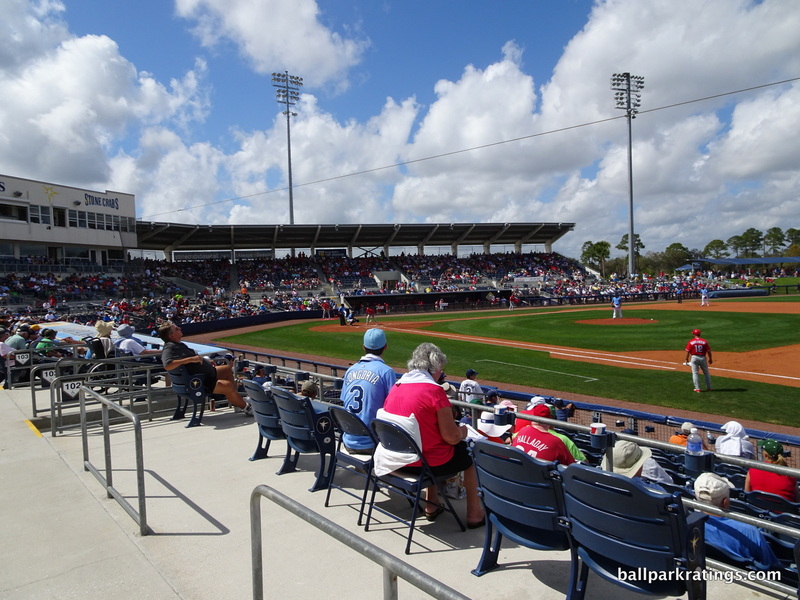 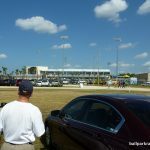 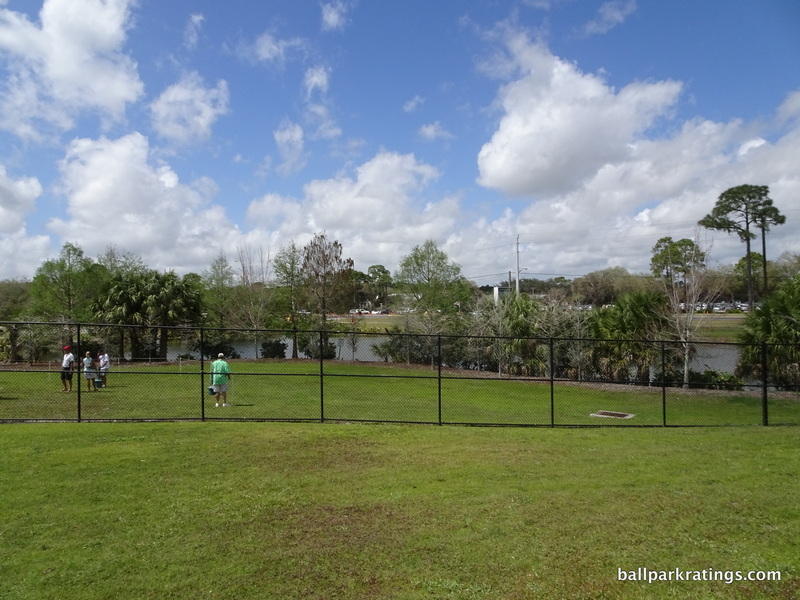 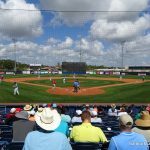 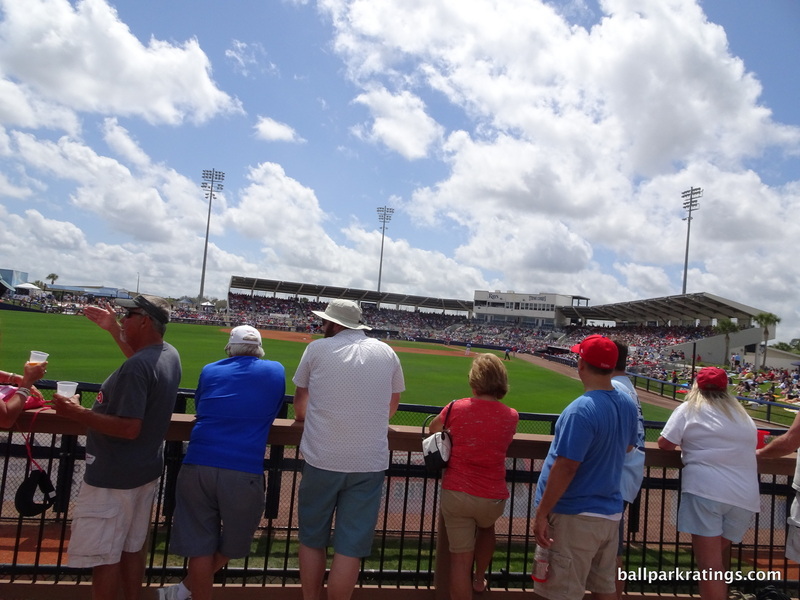 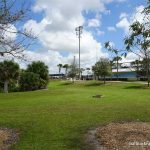 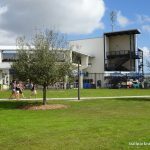 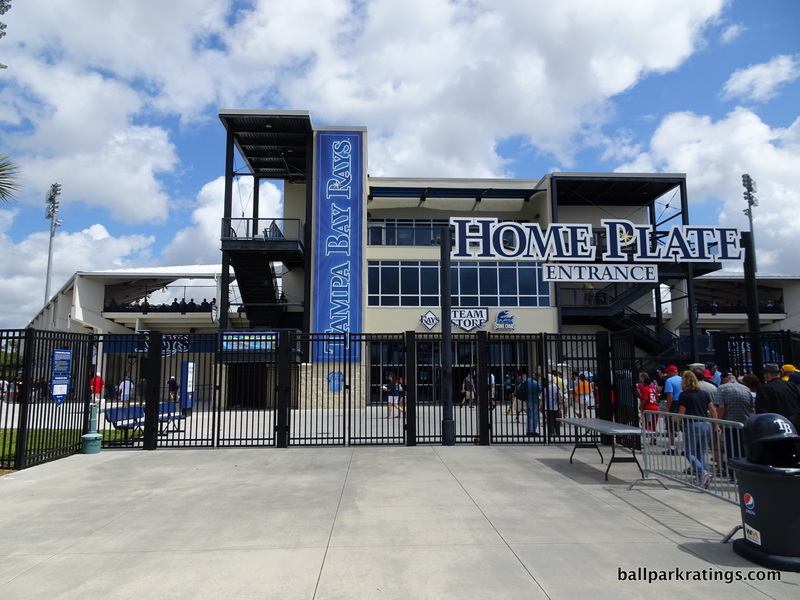 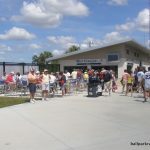 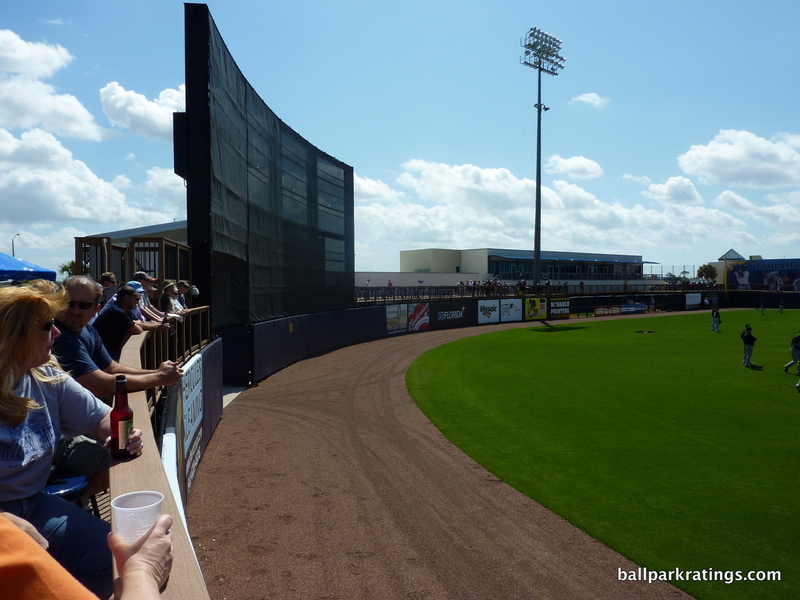 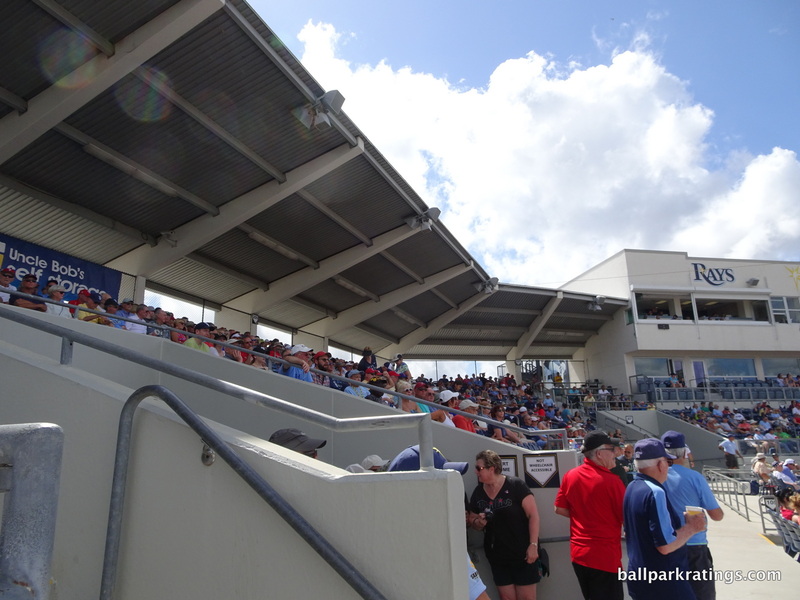 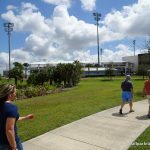 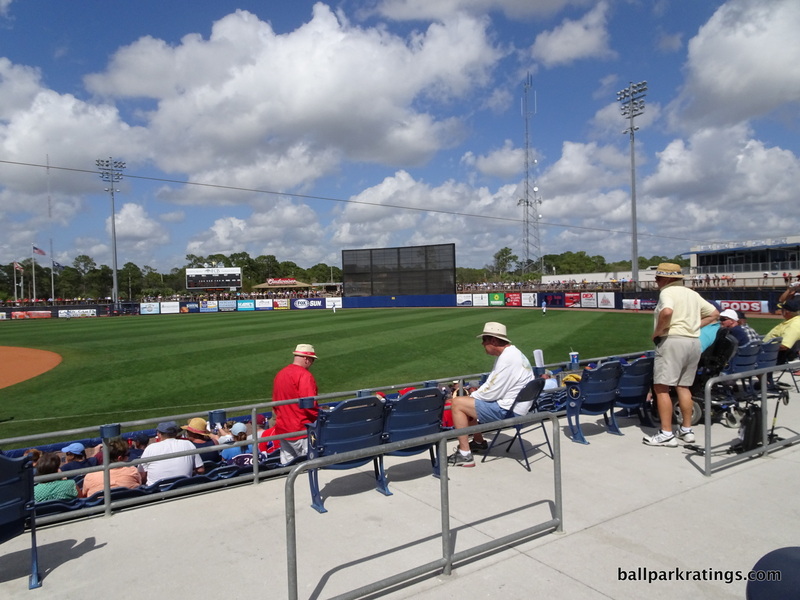 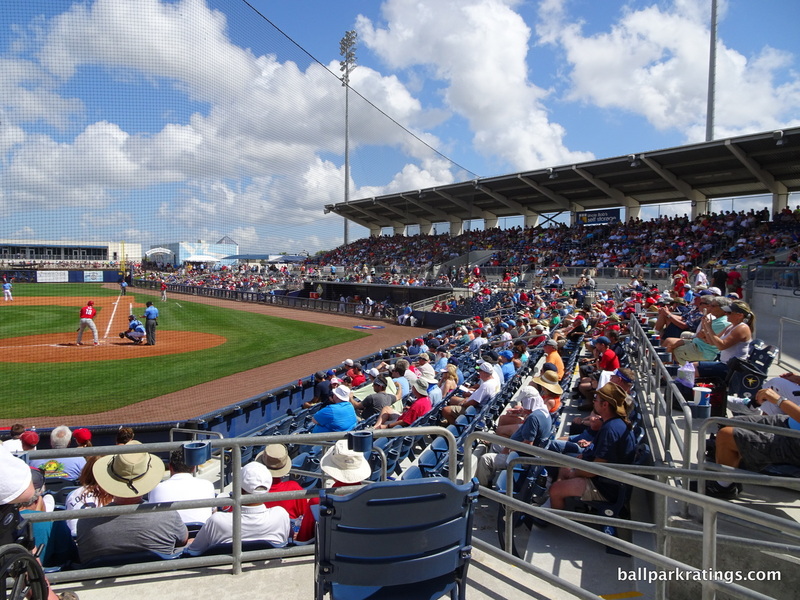 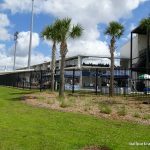 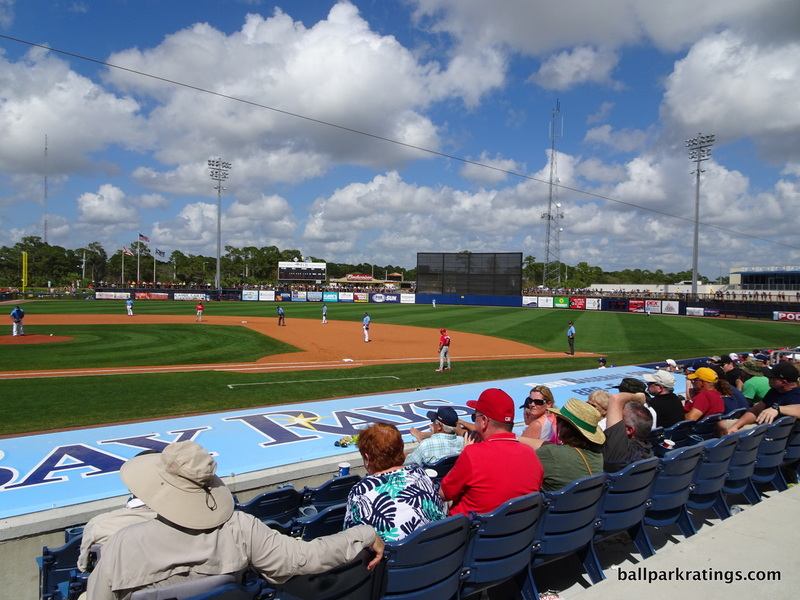 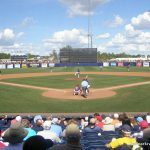 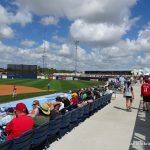 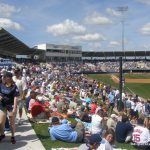 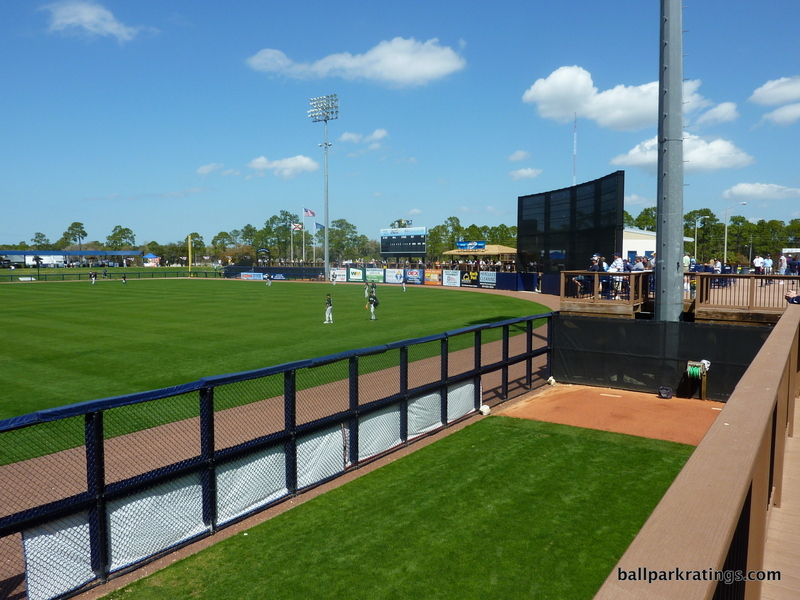 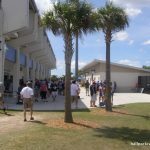 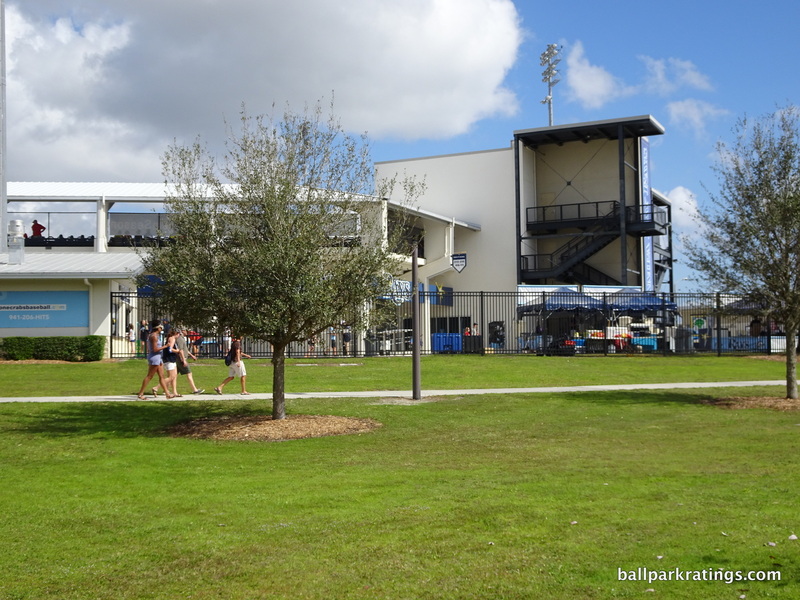 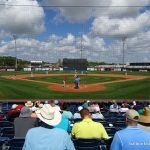 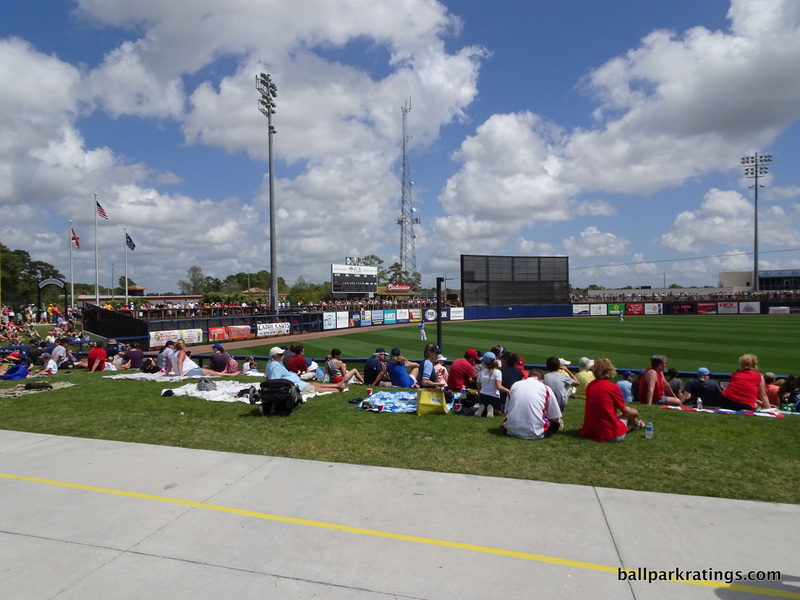 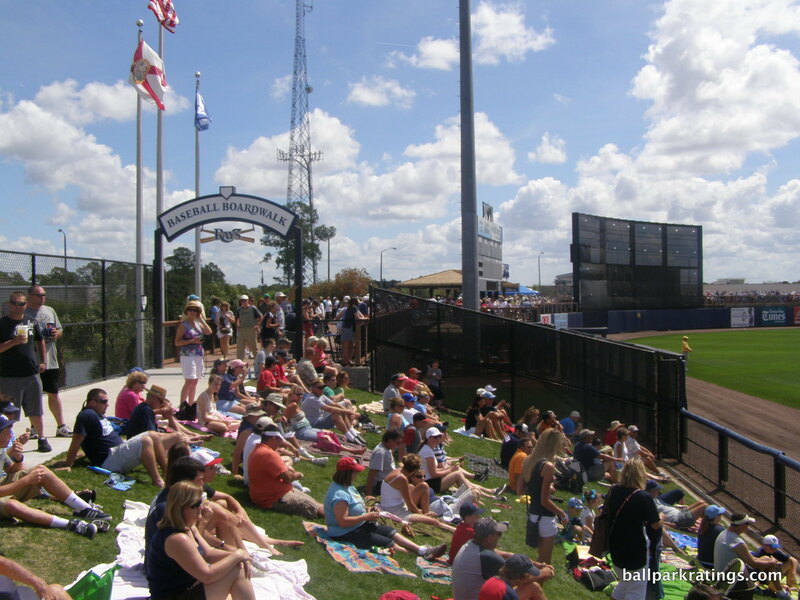 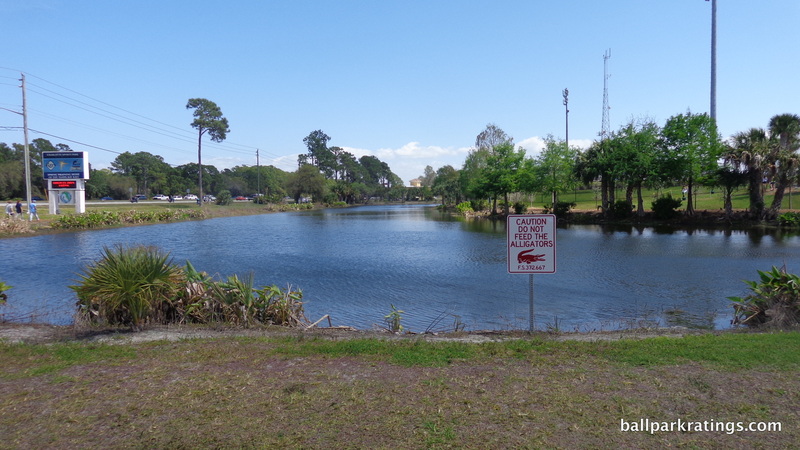 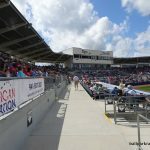 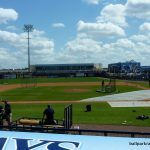 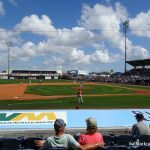 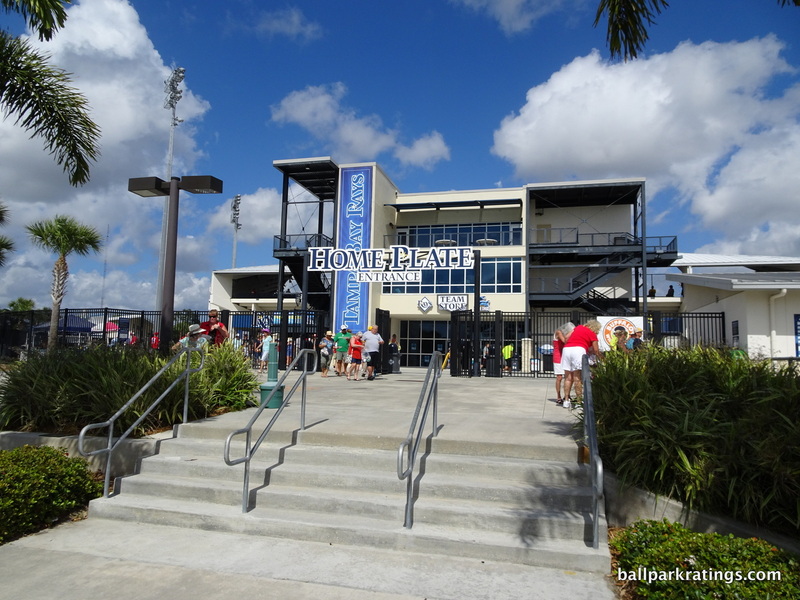 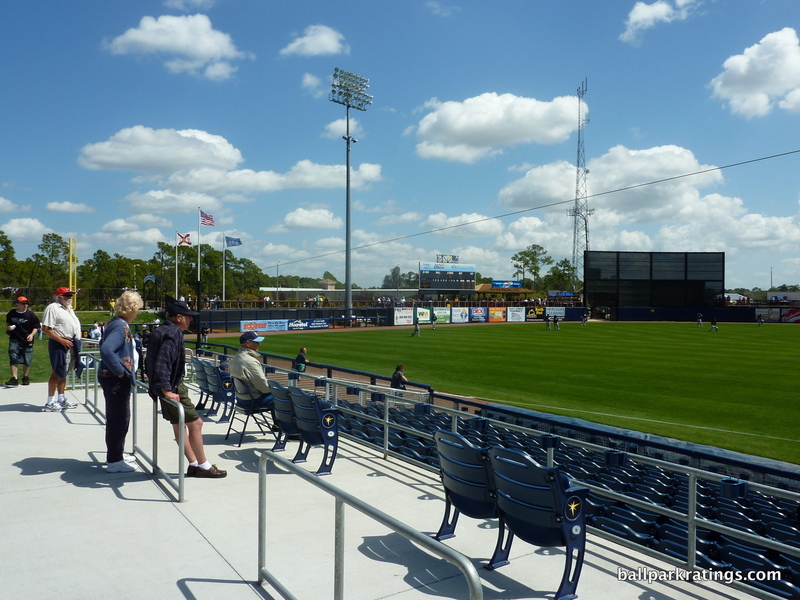 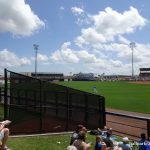 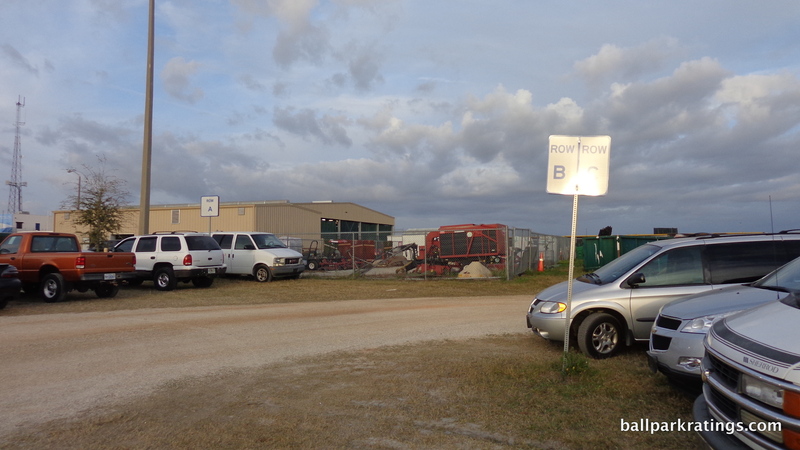 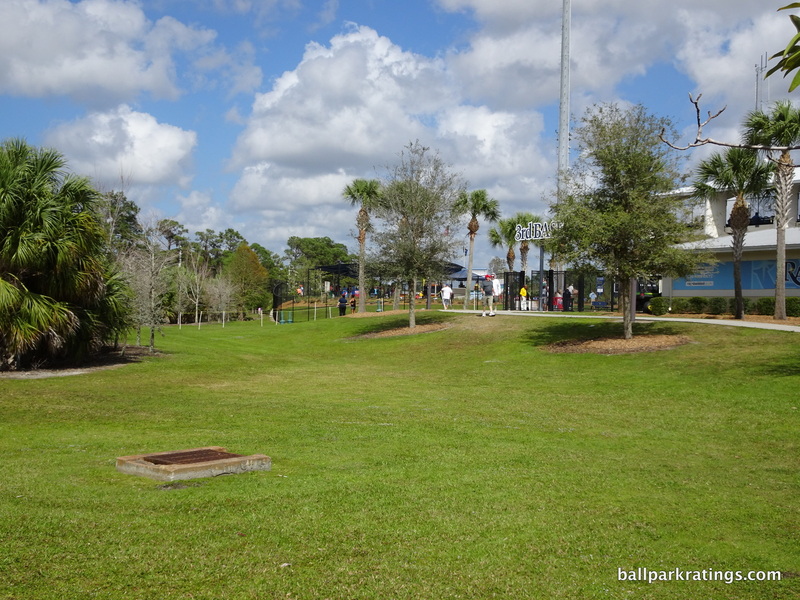 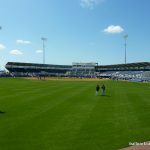 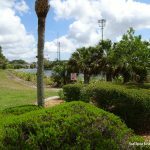 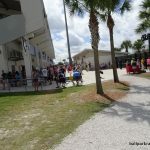 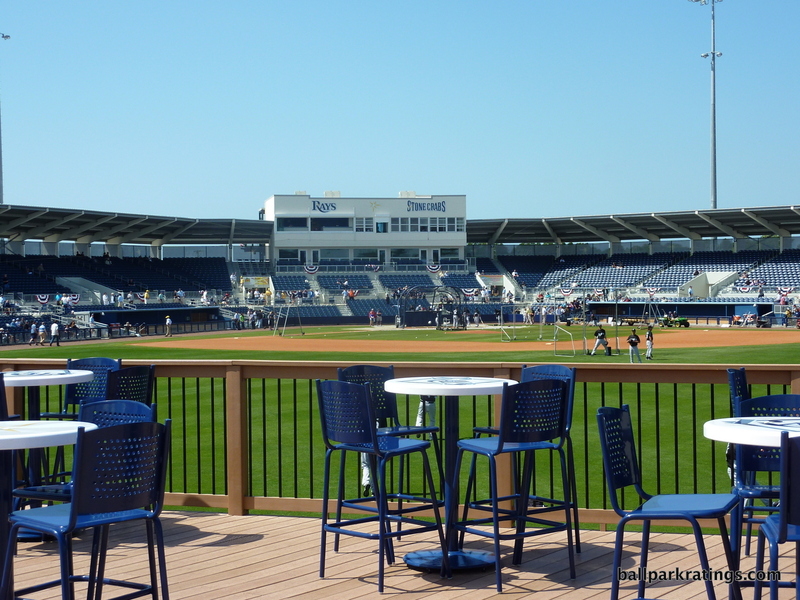 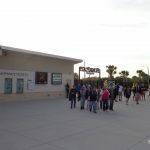 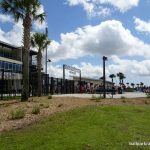 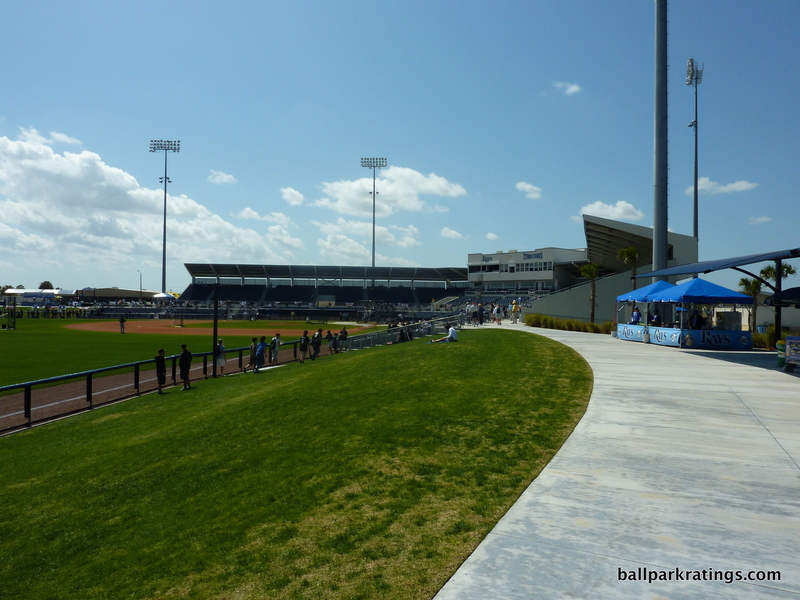 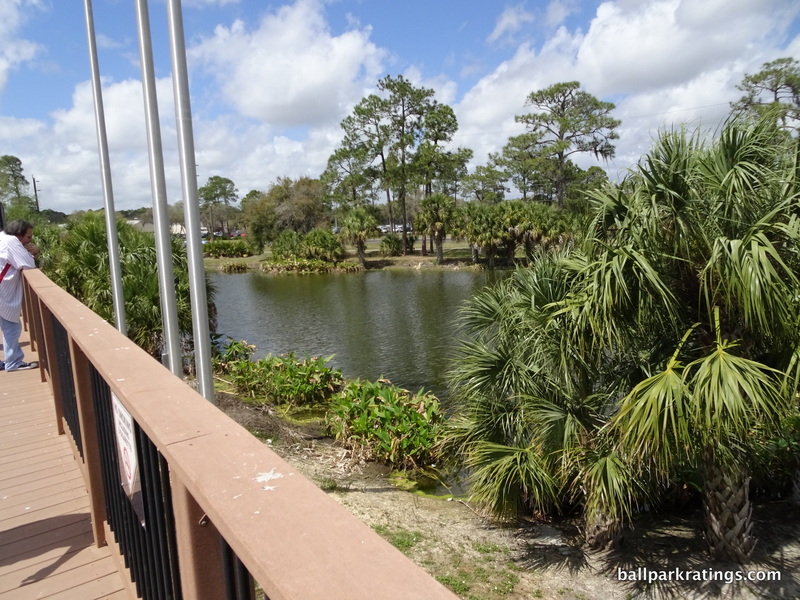 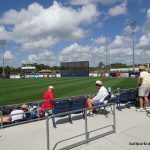 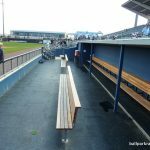 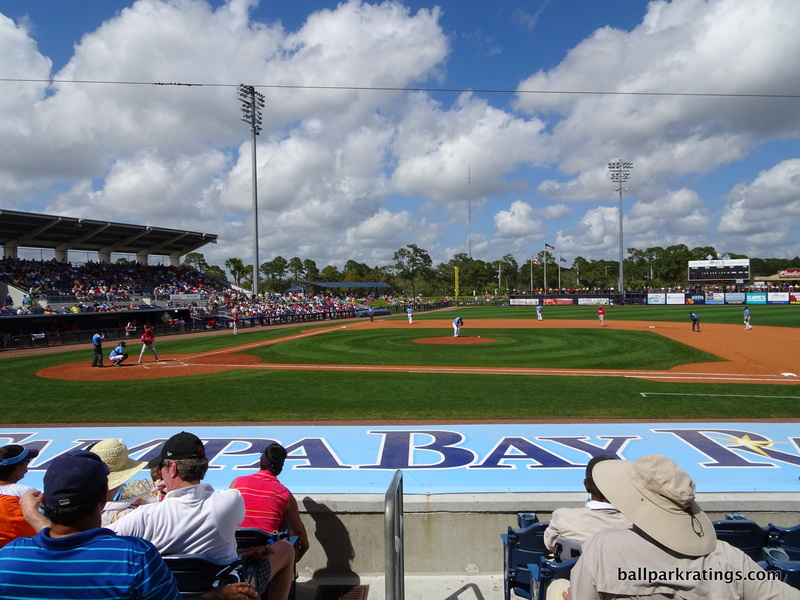 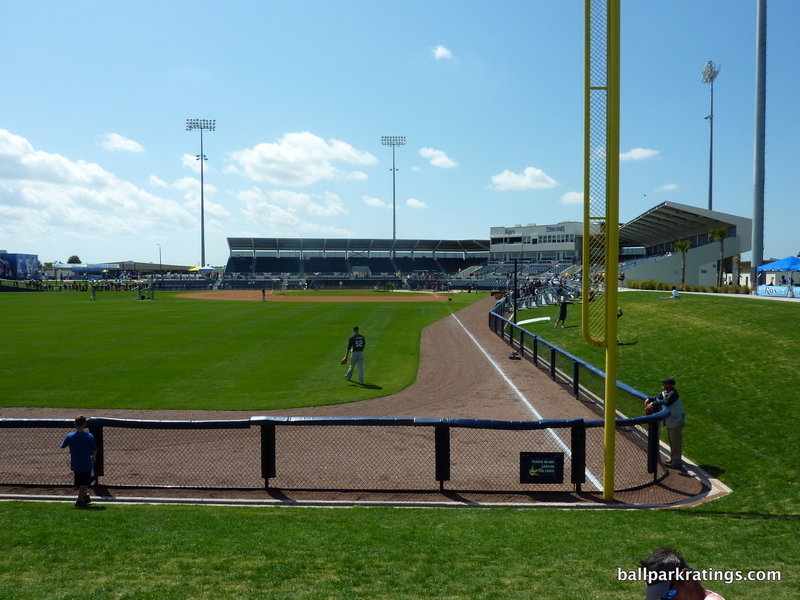 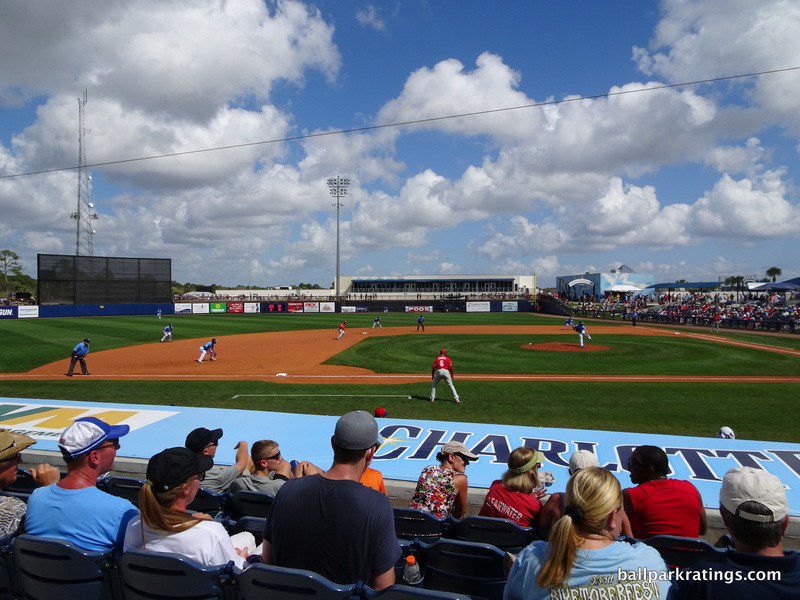 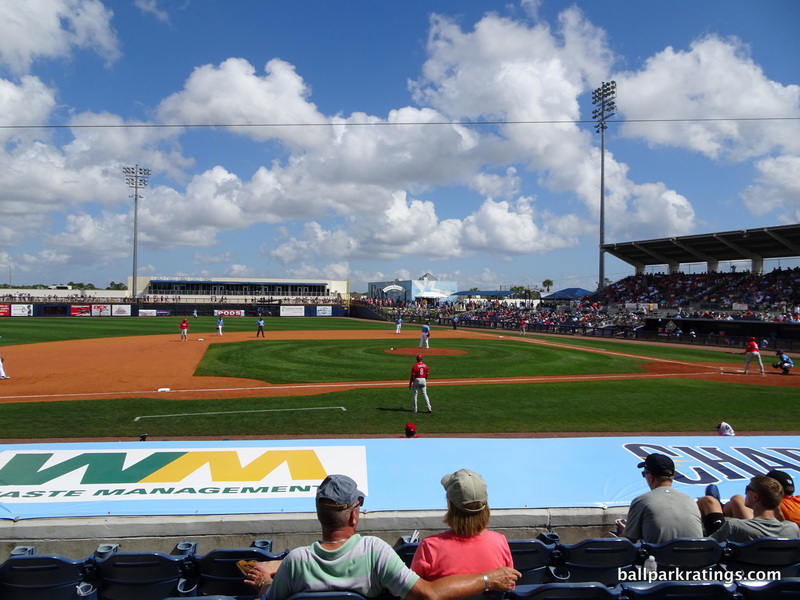 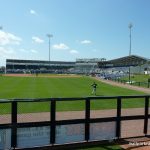 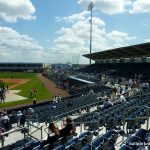 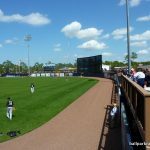 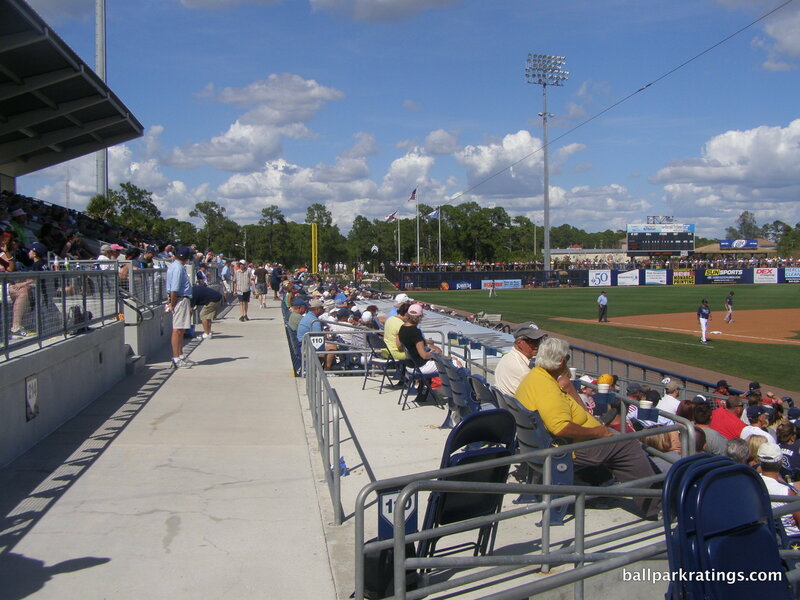 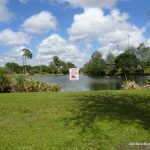 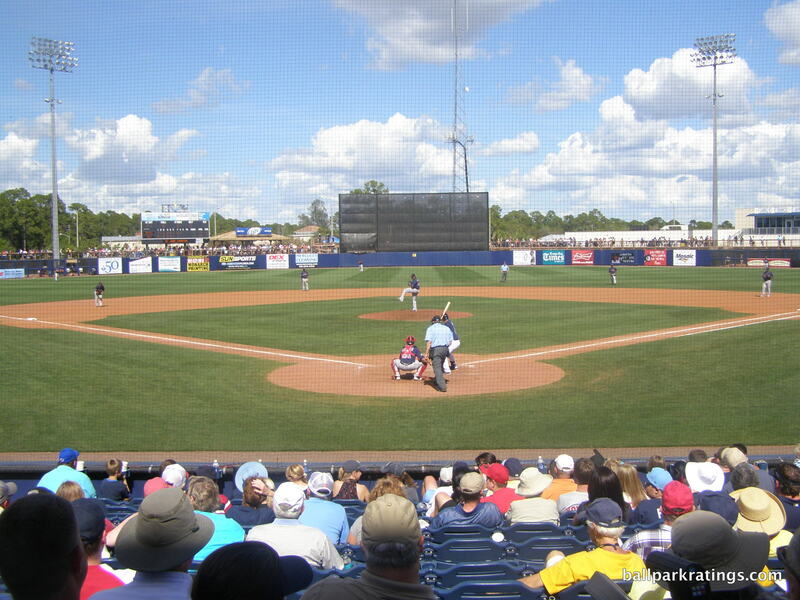 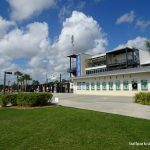 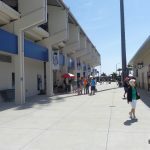 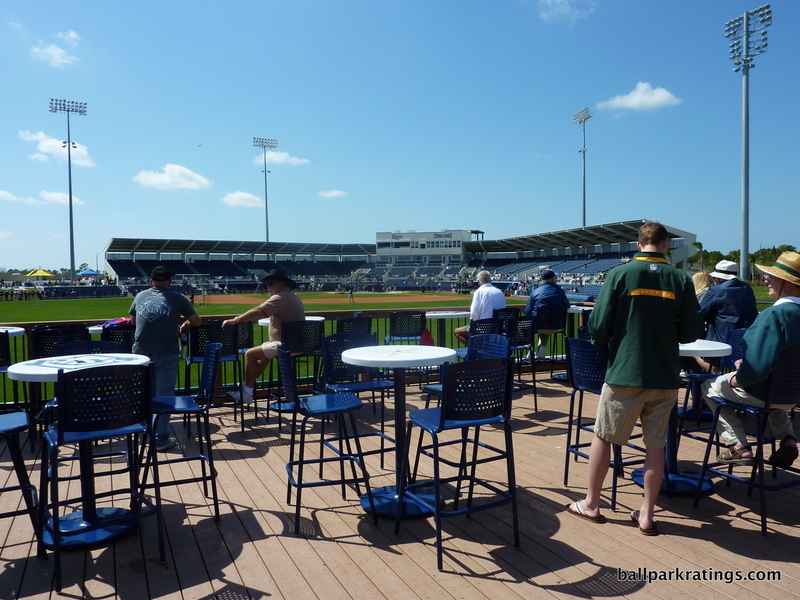 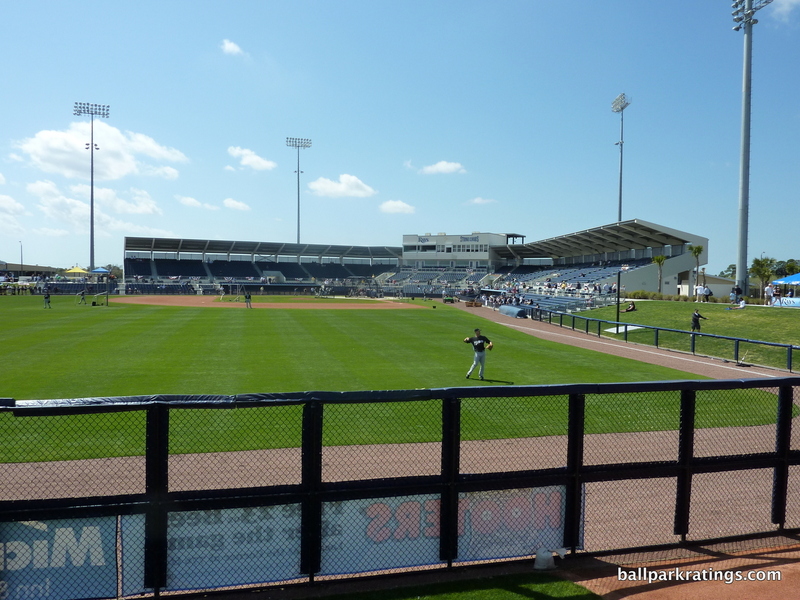 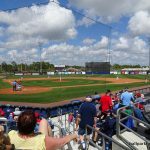 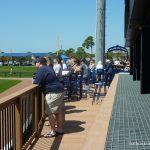 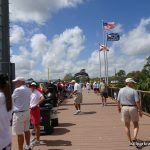 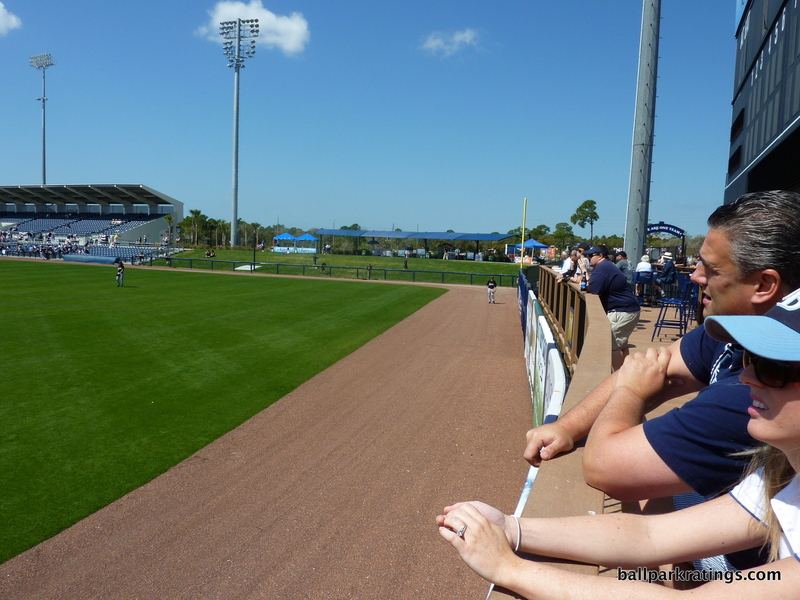 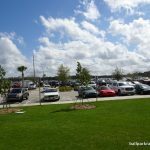 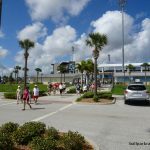 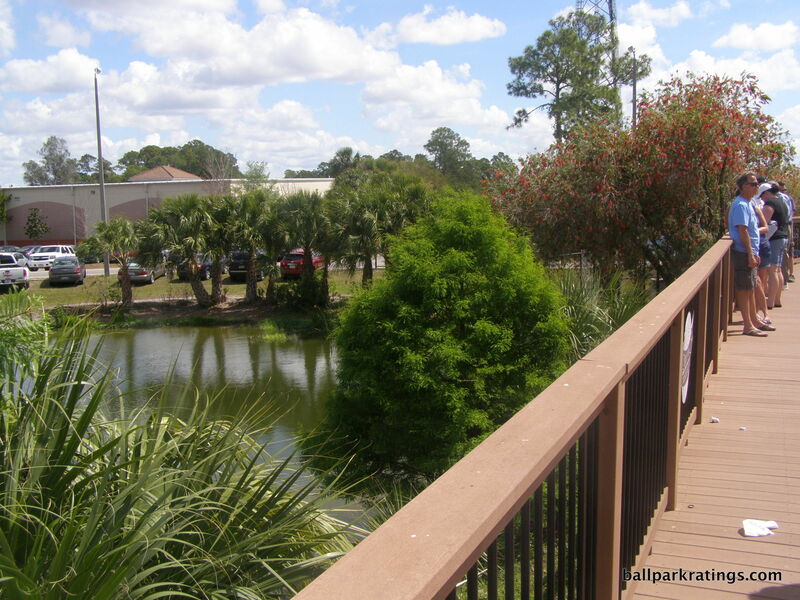 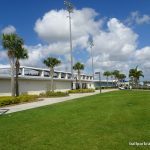 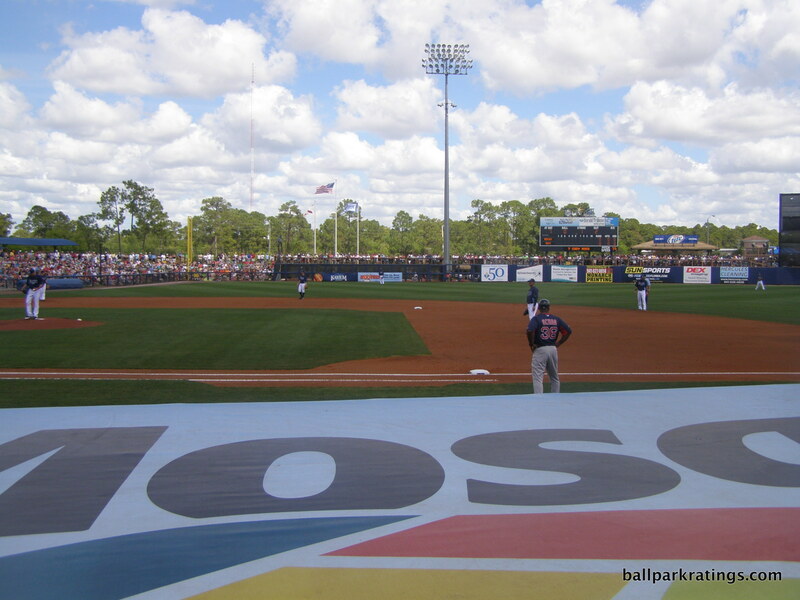 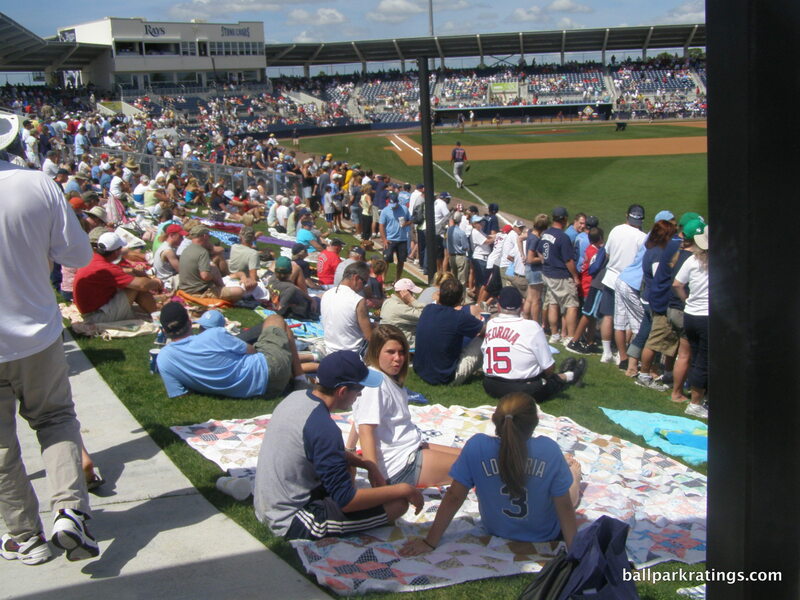 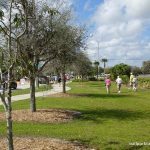 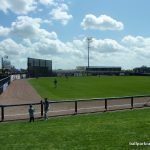 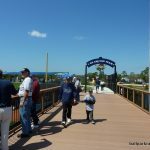 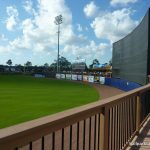 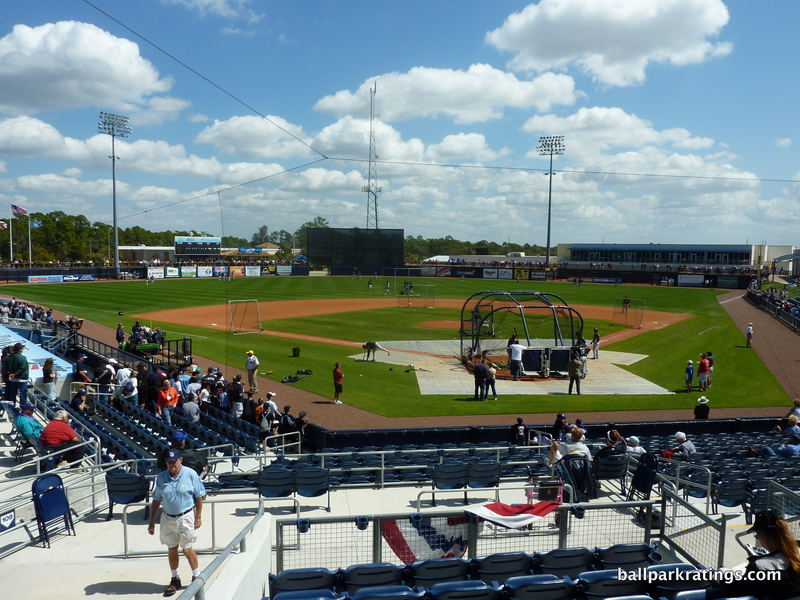 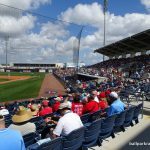 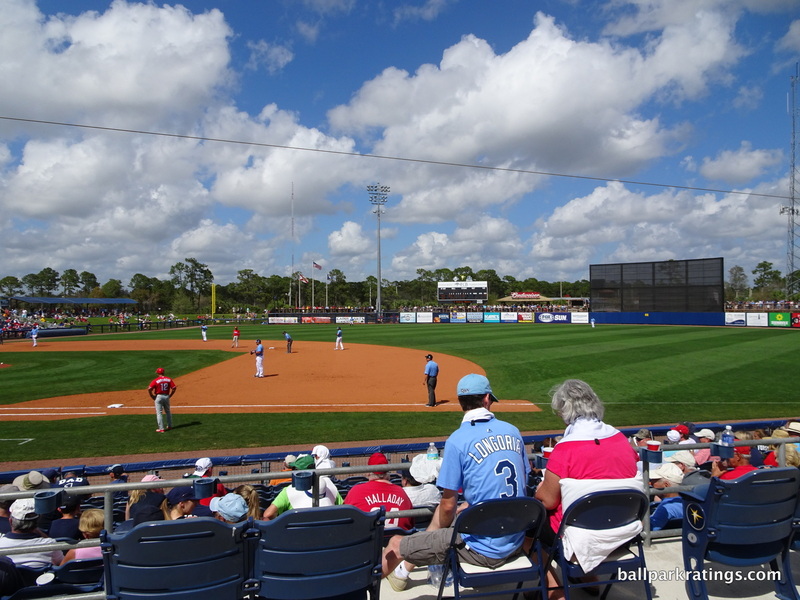 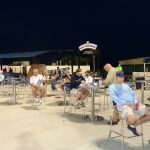 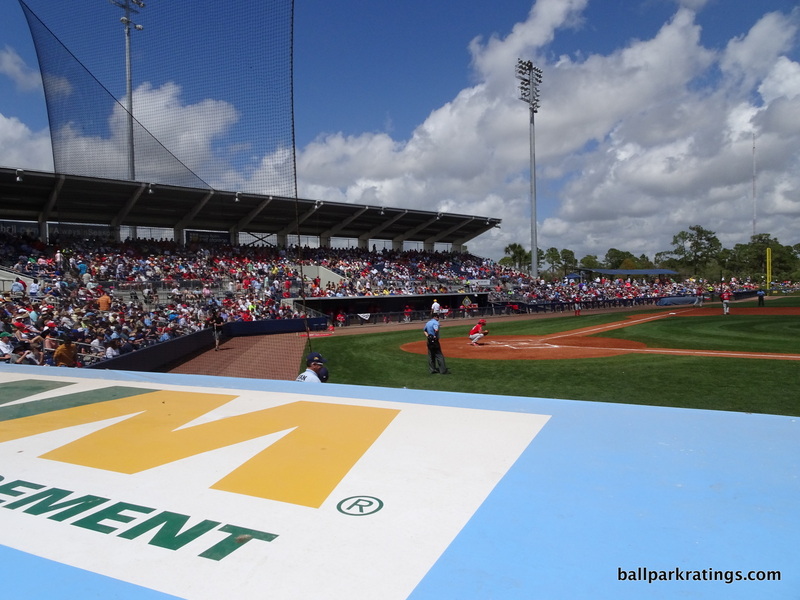 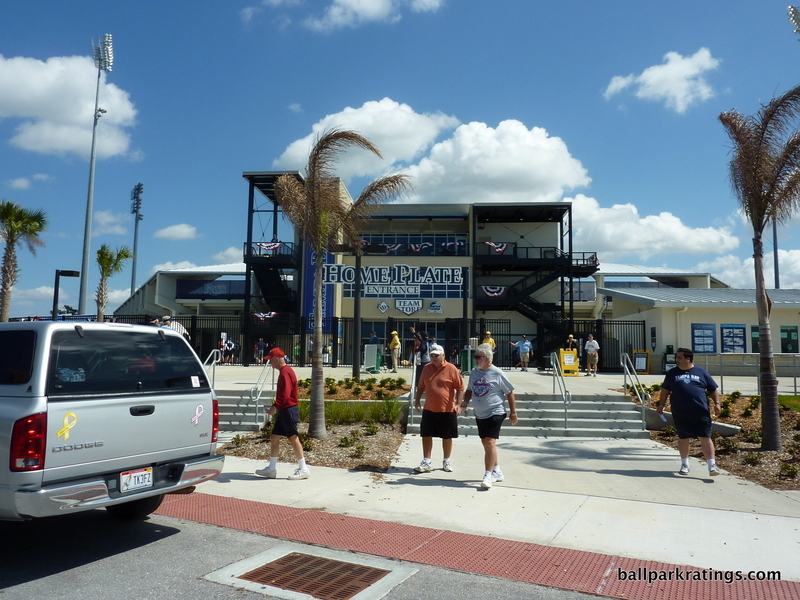 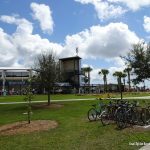 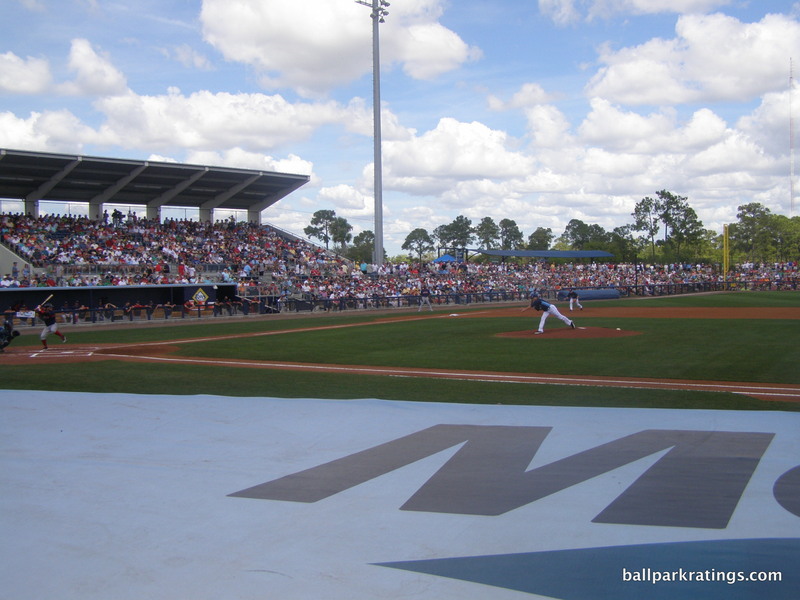 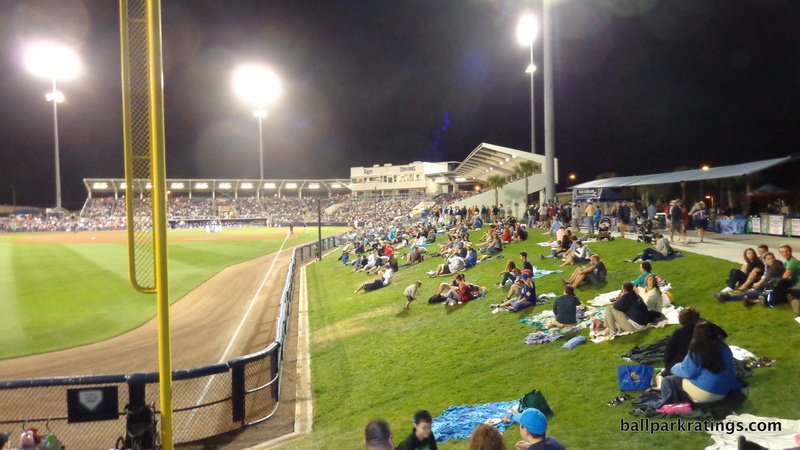 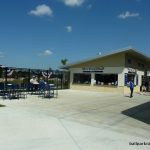 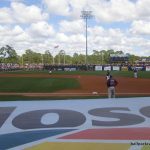 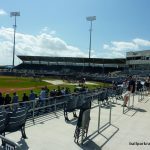 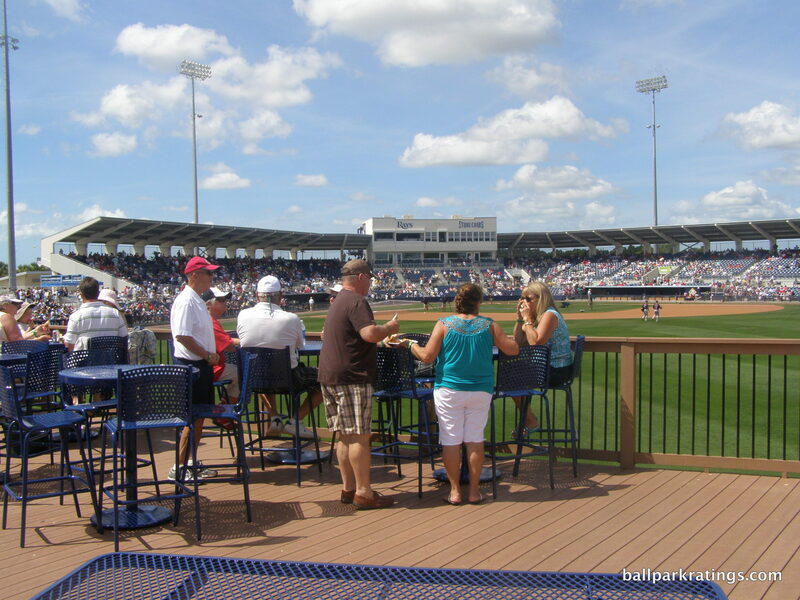 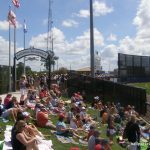 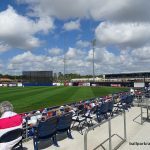 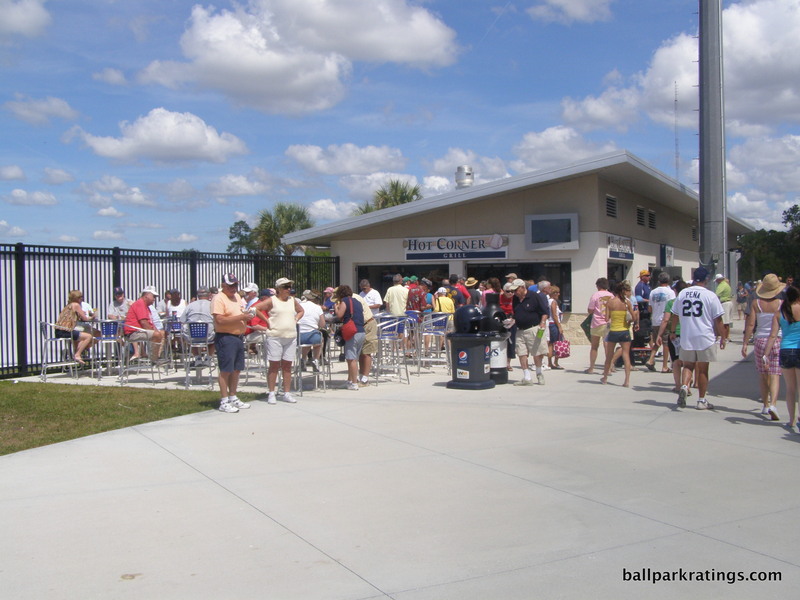 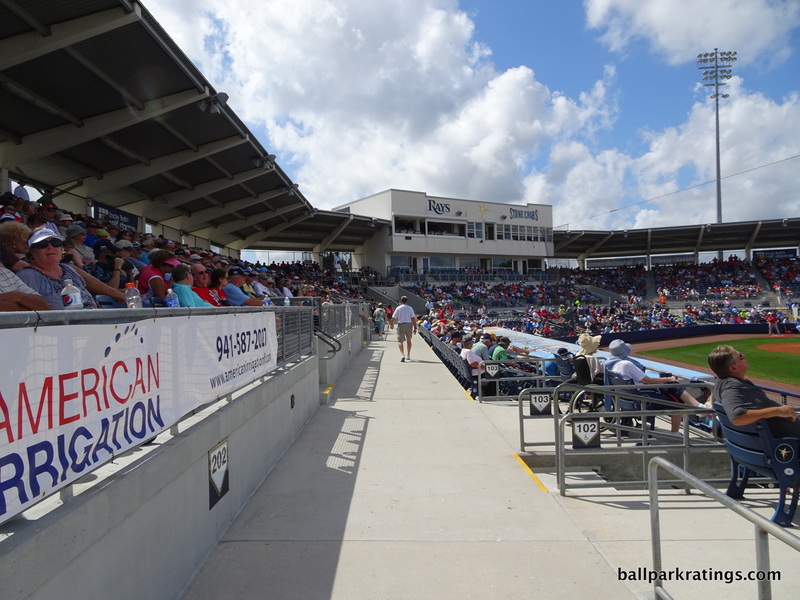 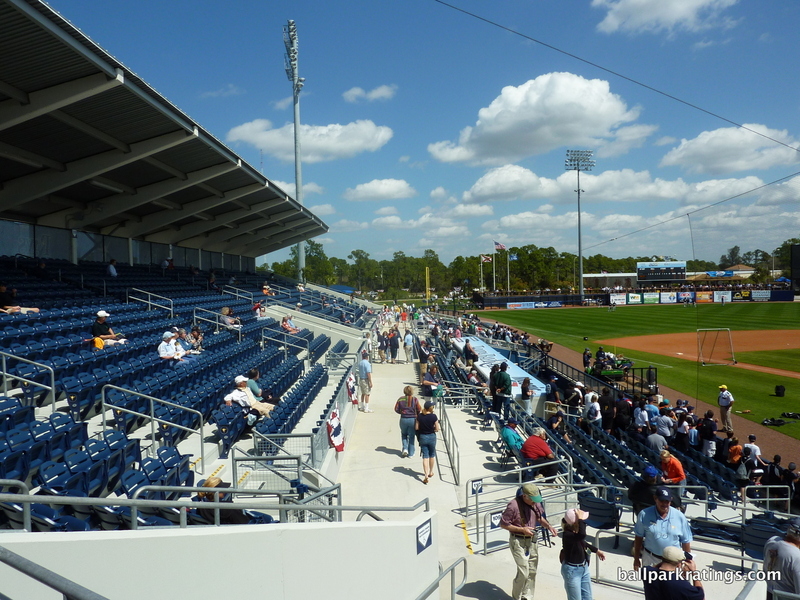 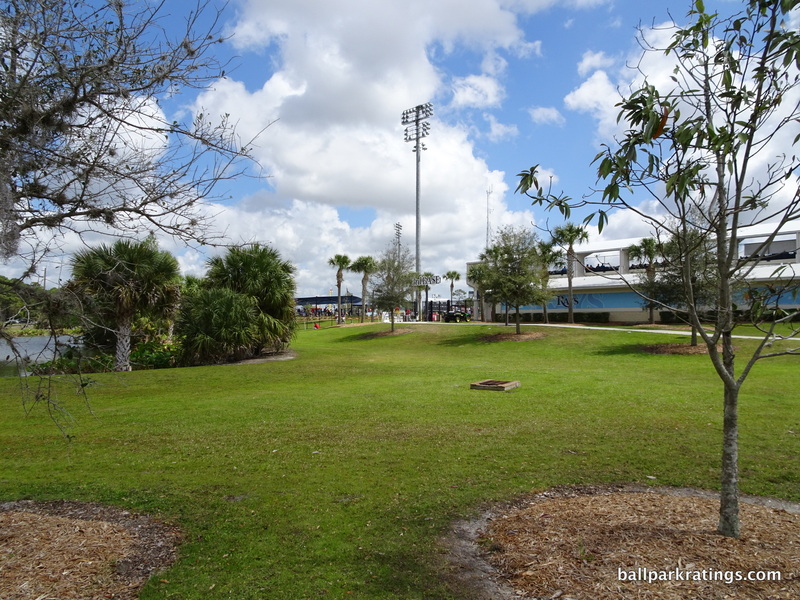 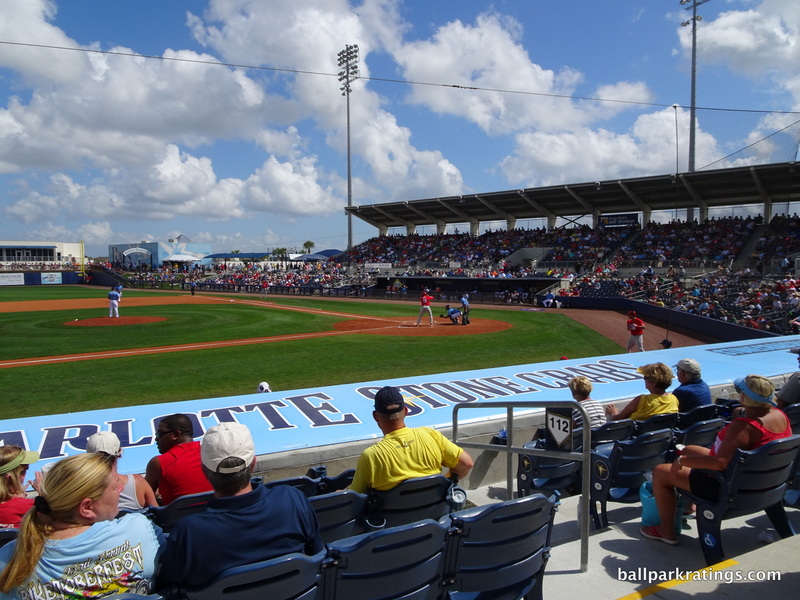 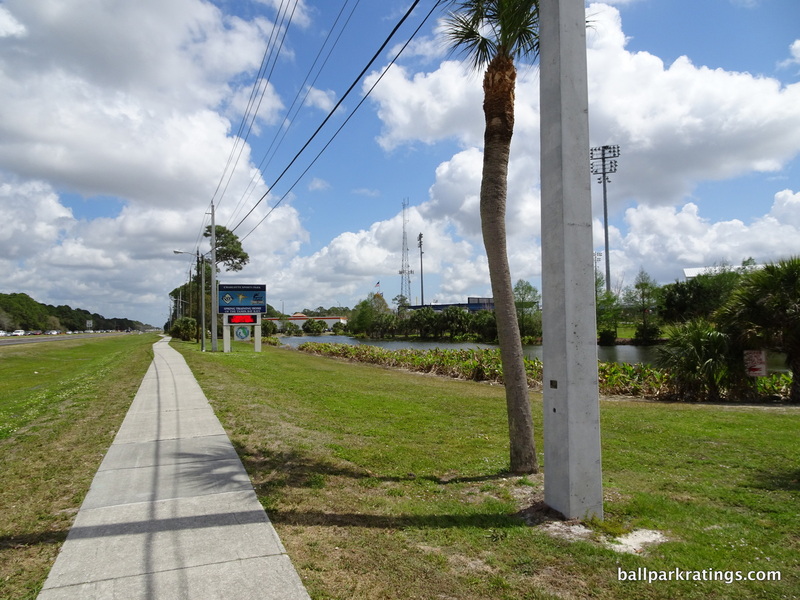 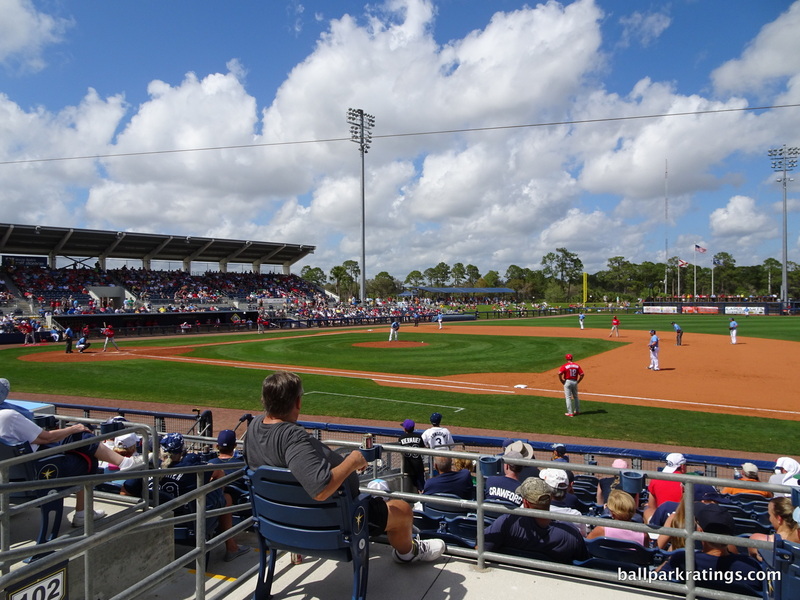 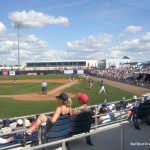 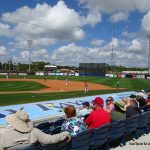 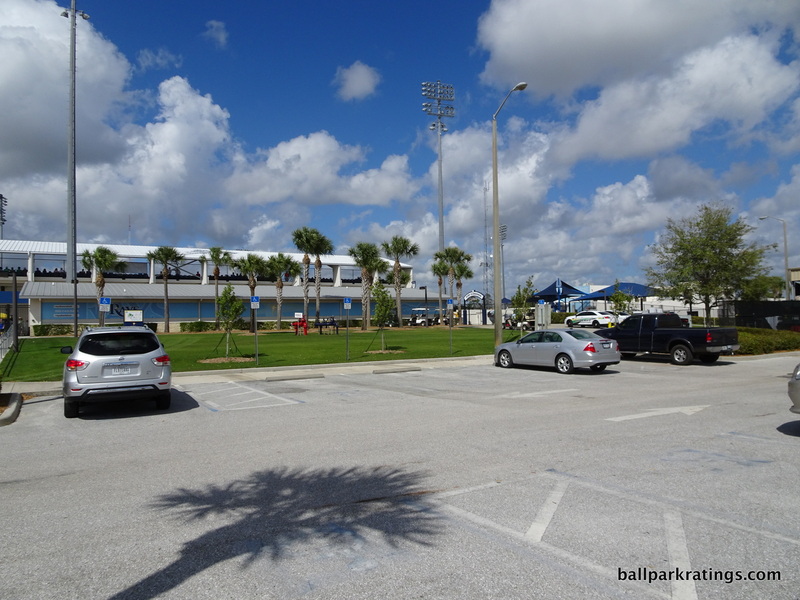 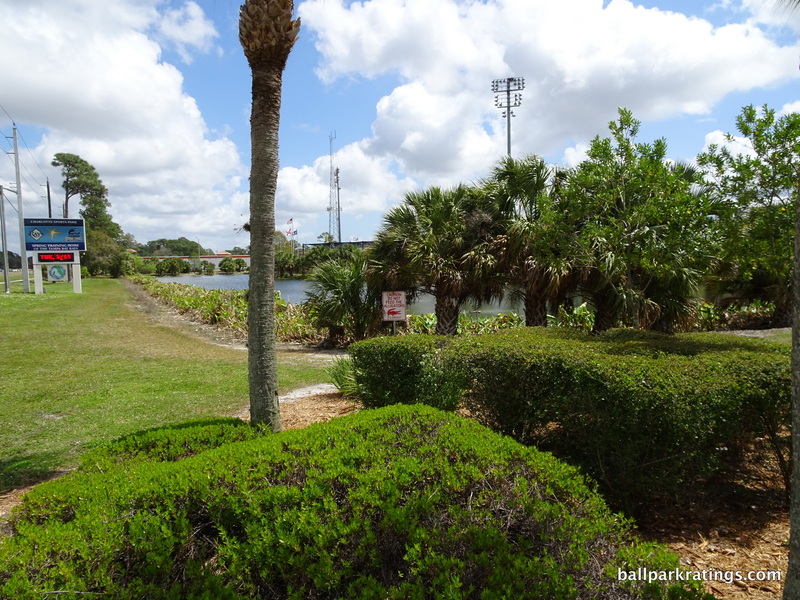 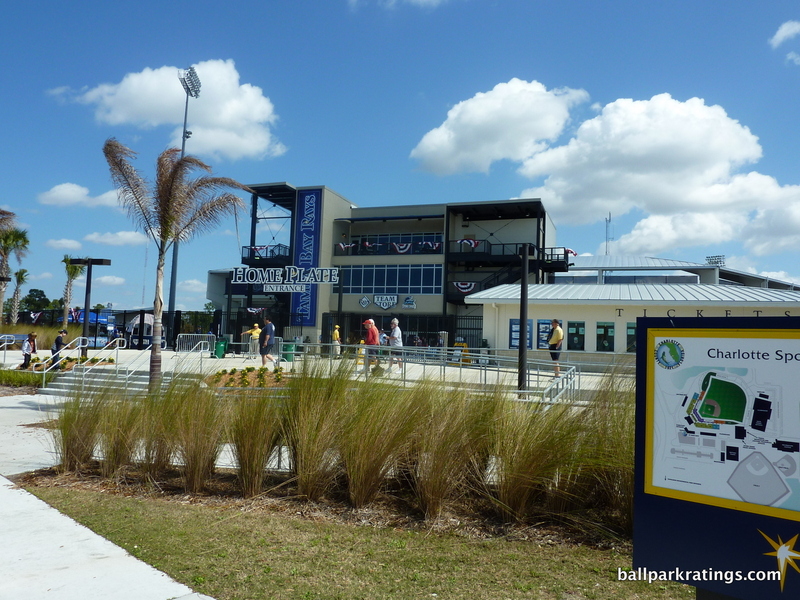 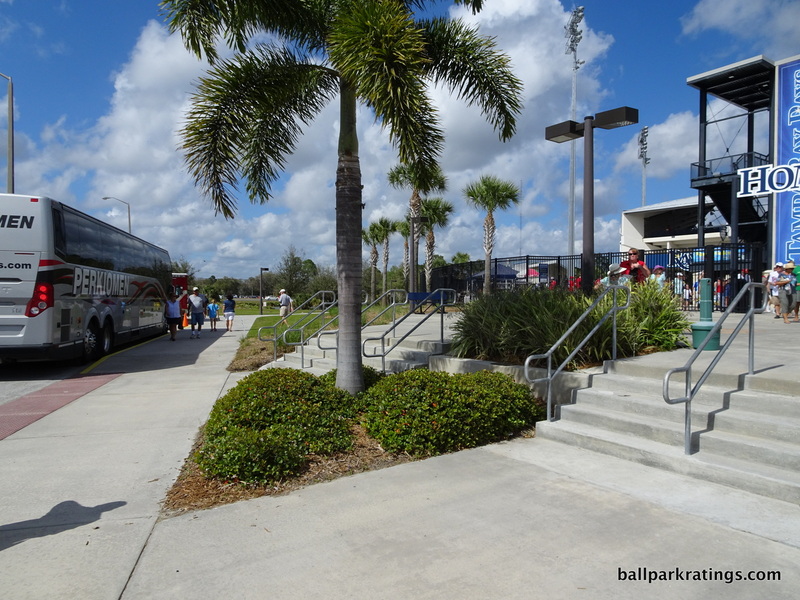 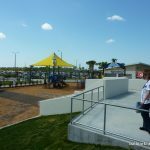 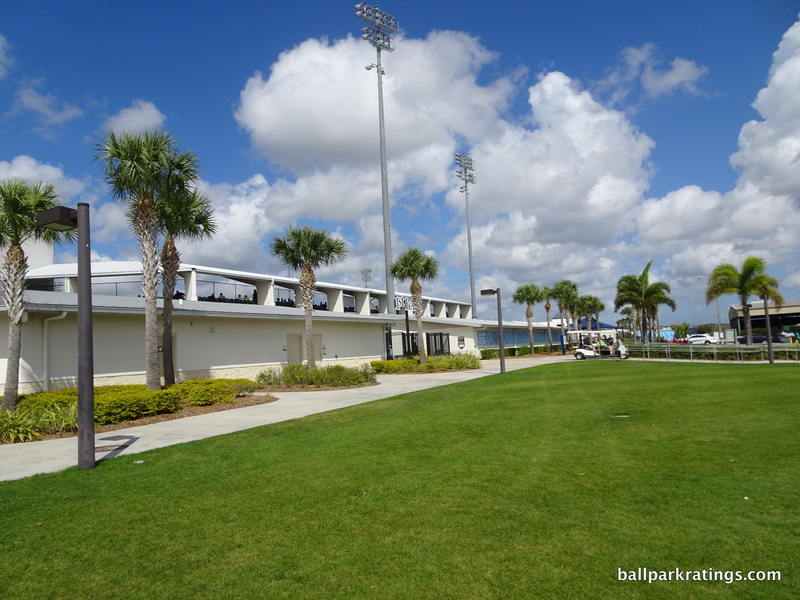 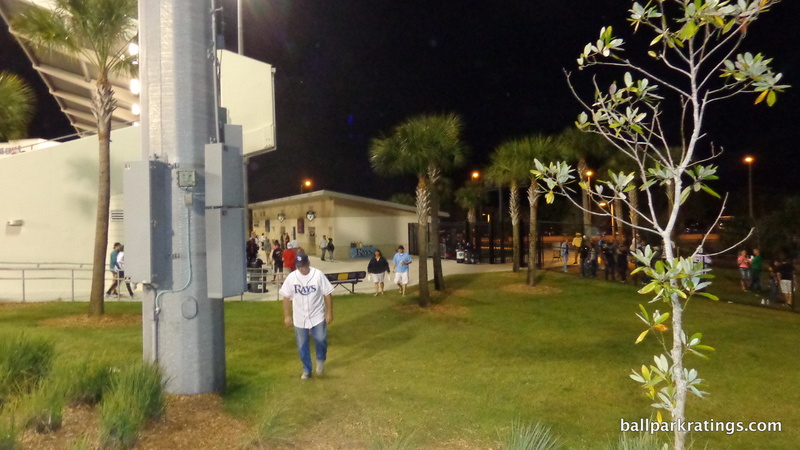 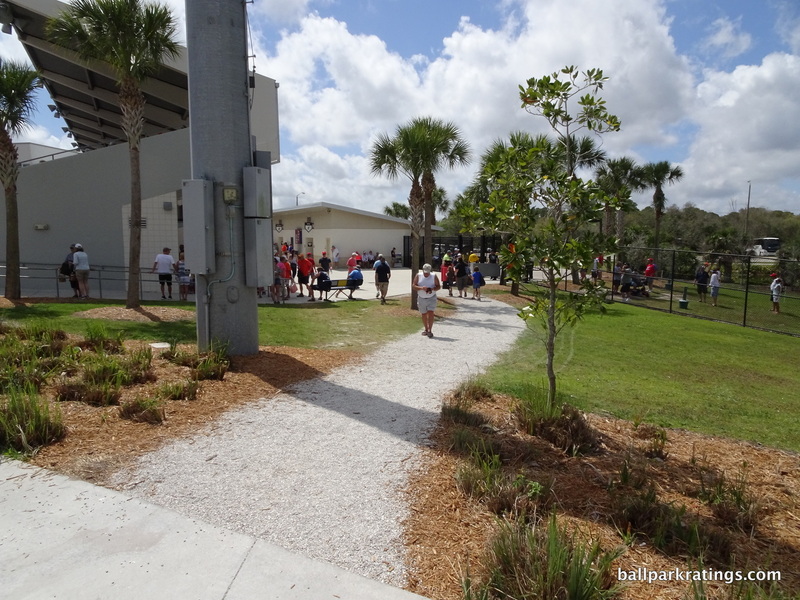 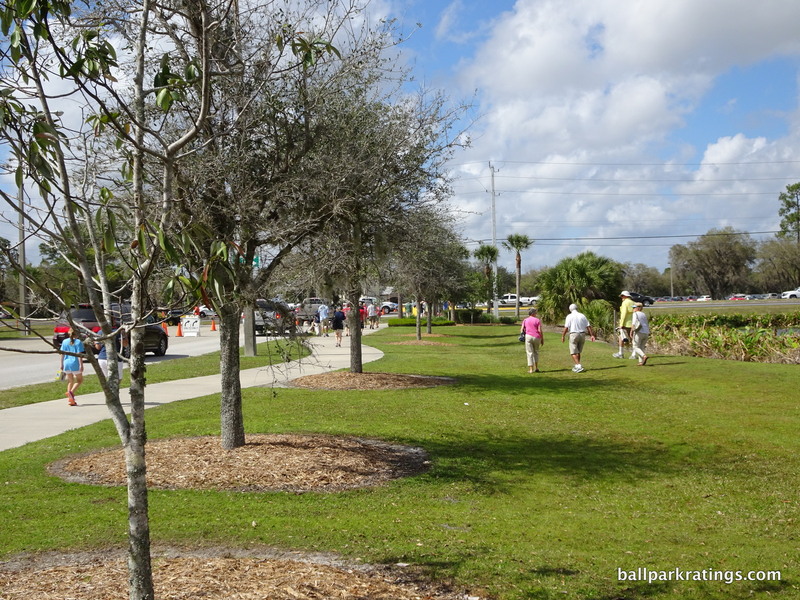 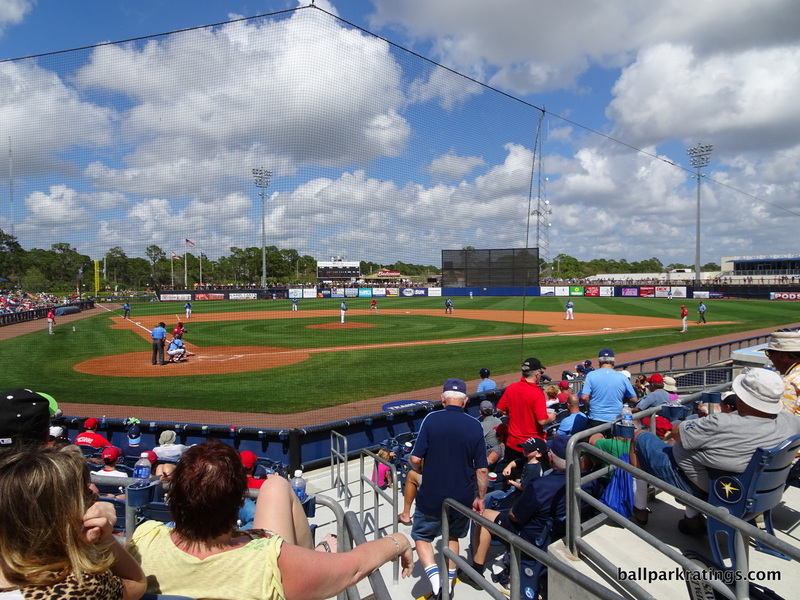 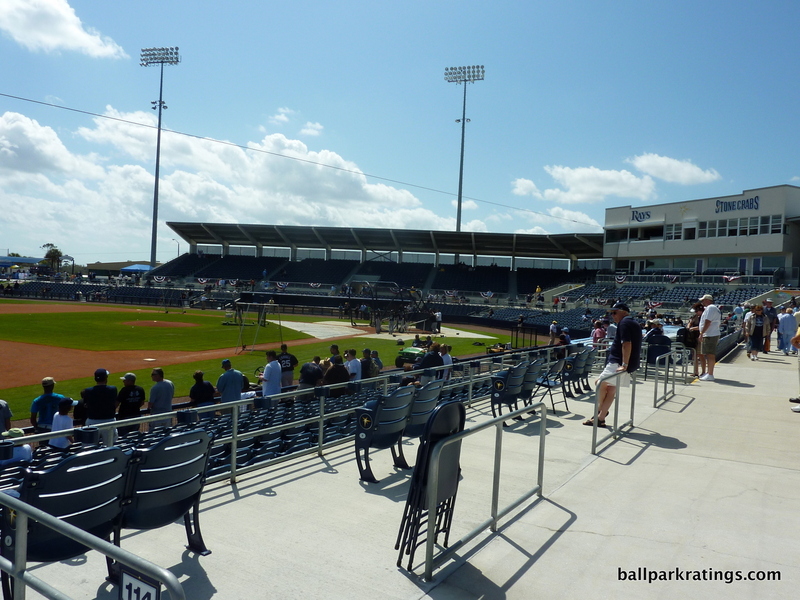 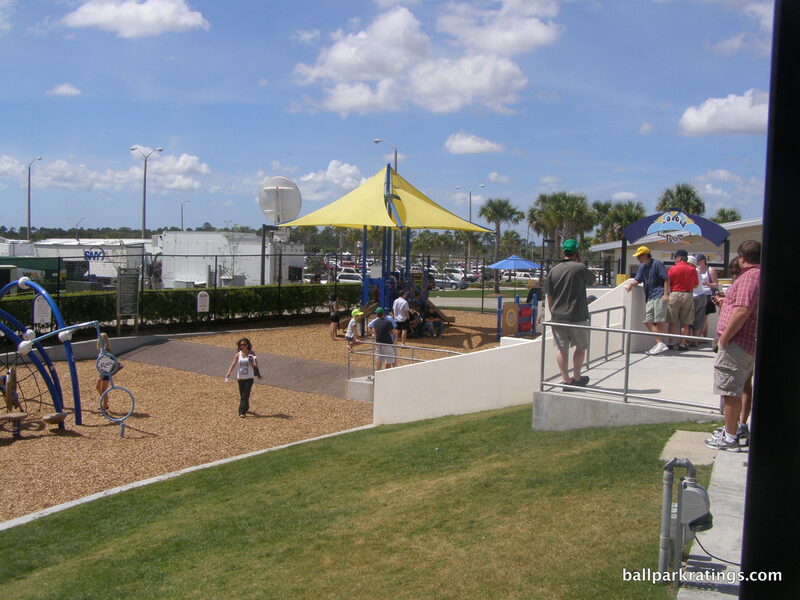 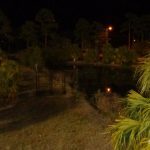 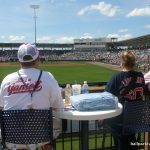 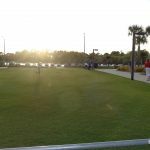 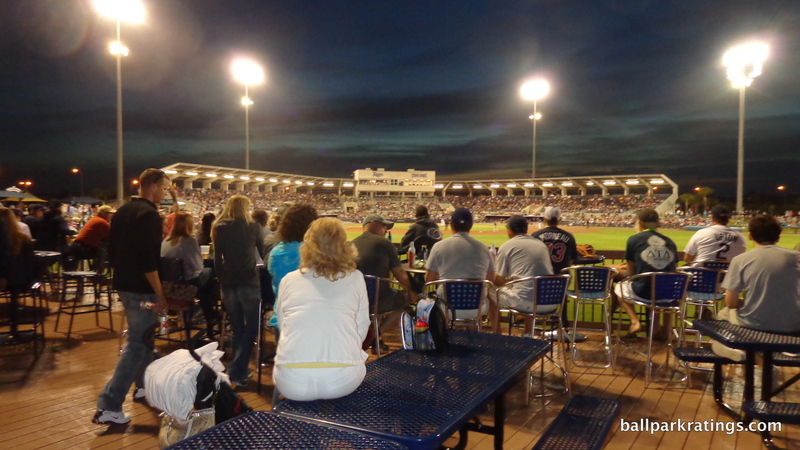 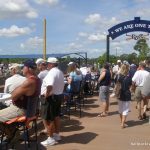 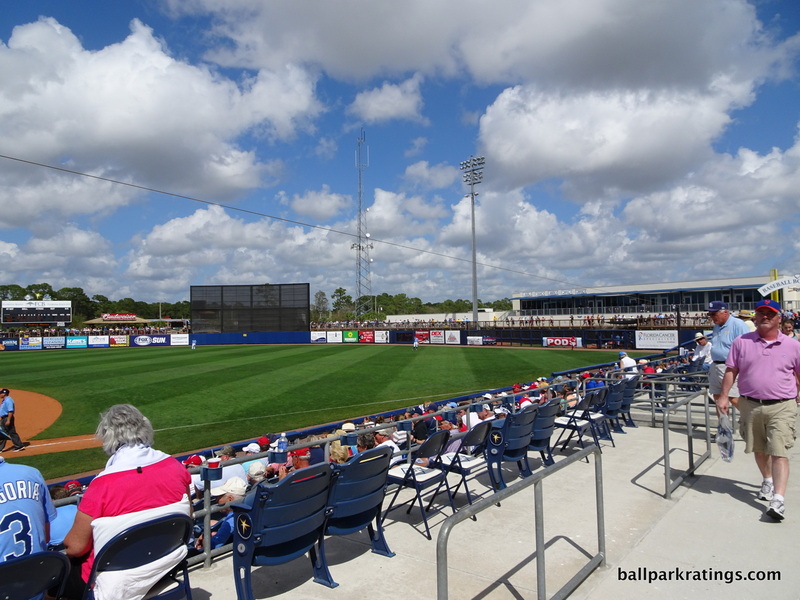 While Port Charlotte is nicely situated between Sarasota and Fort Myers, Charlotte Sports Park may be the most isolated park in spring training within an area. 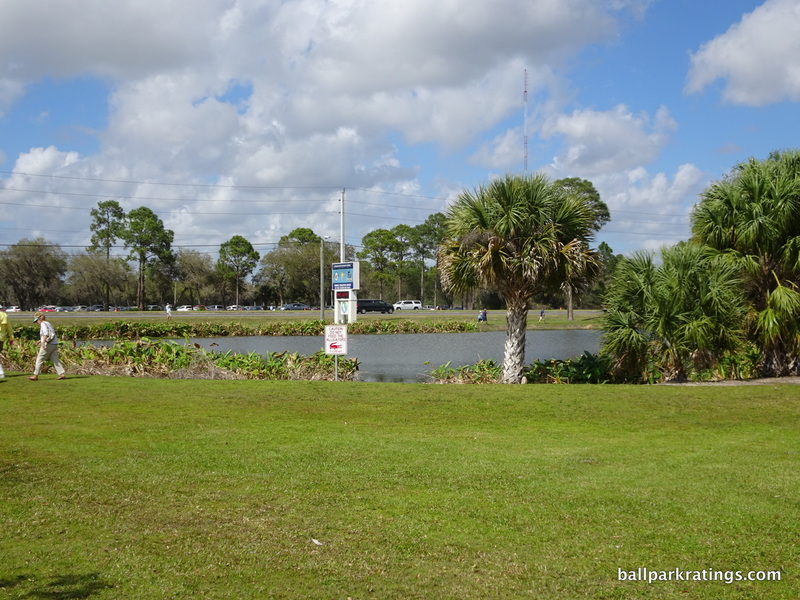 Eight miles from the nearest interstate and completely secluded from development, this park really feels like it’s in the middle of nowhere. 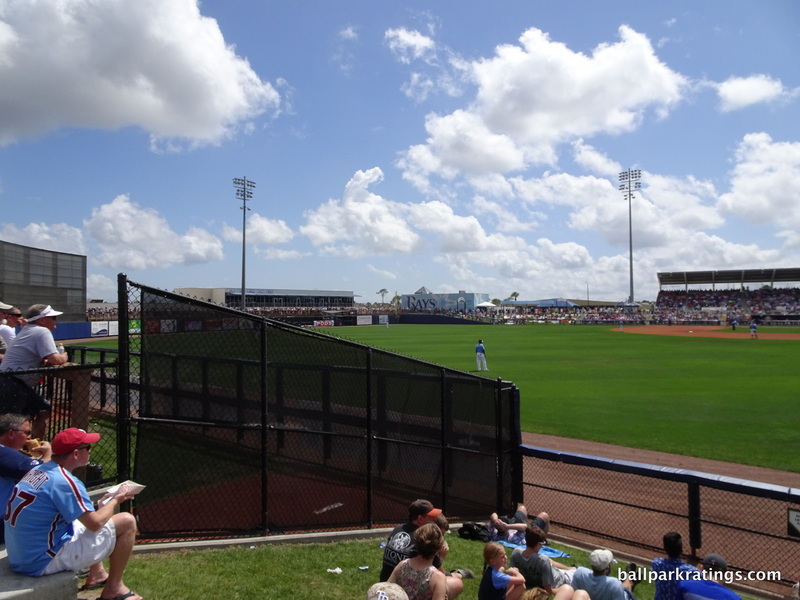 While far from fatal, the setting may be the park’s biggest drawback, although the body of water on the left field side is a nice touch. 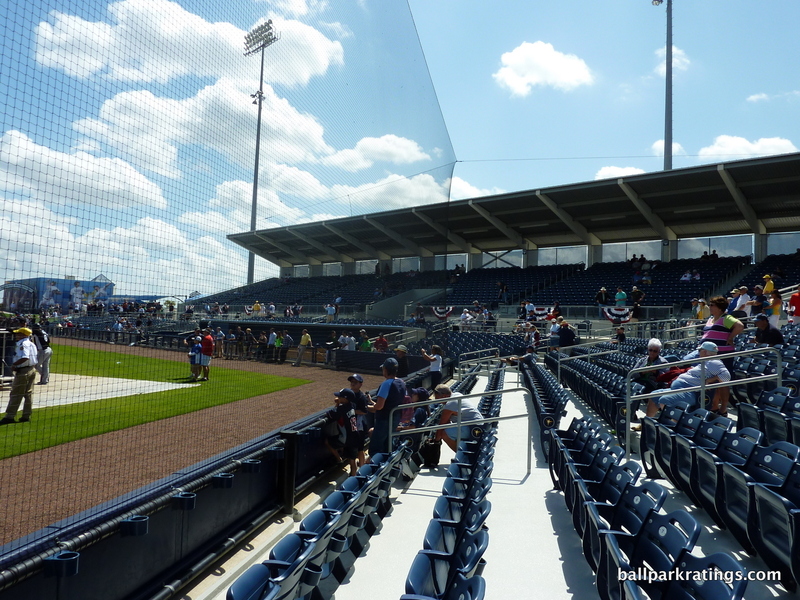 Charlotte Sports Park isn’t quite as outstanding as subsequently renovated ballparks in the Grapefruit League, but it’s a nice facility. 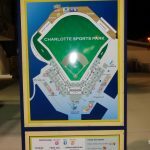 Thankfully, Charlotte Sports Park no longer looks like a rectangular slab of white concrete dropped from the sky, but it’s architecturally unremarkable. 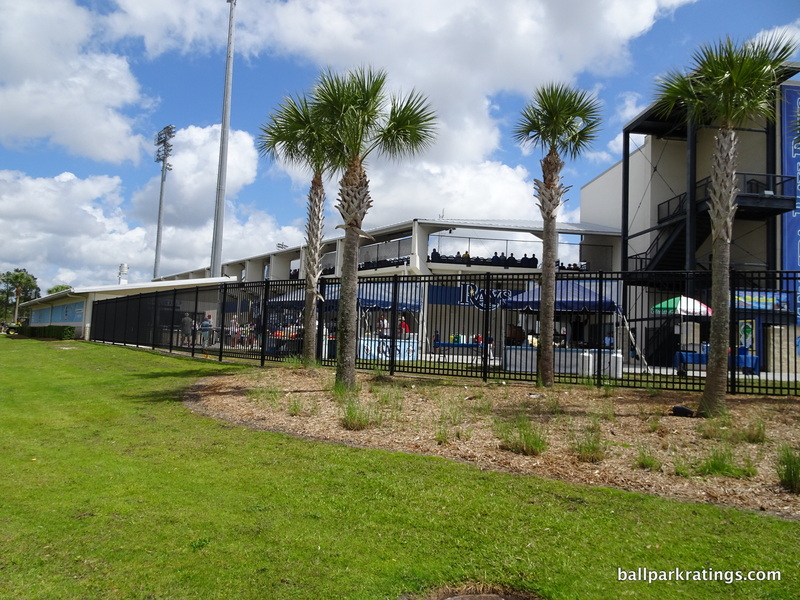 With fencing extended around the perimeter widening the main concourse, there’s not really a traditional exterior “façade,” other than the rather sleek but busy-looking press box behind home plate. 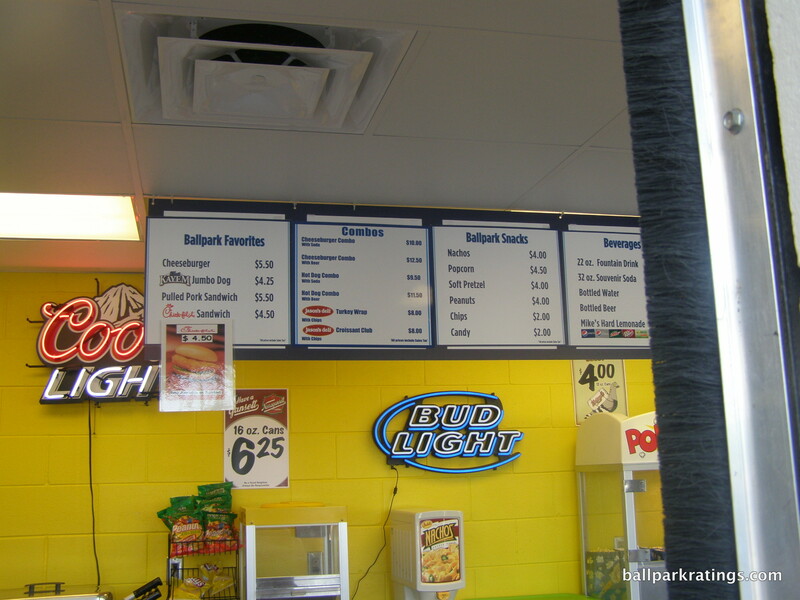 The interior aesthetics are similarly unassuming. 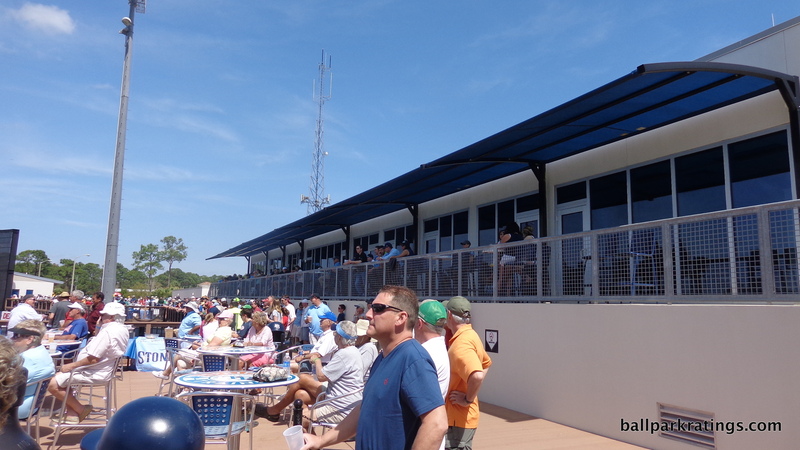 The less-than-desirable angular grandstand was maintained, but so was the intimacy. 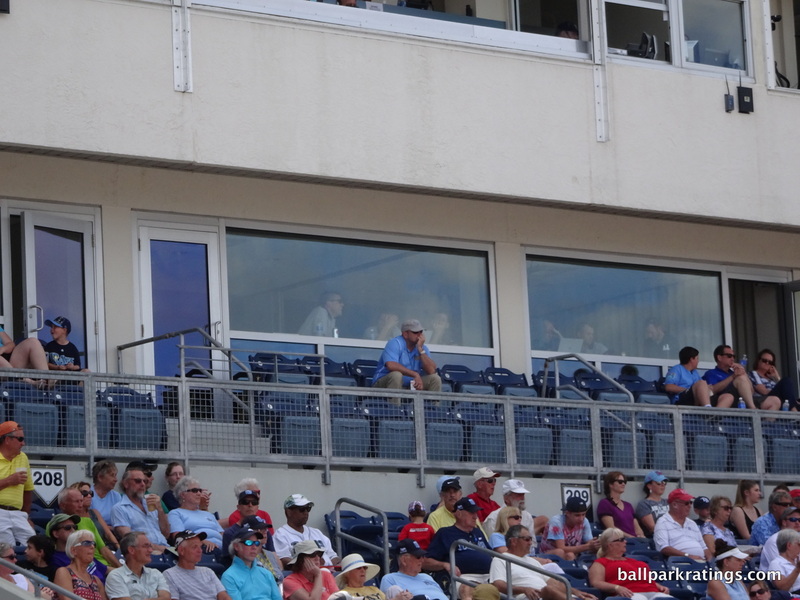 The press box viewed from the inside was also spruced up, but it’s relatively spartan. 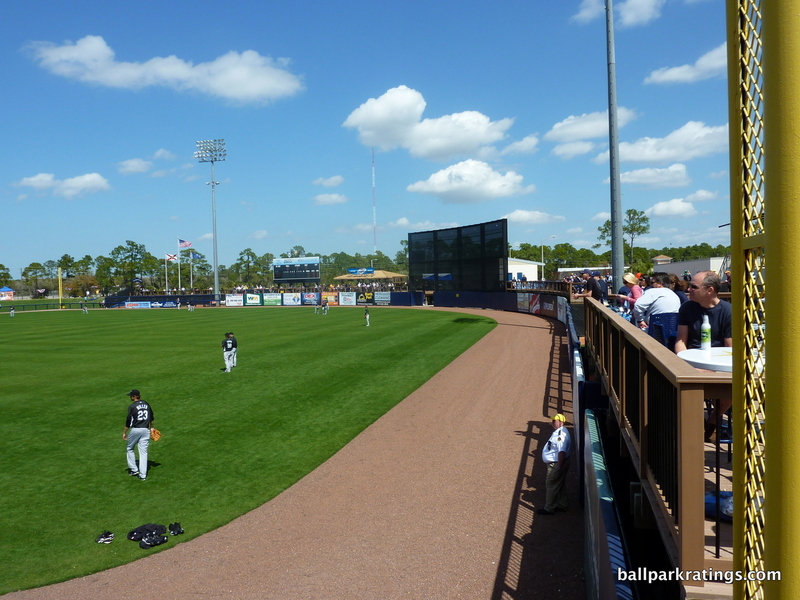 Trees overlooking the left field scene are particularly attractive here. 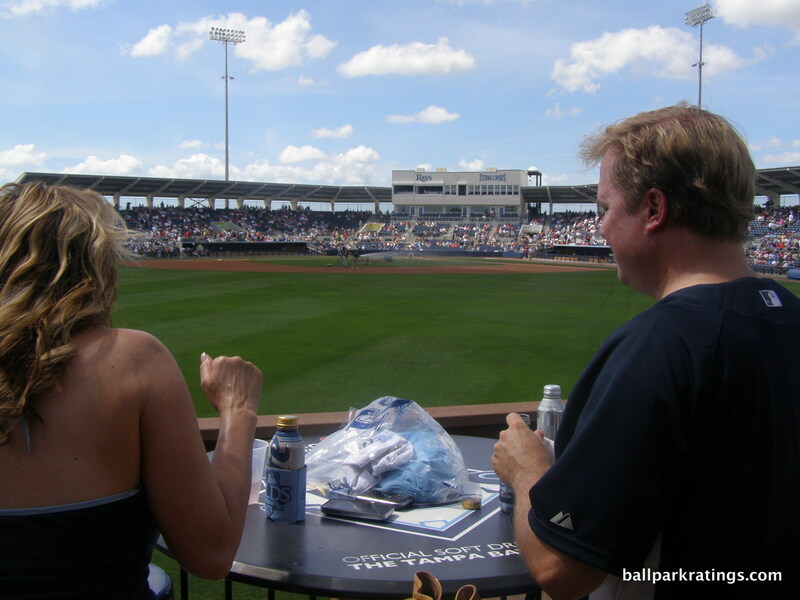 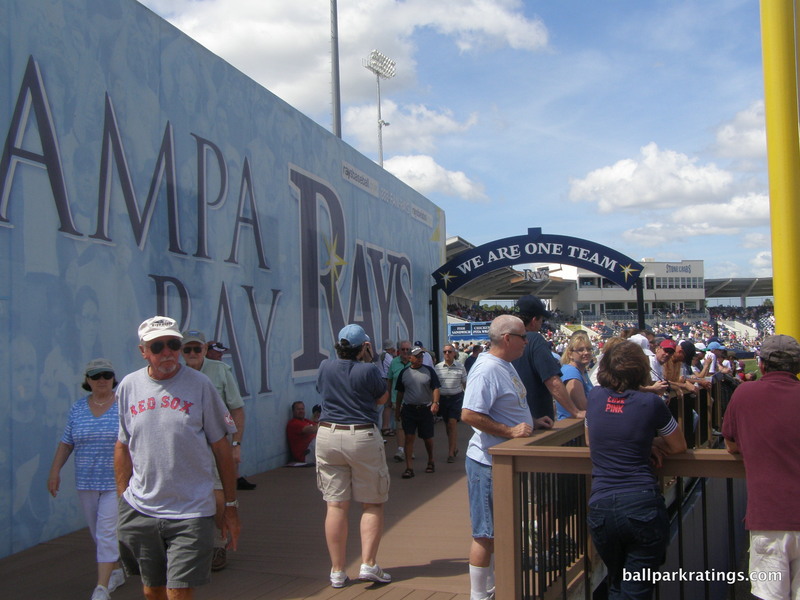 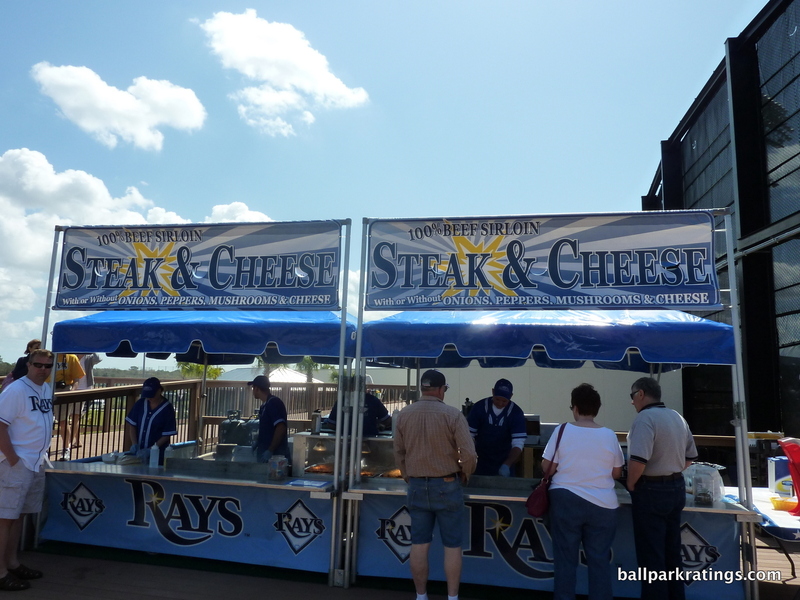 The Rays do a decent job of importing the team’s sensibility from St. Petersburg. 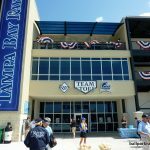 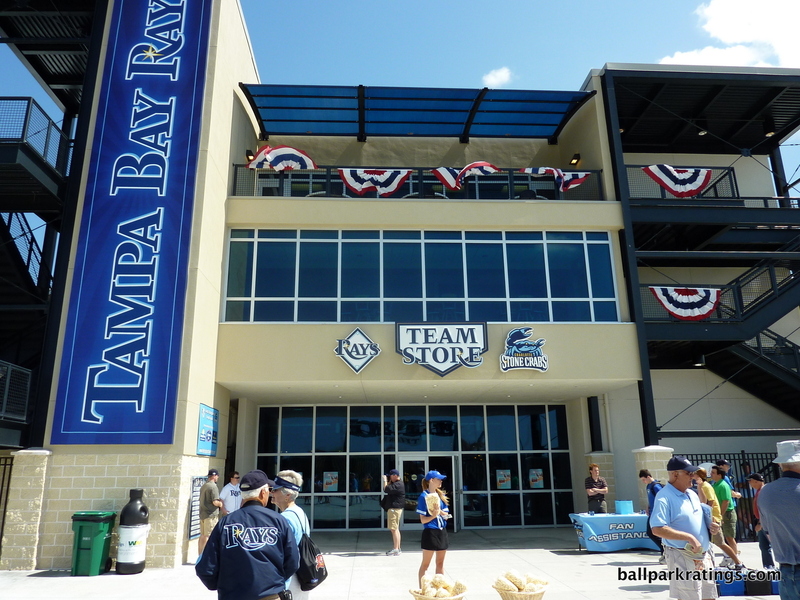 There is plenty of team branding here, as pennant banners are on the clubhouse in right field and posters of team stars adorn concourse facades. 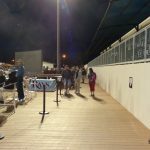 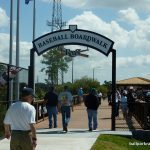 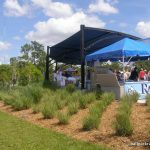 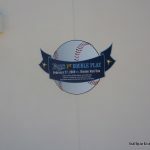 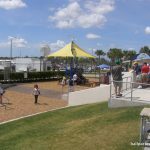 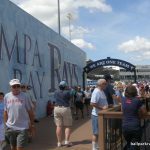 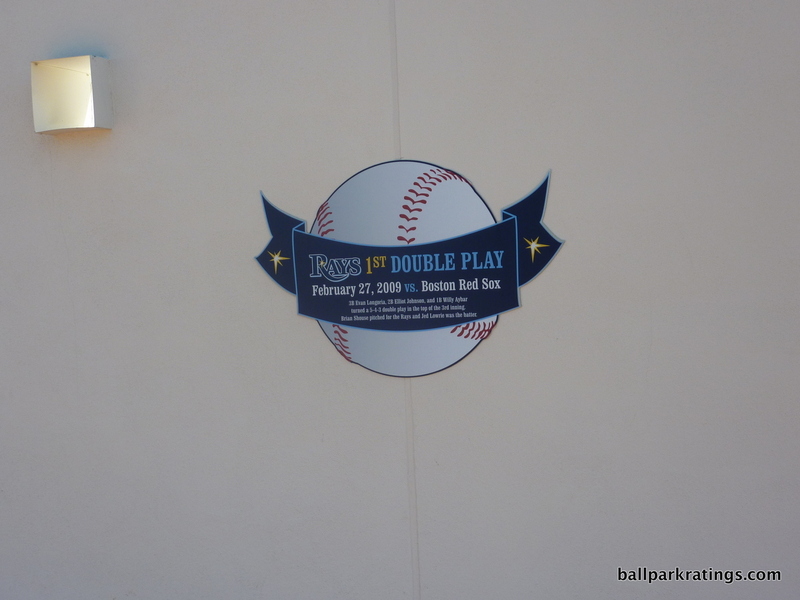 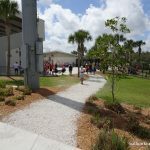 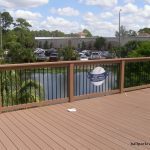 Most thoughtful: the wall backing the boardwalk is fitted with baseball-shaped milestone markers of notable Rays moments in the renovated park’s history. 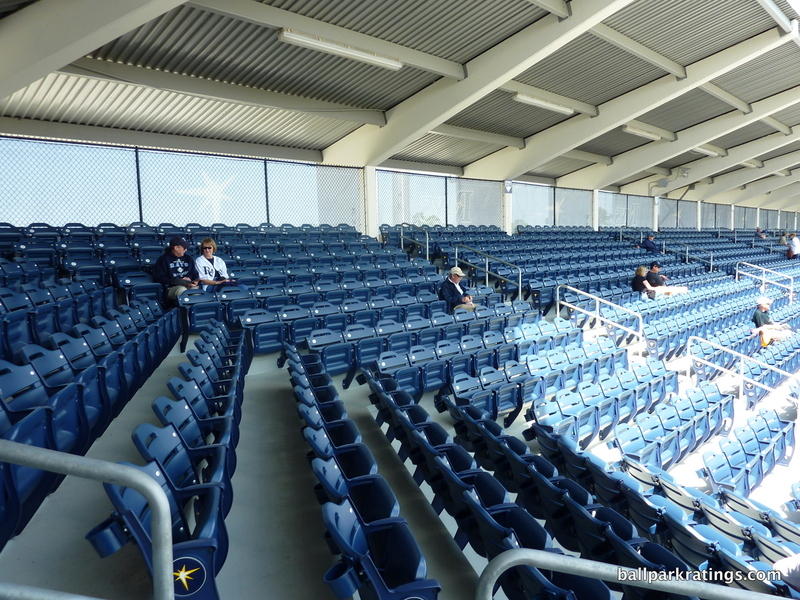 The renovations did wonders for the functionality overall, but the angular grandstand design negatively affects sightlines. 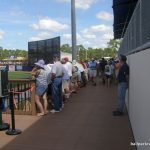 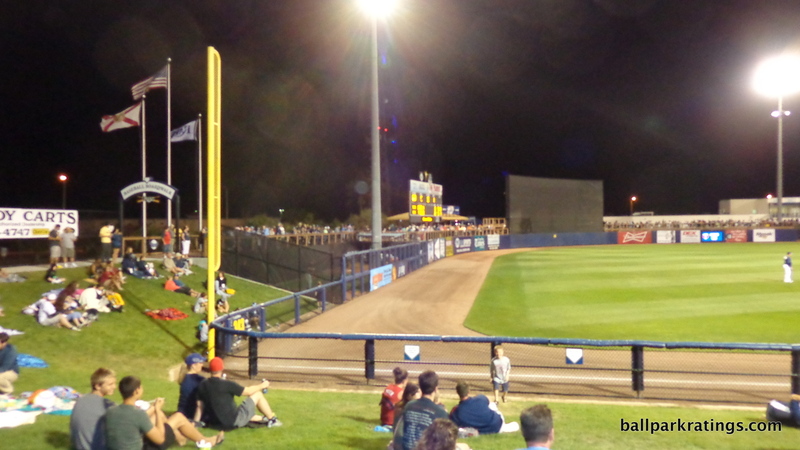 The grandstand is geometrically linear behind home plate, with the backstop extending dugout-to-dugout in a straight line. 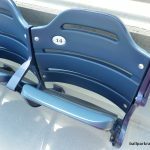 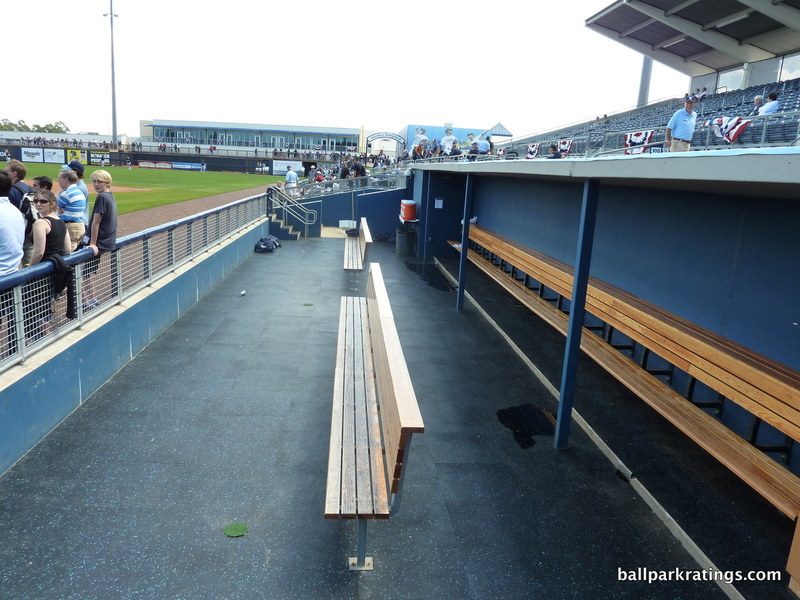 In the corners around home plate, the seats are not oriented properly. 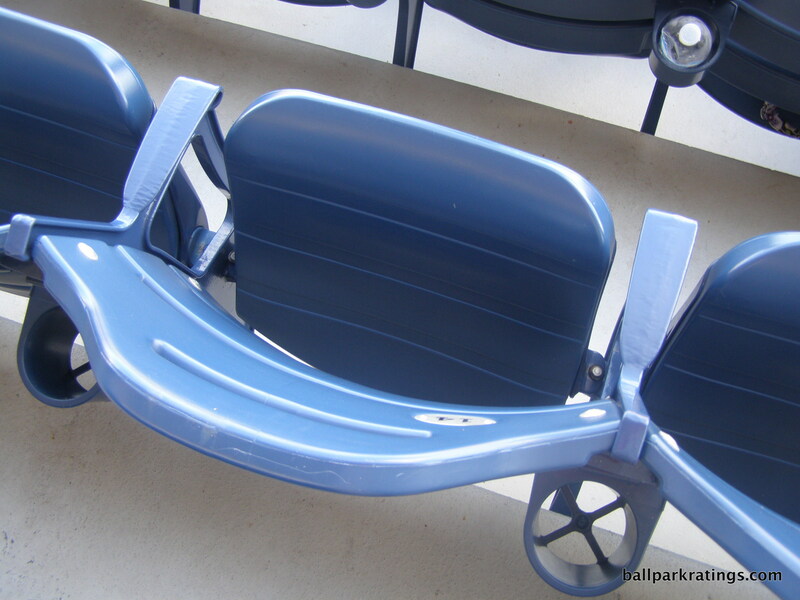 On the plus side, all new seats have sufficient space and are fitted with cupholders. 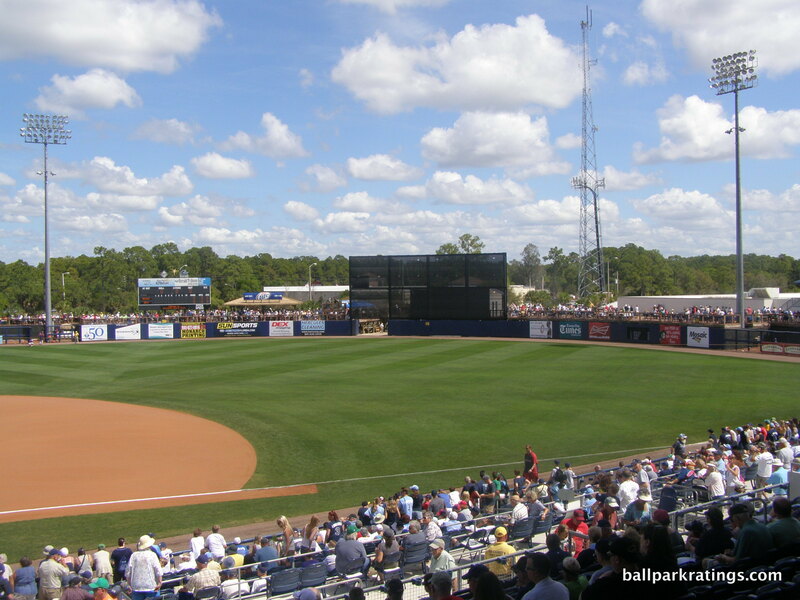 A new videoboard was added in 2017, well after the initial renovations. 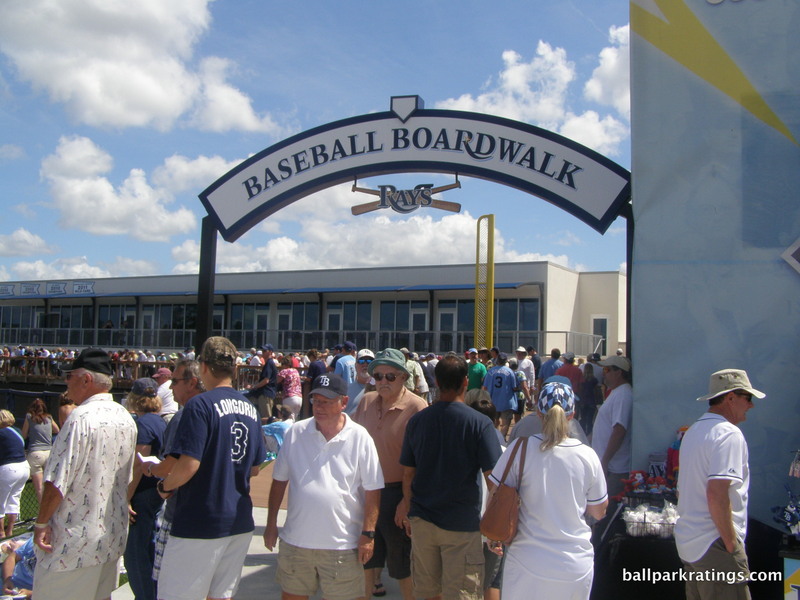 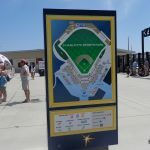 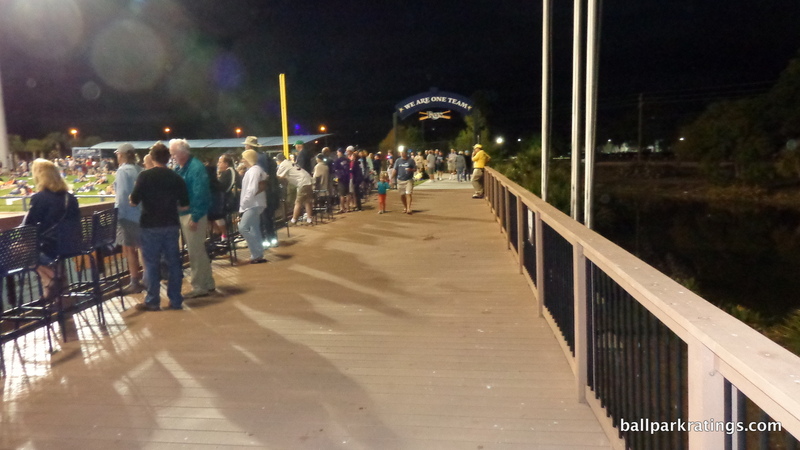 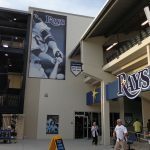 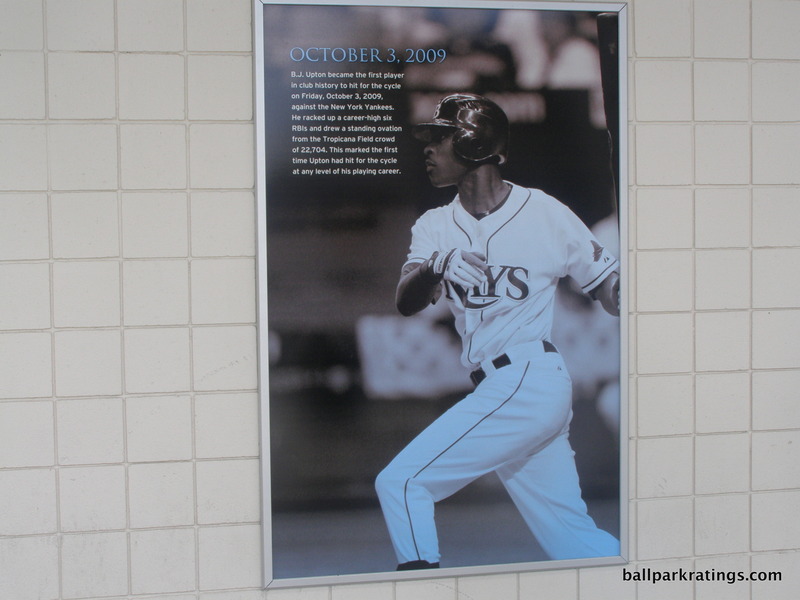 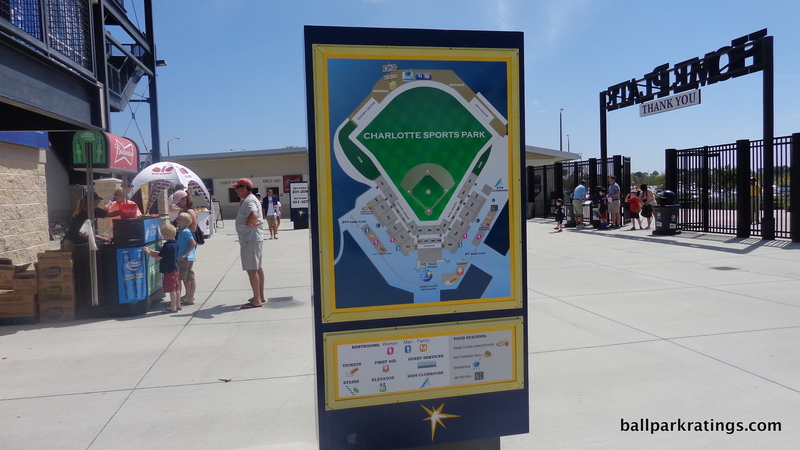 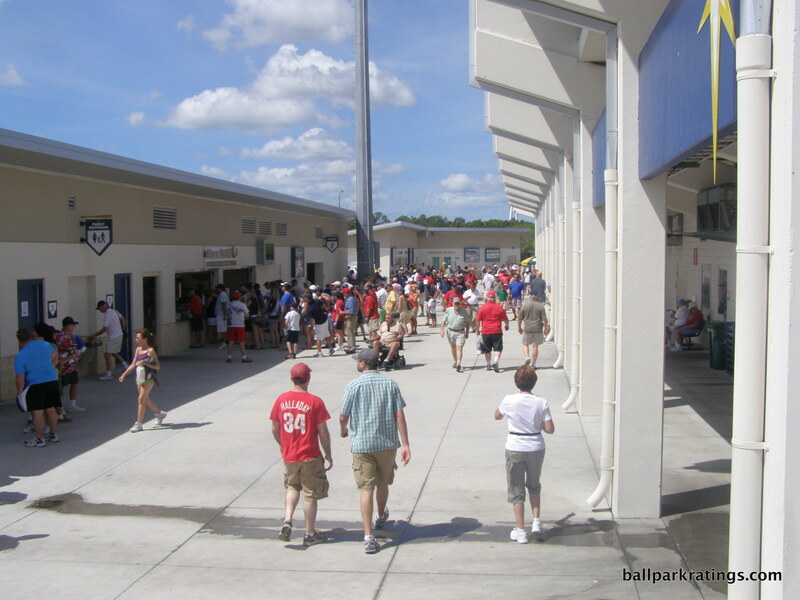 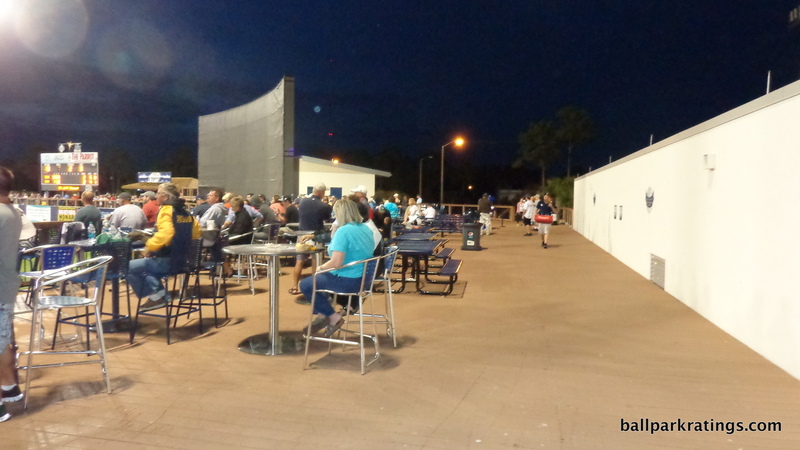 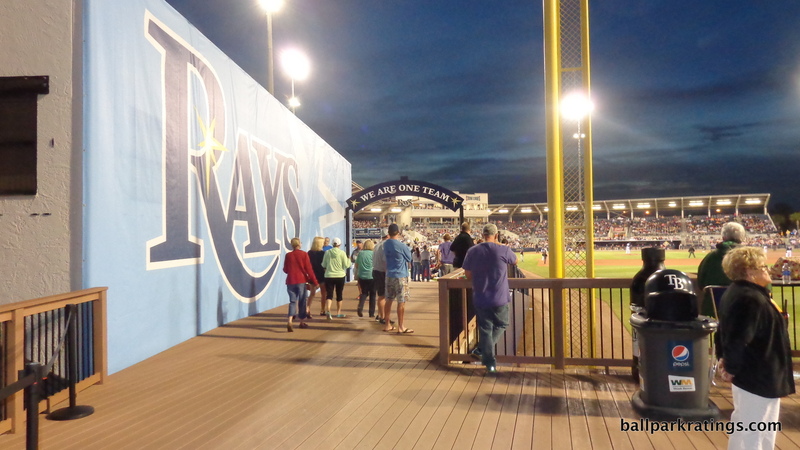 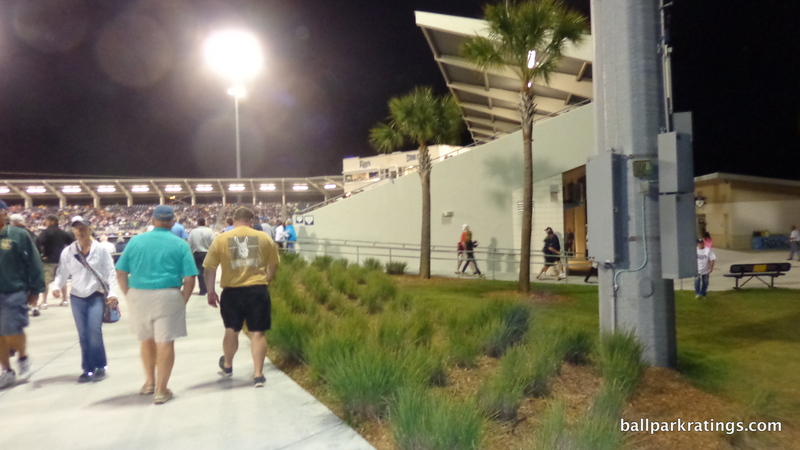 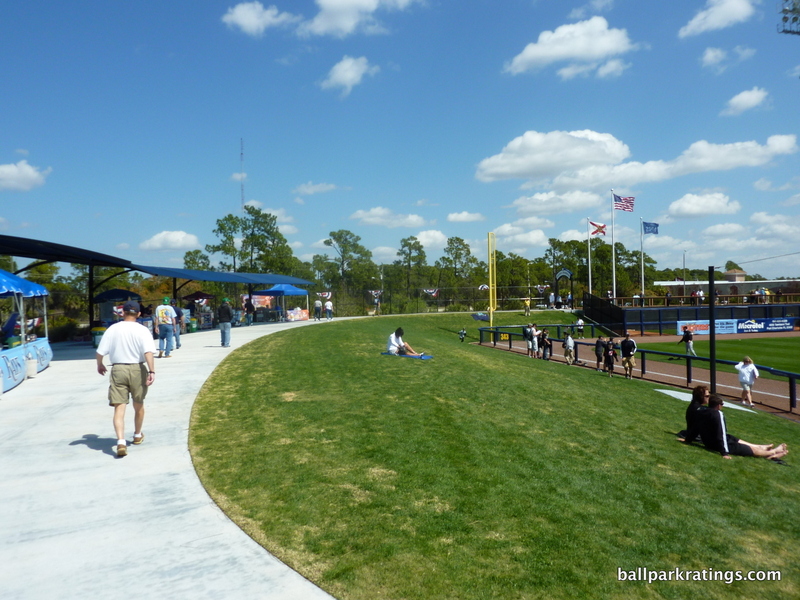 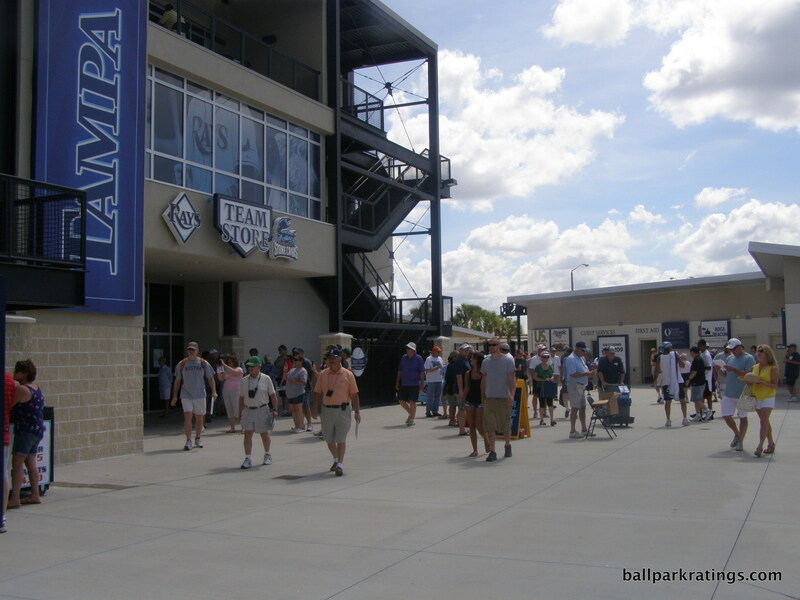 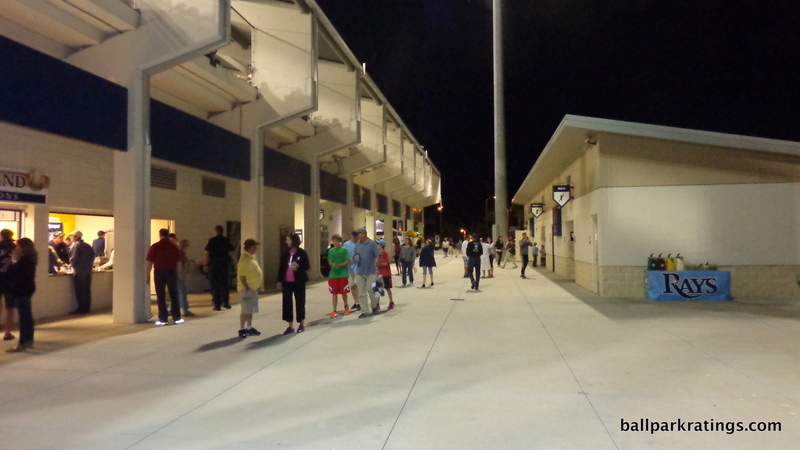 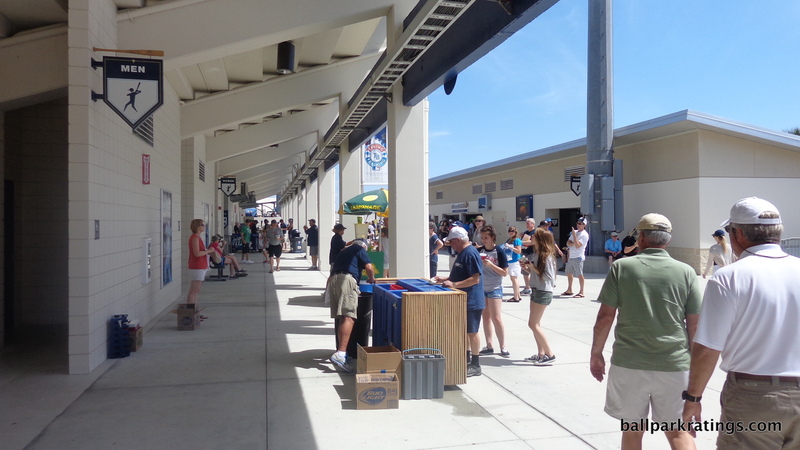 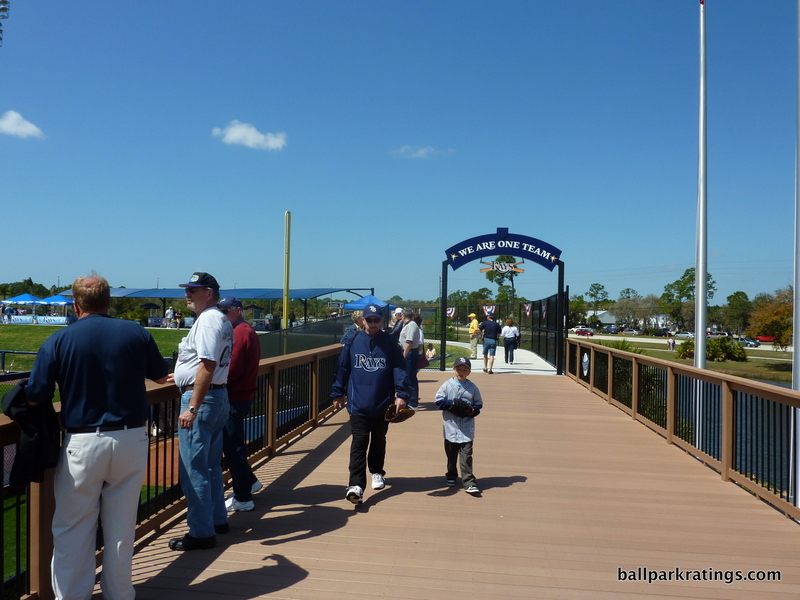 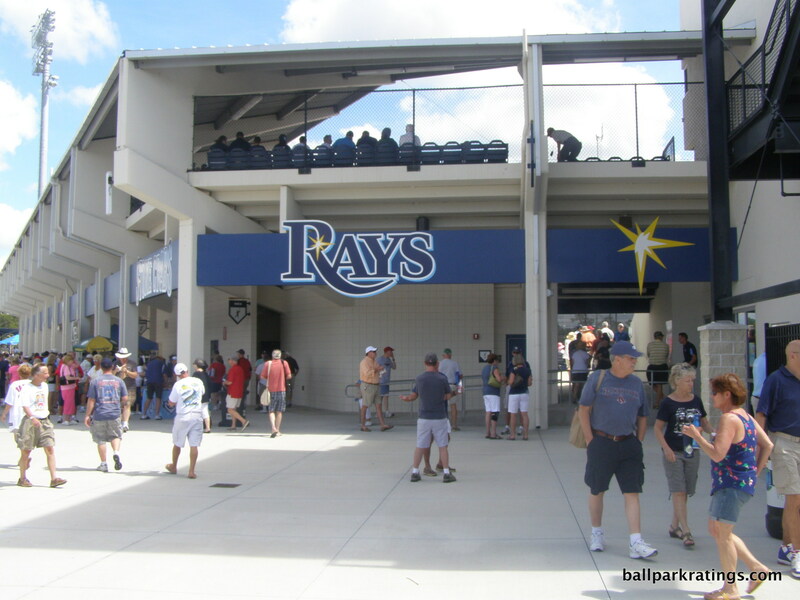 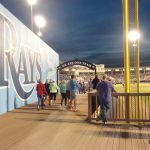 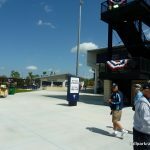 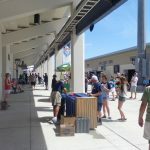 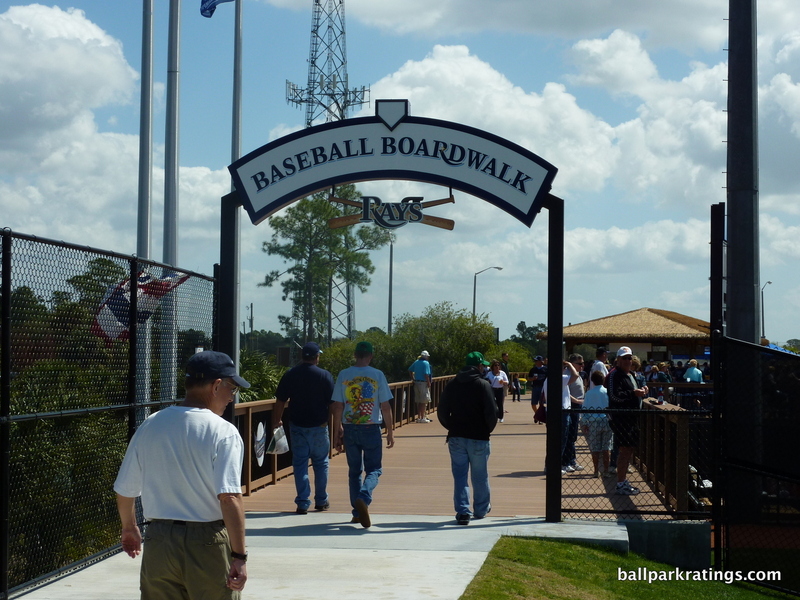 Charlotte Sports Park’s signature feature is the outfield portion of its 360-degree main concourse system, dubbed the “boardwalk.” While outfield concourses were common in Arizona, not many Grapefruit League ballparks had them prior to 2009, so the Rays made a pretty big deal of it. 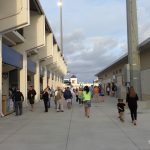 The street level main concourse is sufficient in width, and unlike some of the successors, transitioning from the main concourse to the boardwalk is relatively seamless without vertical discontinuities. 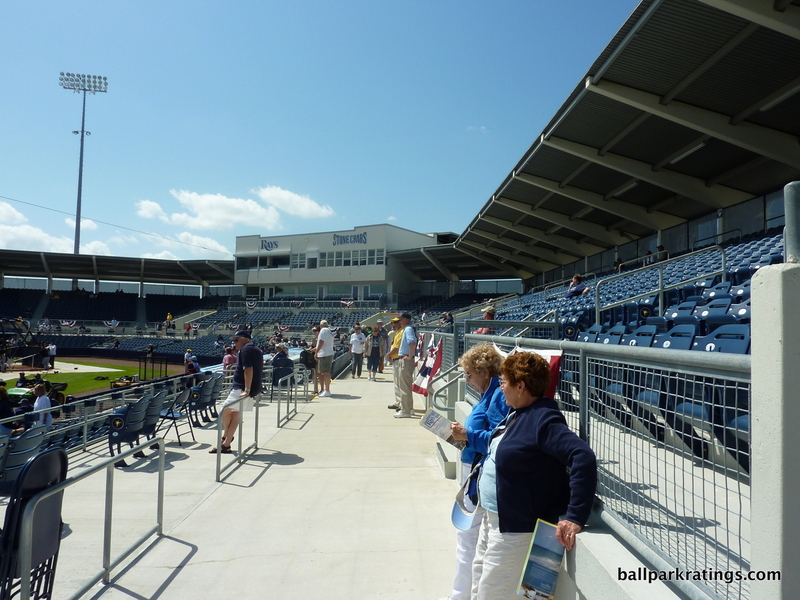 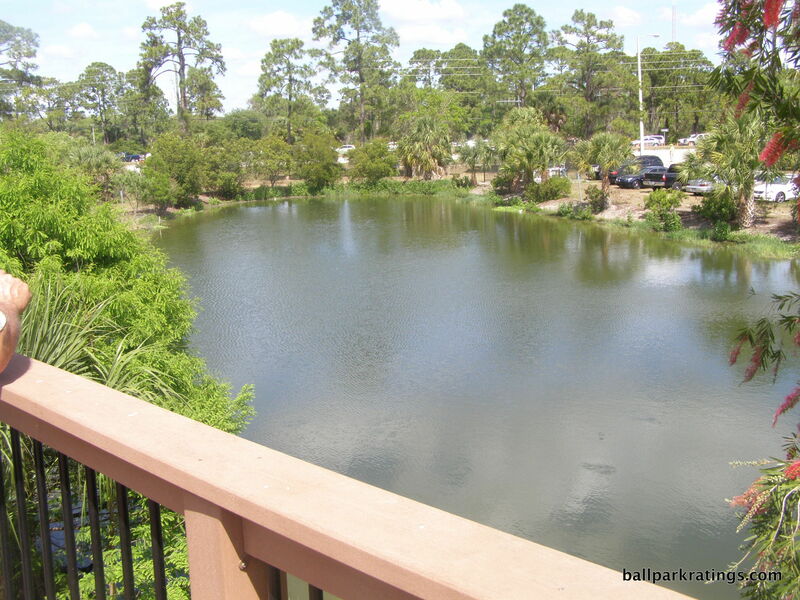 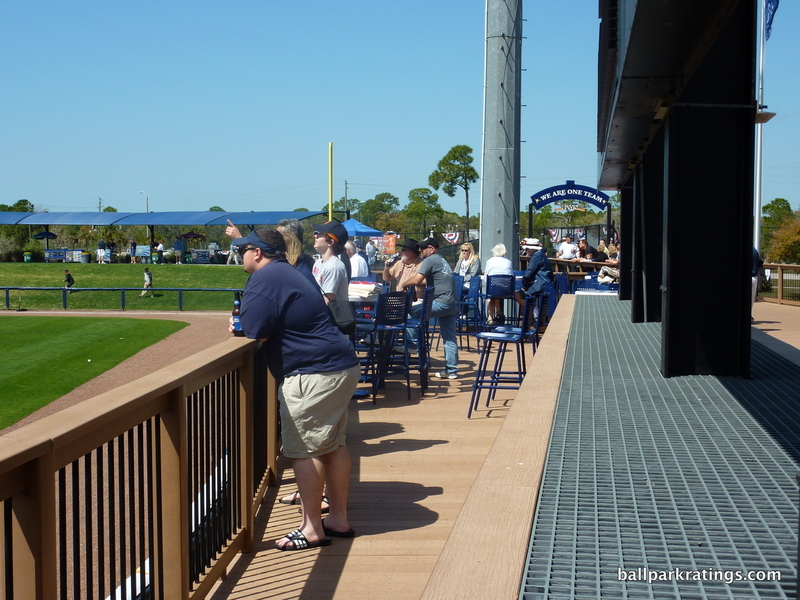 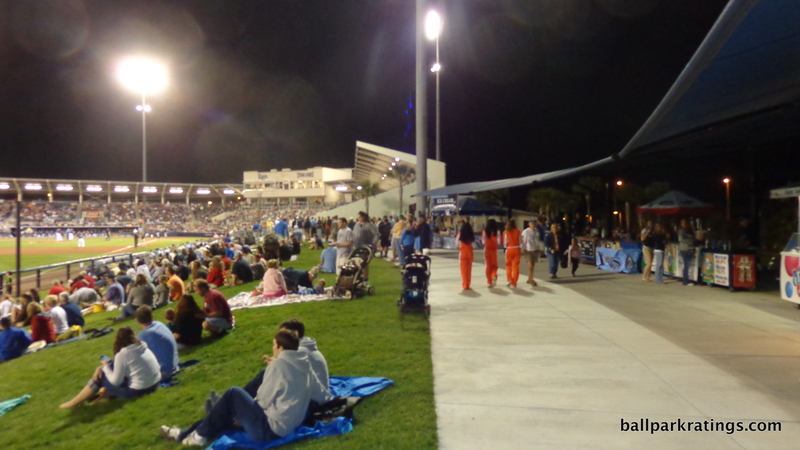 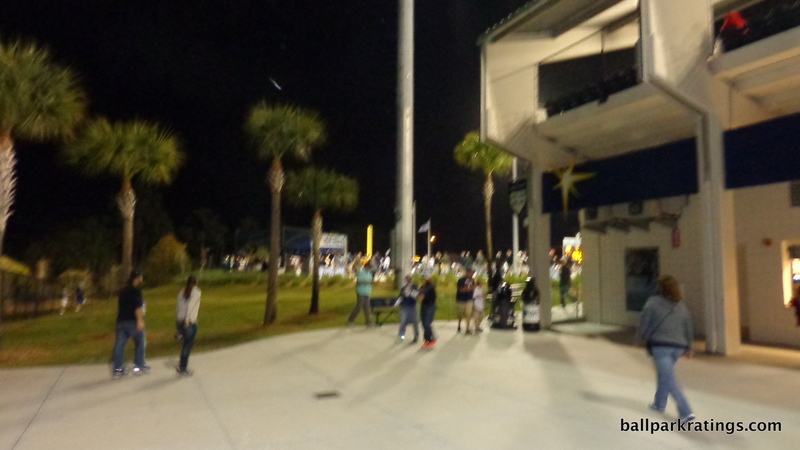 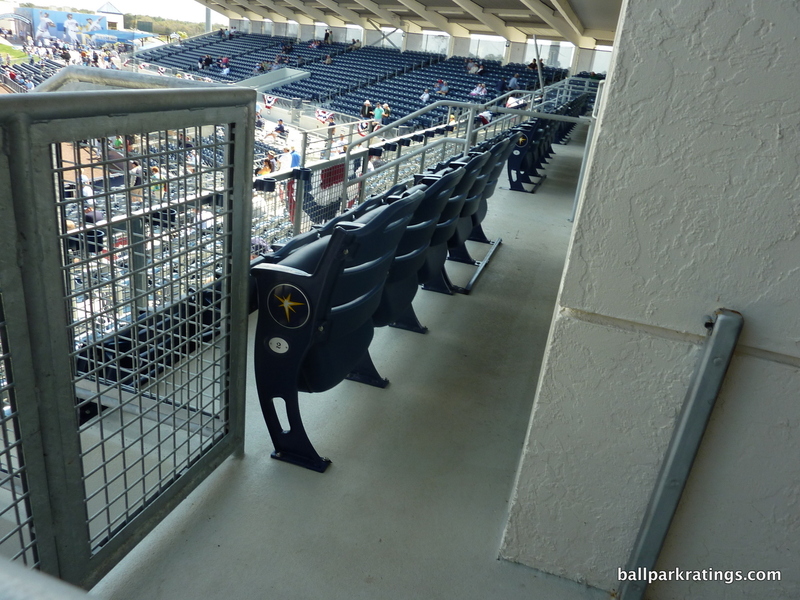 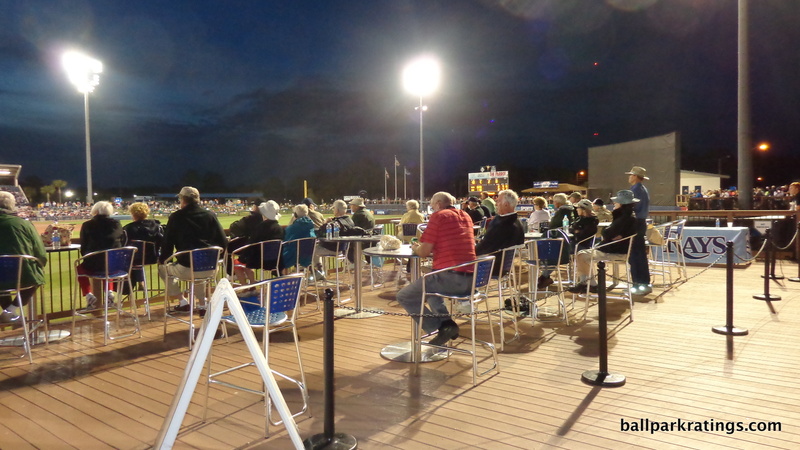 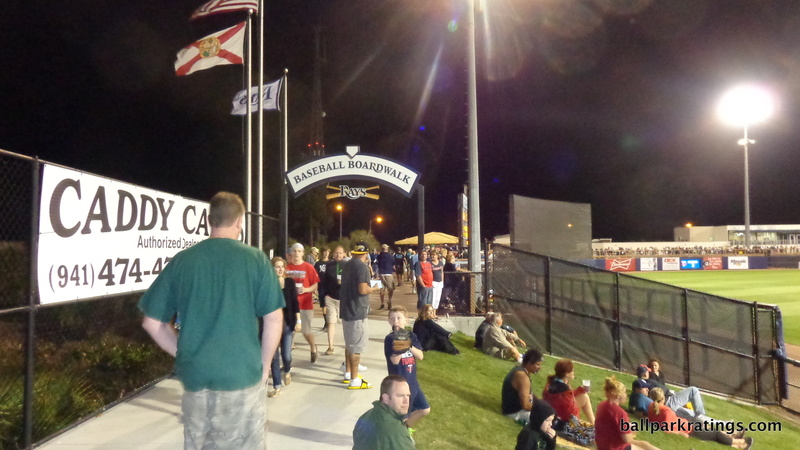 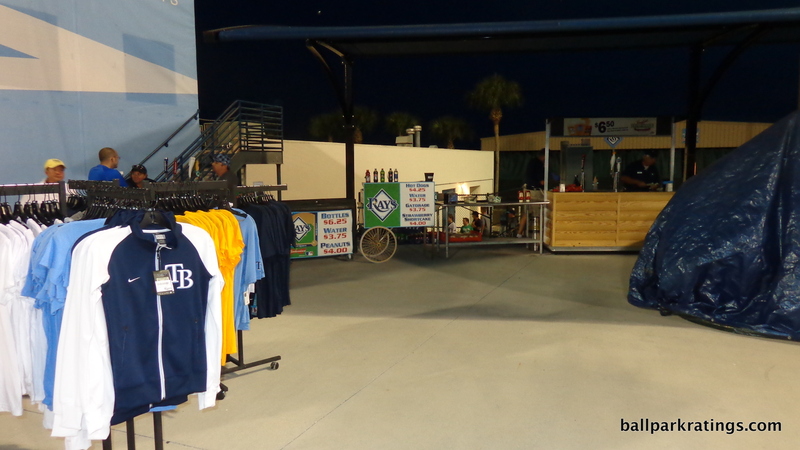 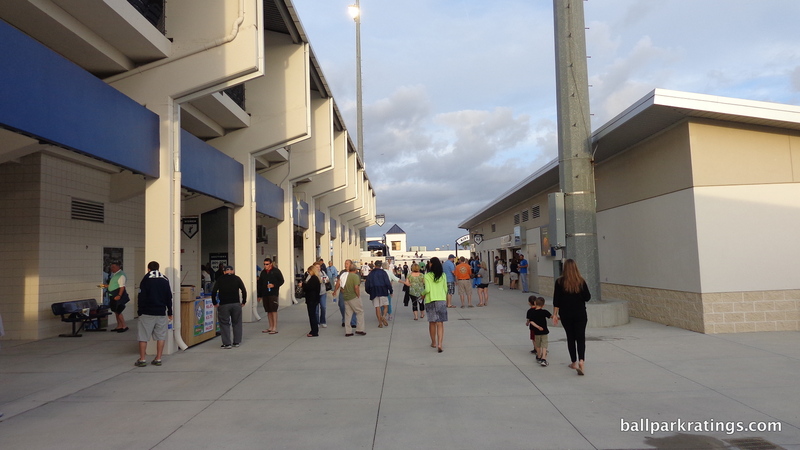 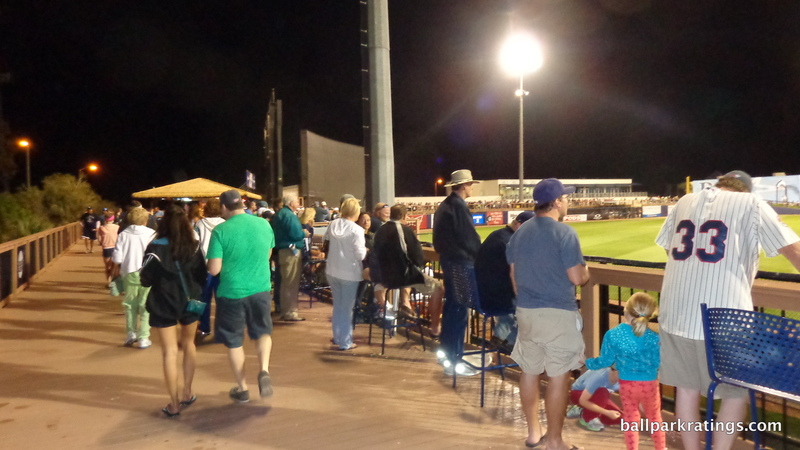 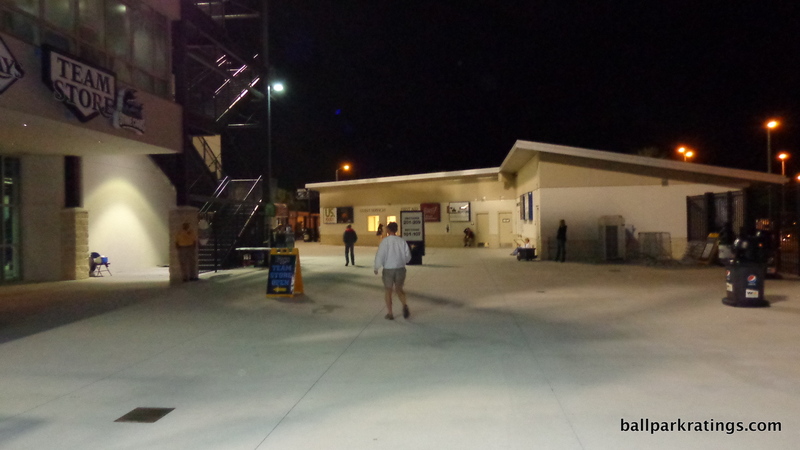 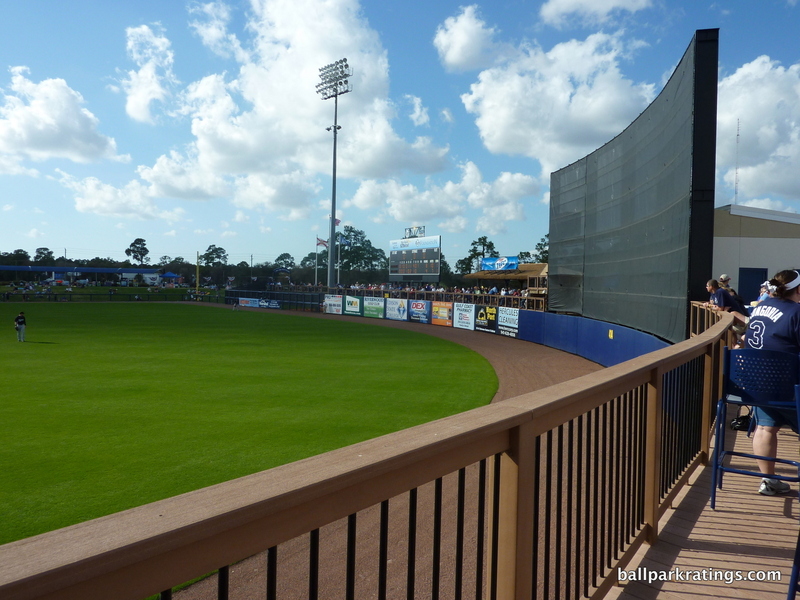 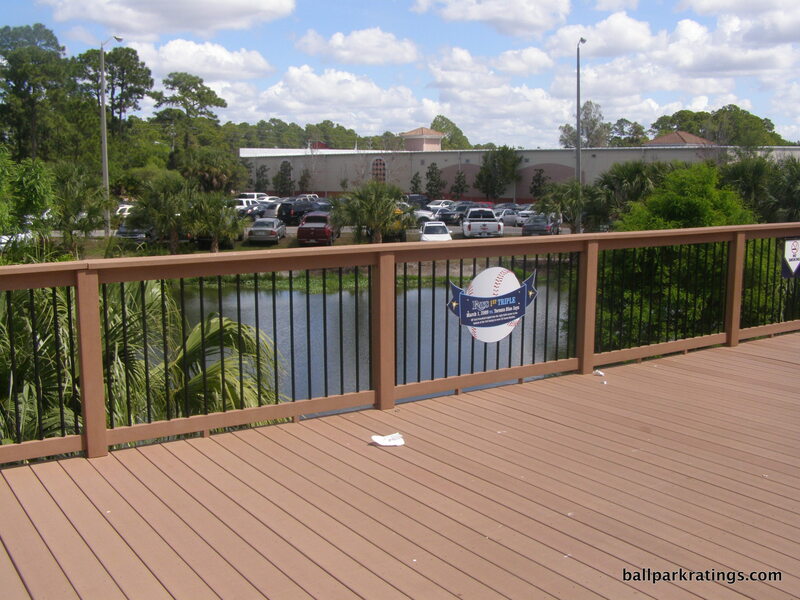 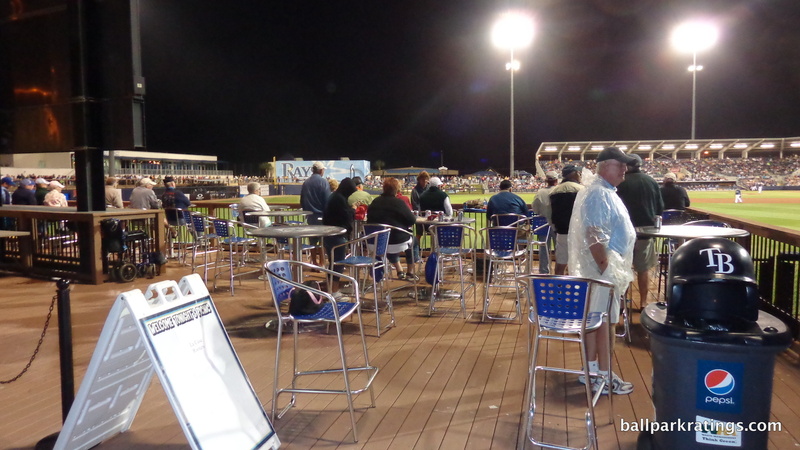 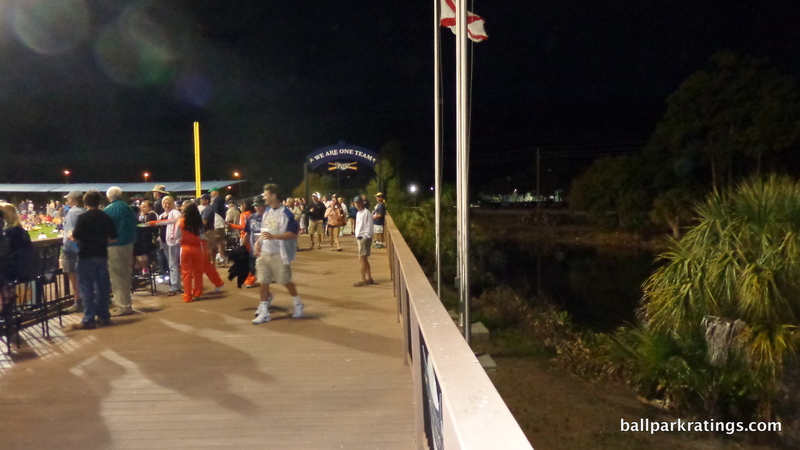 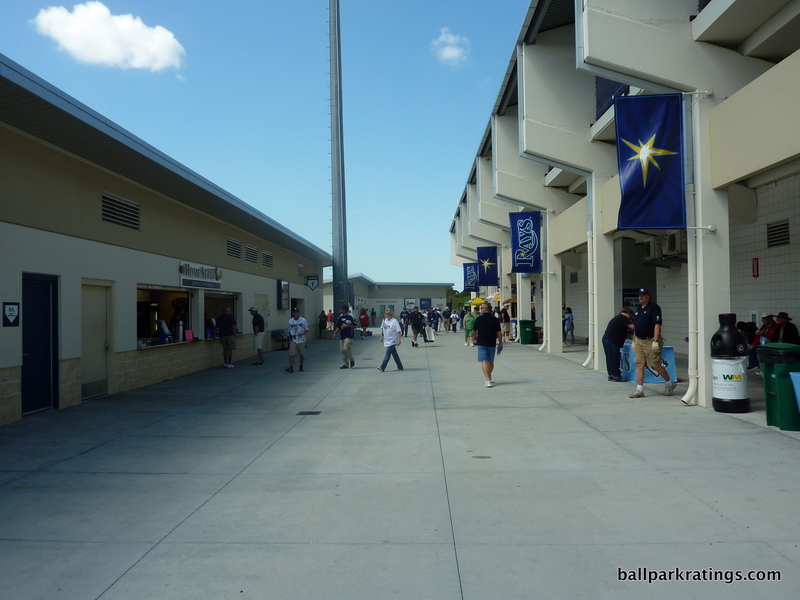 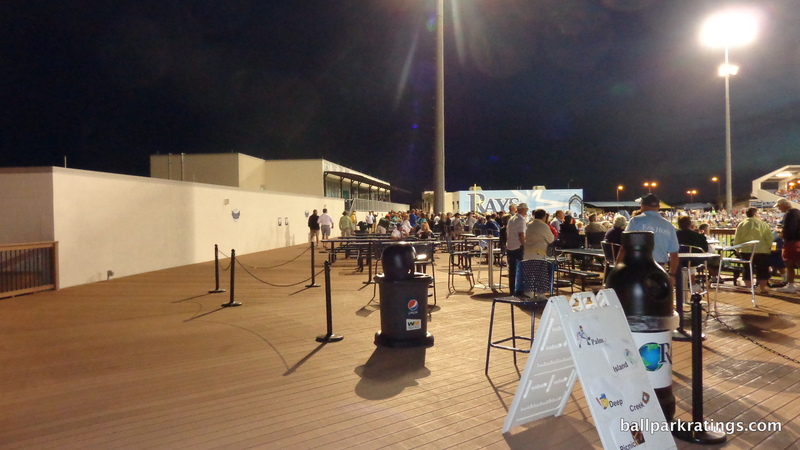 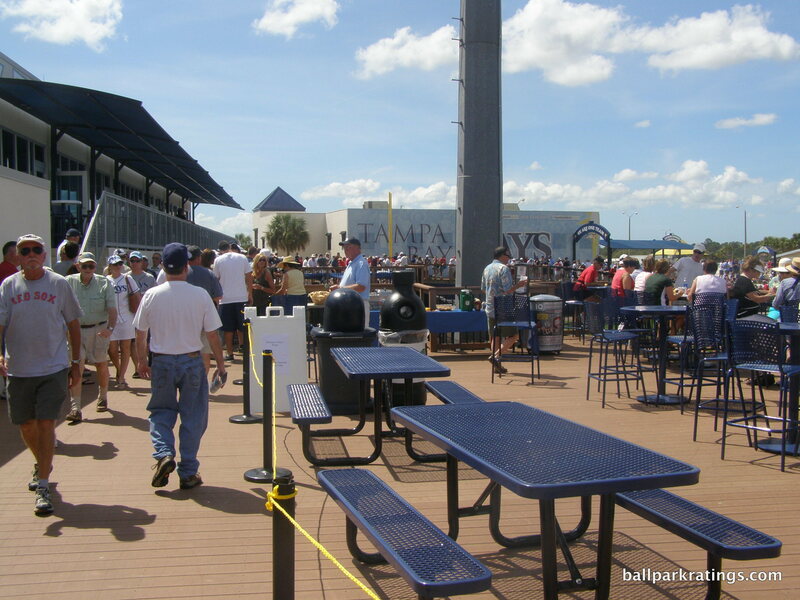 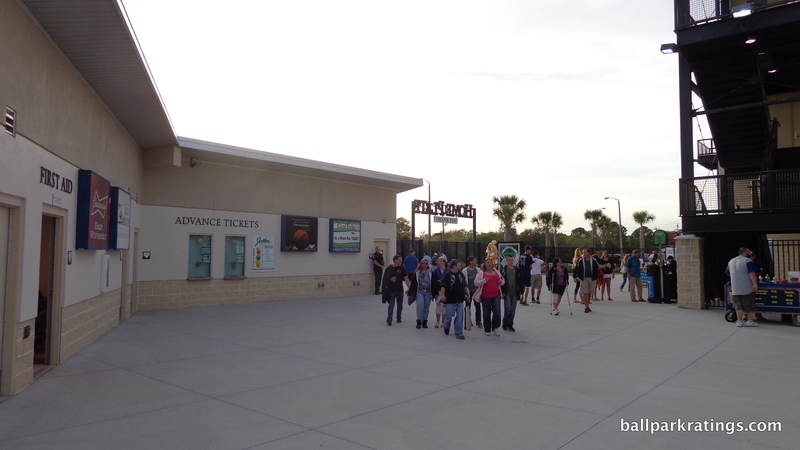 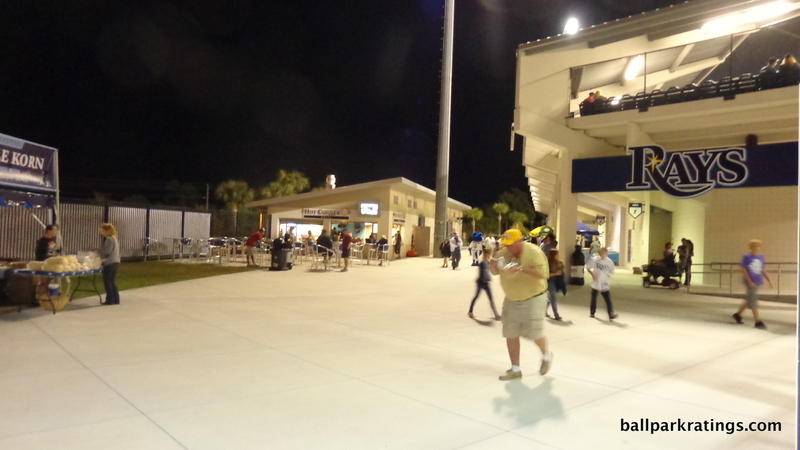 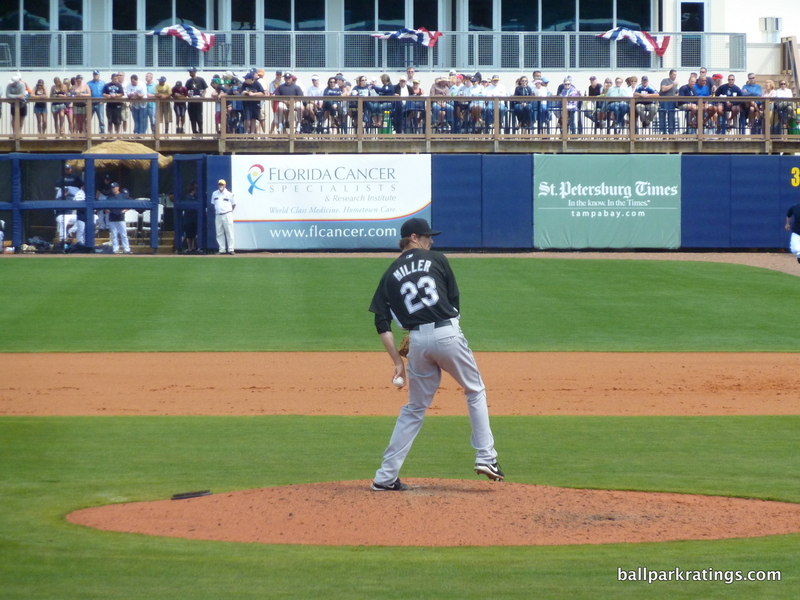 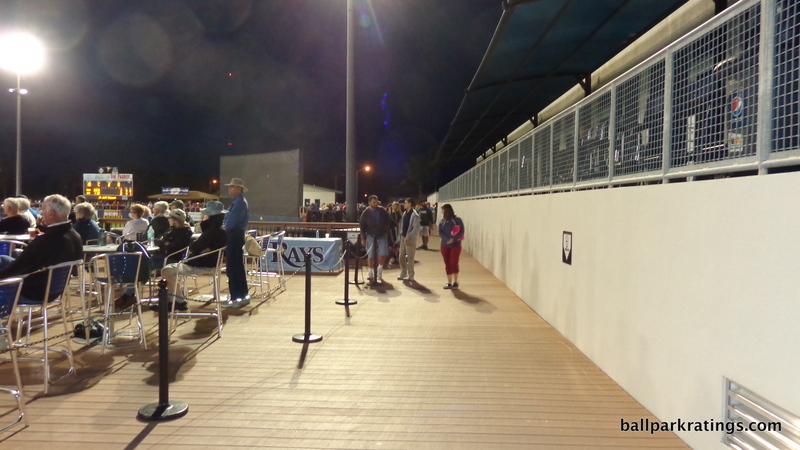 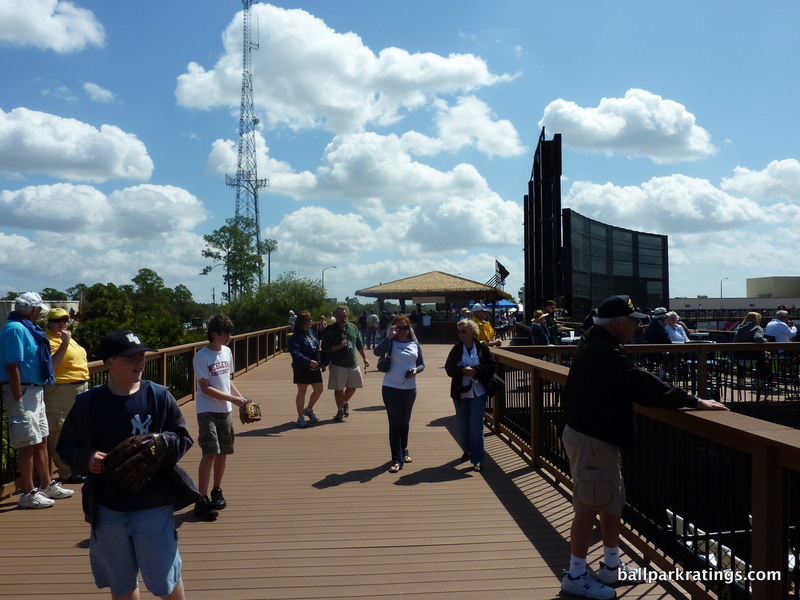 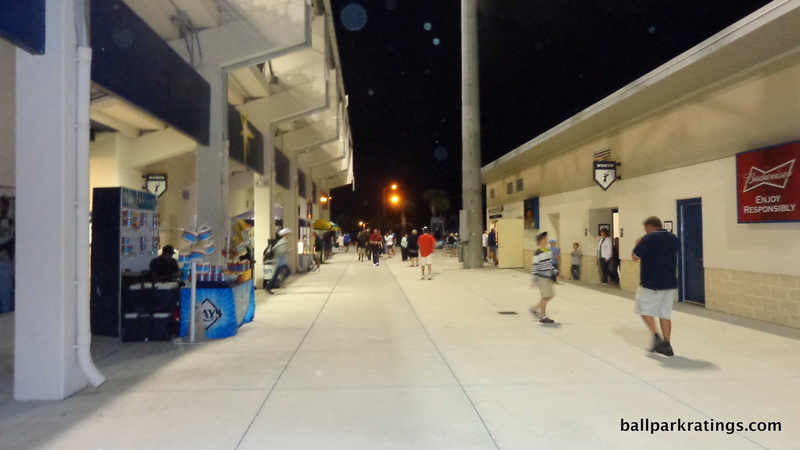 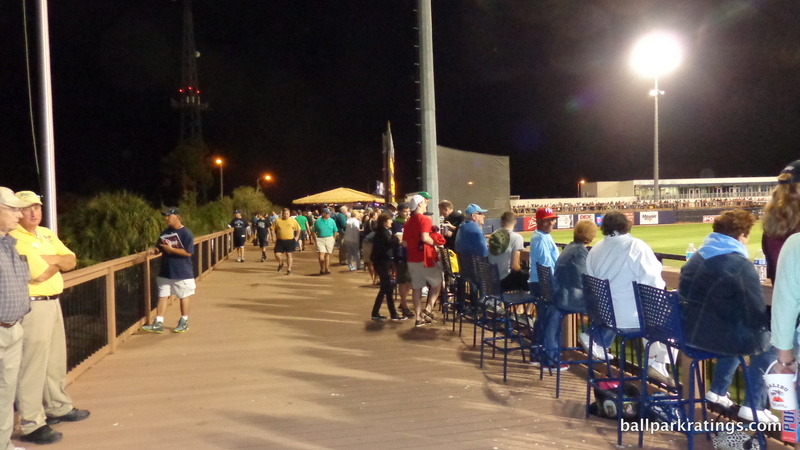 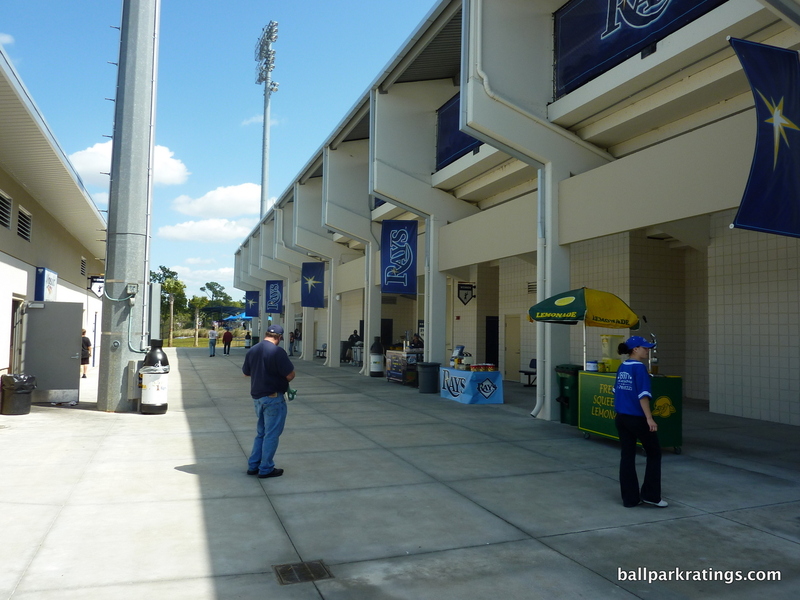 The boardwalk space is mostly adequate, although it could stand to be a bit wider beyond right field. 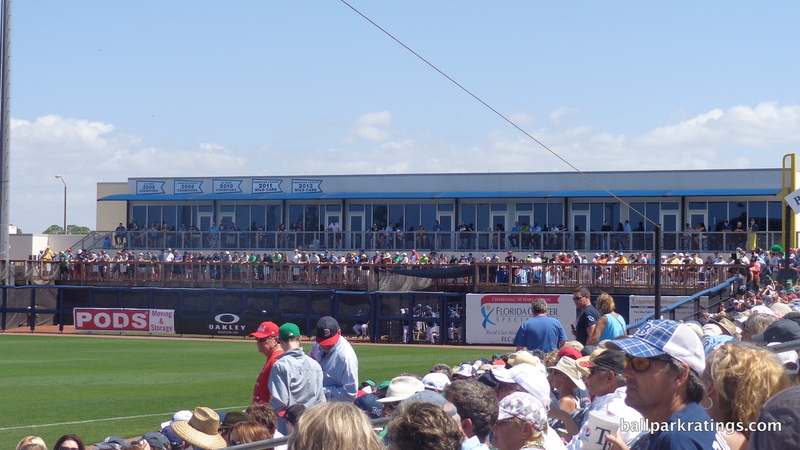 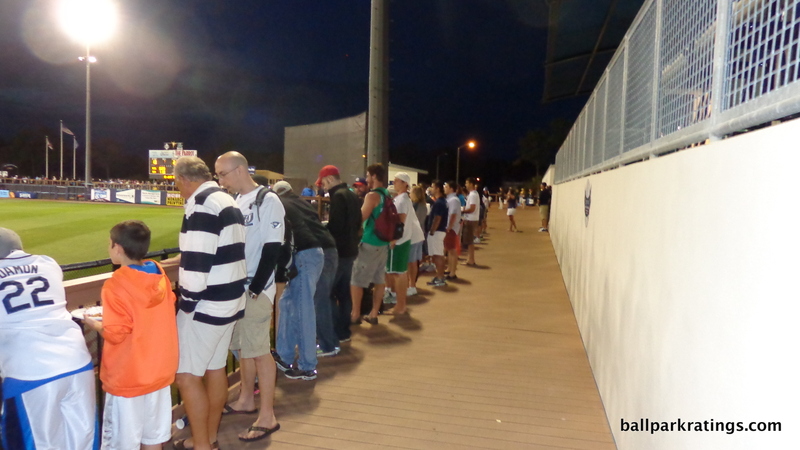 While the main concourse is closed to the field, there are plenty of great standing room areas in the outfield. 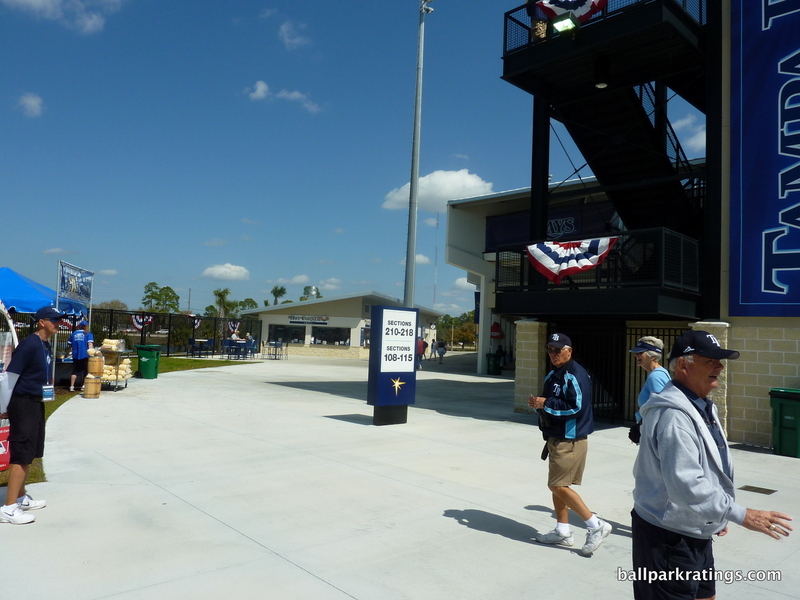 There is no accessible 200-level concourse here like at some of the better renovated parks. 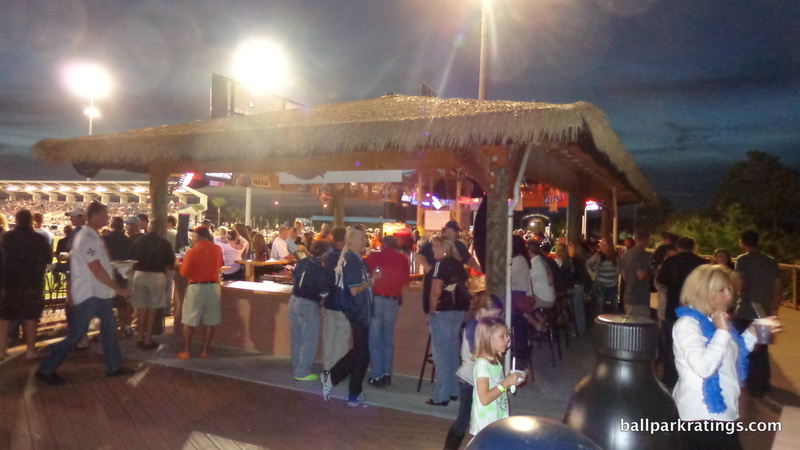 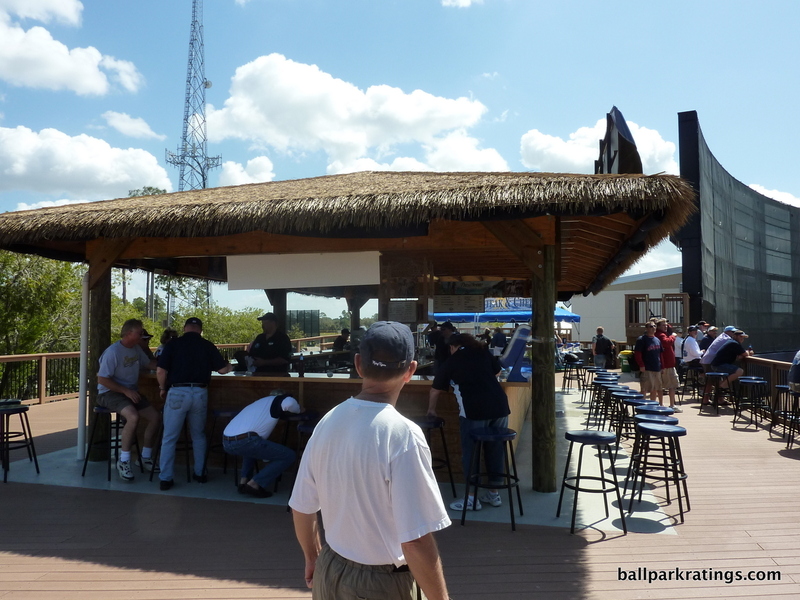 Tiki Bar at Charlotte Sports Park. 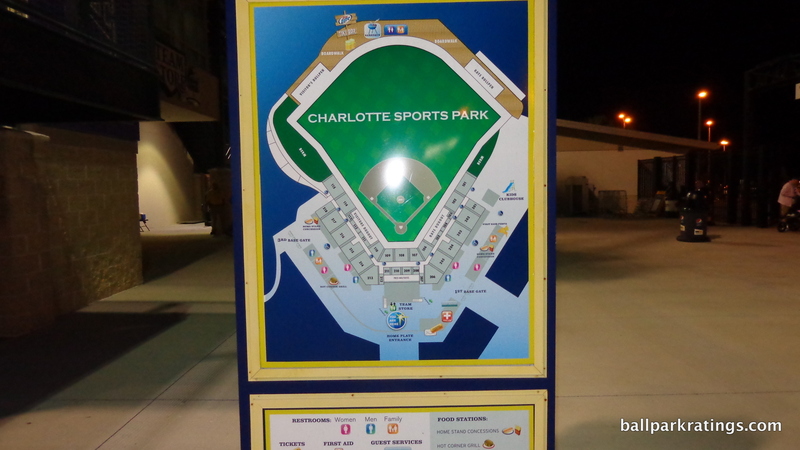 Charlotte Sports Park sports average but solid amenities, even if they don’t quite reach the level of the parks subsequently renovated in Florida or the newer ones in Arizona. 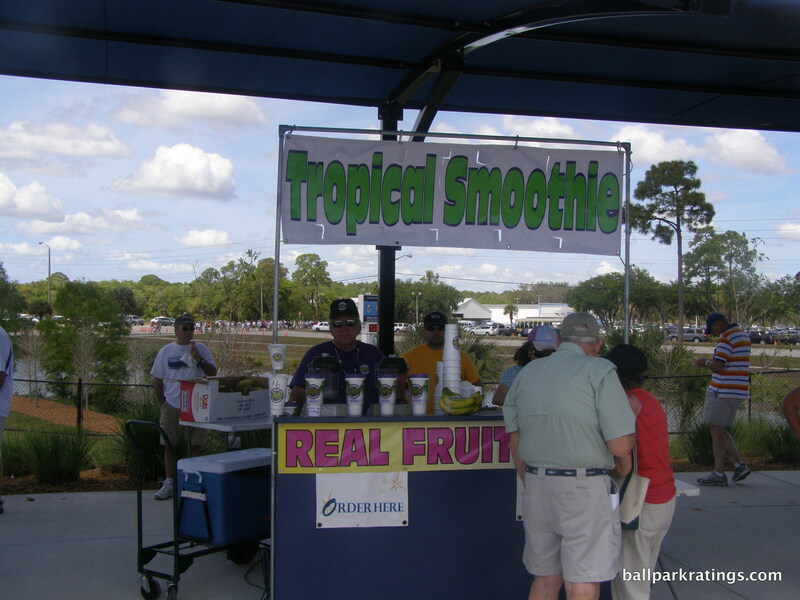 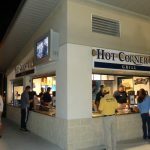 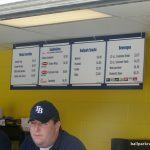 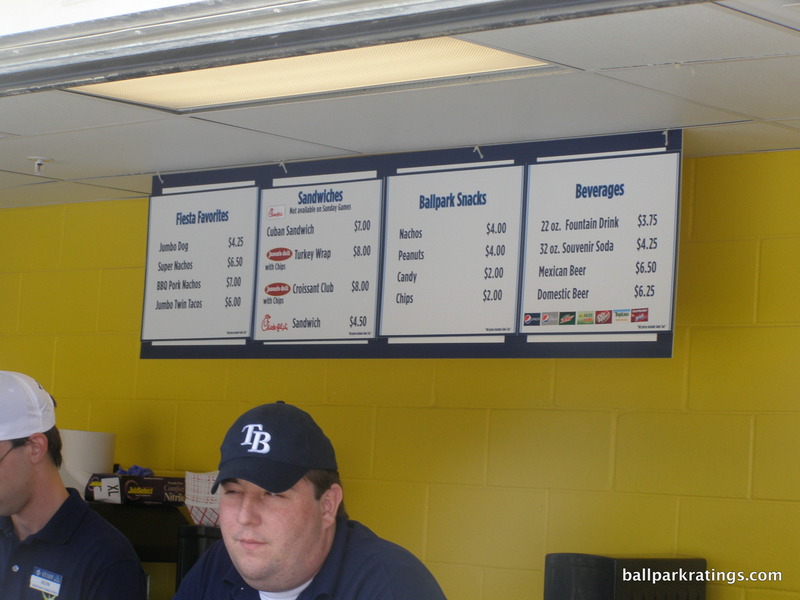 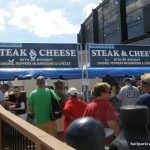 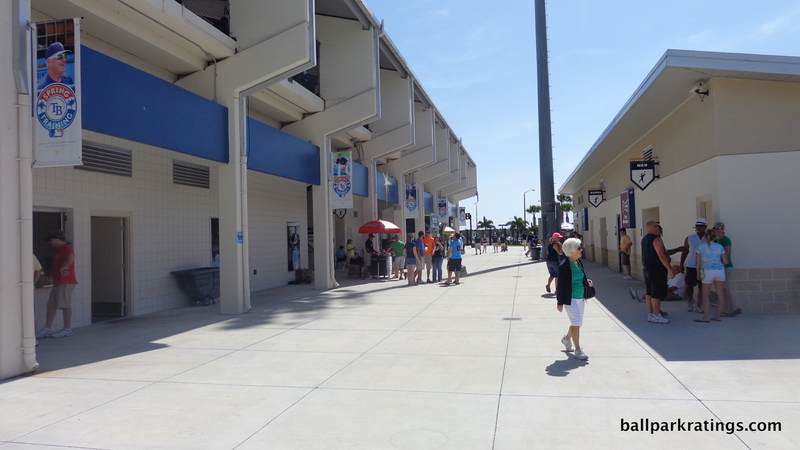 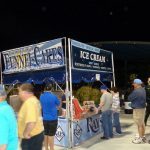 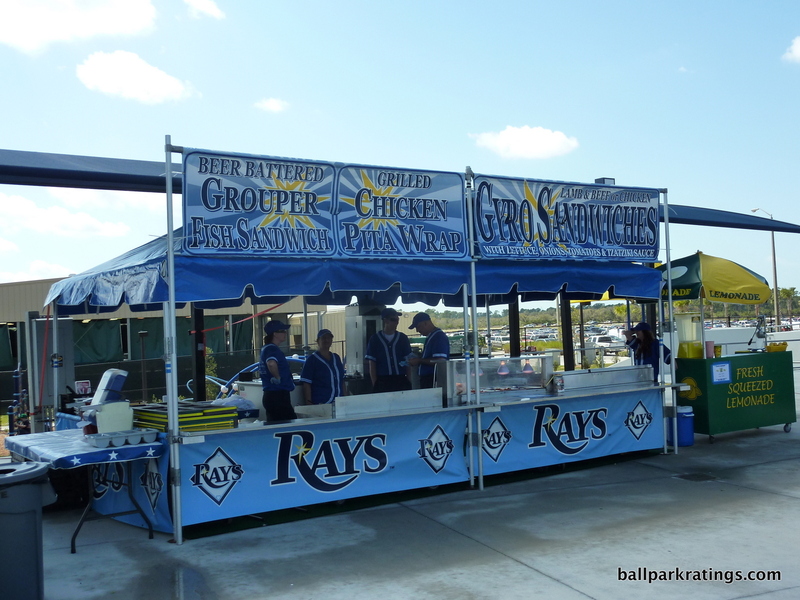 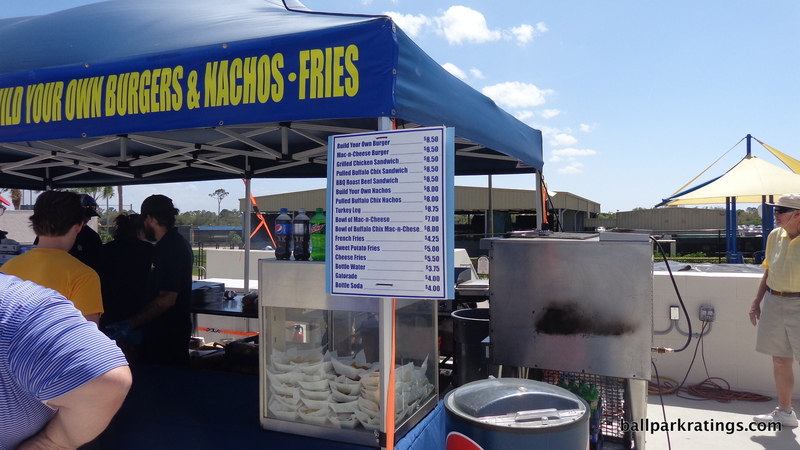 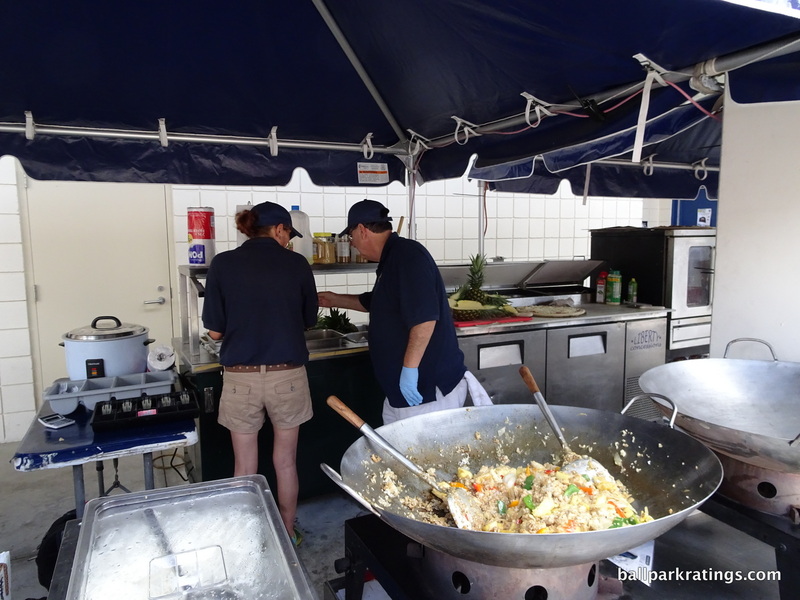 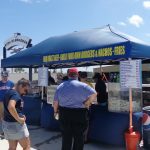 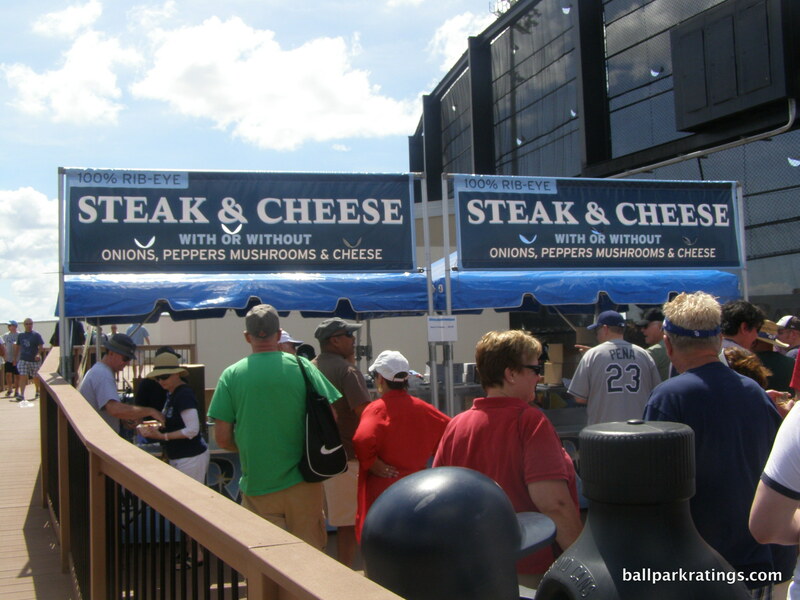 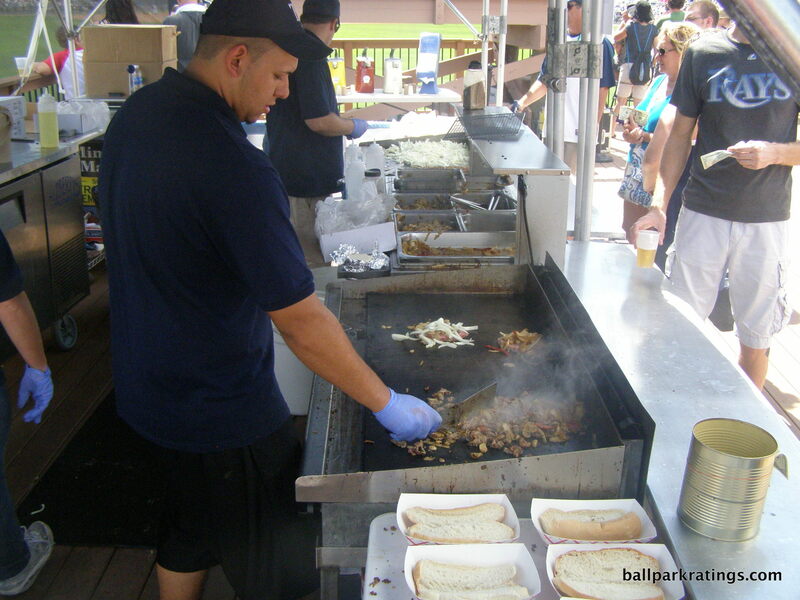 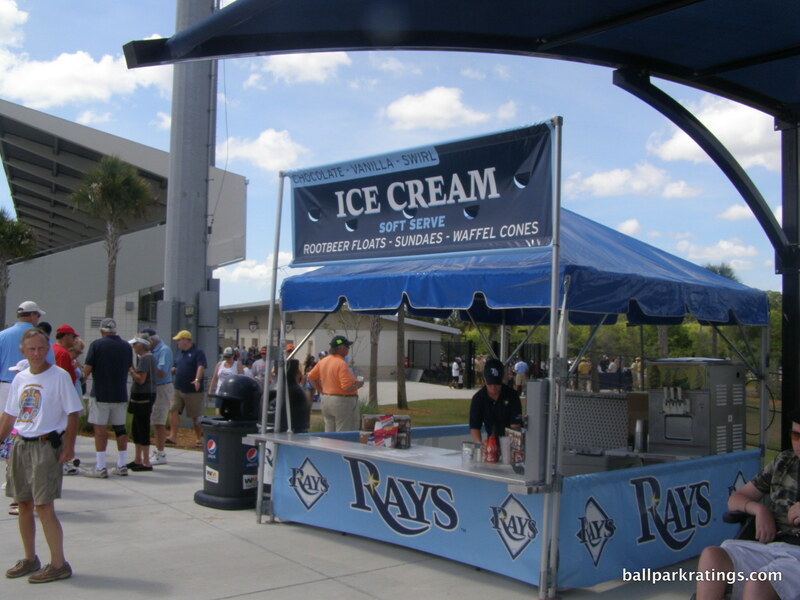 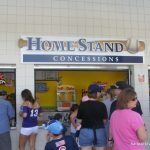 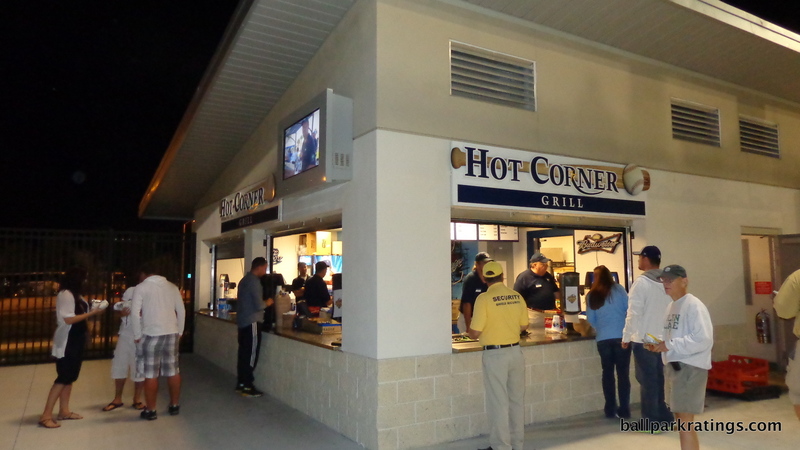 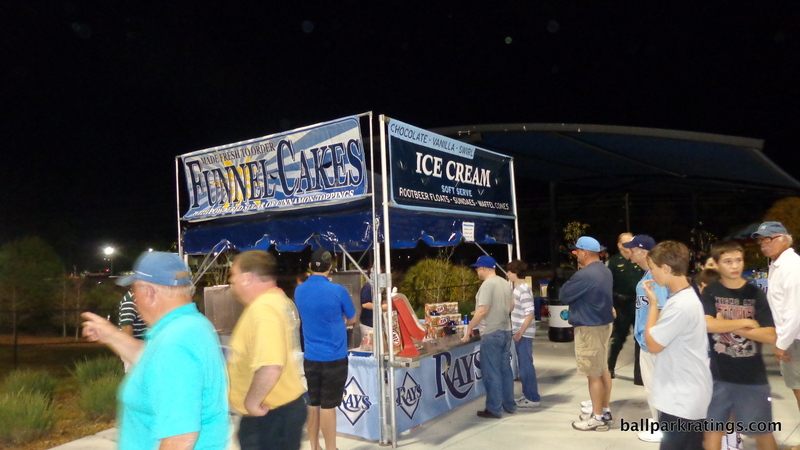 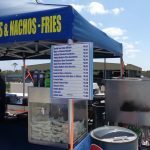 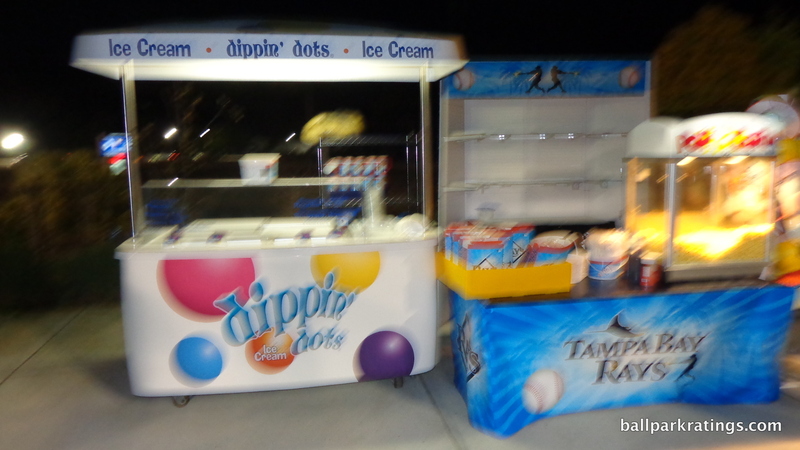 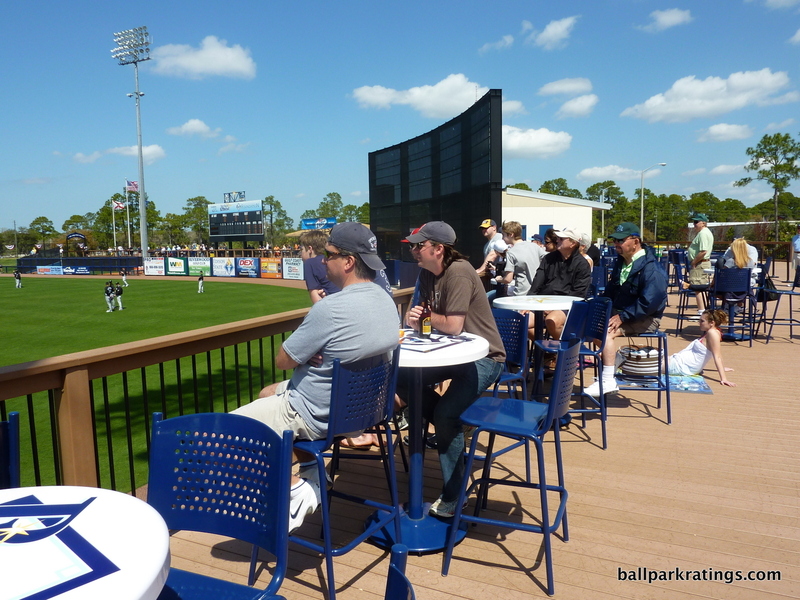 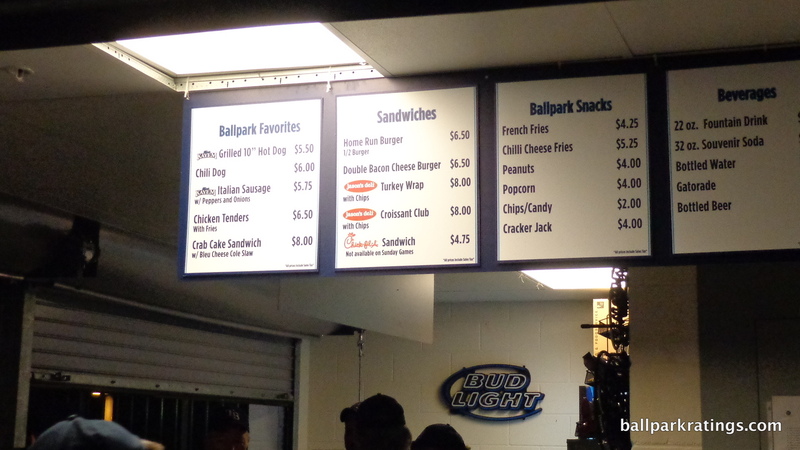 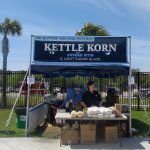 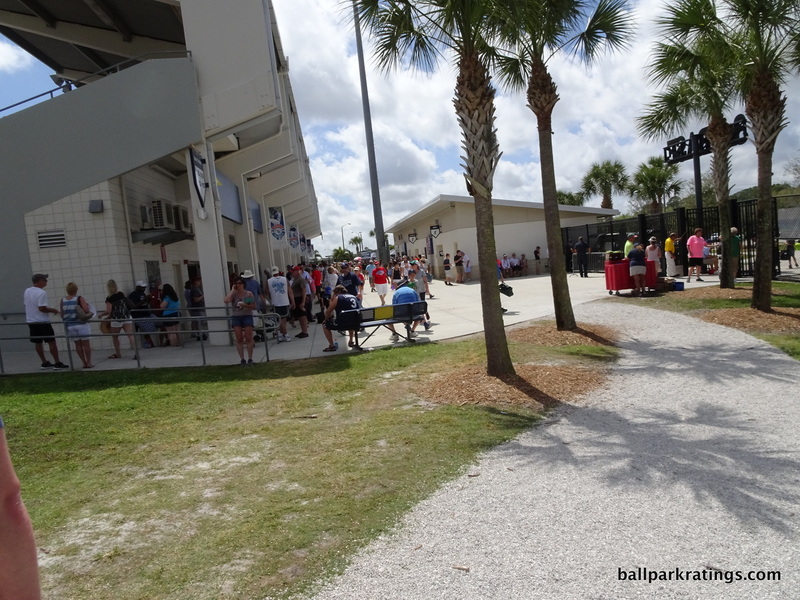 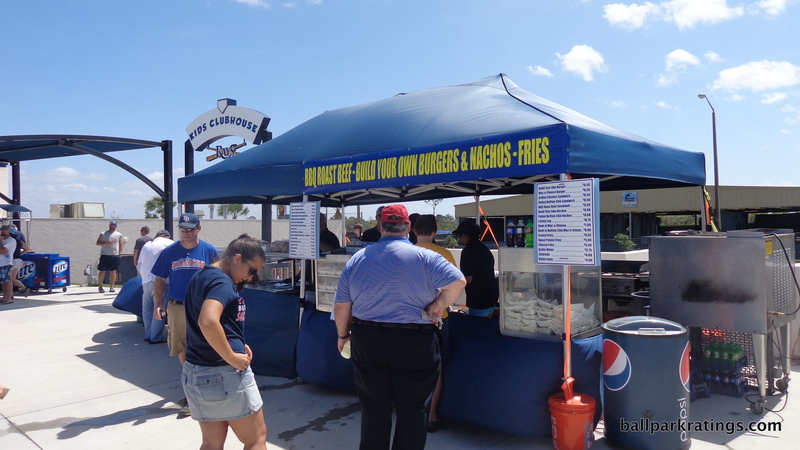 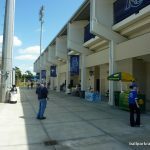 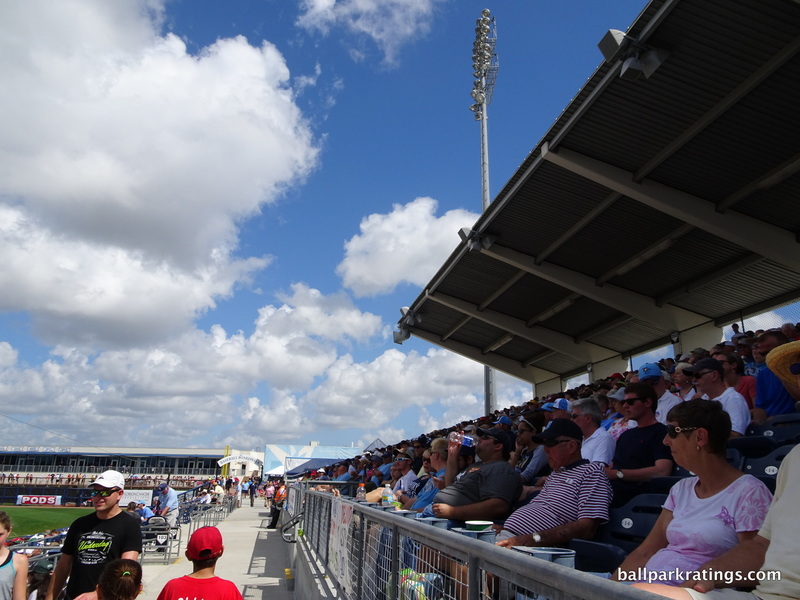 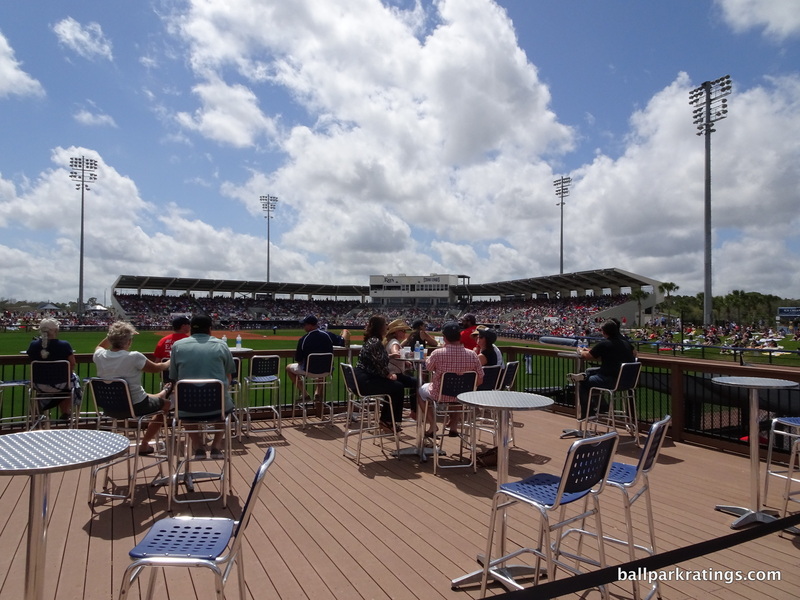 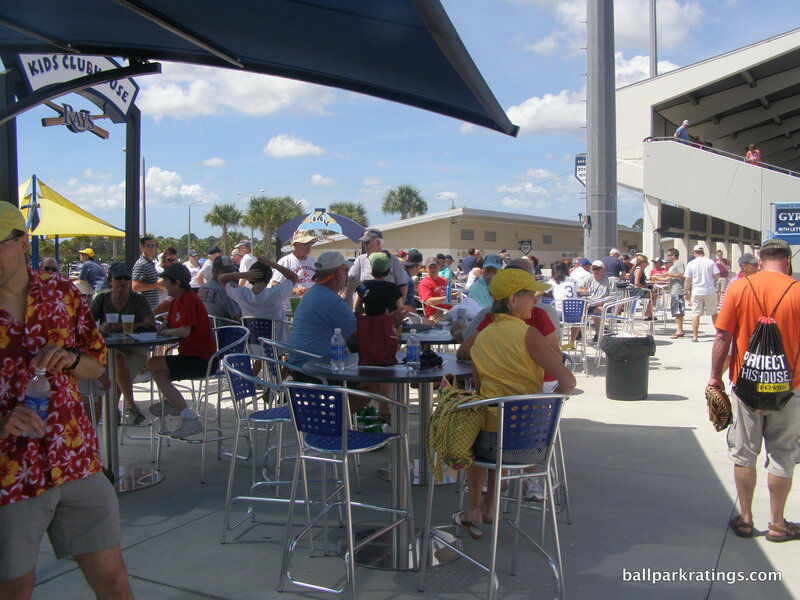 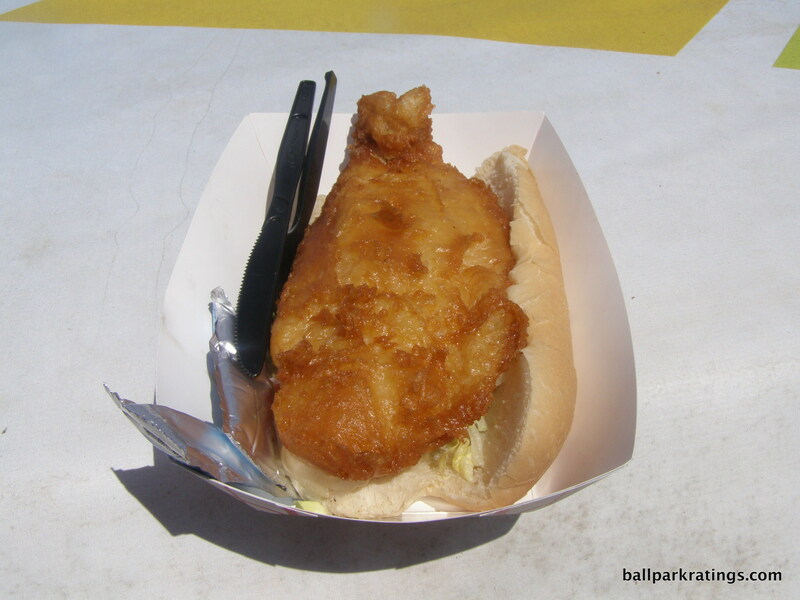 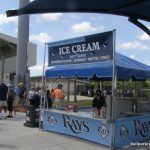 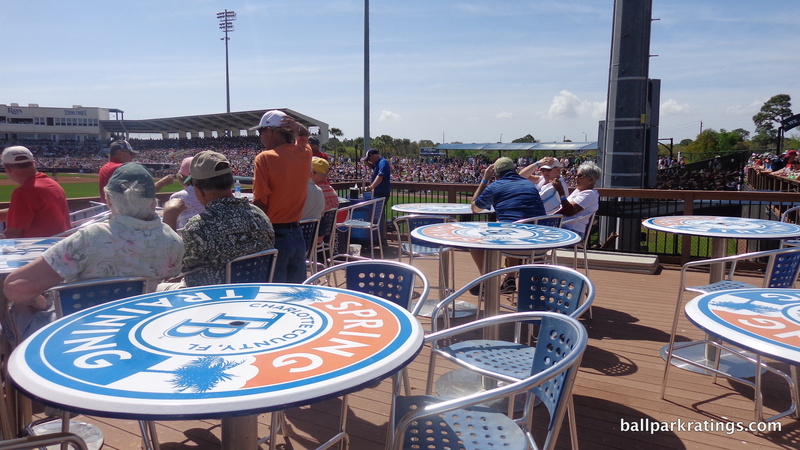 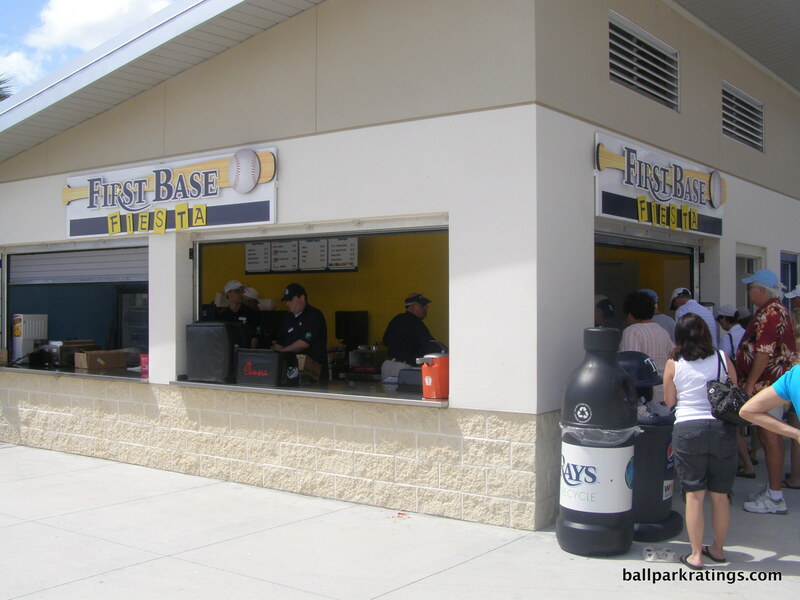 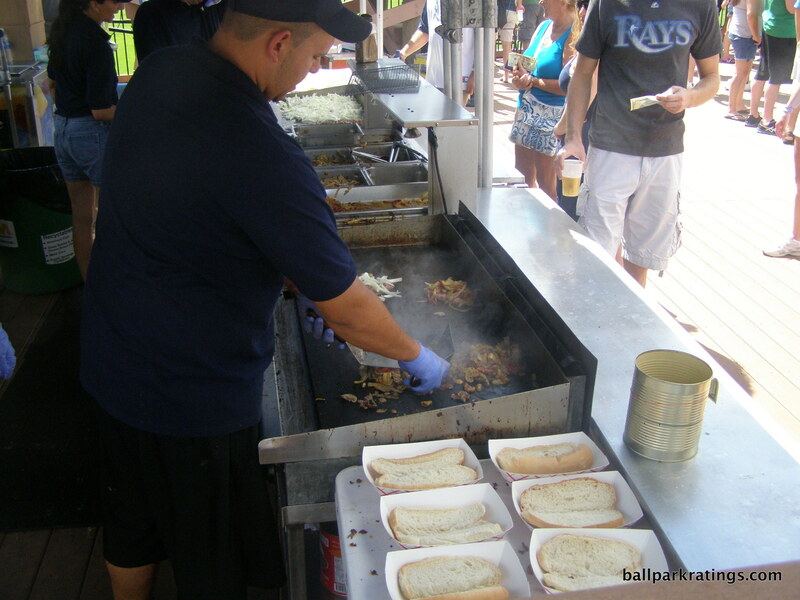 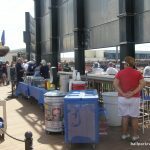 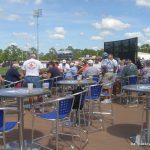 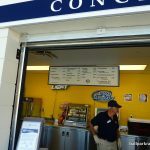 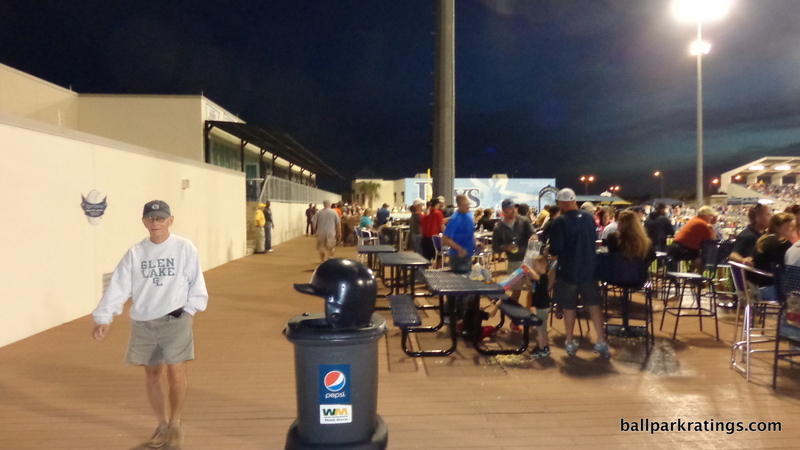 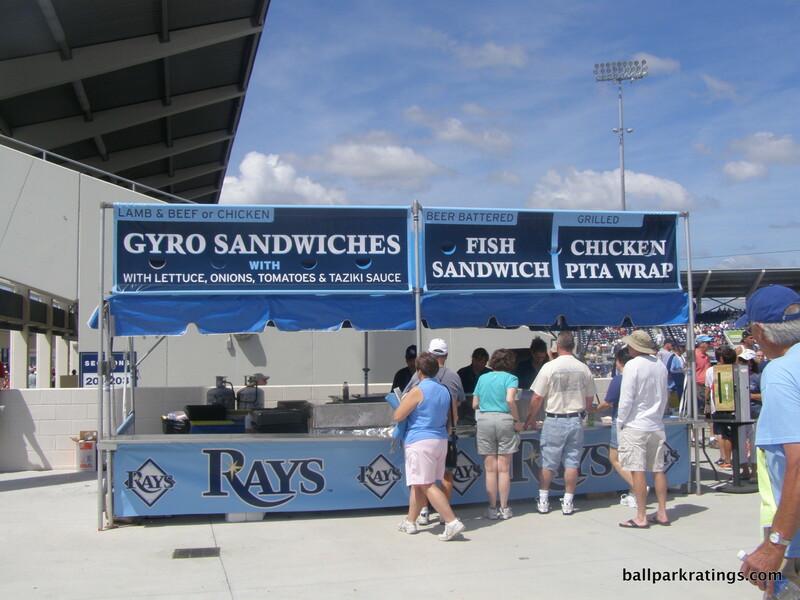 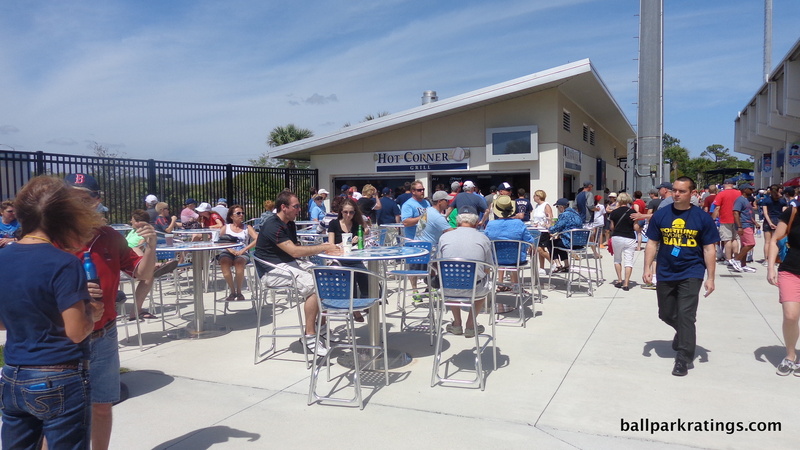 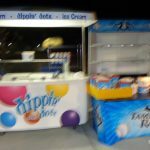 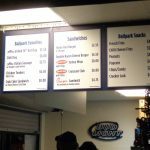 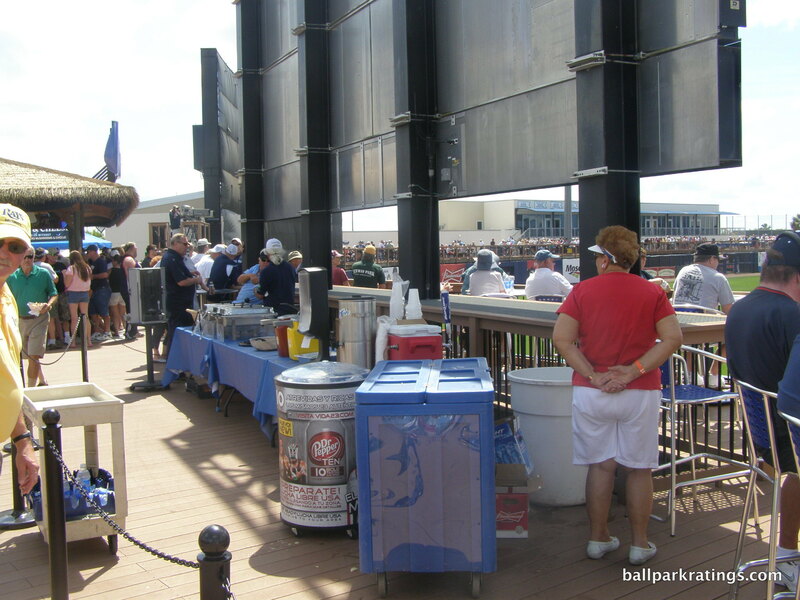 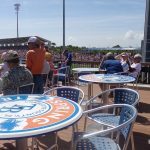 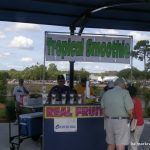 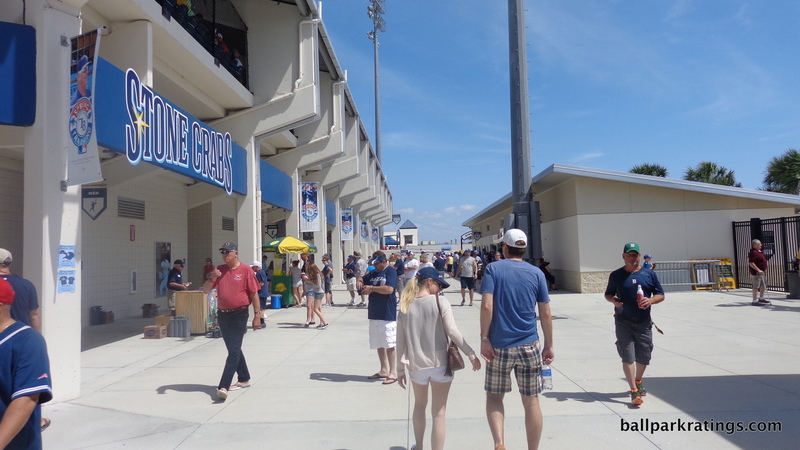 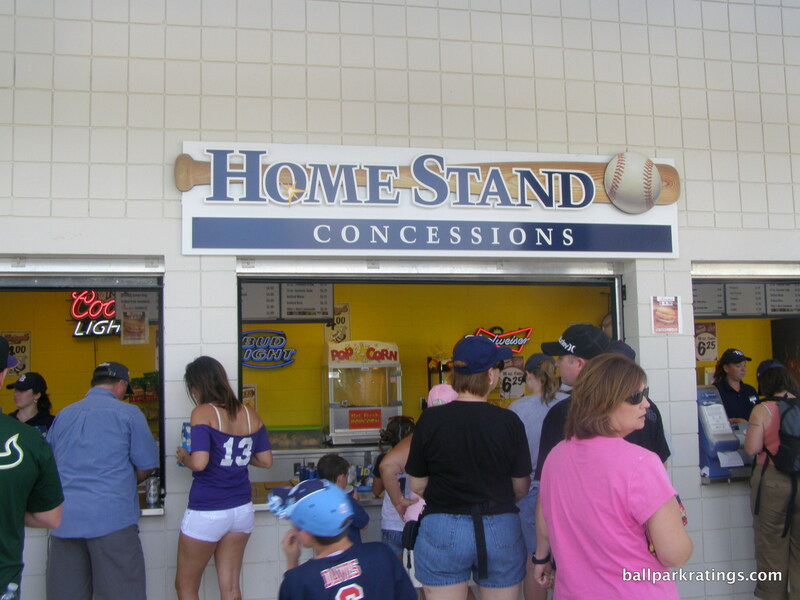 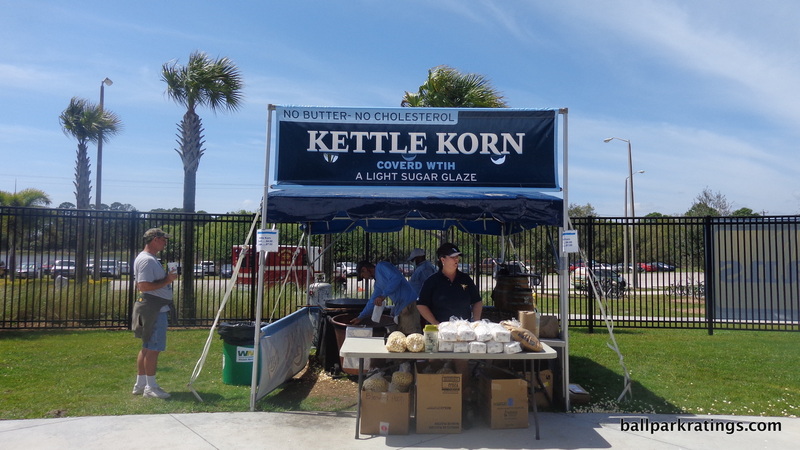 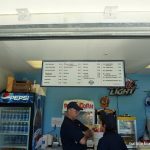 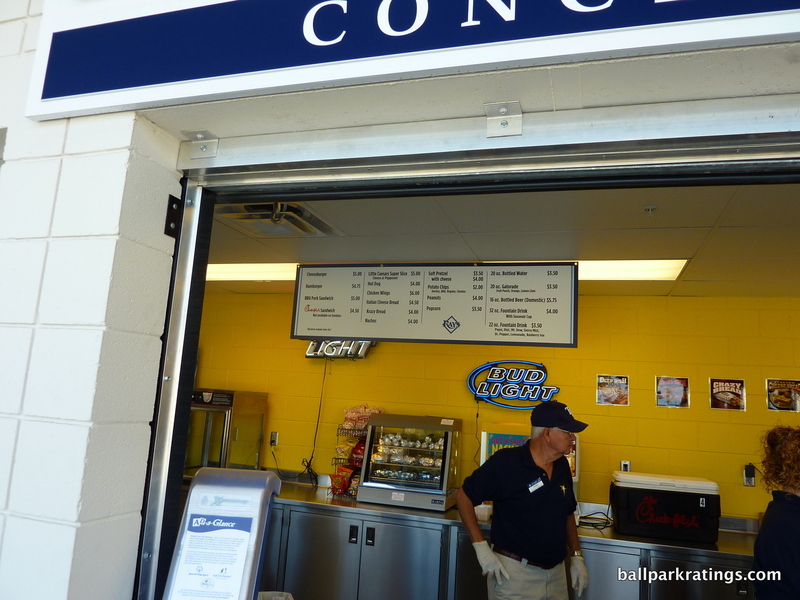 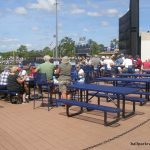 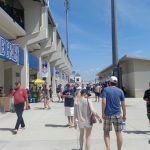 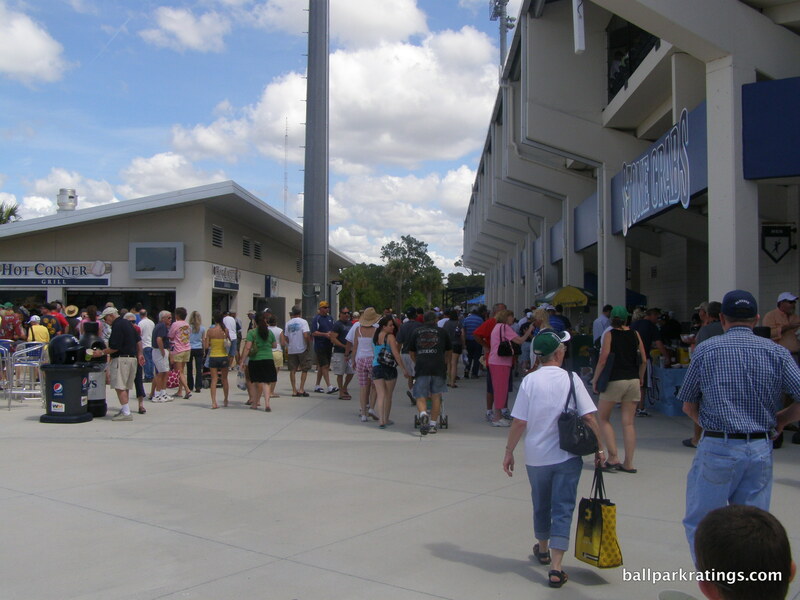 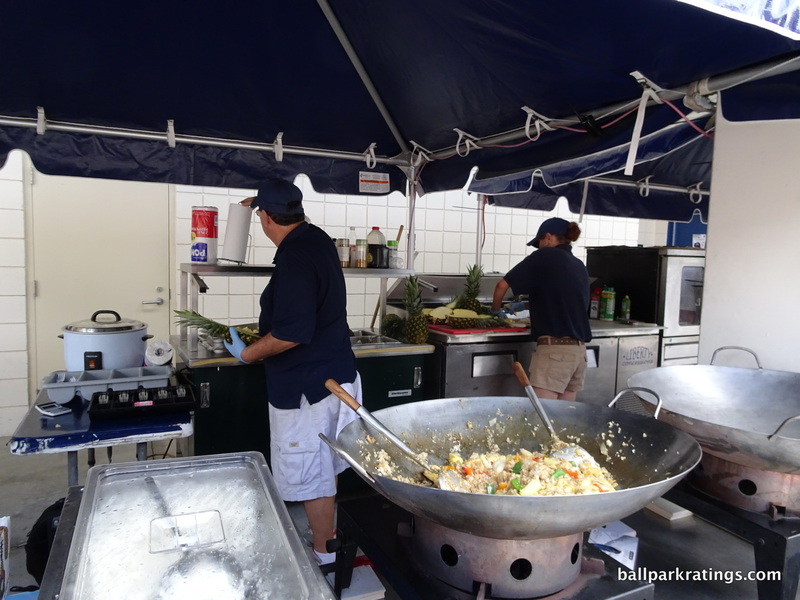 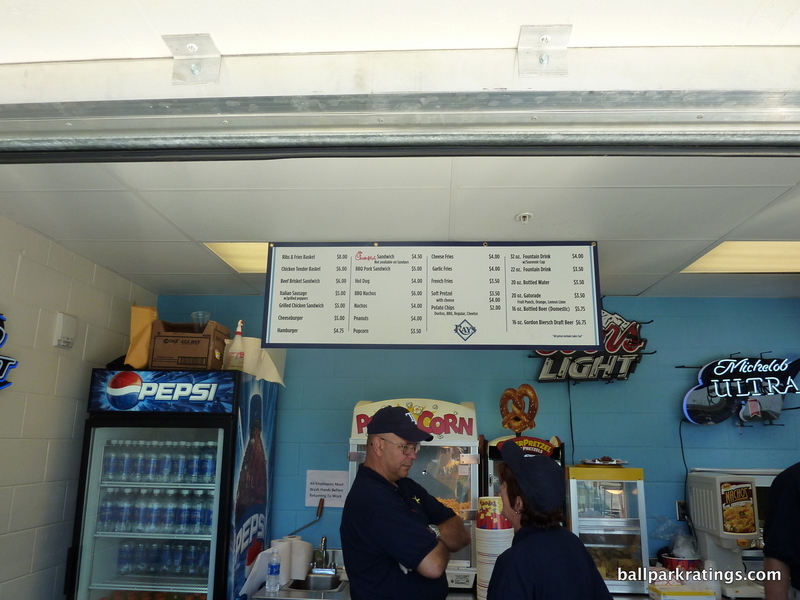 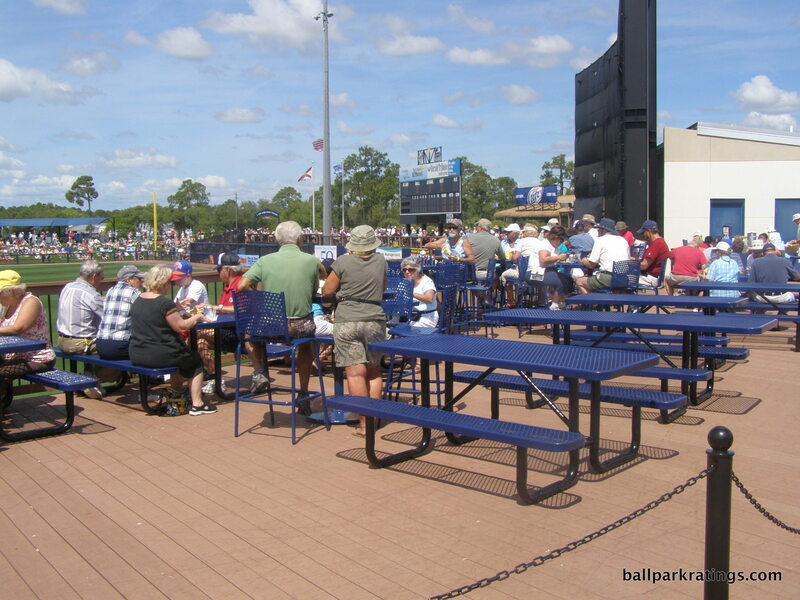 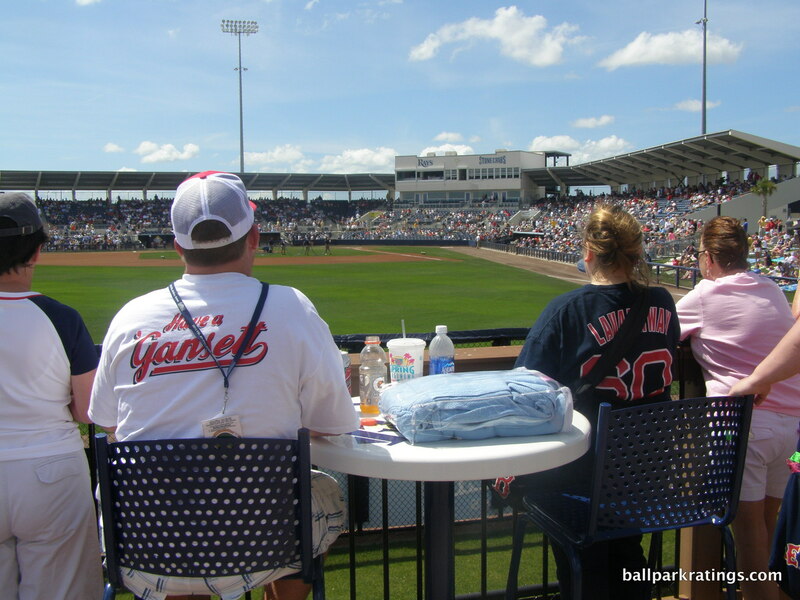 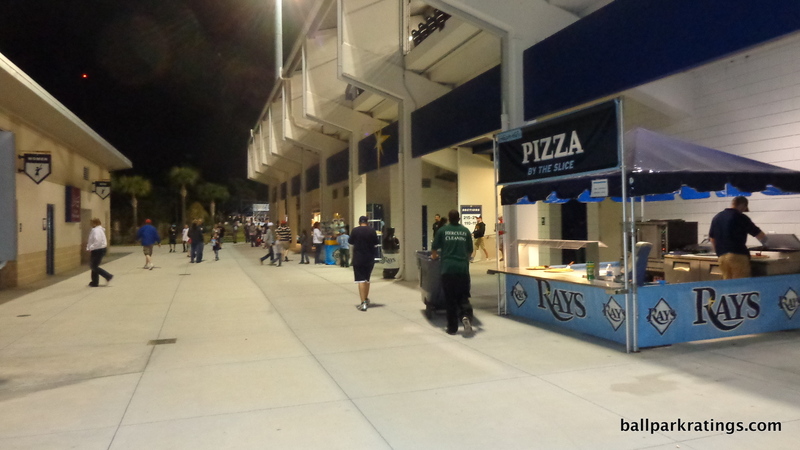 The concessions are varied and tasty, above average for Florida spring training. 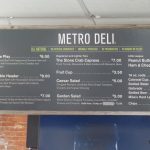 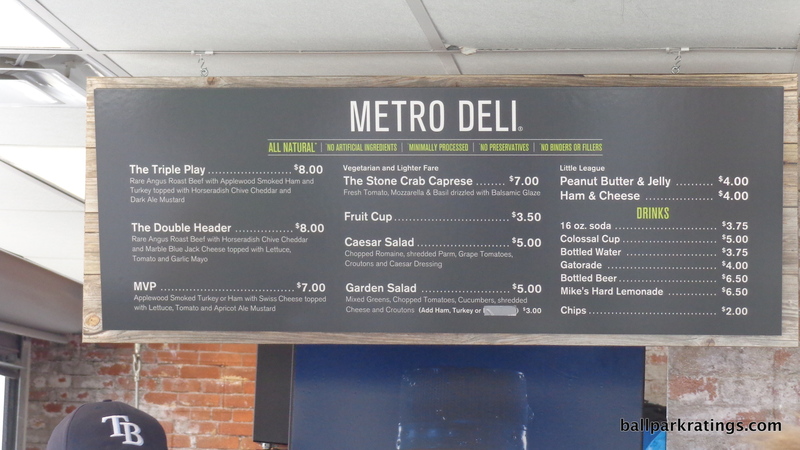 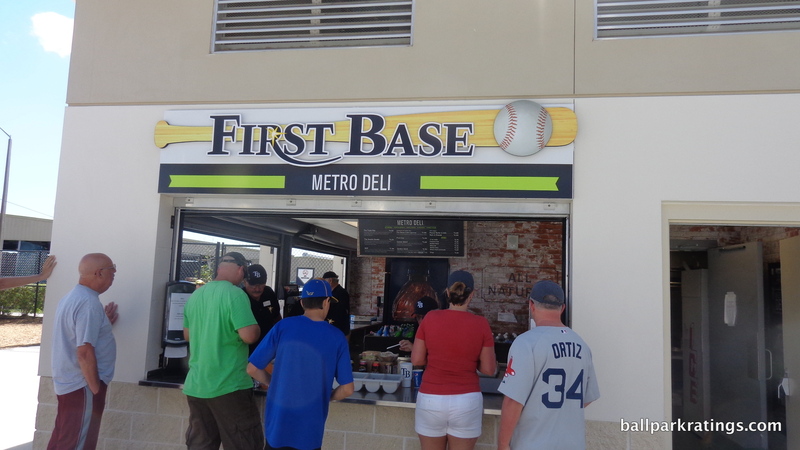 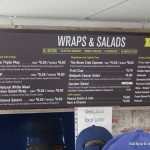 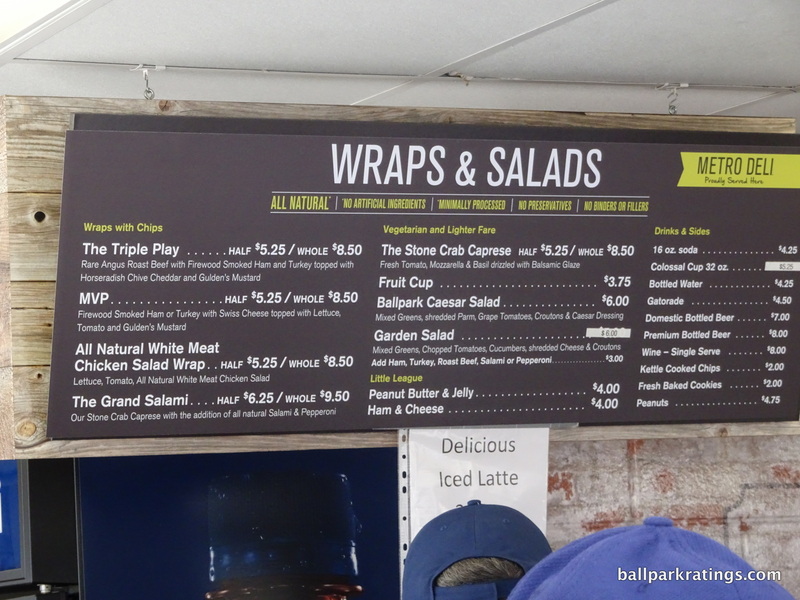 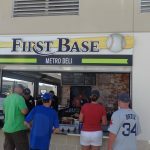 Wraps, salads, and sandwiches at the first base deli offer some of the best ballpark grub. 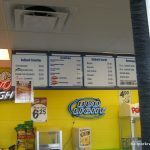 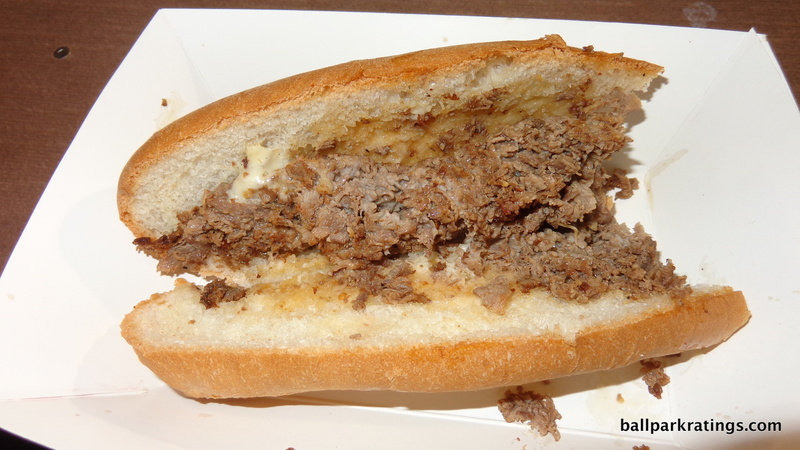 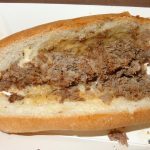 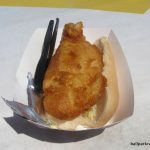 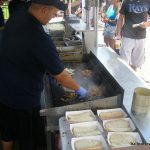 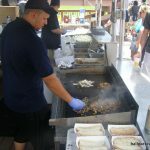 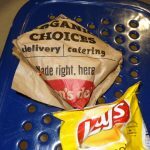 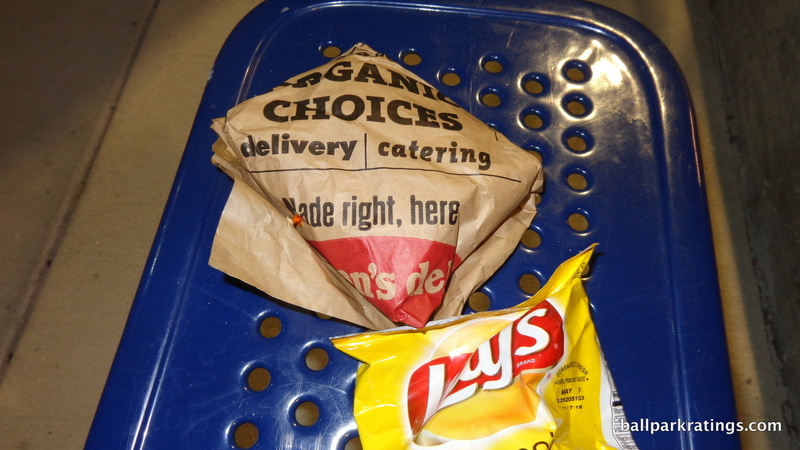 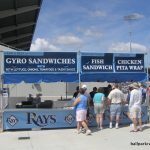 Gyros, fish sandwiches, chicken pita wraps, respectable cheesesteaks, BBQ, and Chick-fil-A have been mainstays. 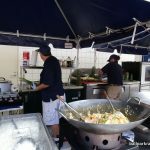 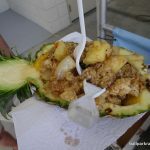 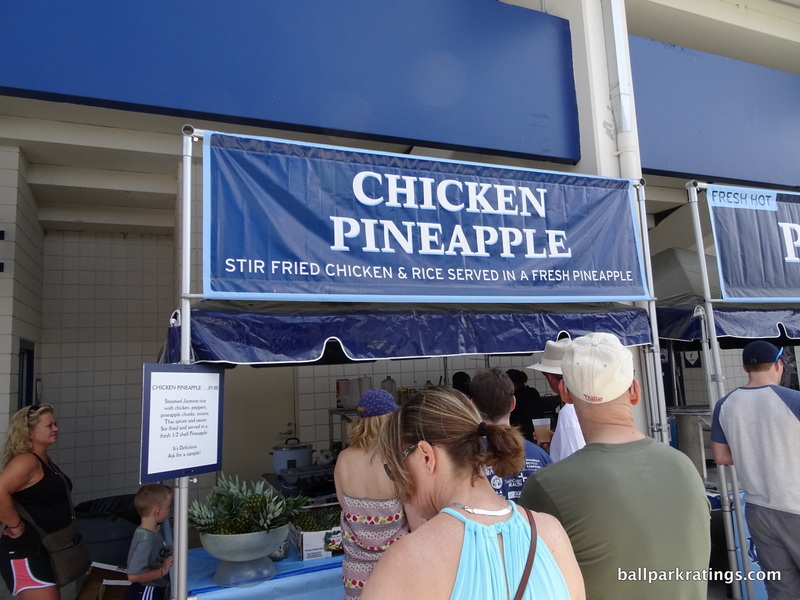 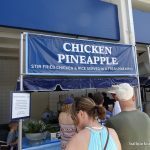 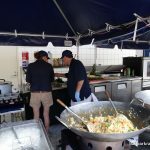 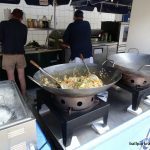 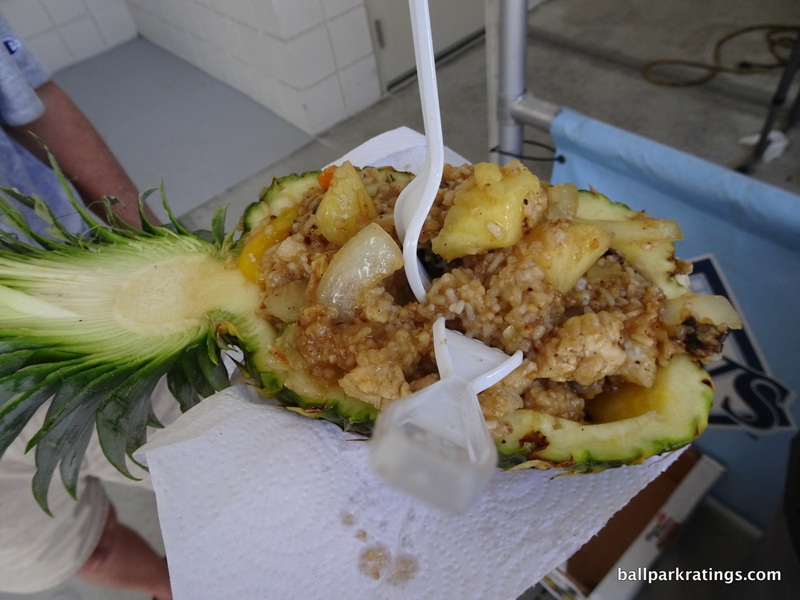 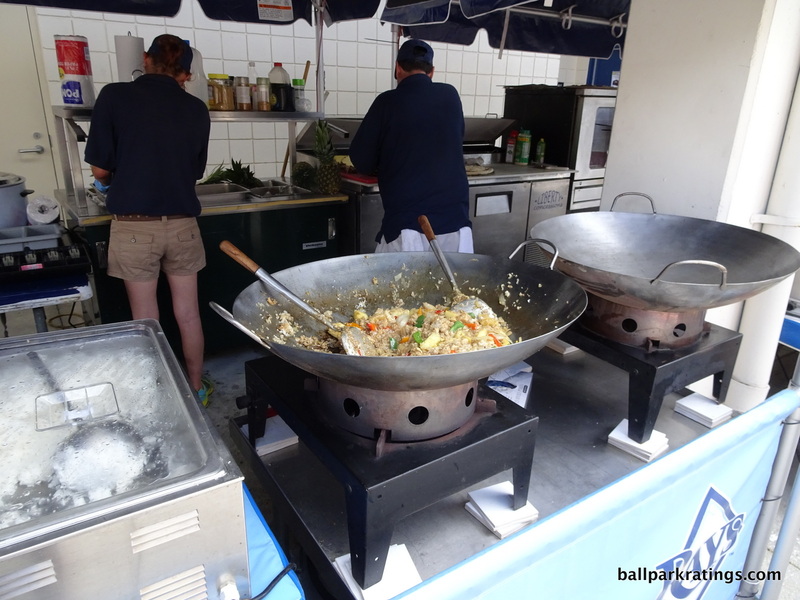 2016 brought perhaps the most unique concession item I’ve ever seen in spring training: stir-fry chicken in a fresh pineapple. 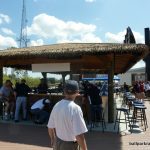 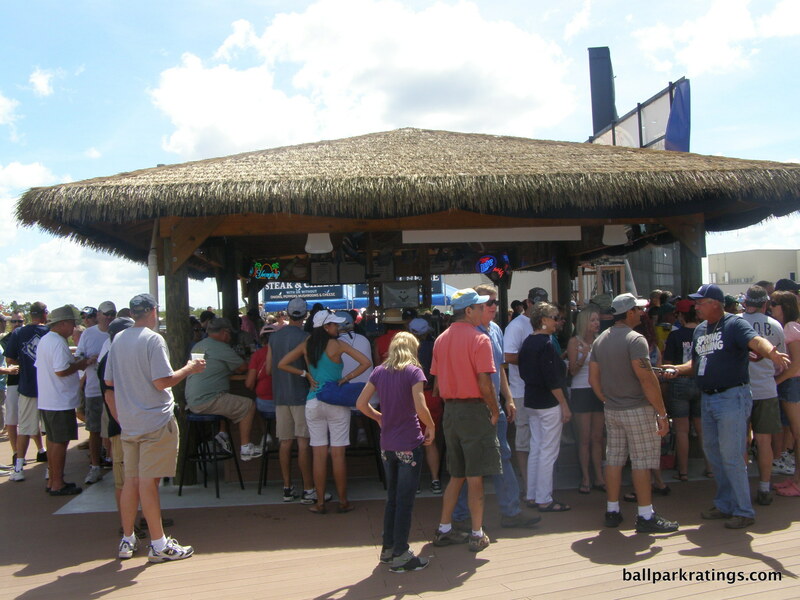 The park’s signature amenity is the tiki bar in left-center field. 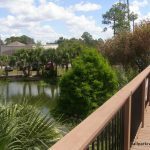 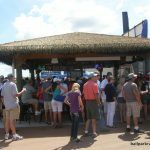 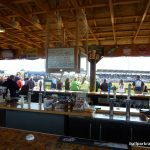 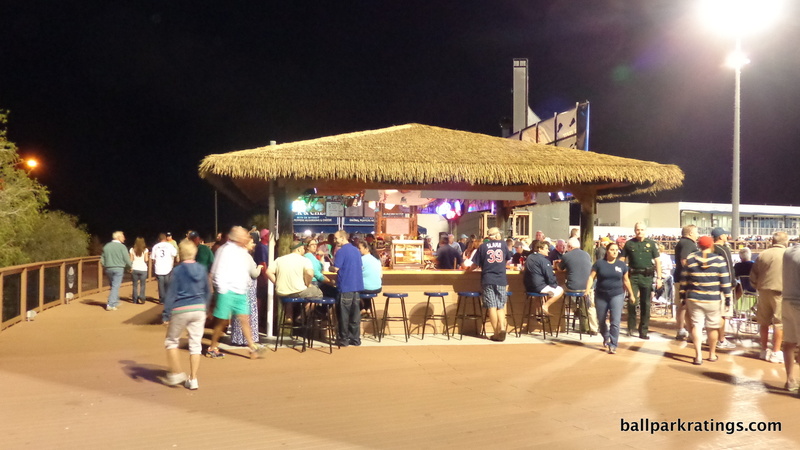 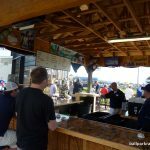 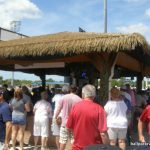 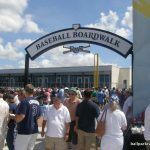 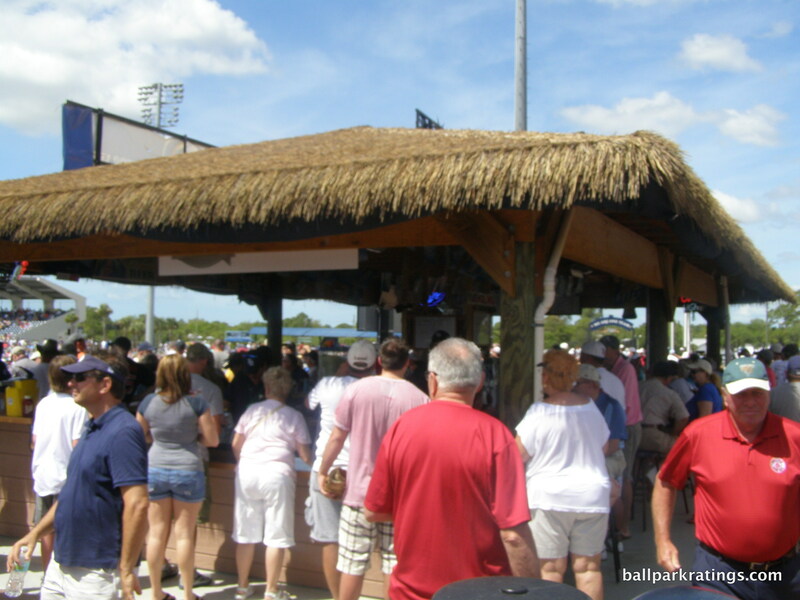 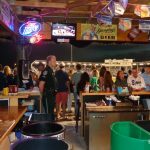 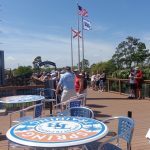 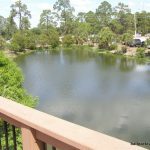 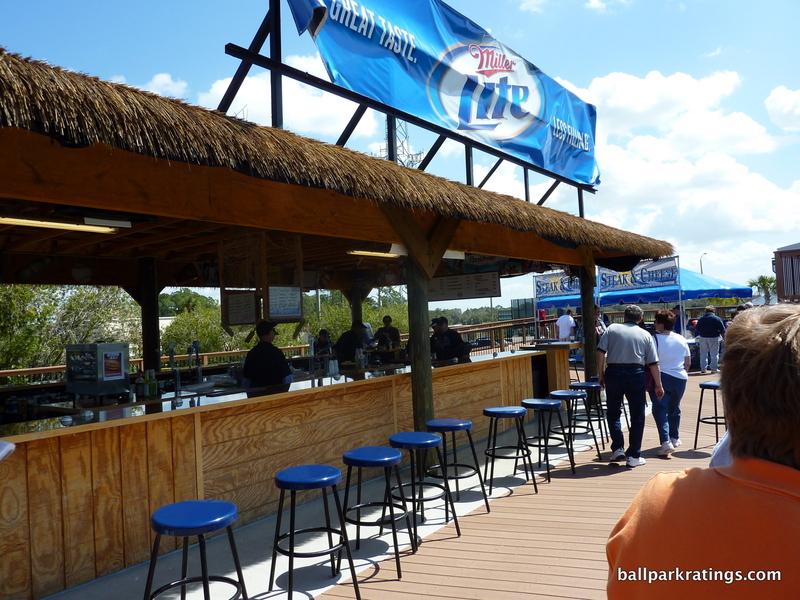 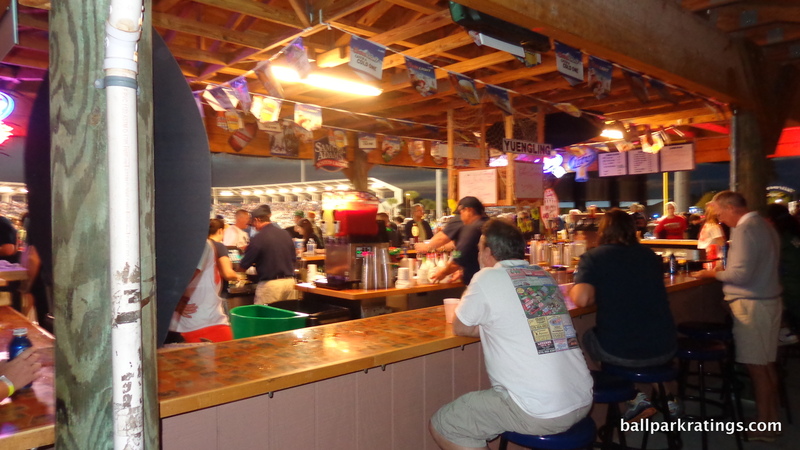 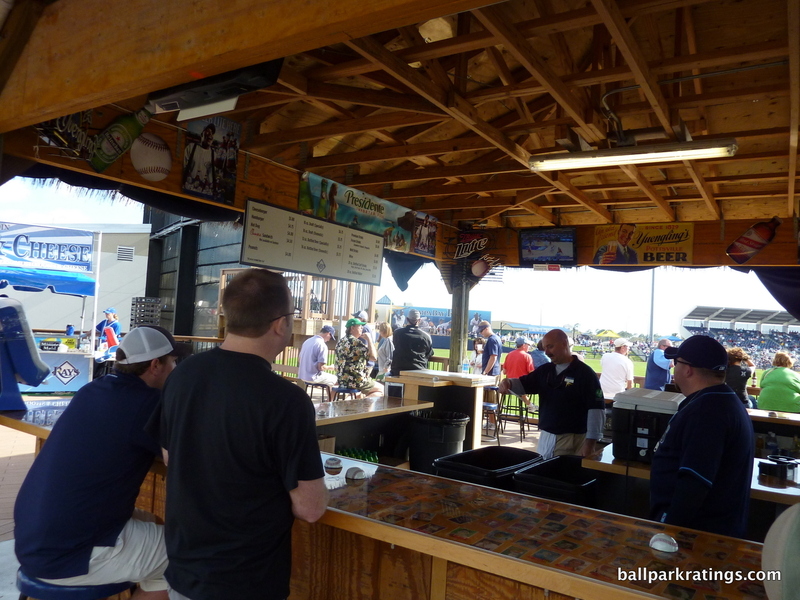 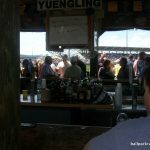 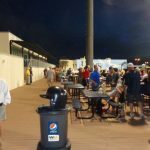 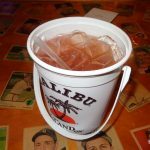 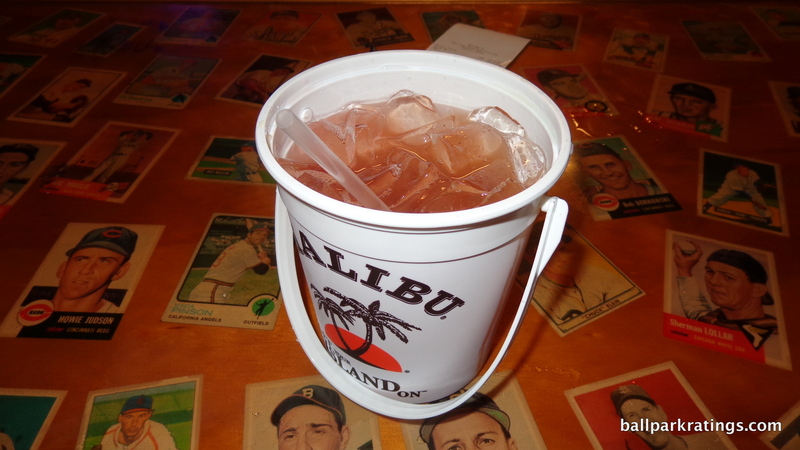 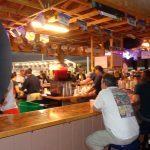 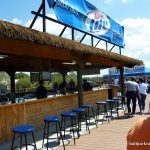 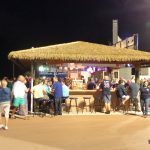 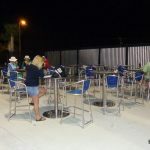 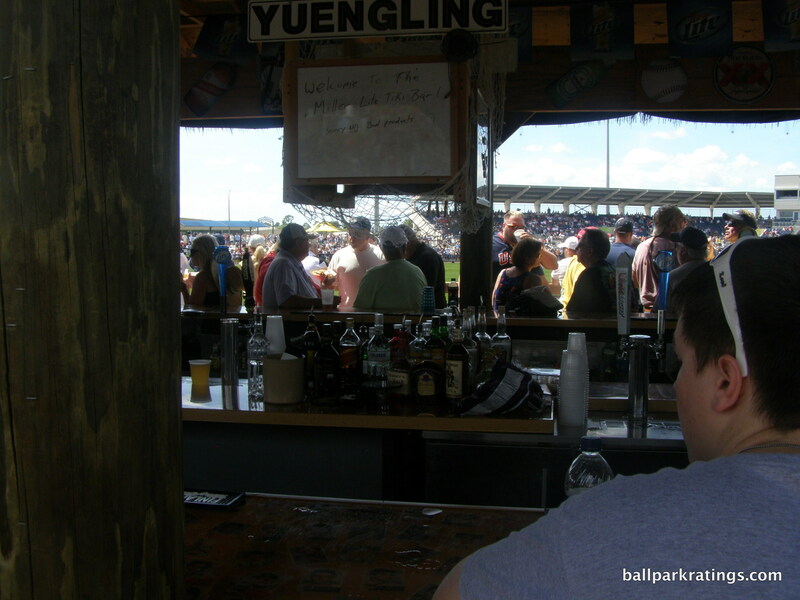 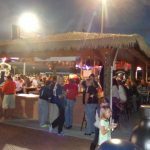 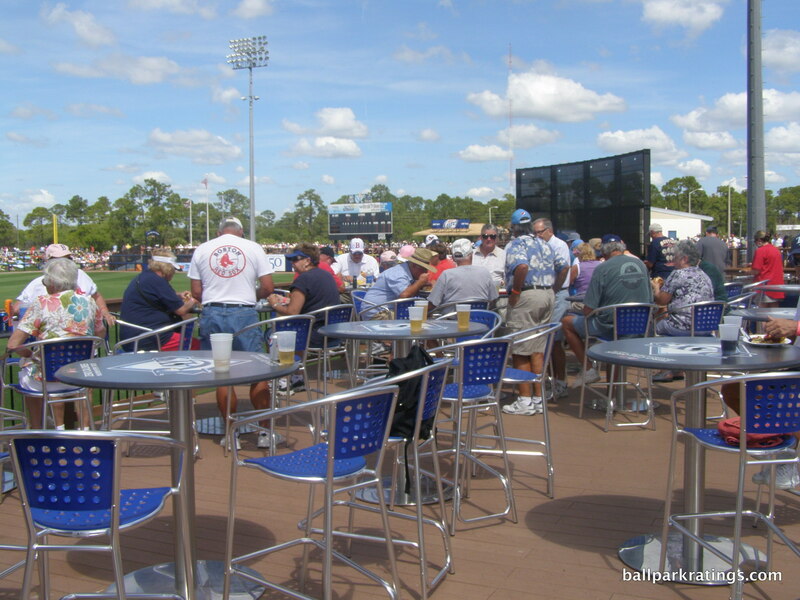 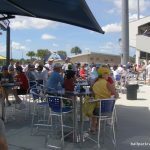 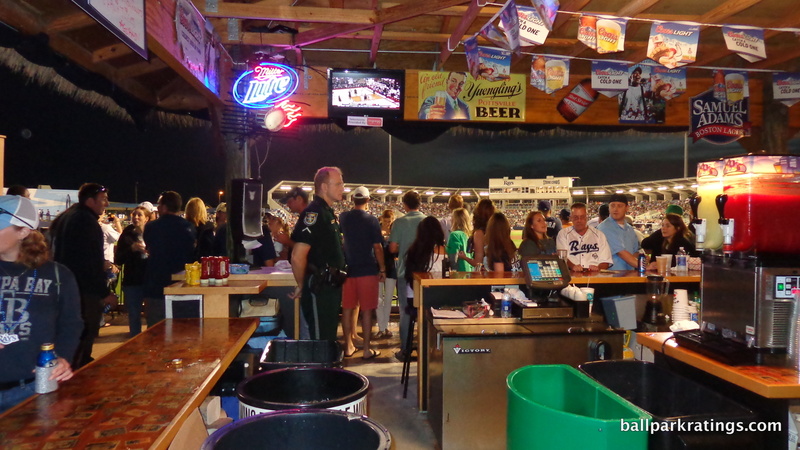 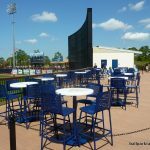 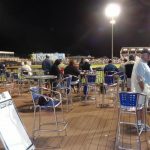 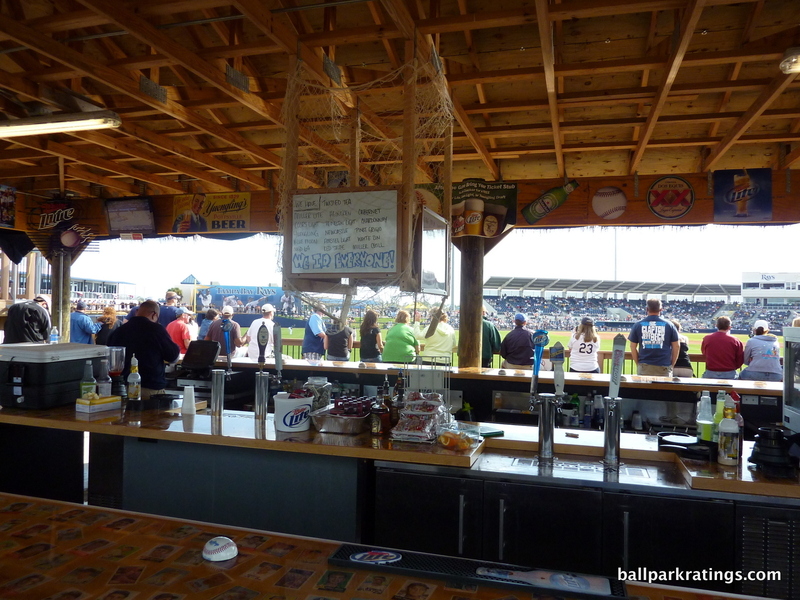 While the boardwalk itself is an original, the tiki bar was cribbed from the Phillies’ Spectrum Field, but it has since spread all around Florida. 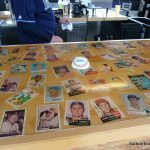 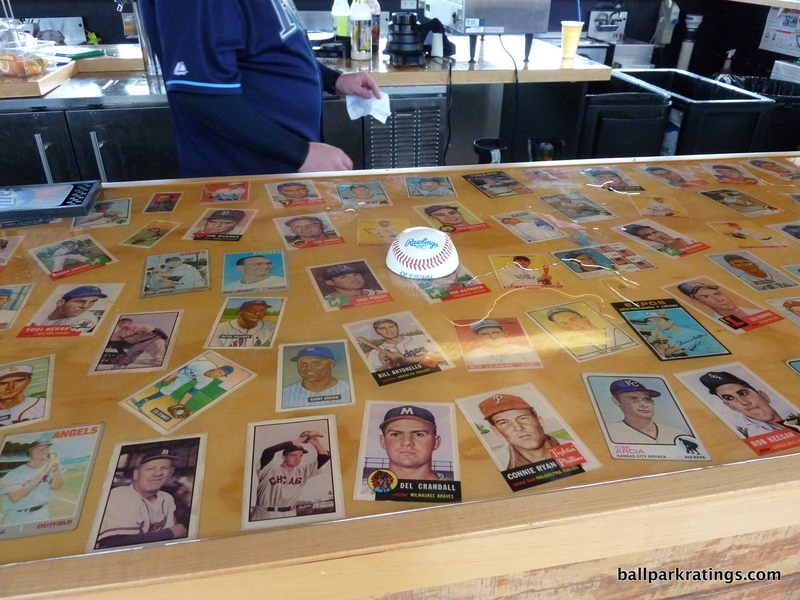 Fans sitting at the bar will note the vintage replica baseball cards within the glass countertop. 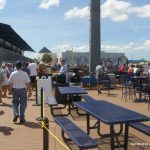 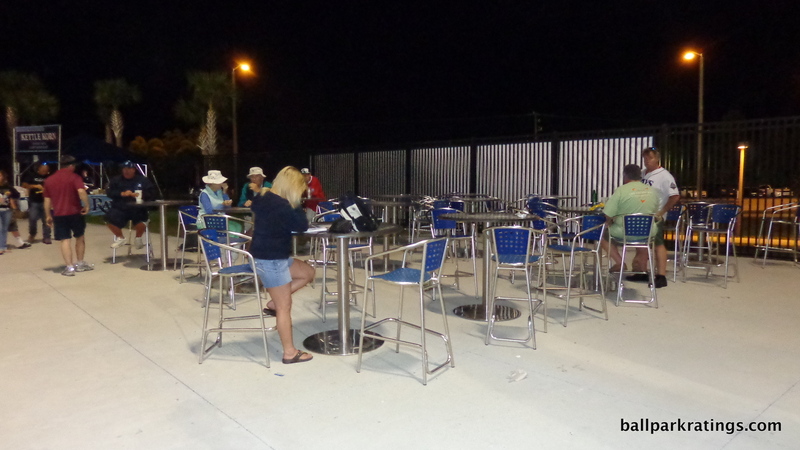 While most of the other sitting areas on the boardwalk are reserved for private parties, there are plenty of other tables and chairs throughout the main concourse. 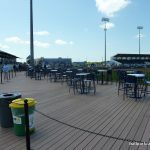 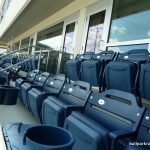 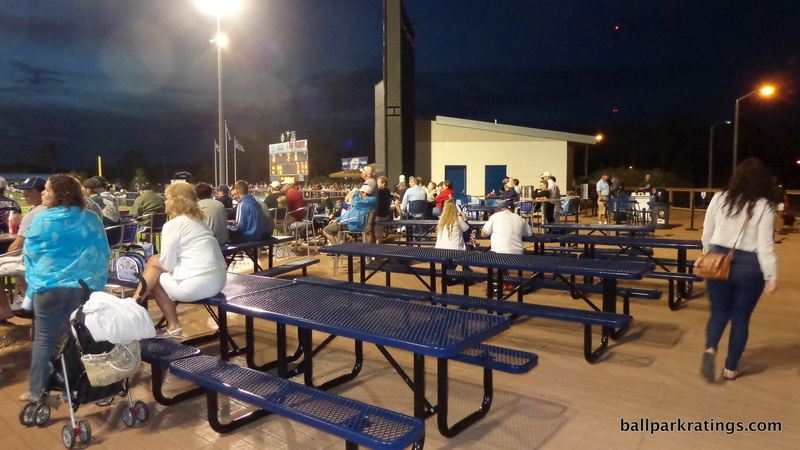 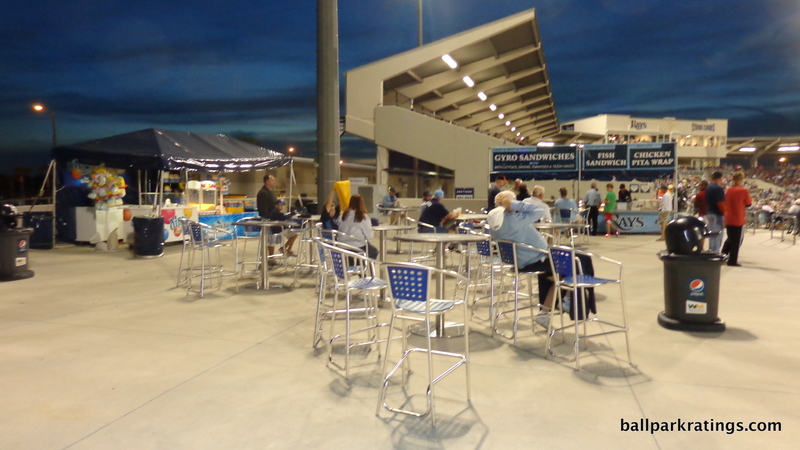 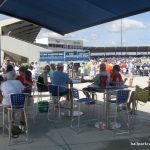 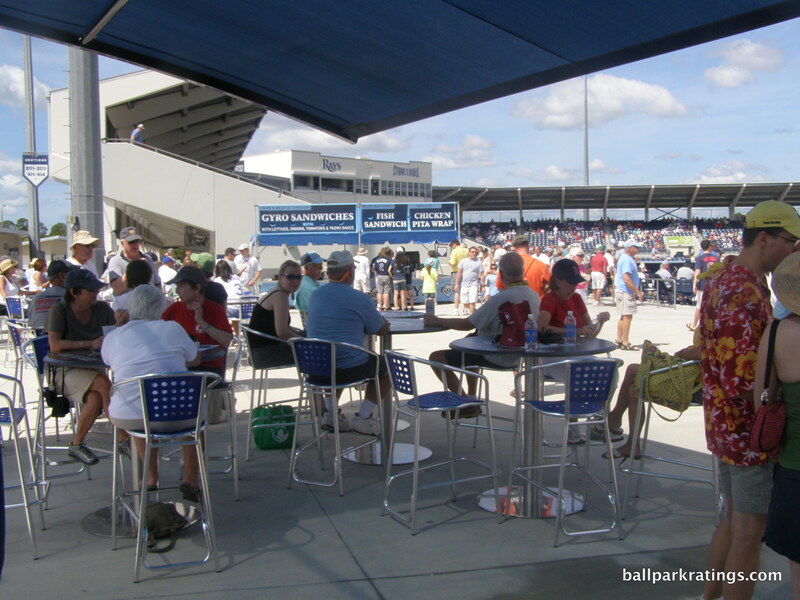 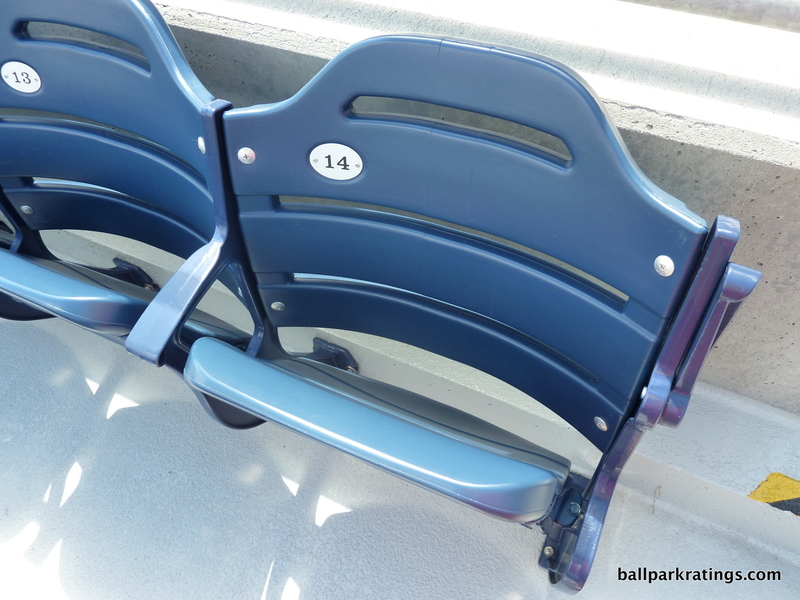 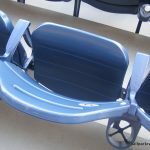 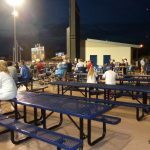 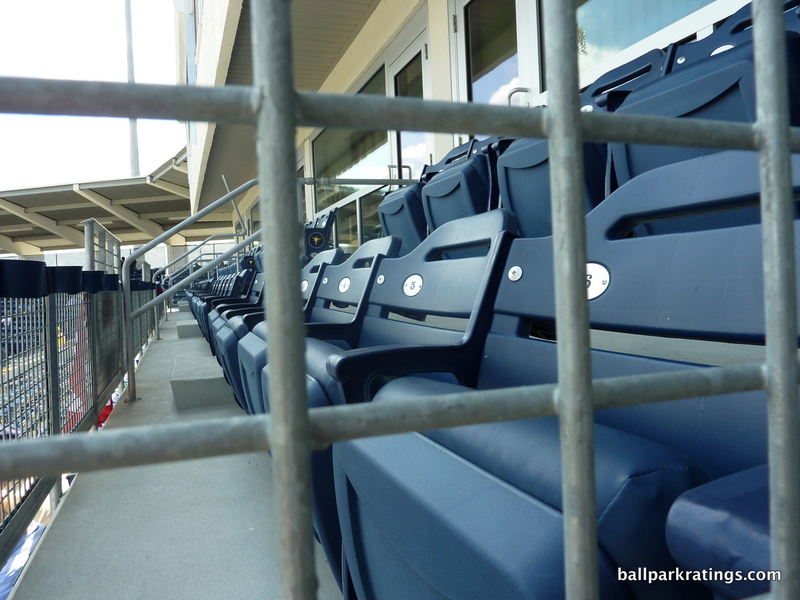 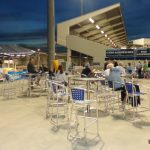 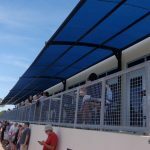 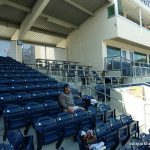 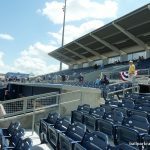 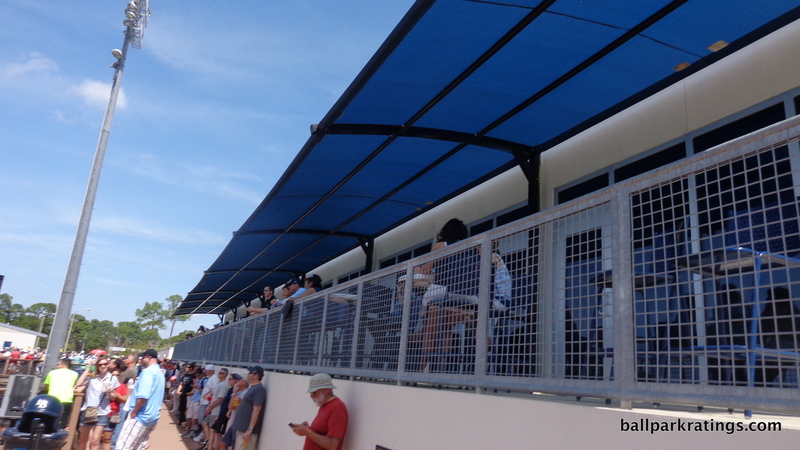 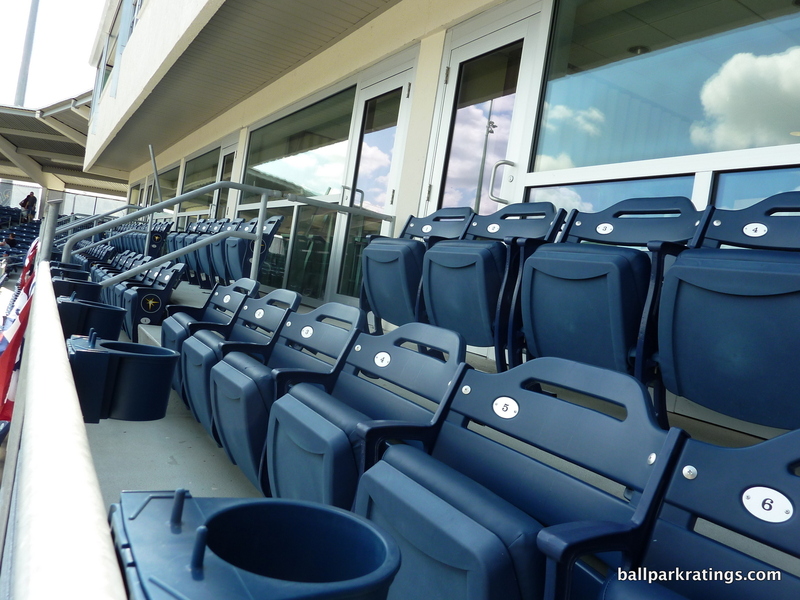 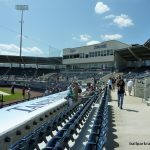 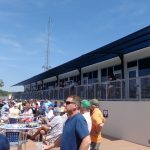 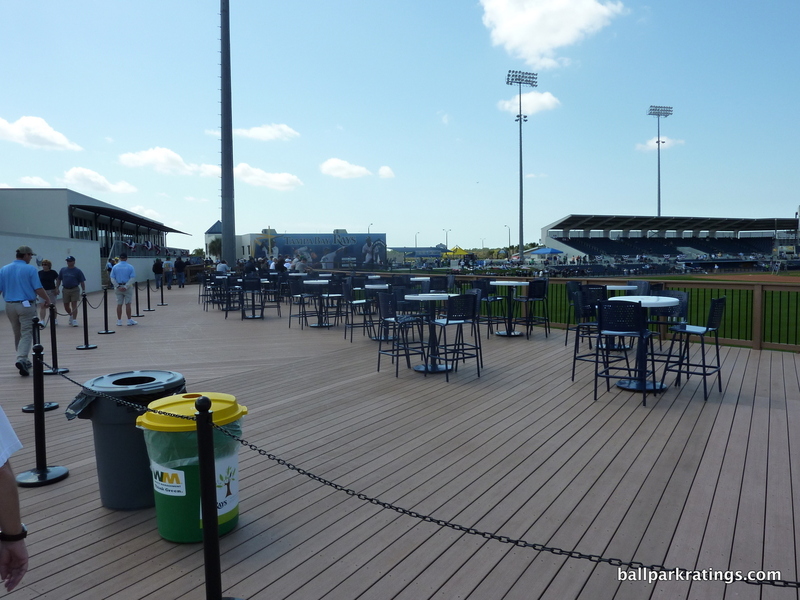 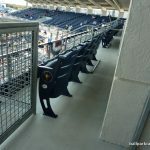 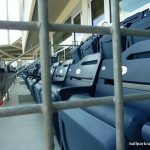 While Charlotte Sports Park does pretty well in bars, social spaces, and sitting areas accessible to all fans, the park doesn’t bring too many unique seating options or group areas to the table. 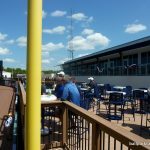 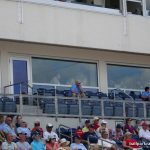 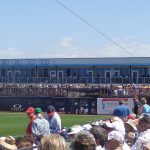 Other than the outfield party areas mentioned above, five luxury suites below the press box are the extent of your options. 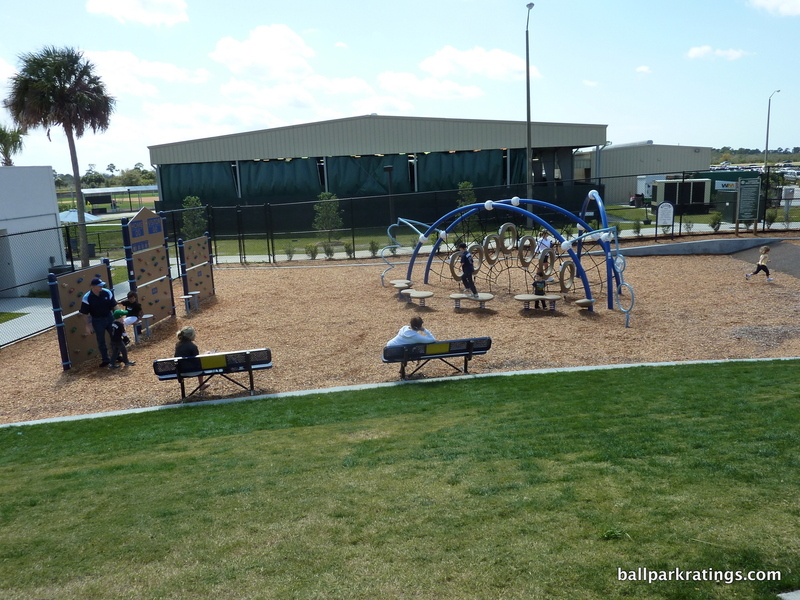 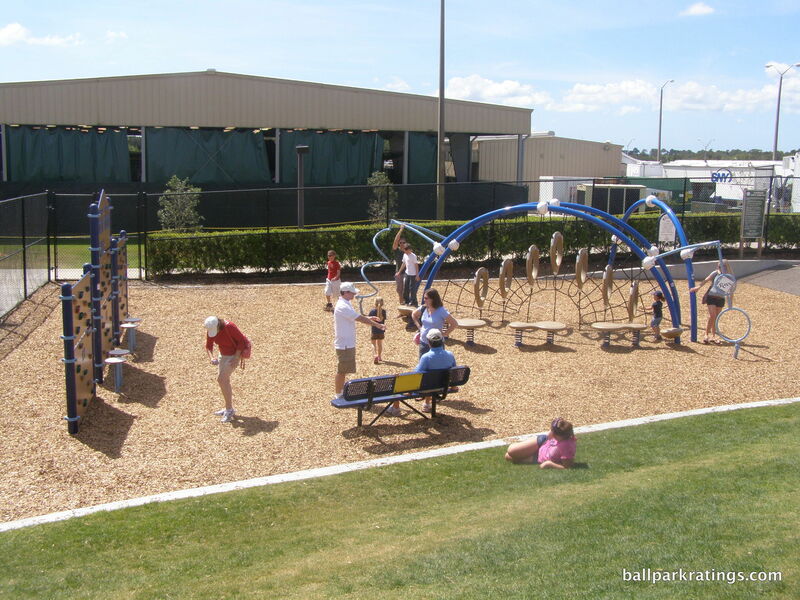 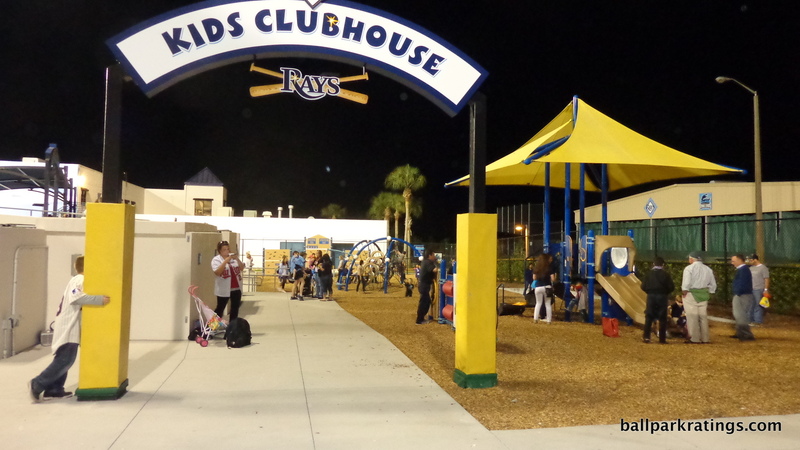 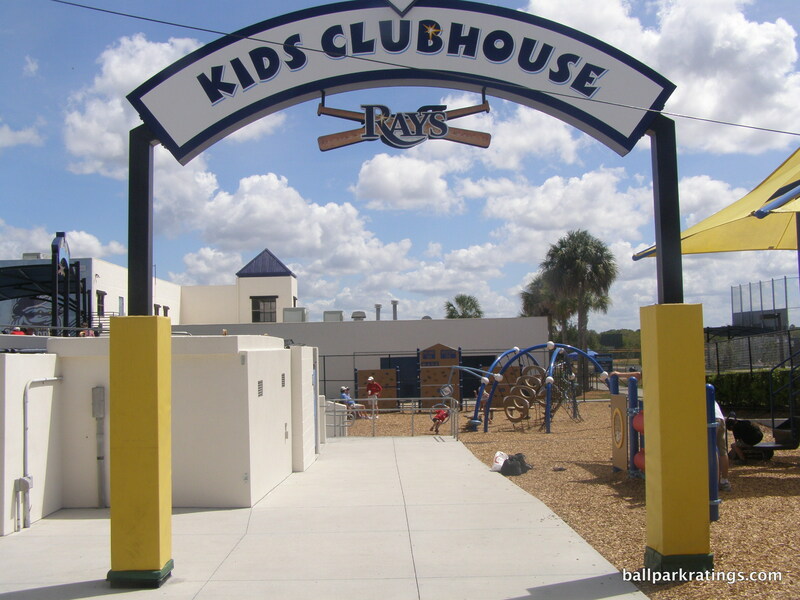 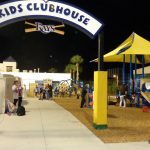 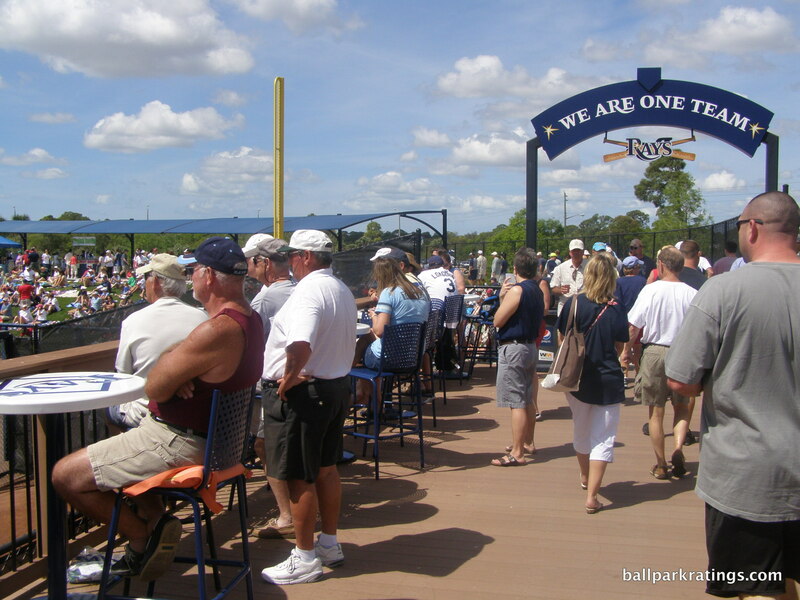 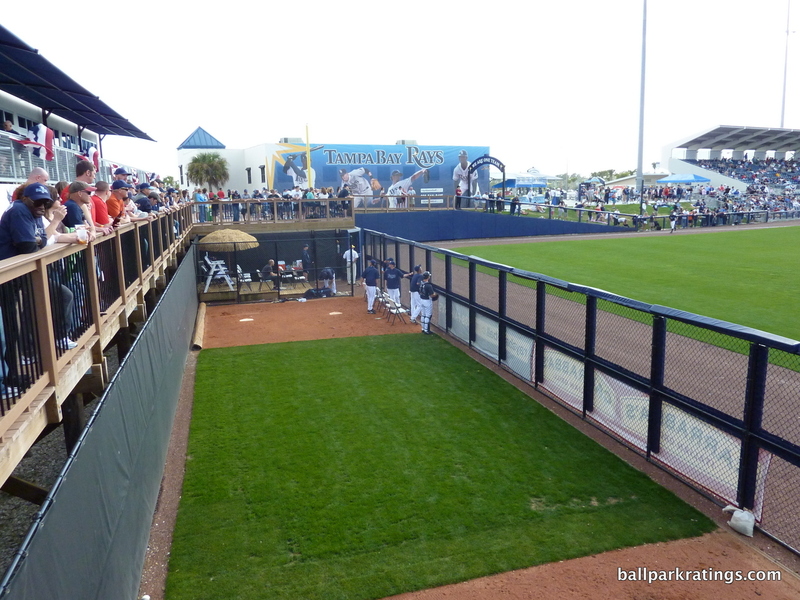 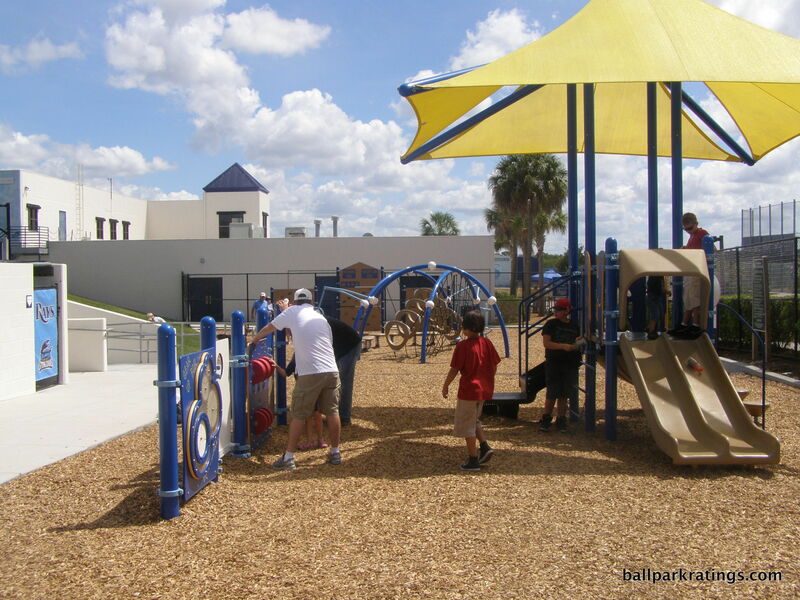 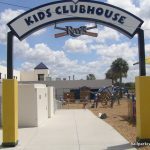 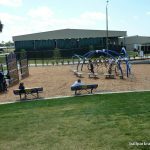 Finally, the Rays’ “Kids Clubhouse” is one of the better children’s areas in spring training. 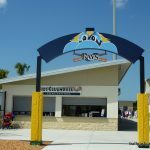 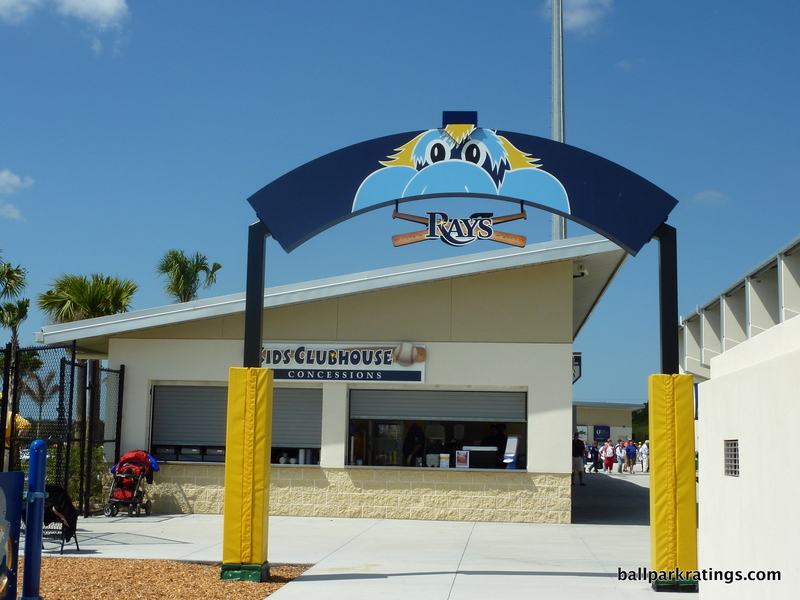 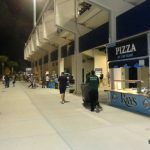 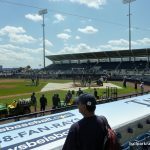 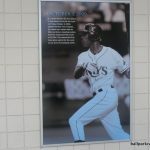 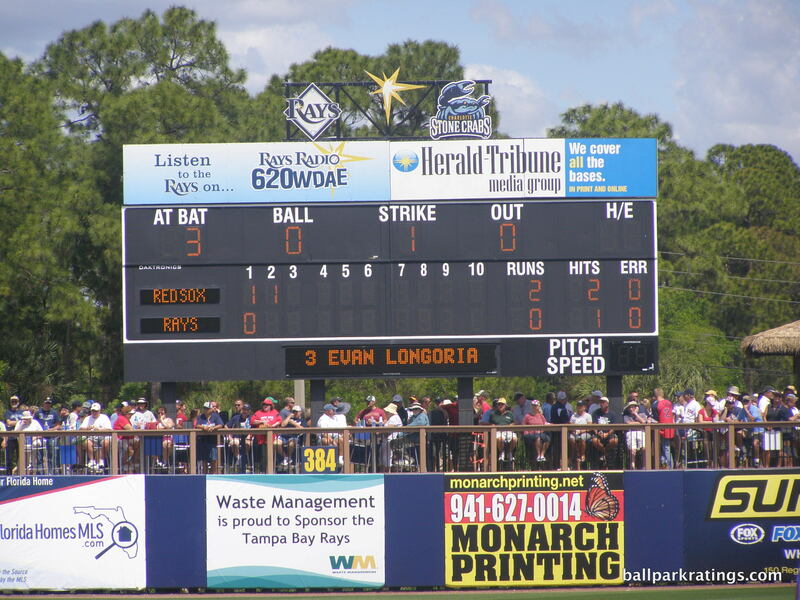 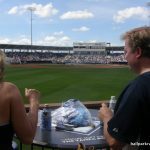 I should finally note that the Rays’ pad scores particularly well according to local fans and crowd sourcing services. 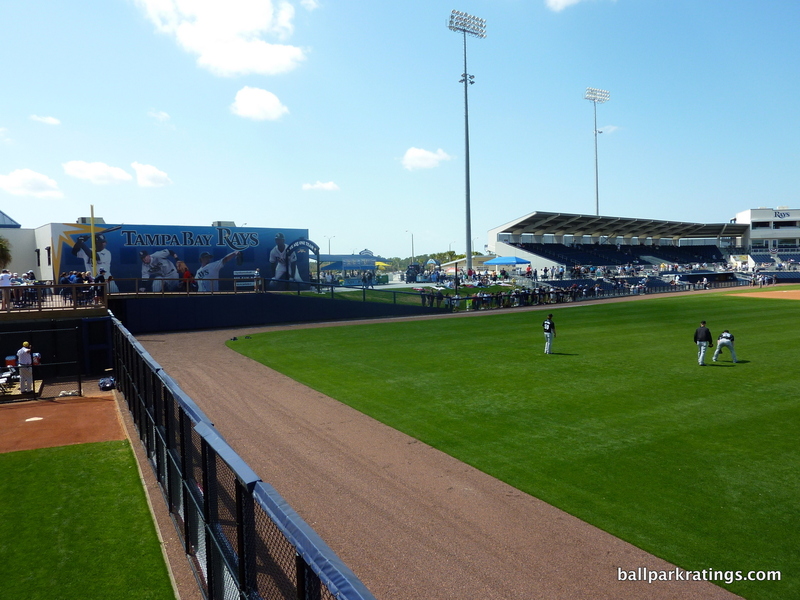 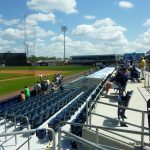 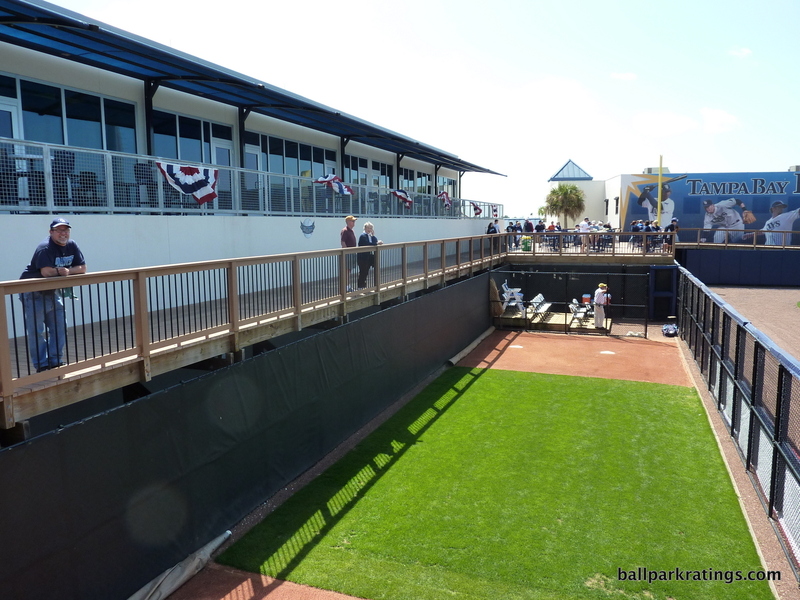 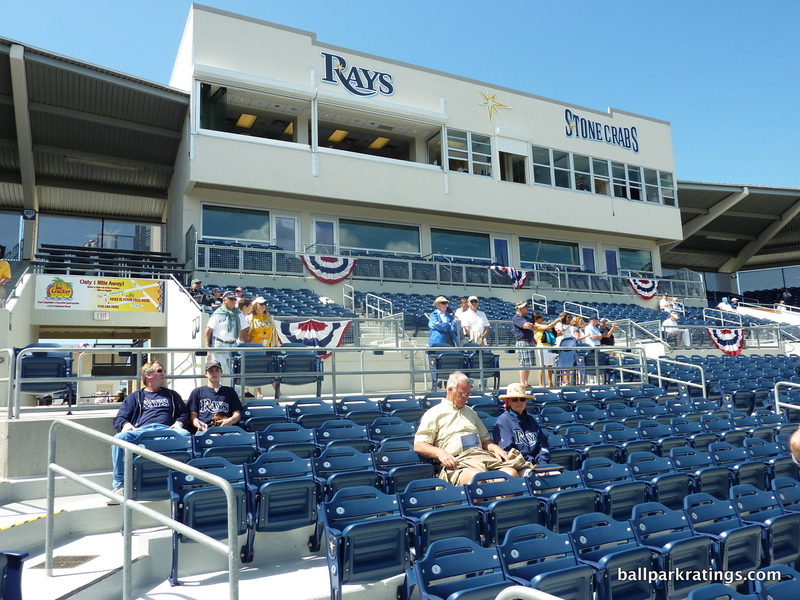 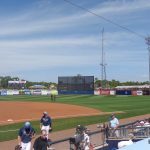 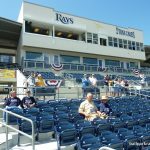 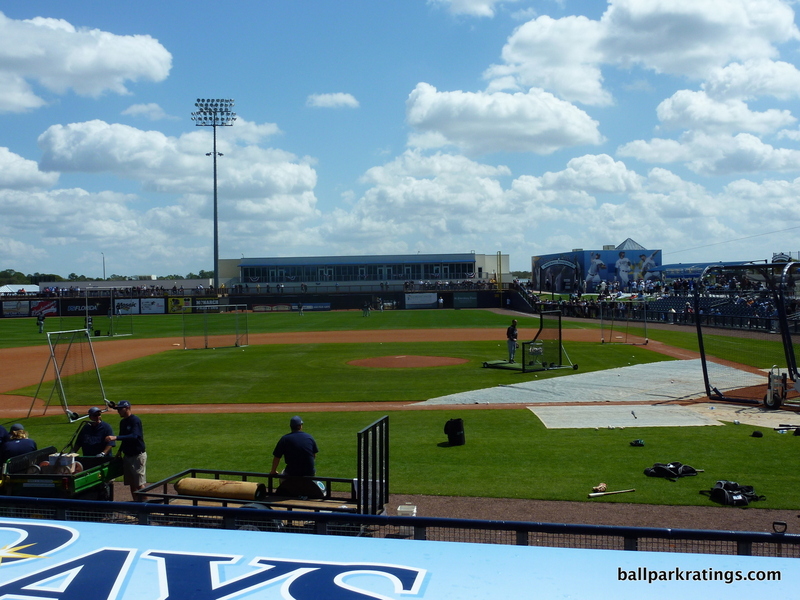 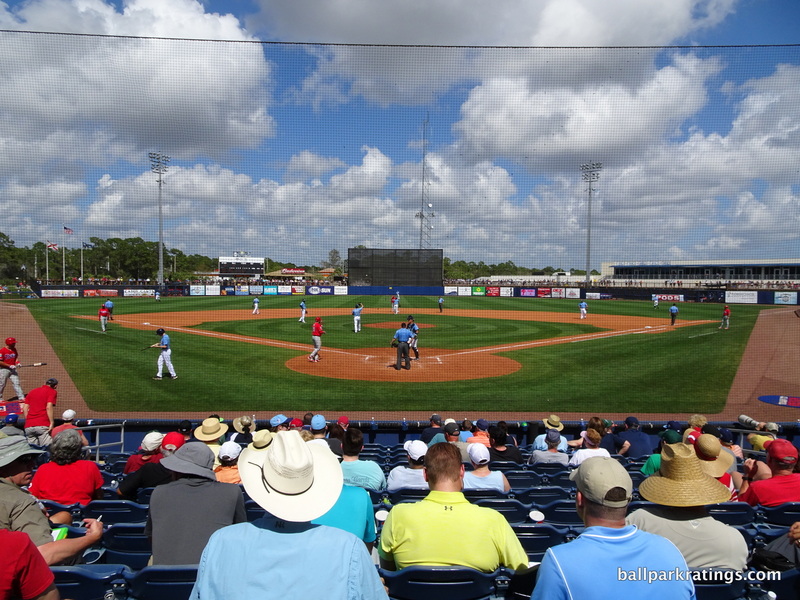 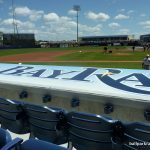 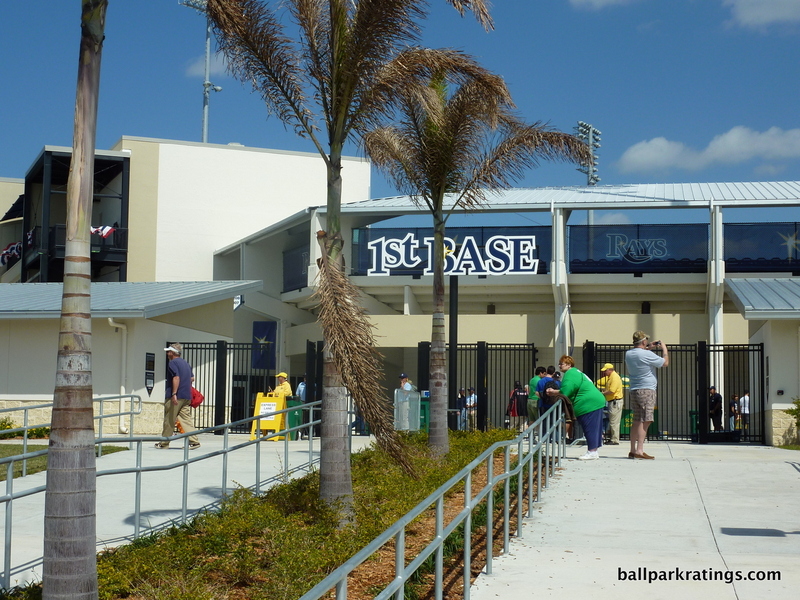 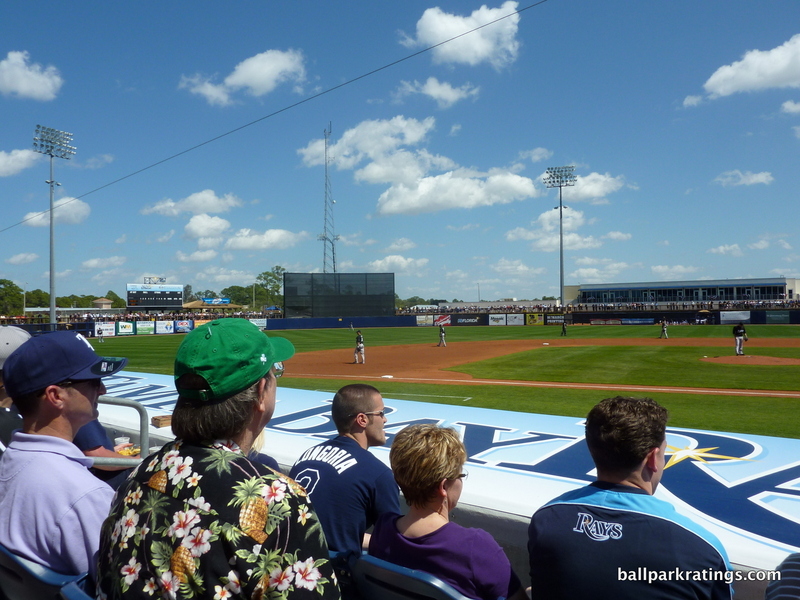 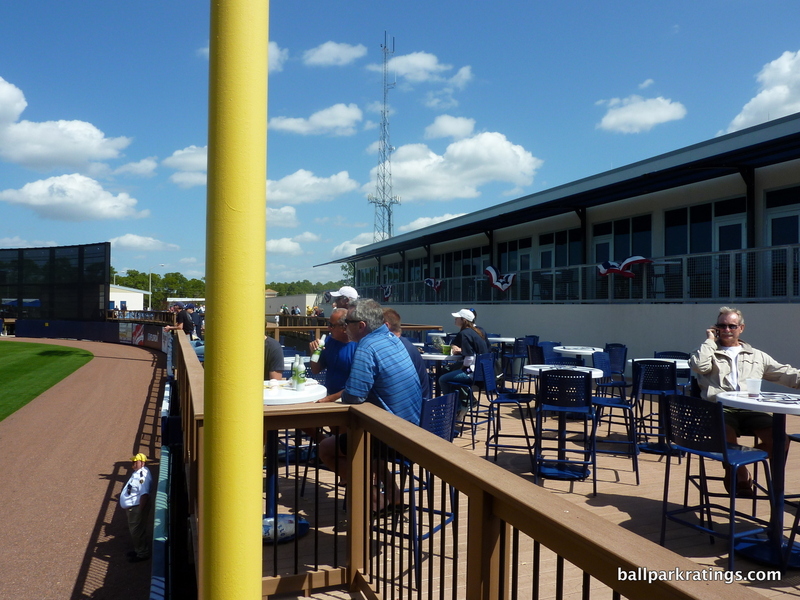 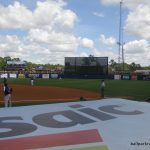 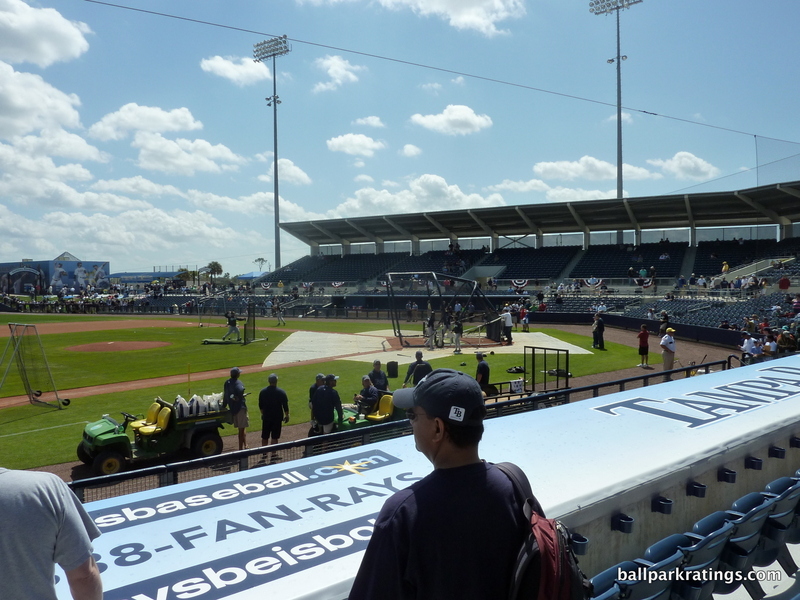 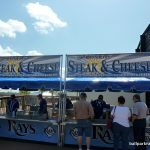 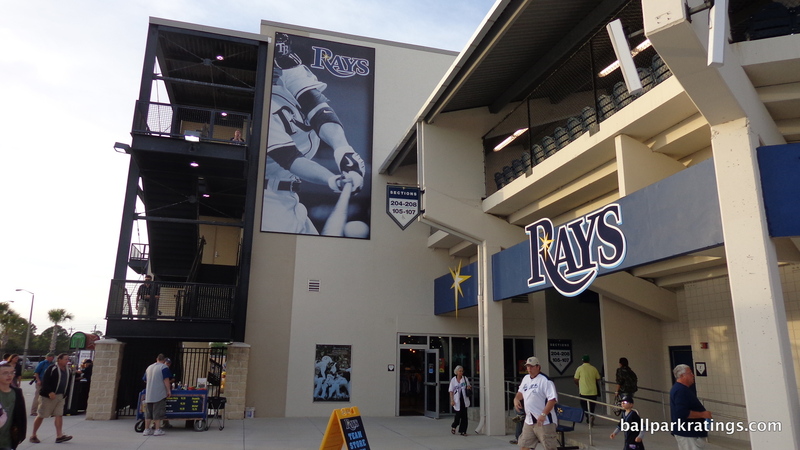 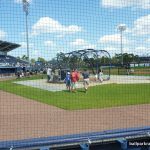 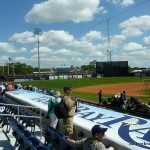 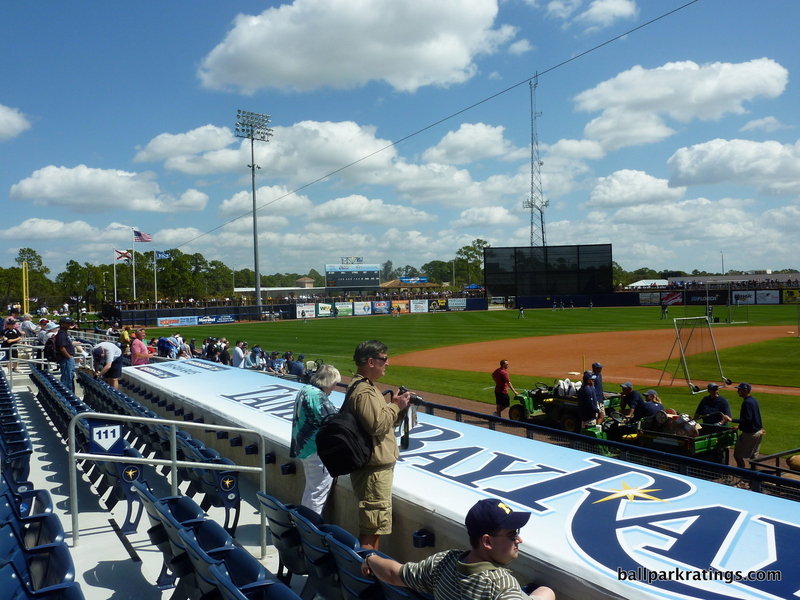 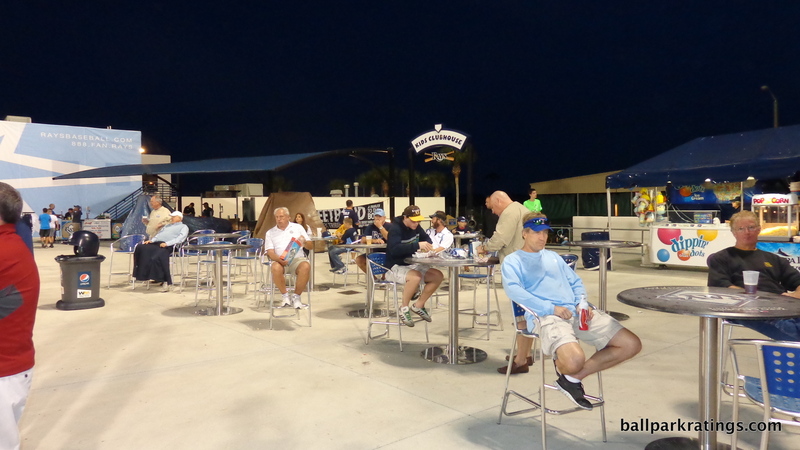 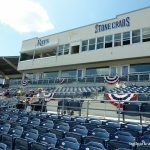 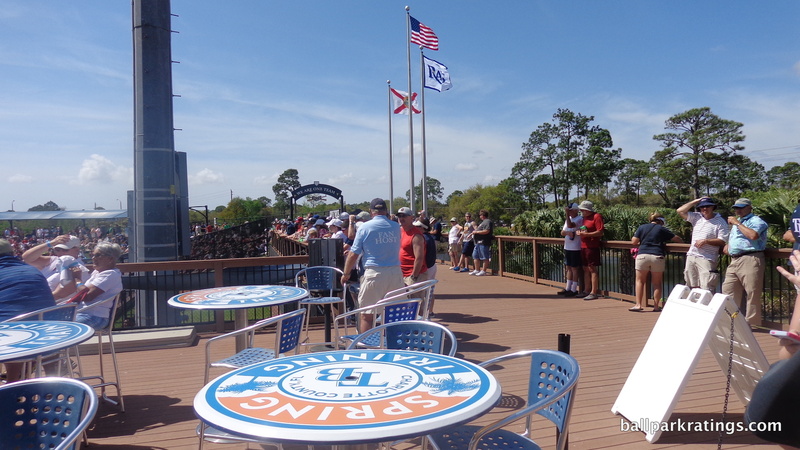 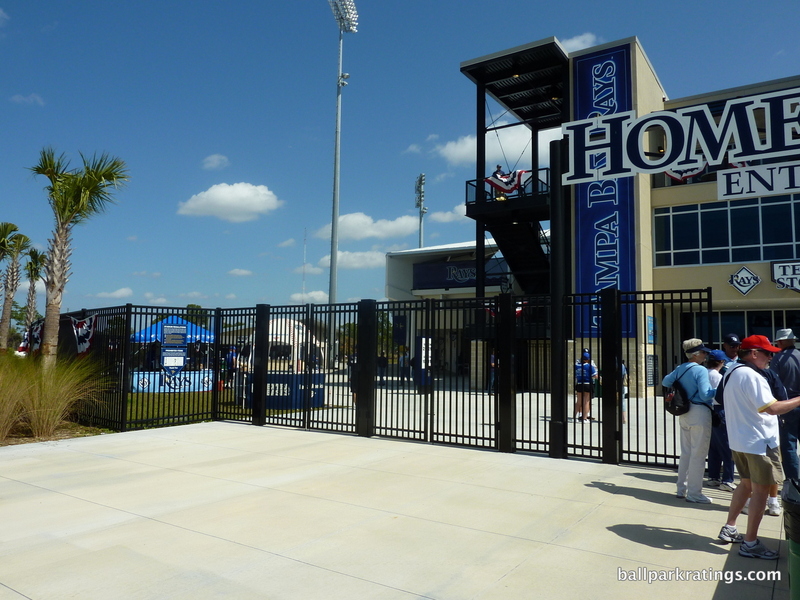 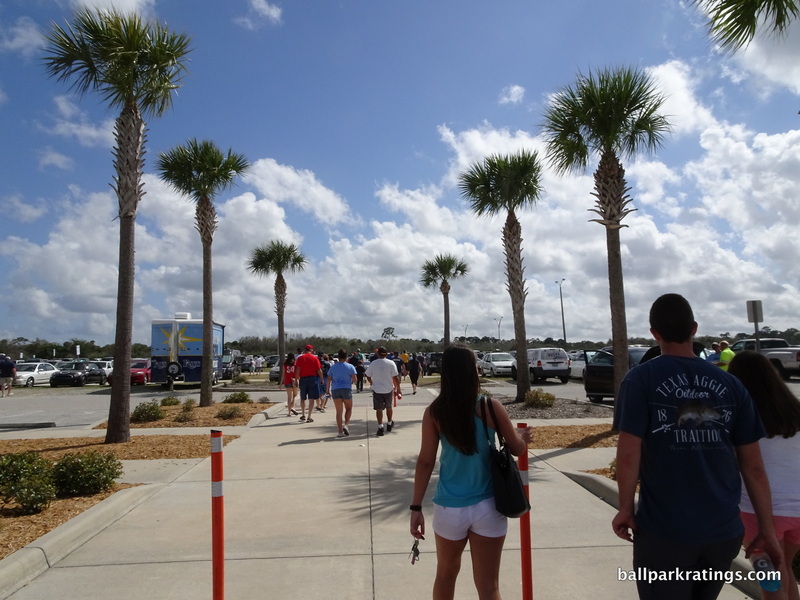 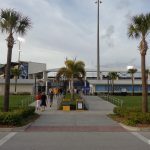 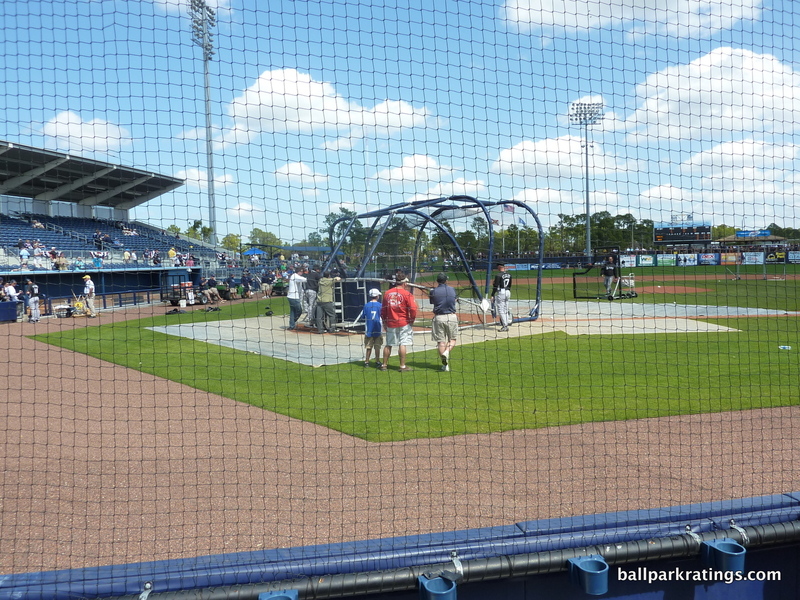 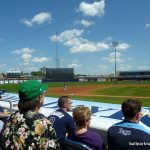 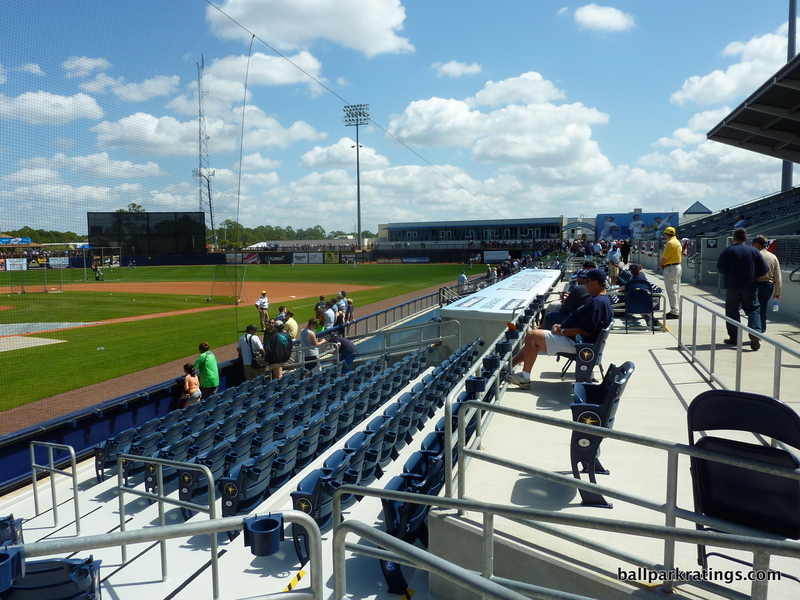 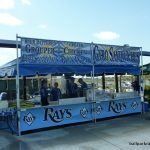 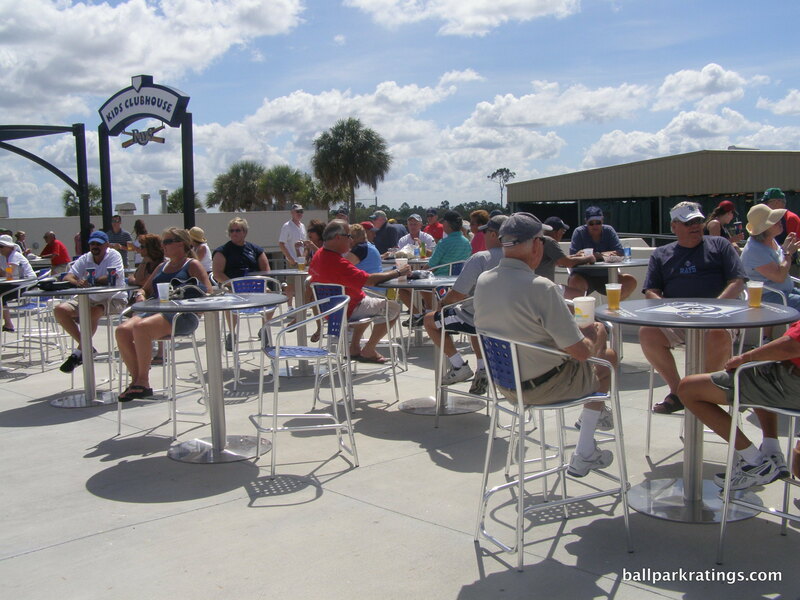 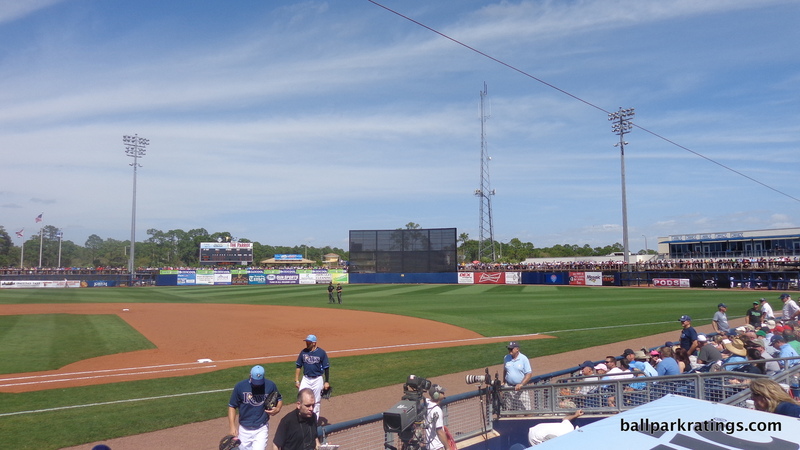 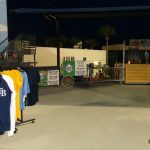 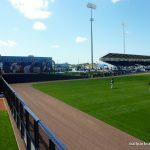 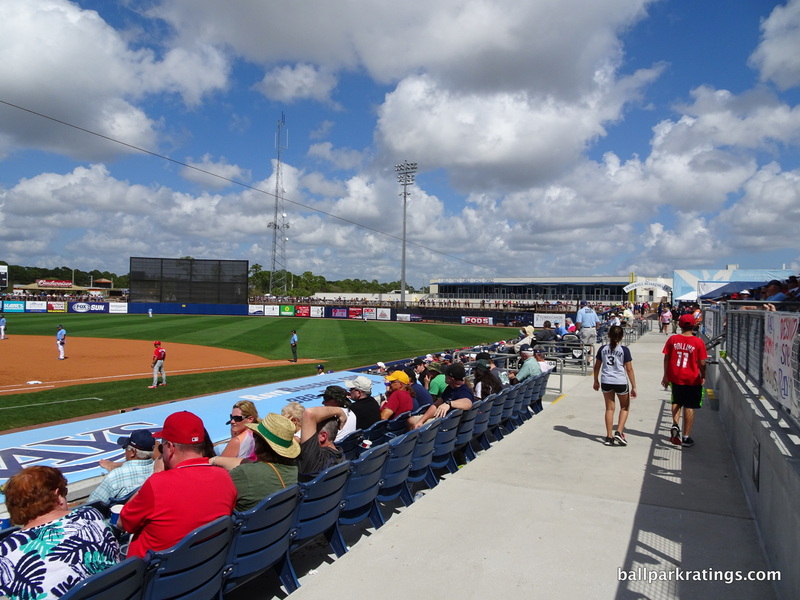 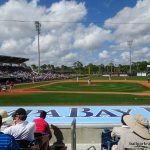 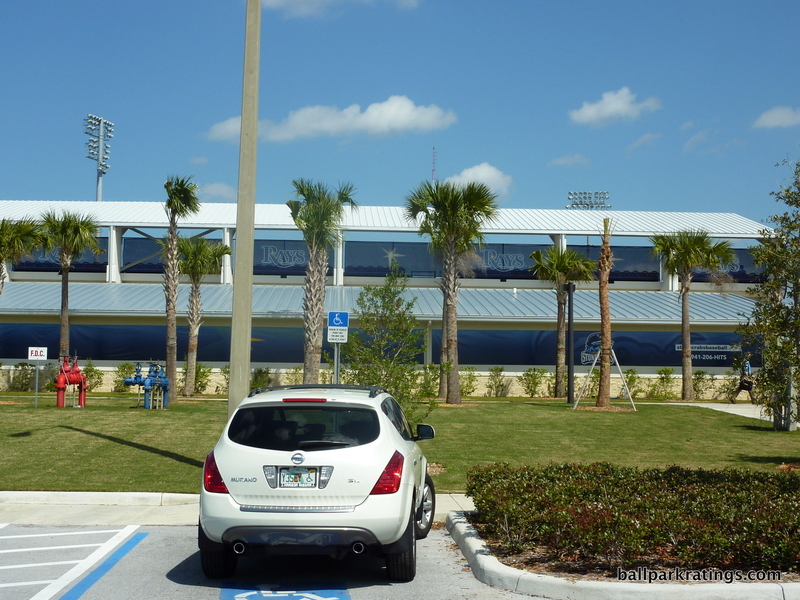 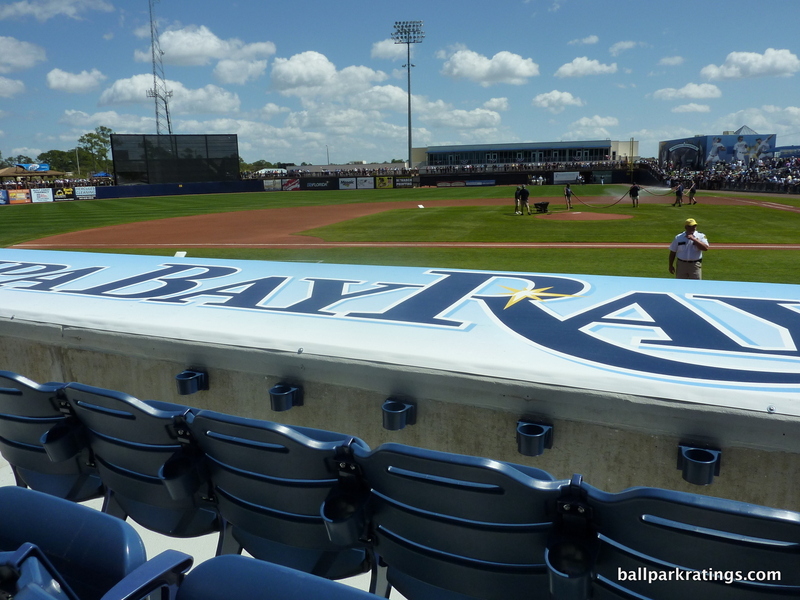 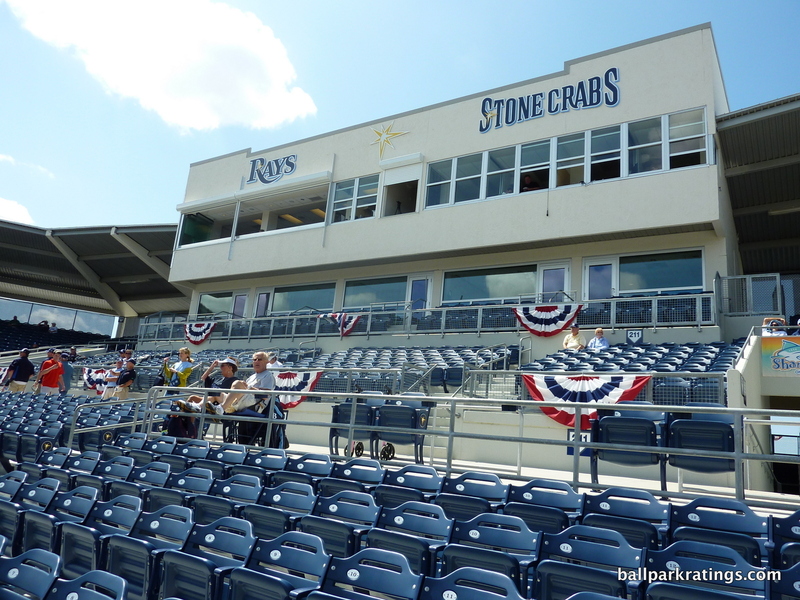 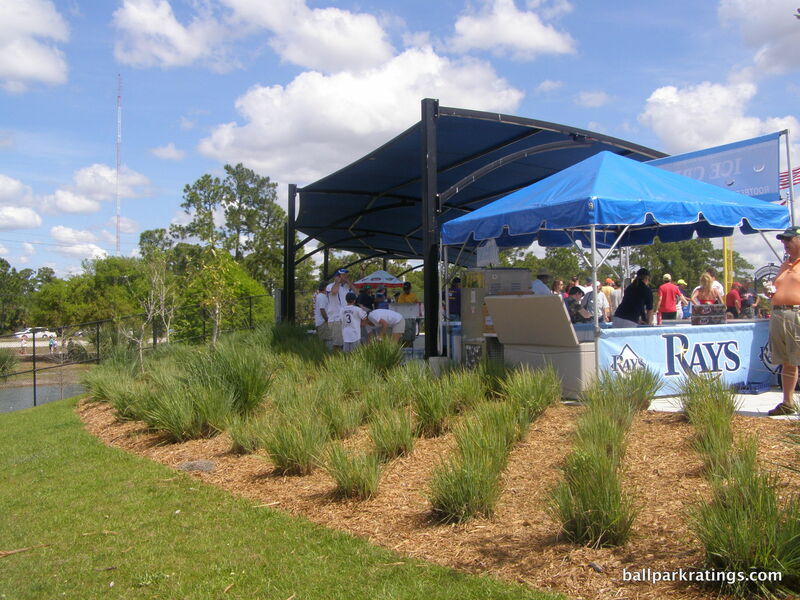 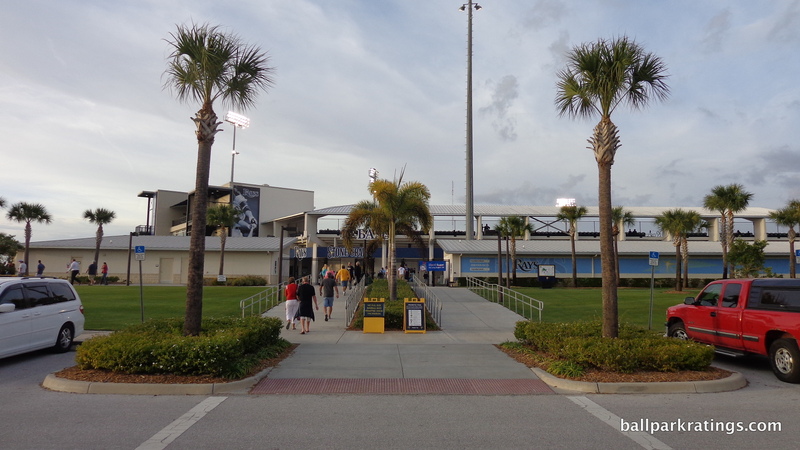 I think the reason for this is fairly obvious: for the Rays fans filling this place every spring, the setup in Port Charlotte looks spectacular standing next to Tropicana Field. 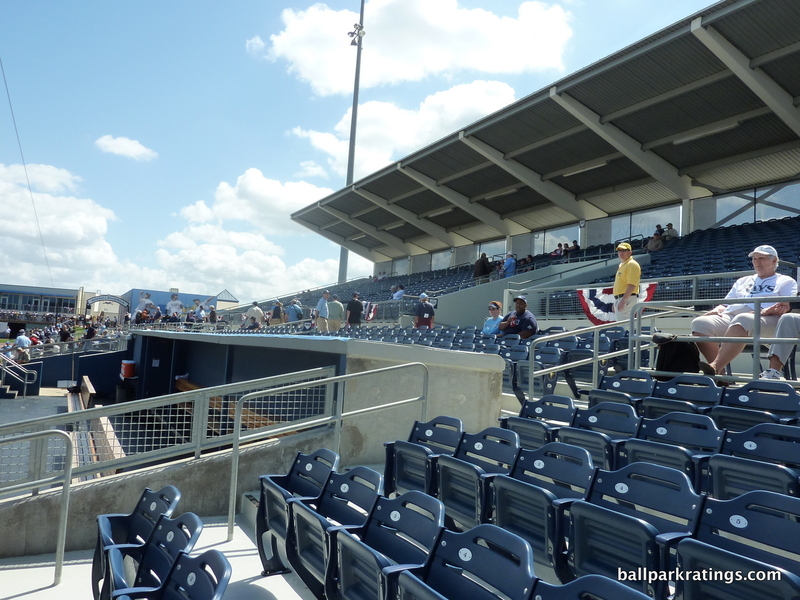 In sum, nothing about the intimate Charlotte Sports Park exudes a wow factor, but it’s a more than serviceable spring training venue.